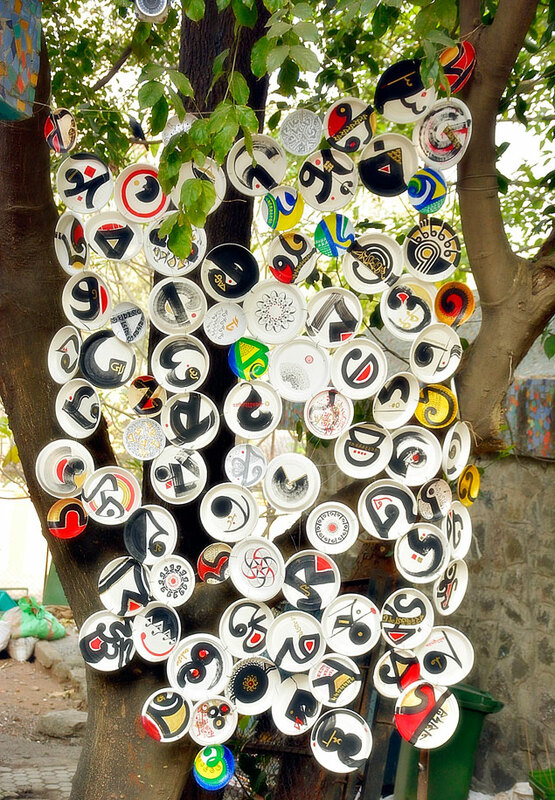 Near Century Bazar, Worli, Mumbai. 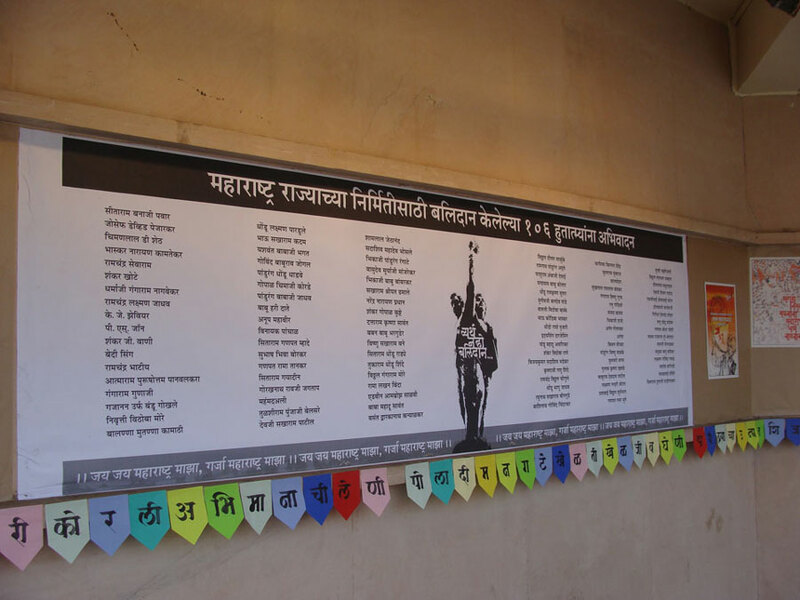 Senapati Bapat Road,Pune - 411016. 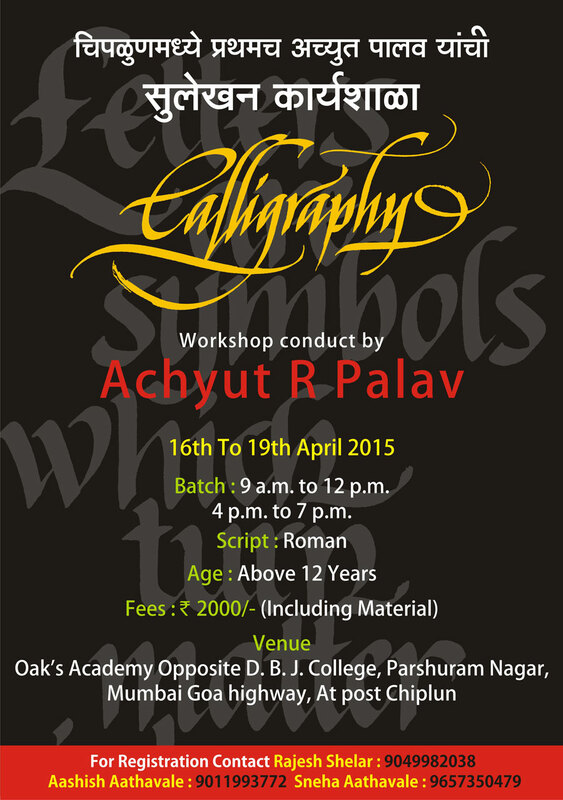 Register your name before 30th June 2015… Limited Seats!!! 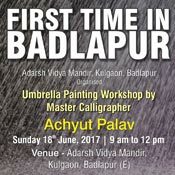 Mumbai Goa Highway, At post Chiplun. 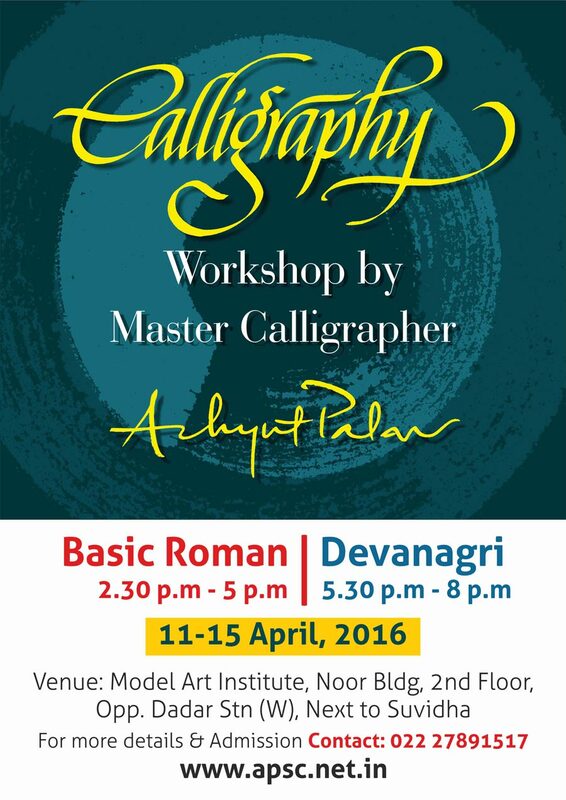 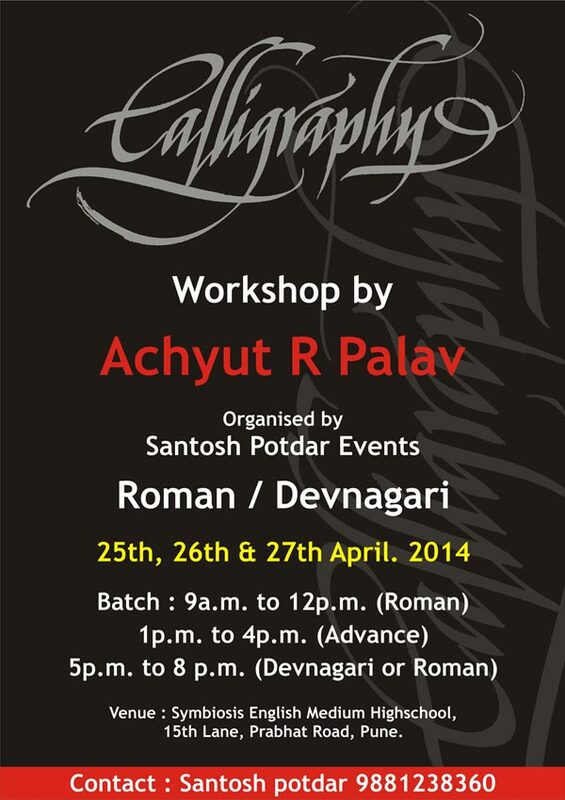 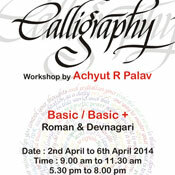 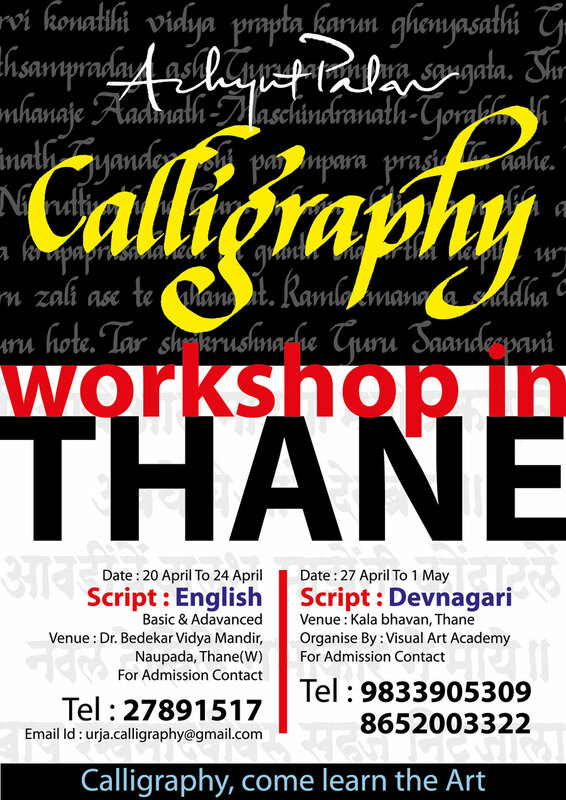 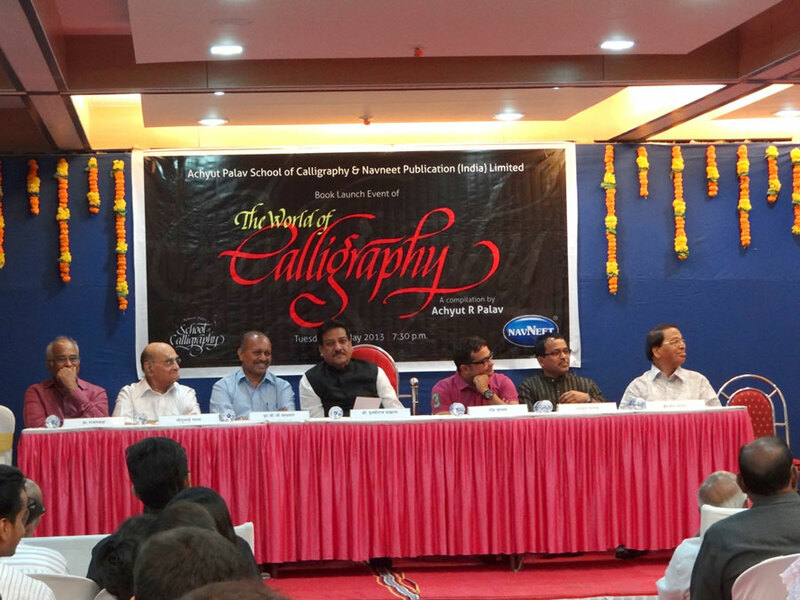 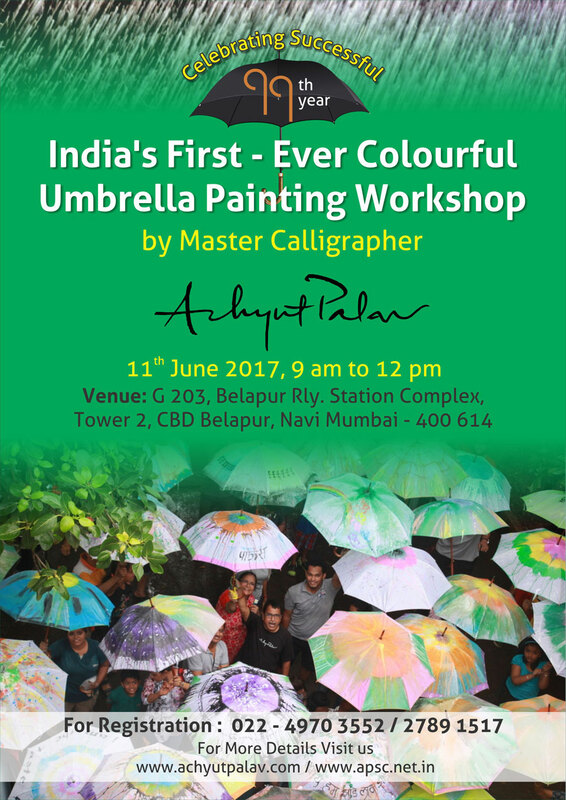 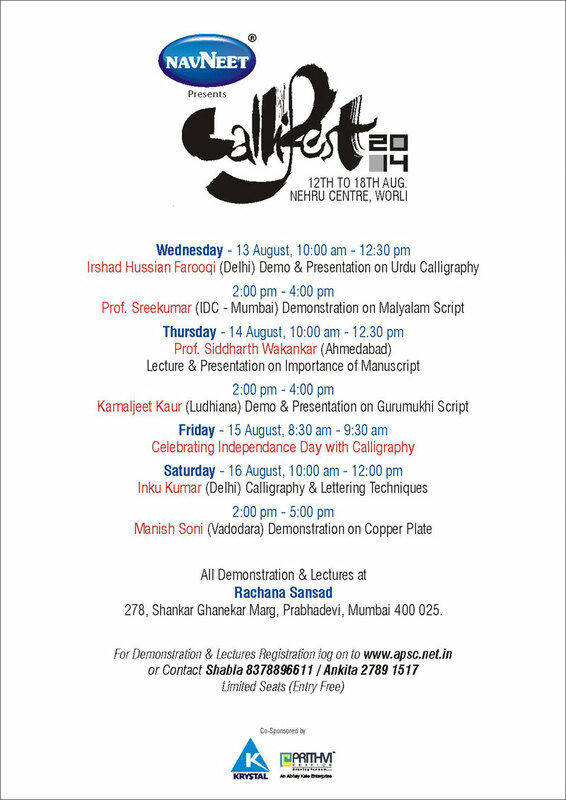 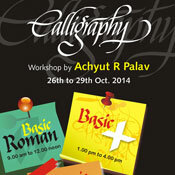 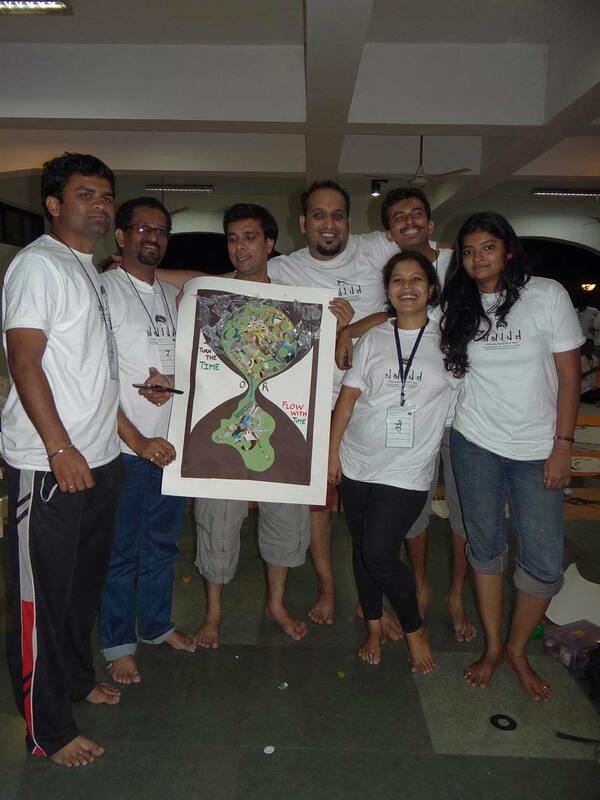 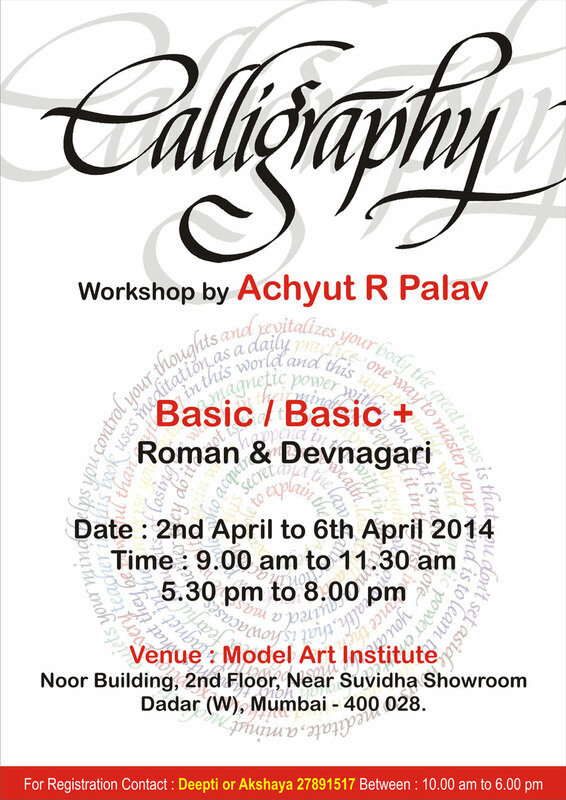 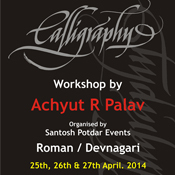 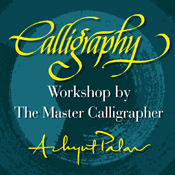 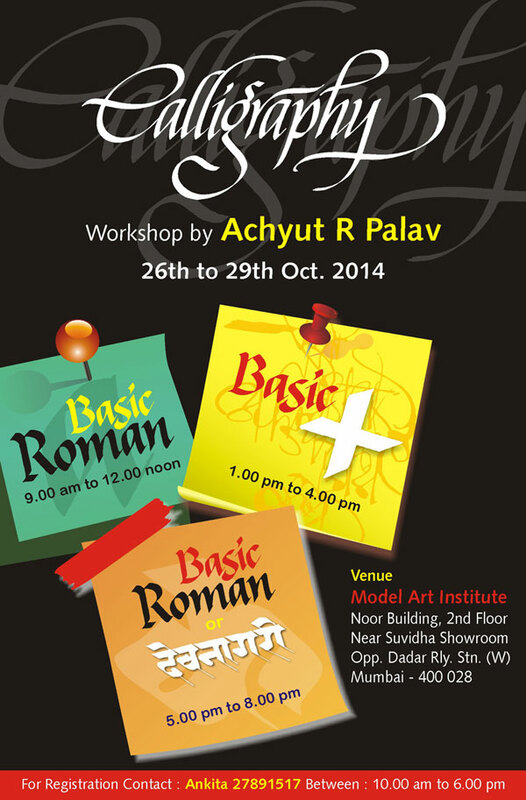 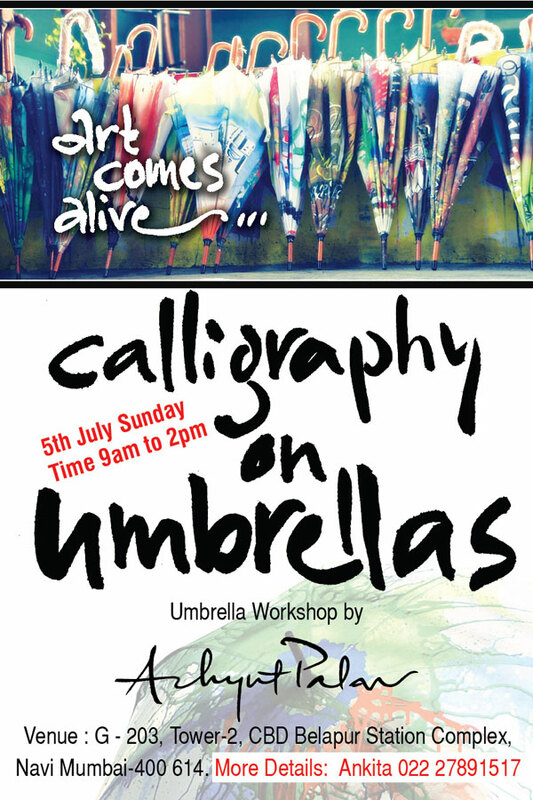 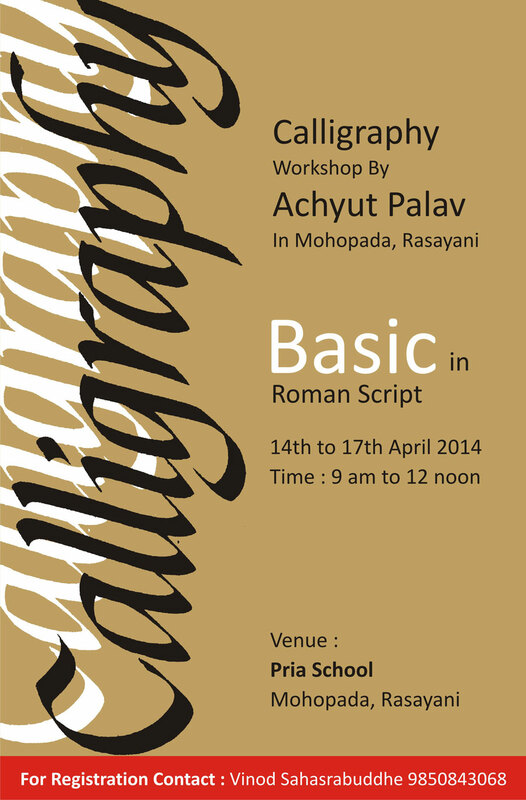 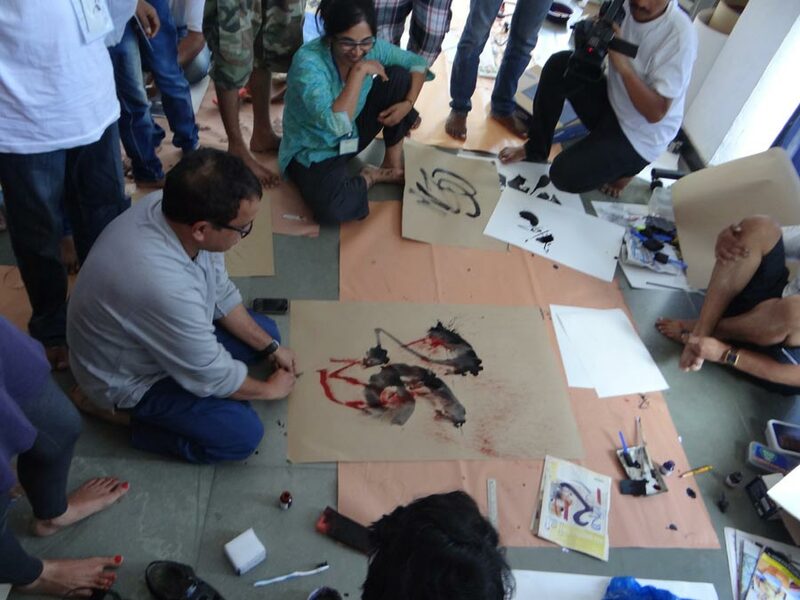 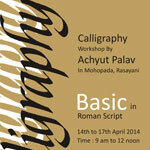 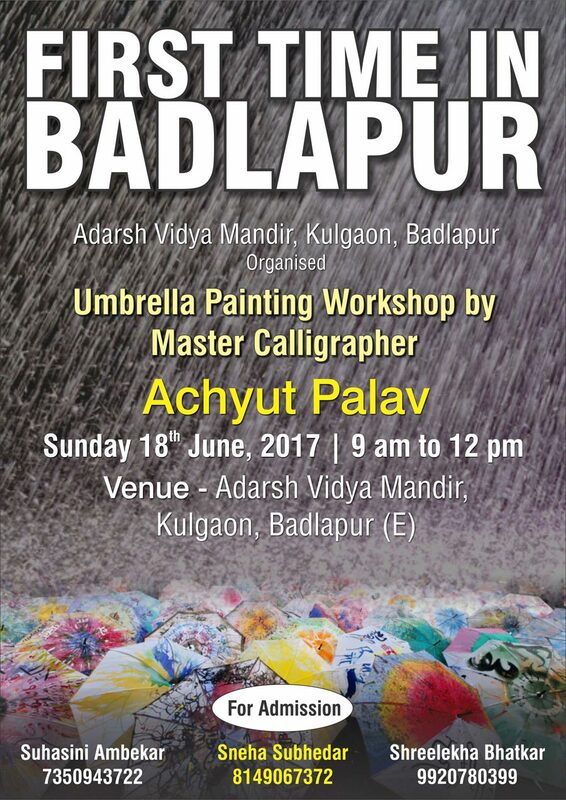 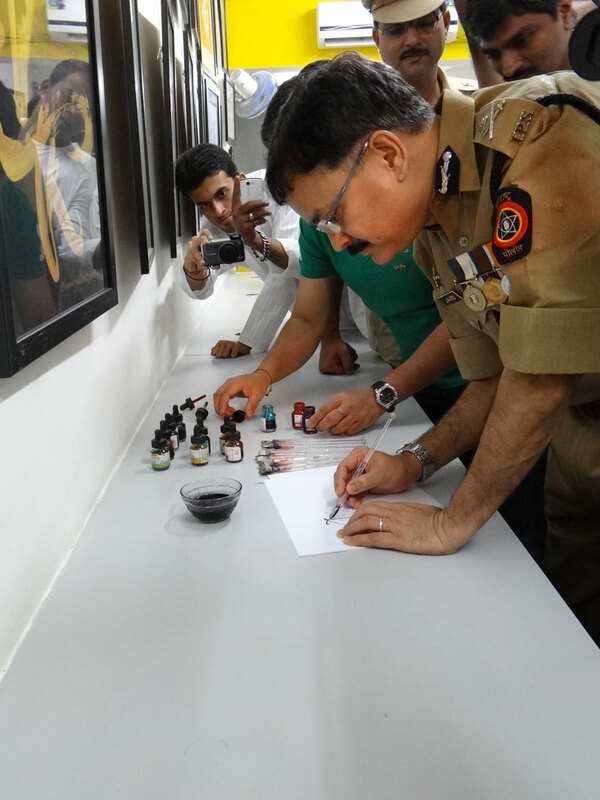 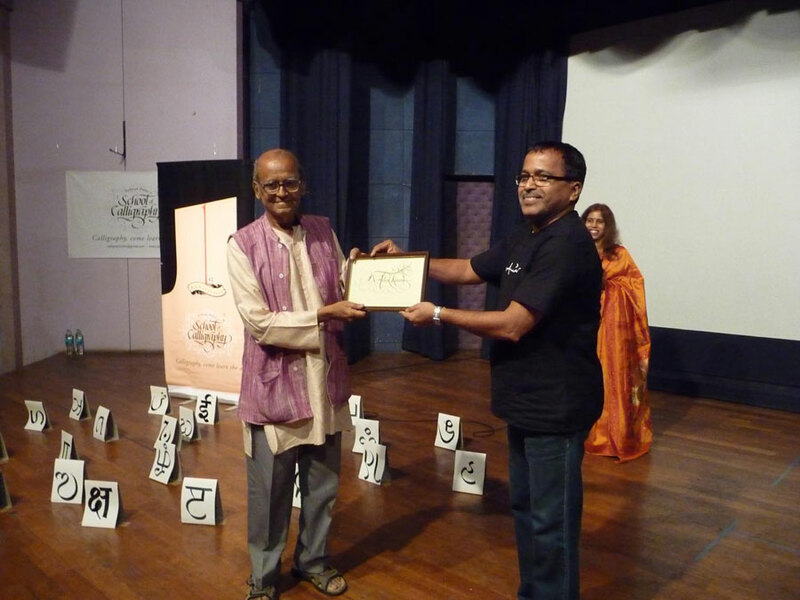 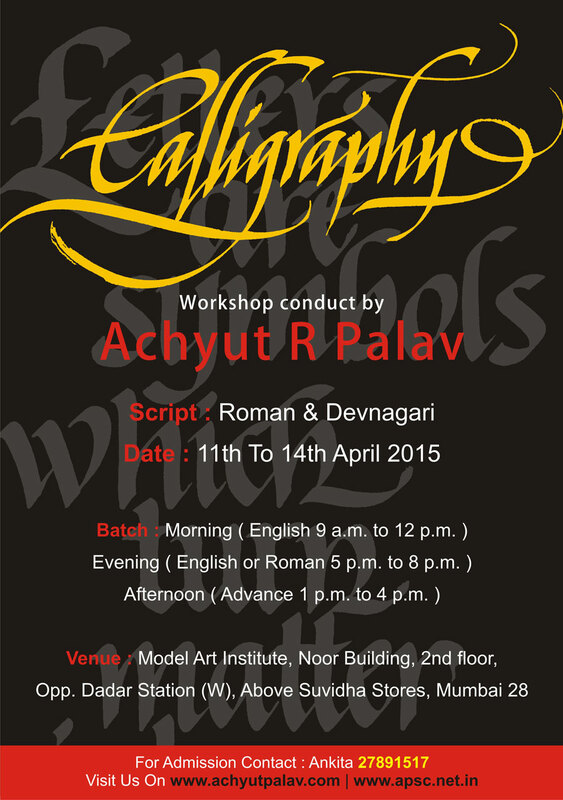 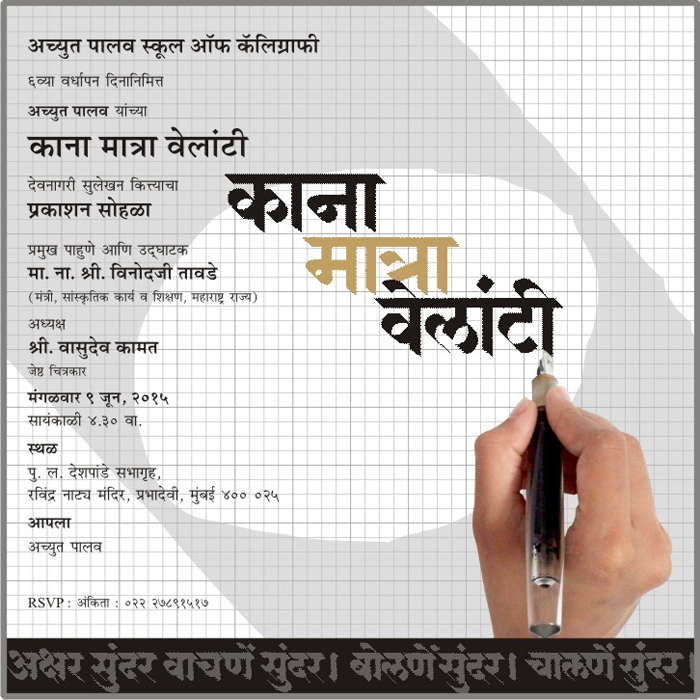 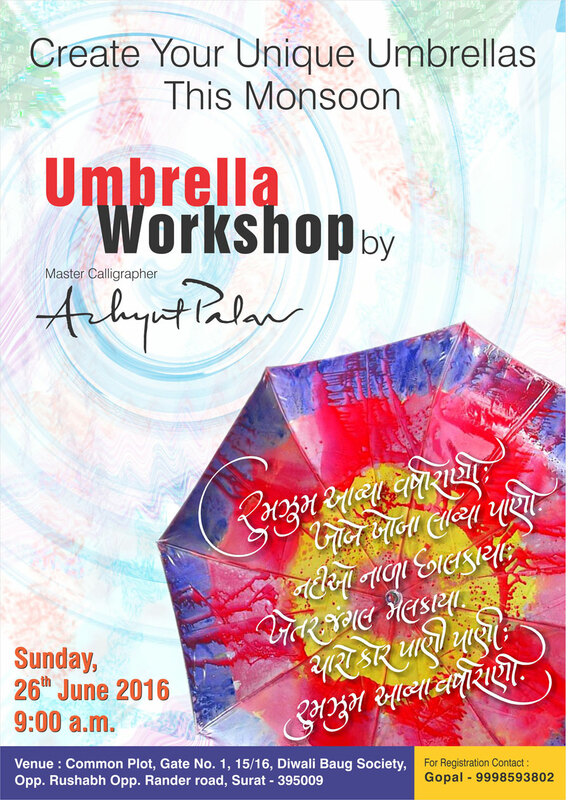 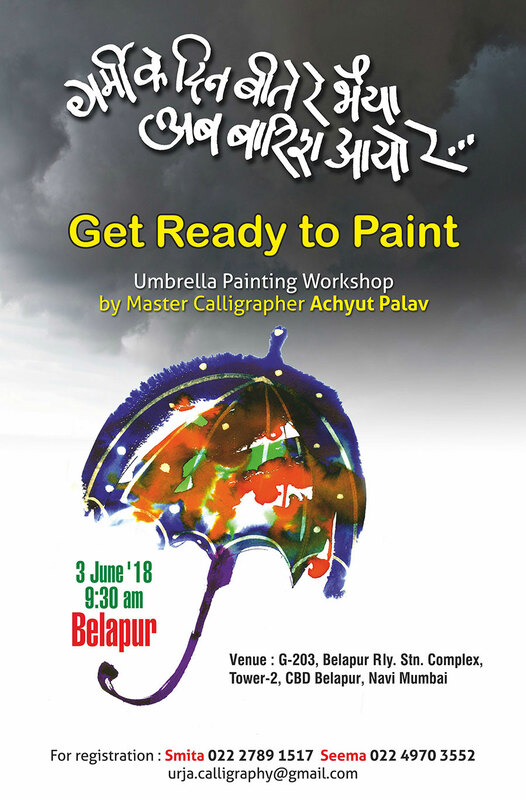 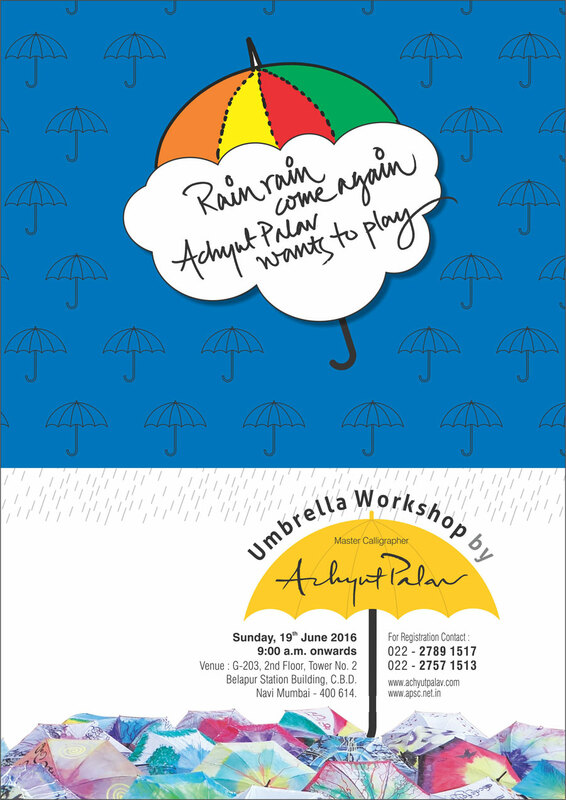 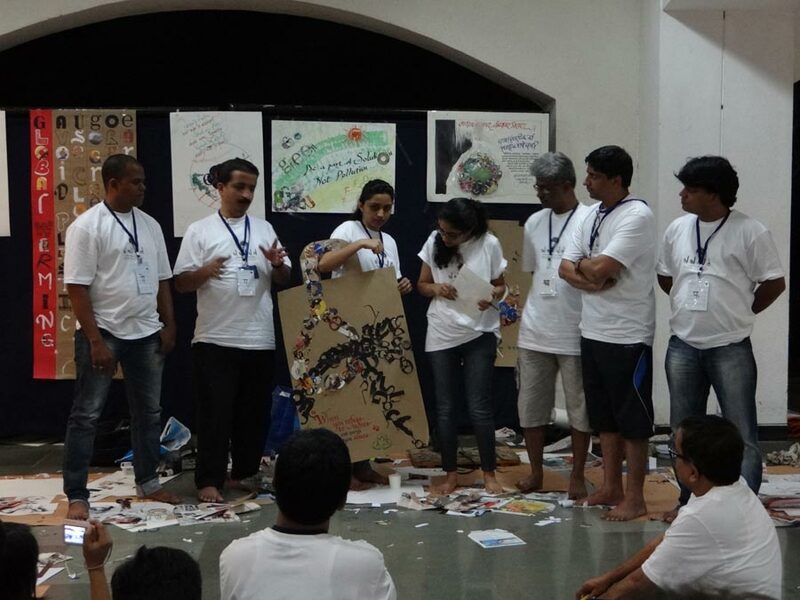 Unique Calligraphy Workshop by Achyut Palav at Belapur on the 15th June 2014. 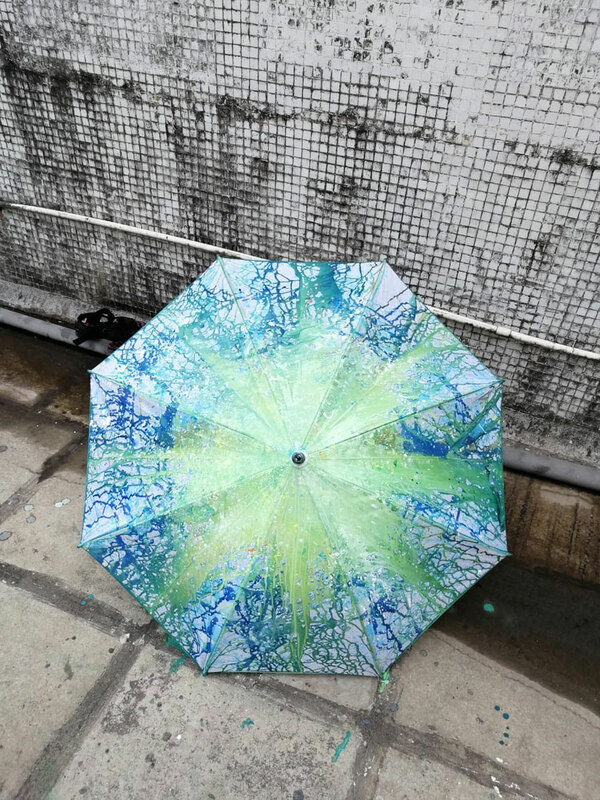 Rain always has a magical effect on everything it touches. 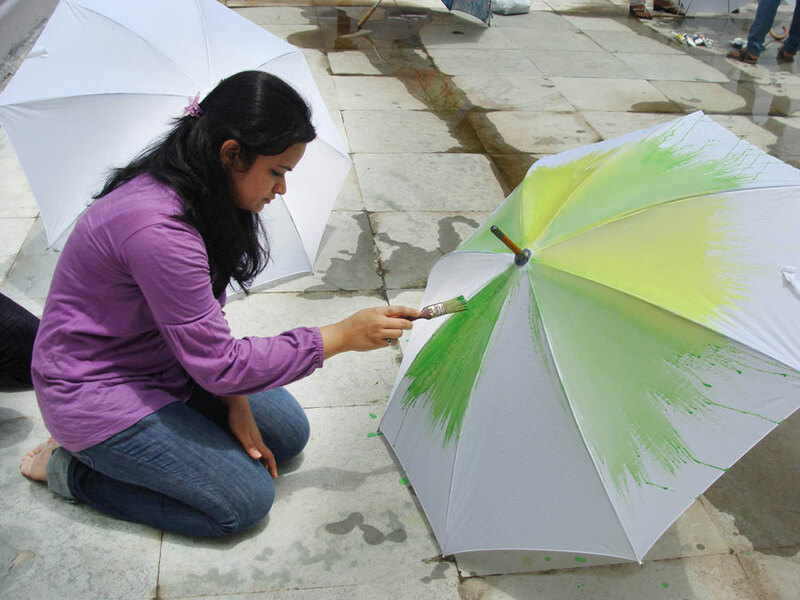 It sprays the earth with green & colors the skies gray. 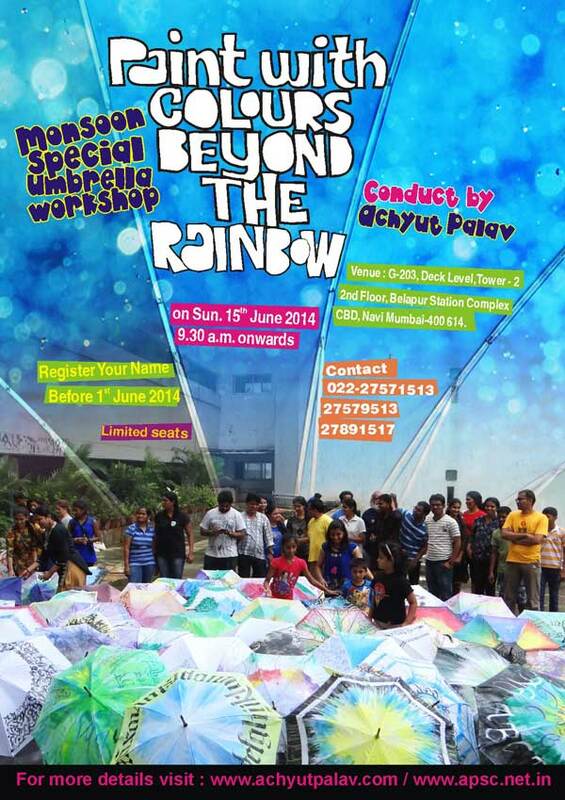 Beautiful rainbows arc gracefully over misty valleys. 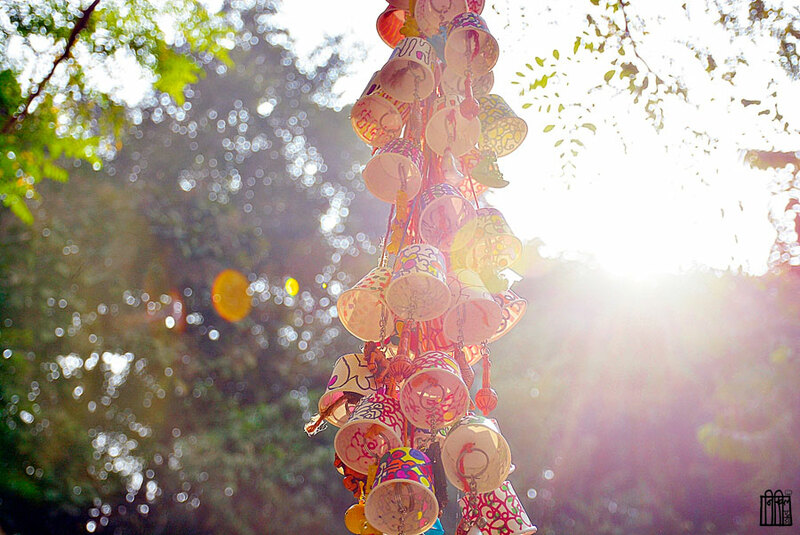 They fill our heart with memories. 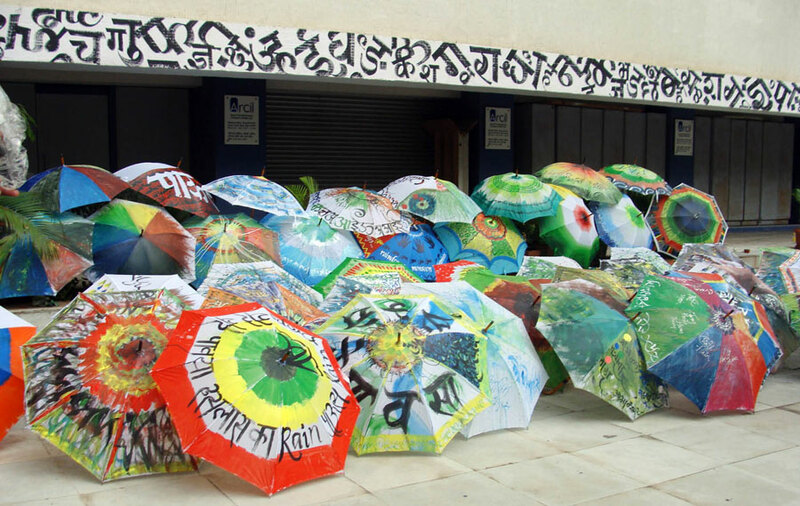 Rain has a different meaning to each one of us. 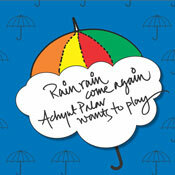 Rhythm of the rain sings a different tune in each ones' mind. 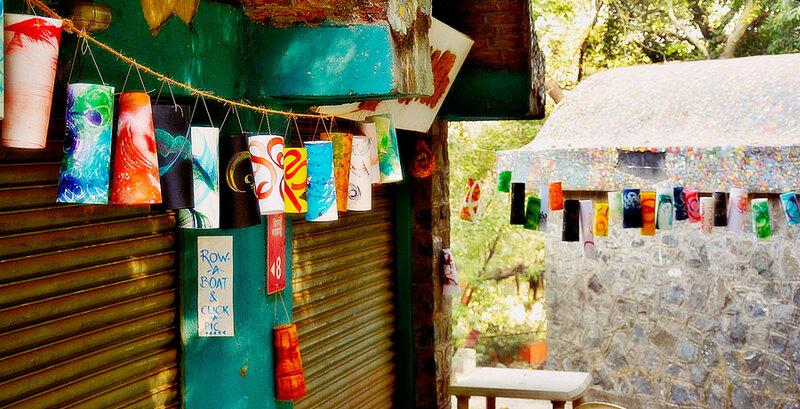 We sit in our homes, offices or colleges humming melodies of the spectacular season. 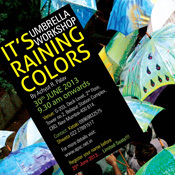 Mother Nature unleashes a kaleidoscope of blues, blacks, greens, reds. 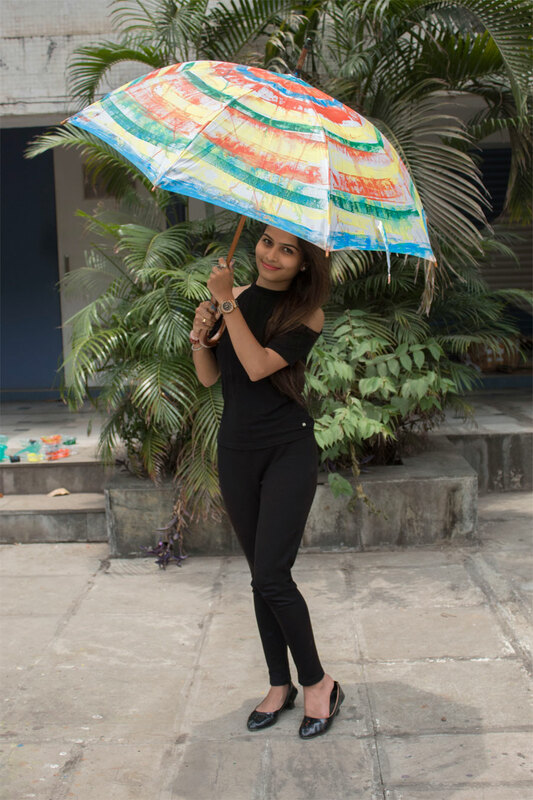 The lush green earth, the magic of the rainbows, the gray stormy skies create perfect frames in our minds. 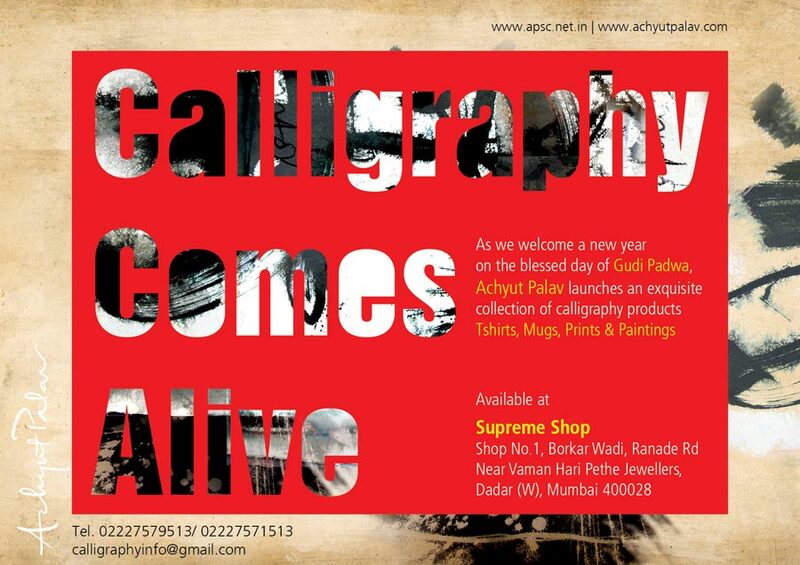 Come enjoy the blessed union of calligraphic strokes & colors that is going to take place on 15th June 2014. 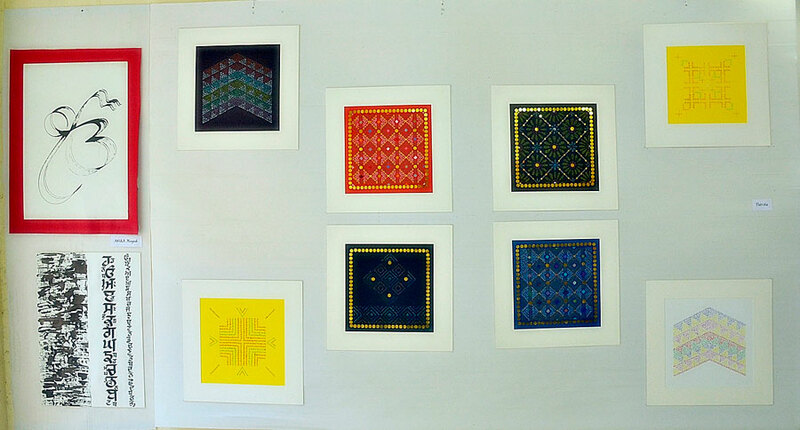 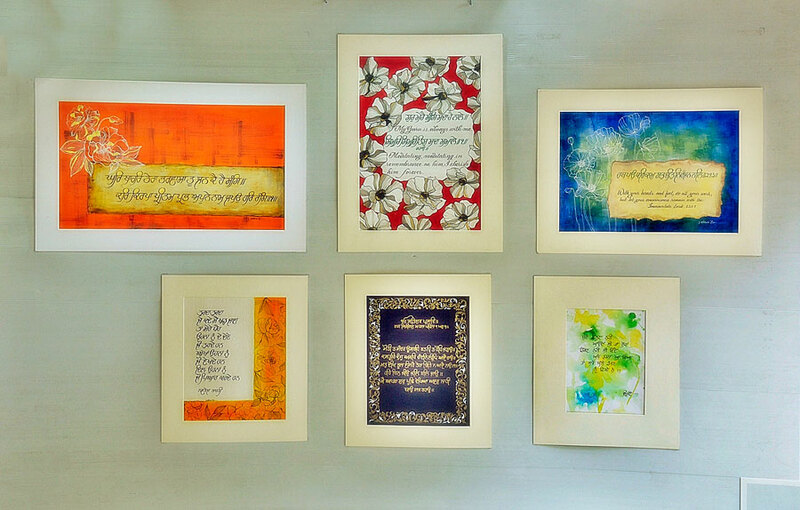 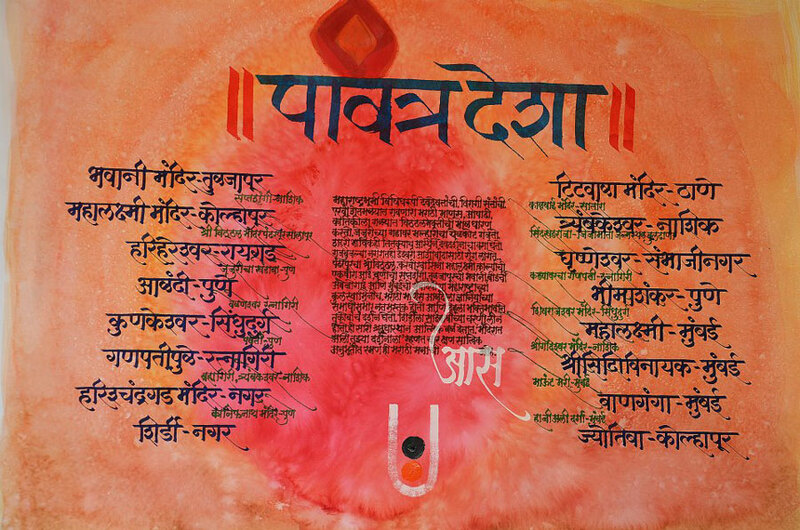 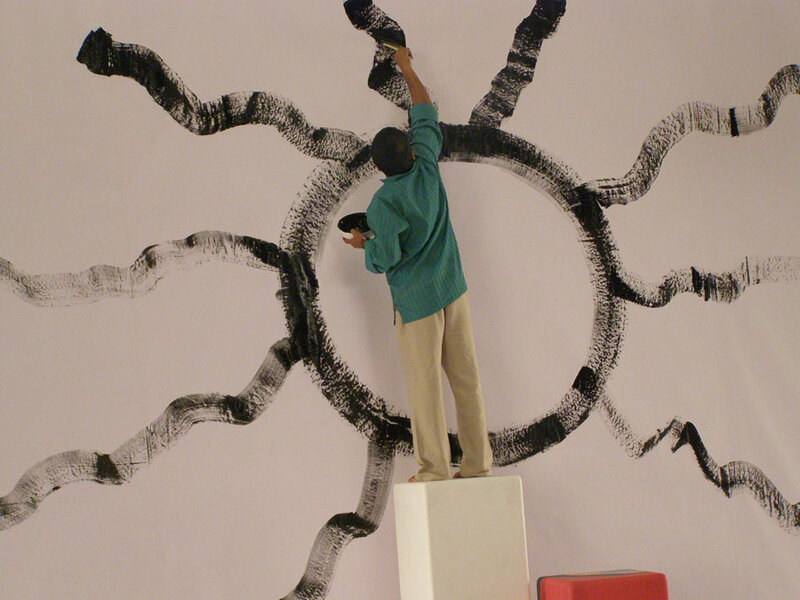 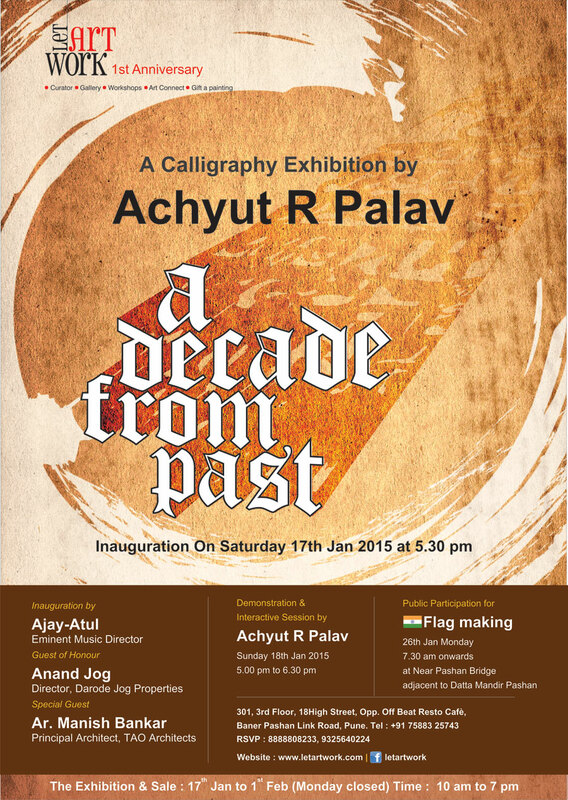 A series of paintings from Master Calligrapher, Achyut Palav, celebrating the power of Surya. 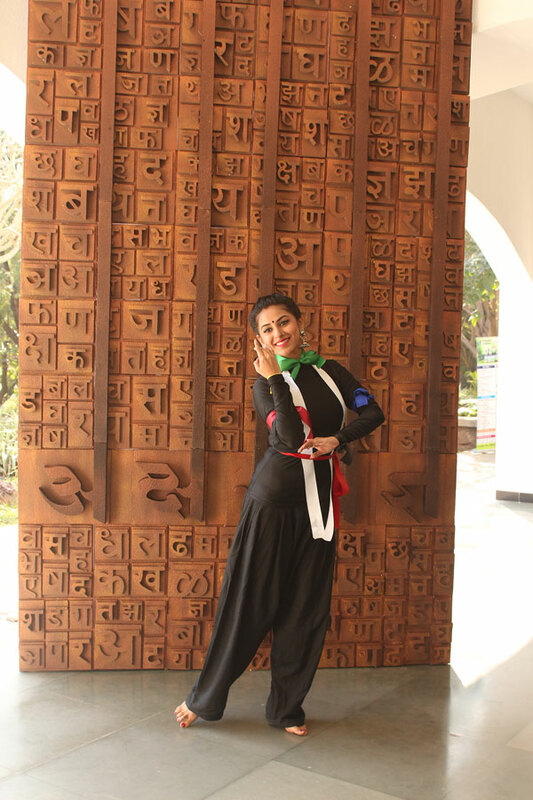 A tribute to its radiance & supremacy. 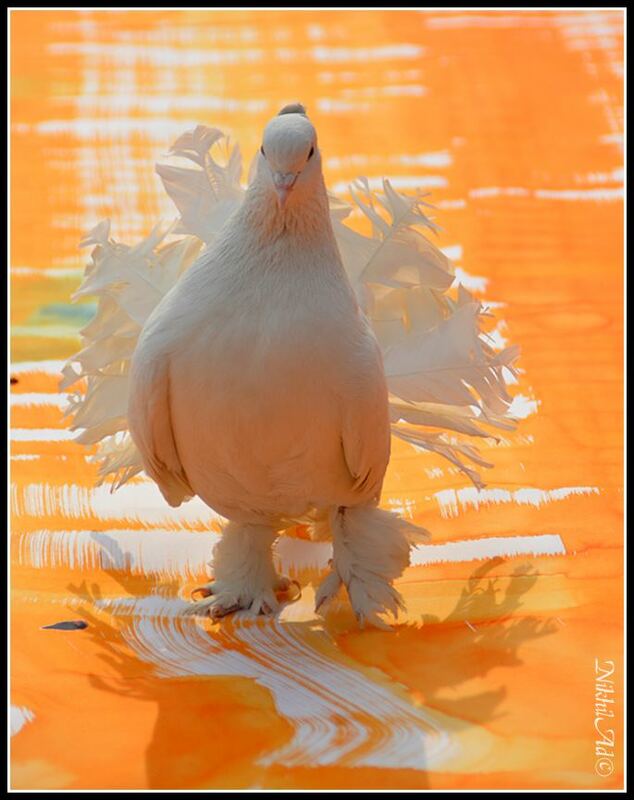 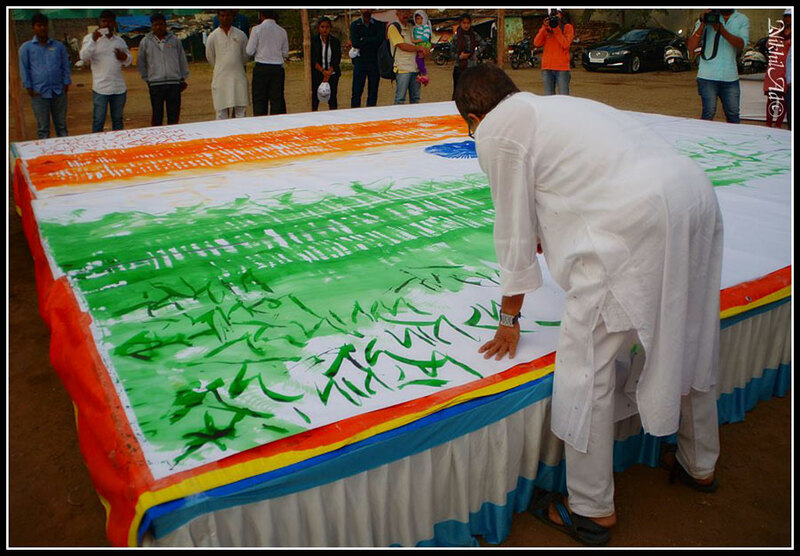 With each canvas the colours rise to salute one of the greatest energies on earth. 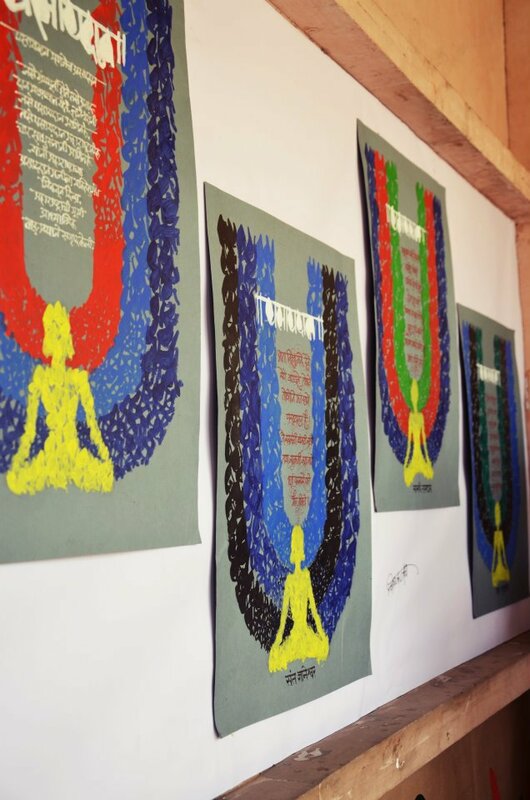 Each form & each stroke emits energy that is positive Bring the power Surya into your lives & let him inspire you, strengthen you. 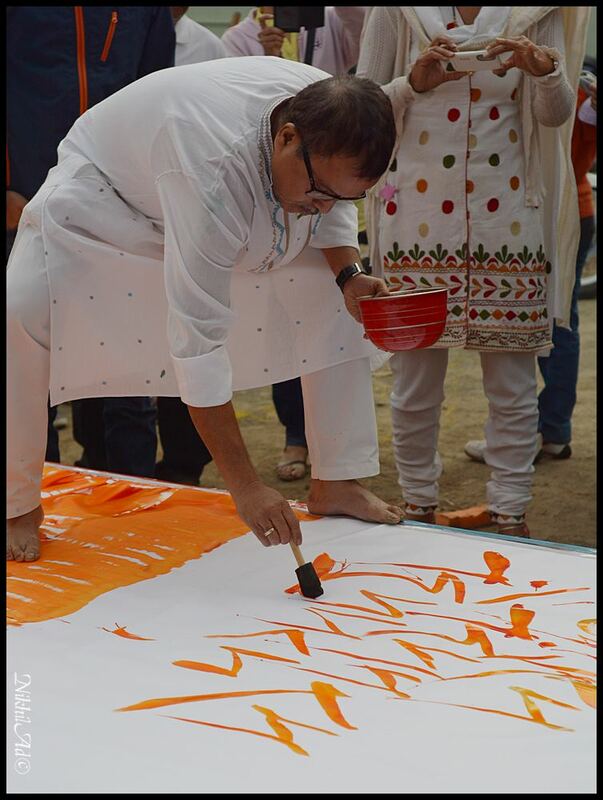 Let the positive passion & 'Urja' of sun so skilfully yet easily captured on the canvas become the essence of your life. 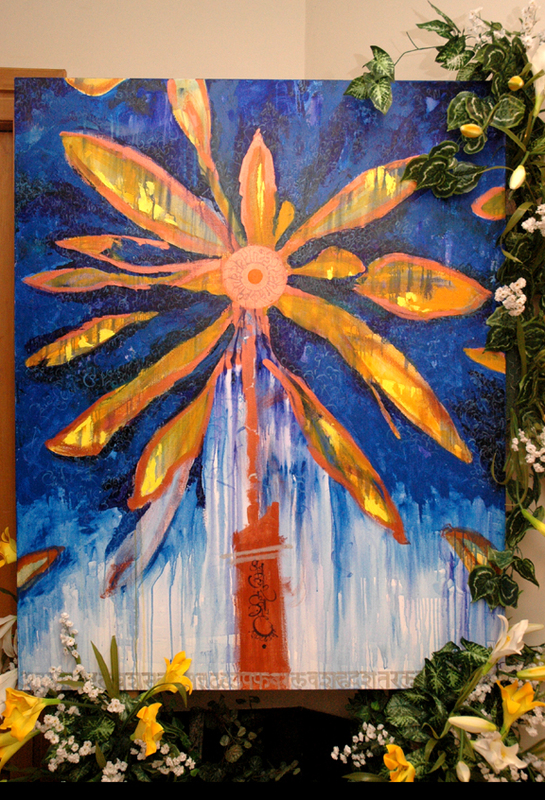 The paintings are not only about the Sun in the Sky but rather of those on earth, who blaze luminously throughout their lives, brightening & improving everything they touch... knowingly or unknowingly. 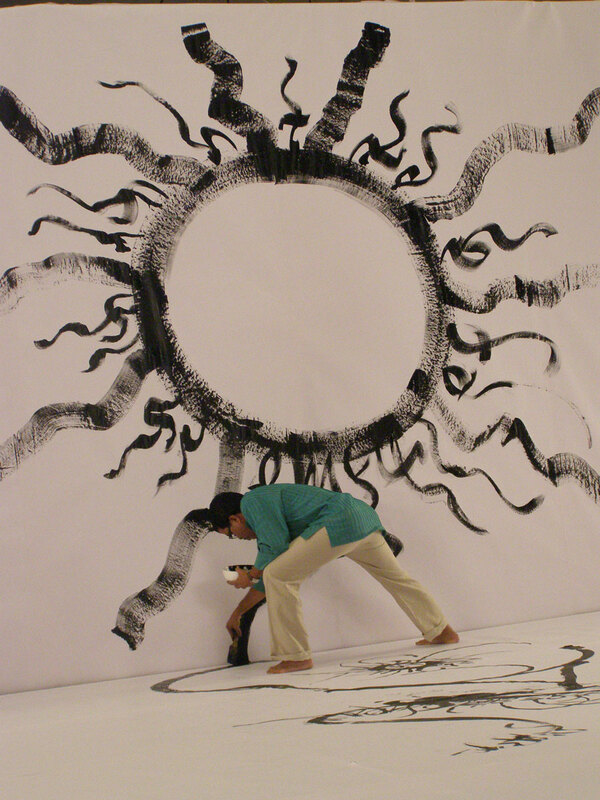 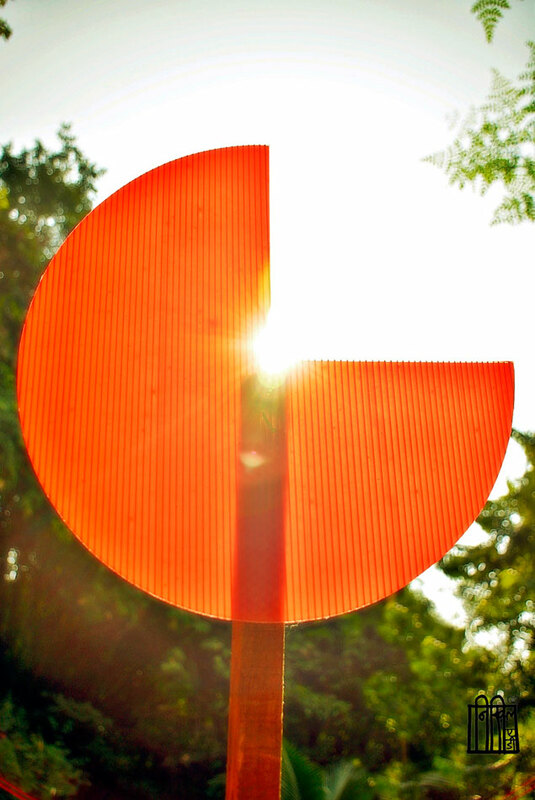 These suns that Achyut has created were people in his life whose lives & work have had a profound influence on his mind. 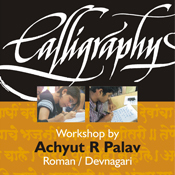 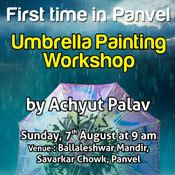 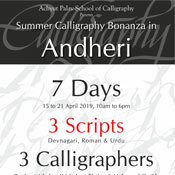 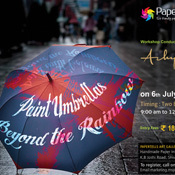 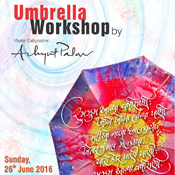 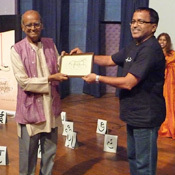 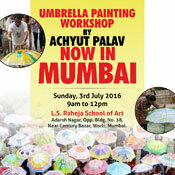 Unique Calligraphy Workshop by Achyut Palav at Belapur on the 30th June 2013. 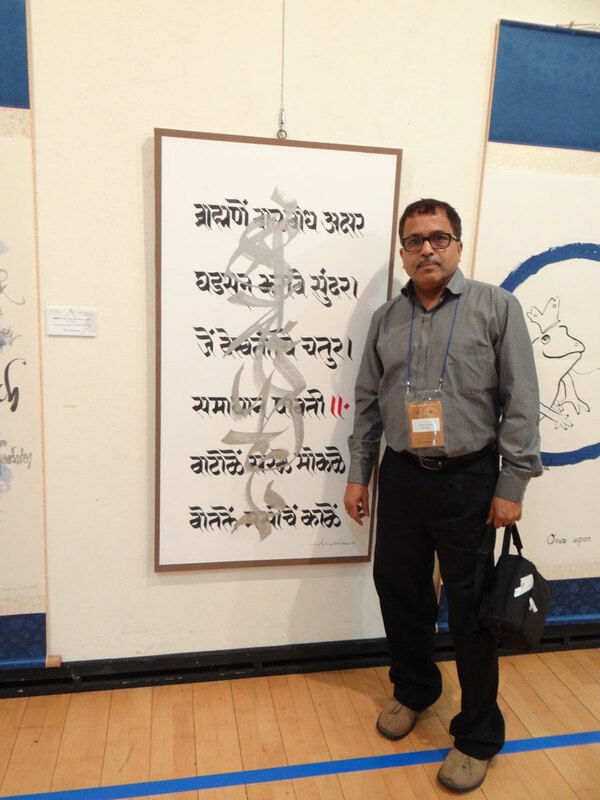 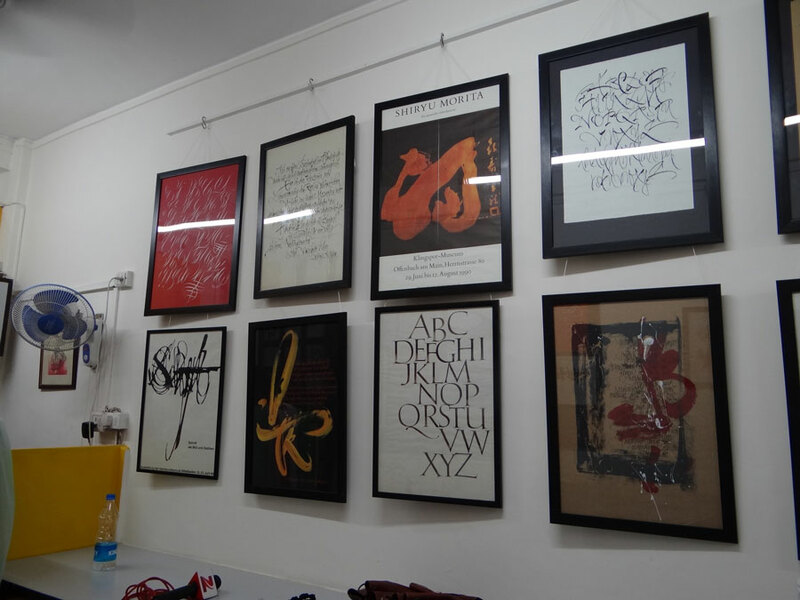 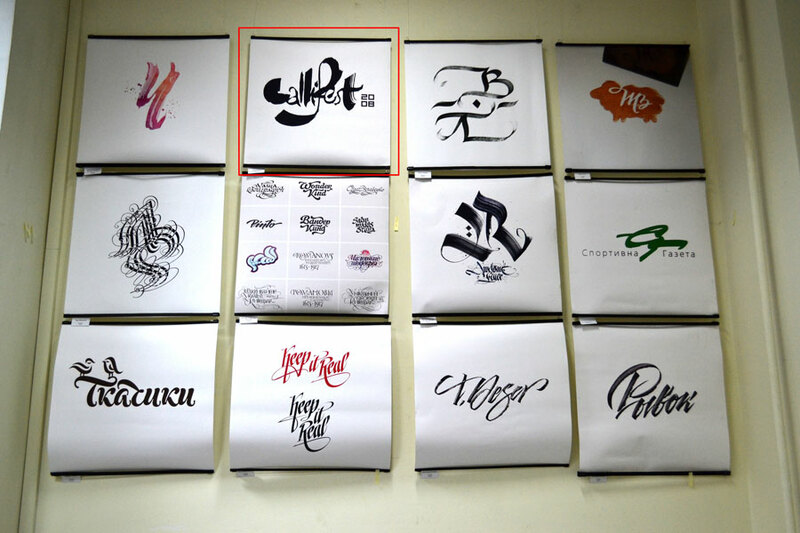 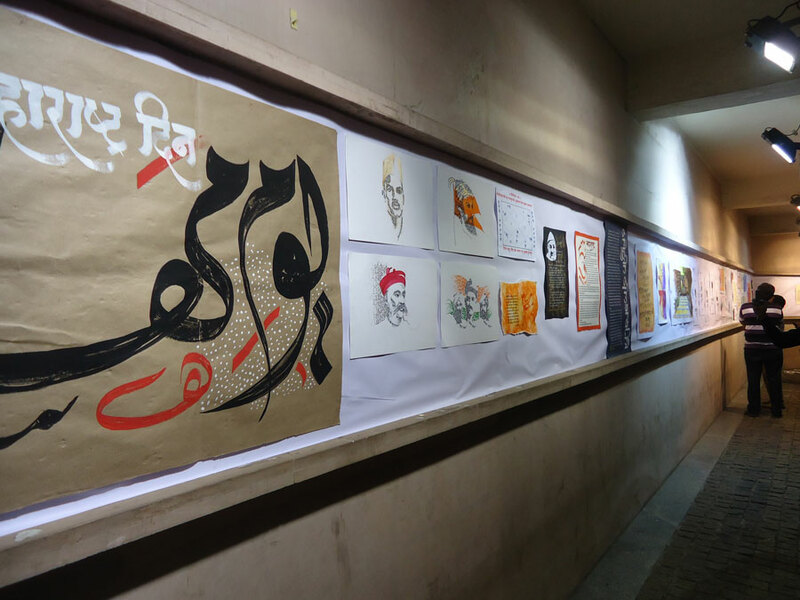 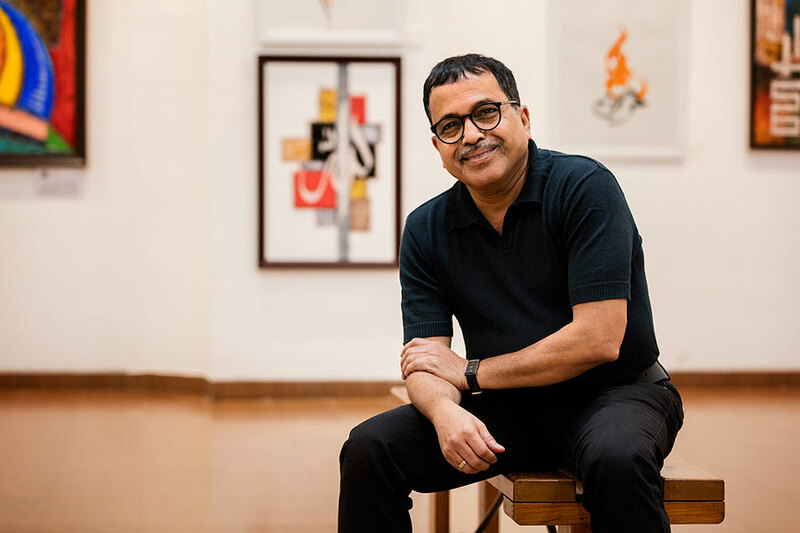 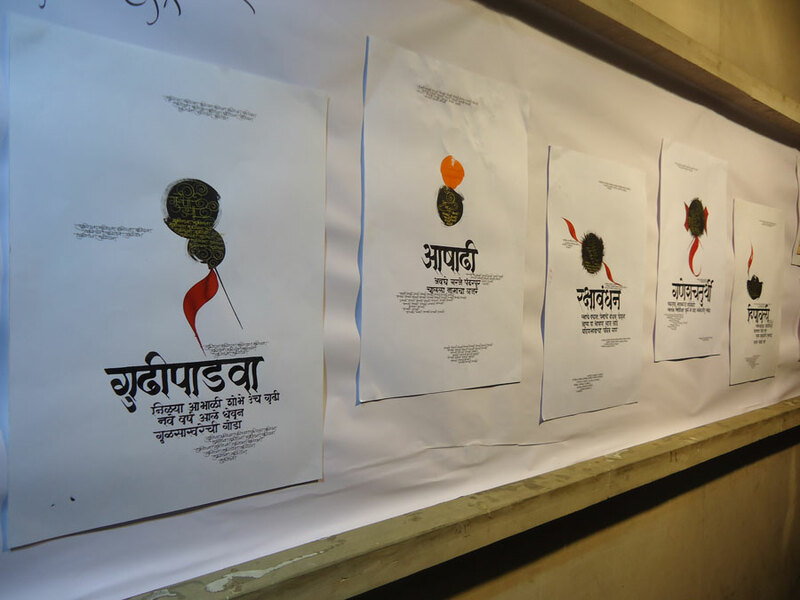 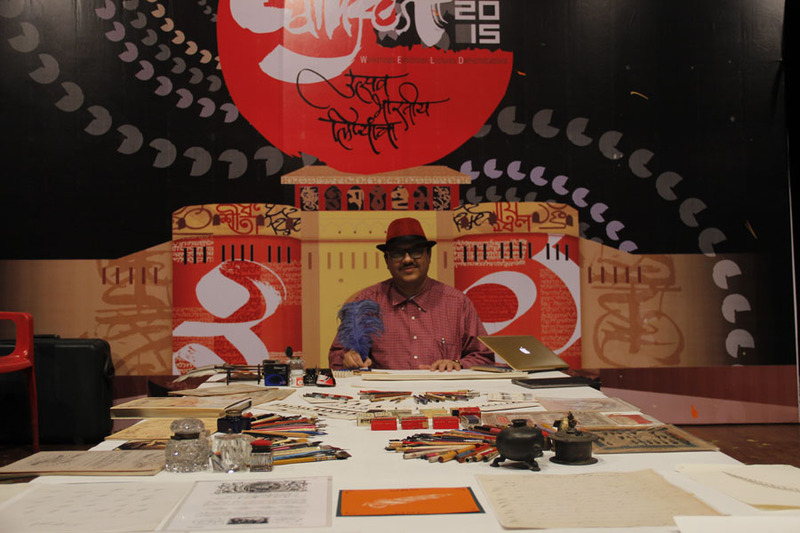 Third International Festival of Calligraphy and Typography "Rutenia"
Works of Achyut Palav were featured among the works other noted artists at the Festival of Calligraphy & Typography. 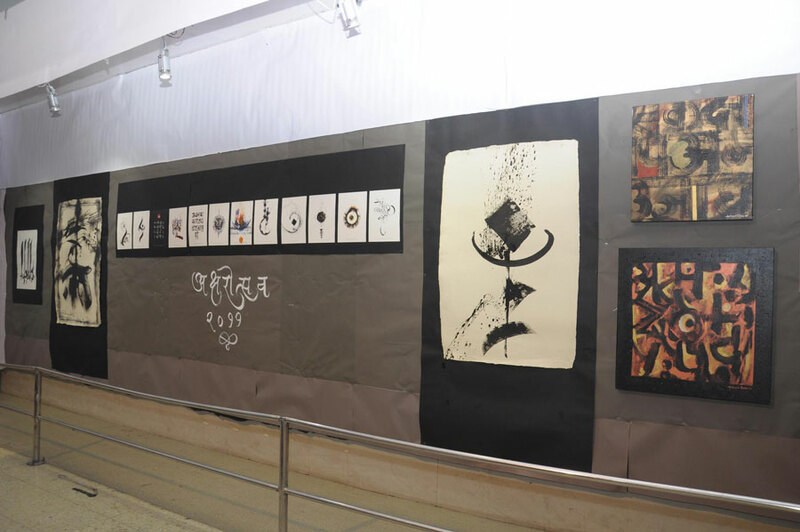 The compositions were highly appreciated & were based on diverse subjects. 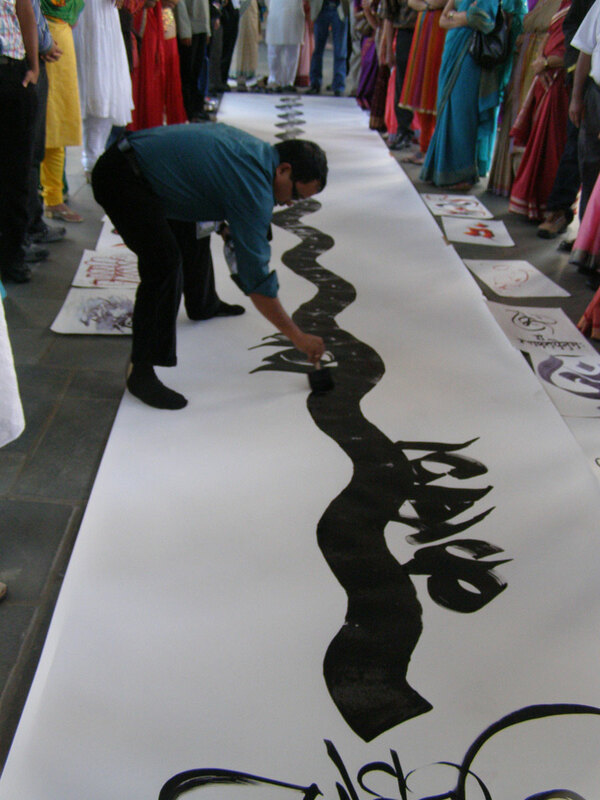 Calligraphy is a live art; to be kept alive in the age of computers 50 students of Achyut Palav School of Calligraphy contribute towards the book 'The World of Calligraphy' Hon. 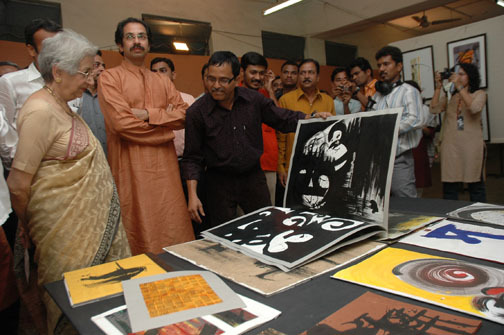 Chief Minister Shri. 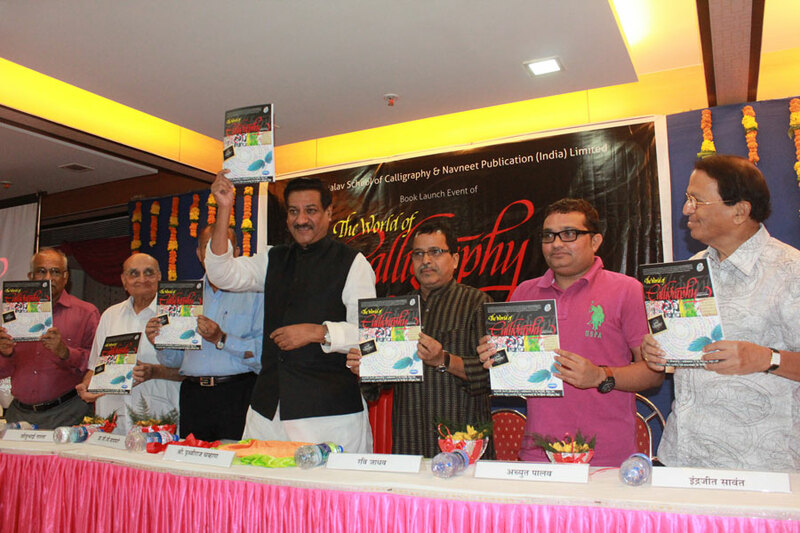 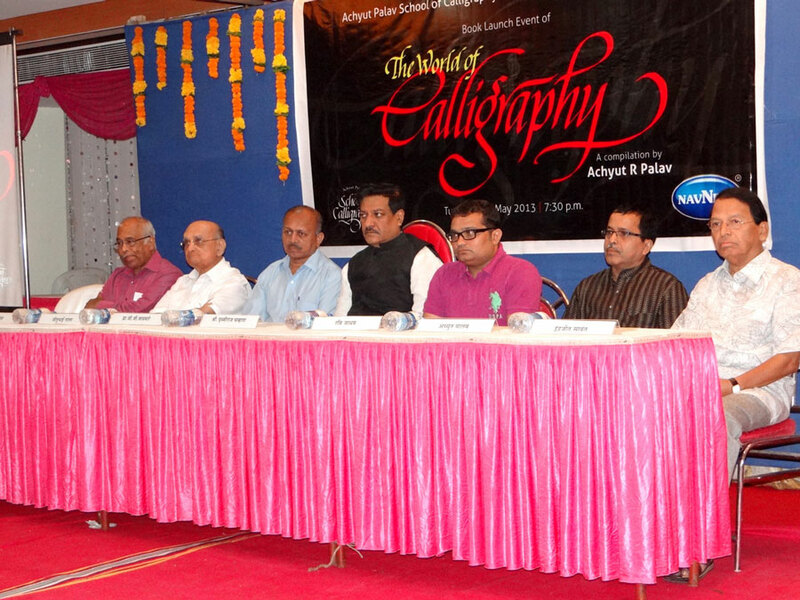 Prithviraj Chavan launches the book - 'The World of Calligraphy' In Mumbai on 7th May 2013 Mumbai, 8th May 2013: "The World of Calligraphy" a compilation of present day calligraphy assembled together by Renowned Calligrapher Achyut Palav along with 50 of his students from Achyut Palav School of Calligraphy was released today in Mumbai by the hands of Maharashtra Chief Minister, Shri. 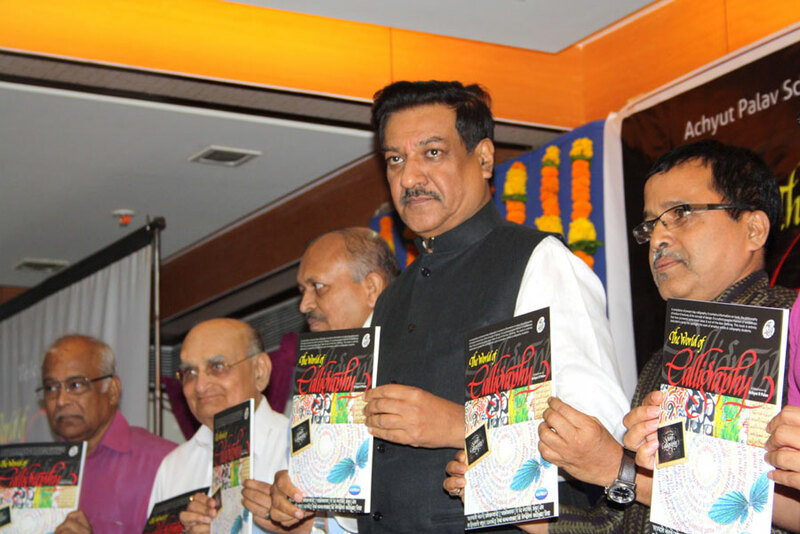 Prithviraj Chavan. 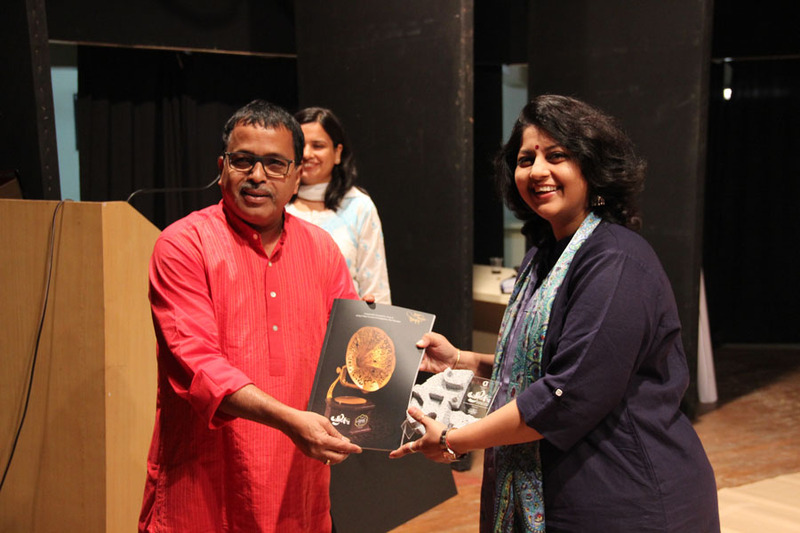 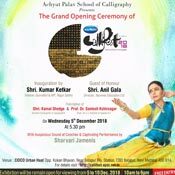 The book is published by Navneet Prakashan, titled "The World of Calligraphy" and contains information on tools, the philosophy of medium & texture and the concept of design. 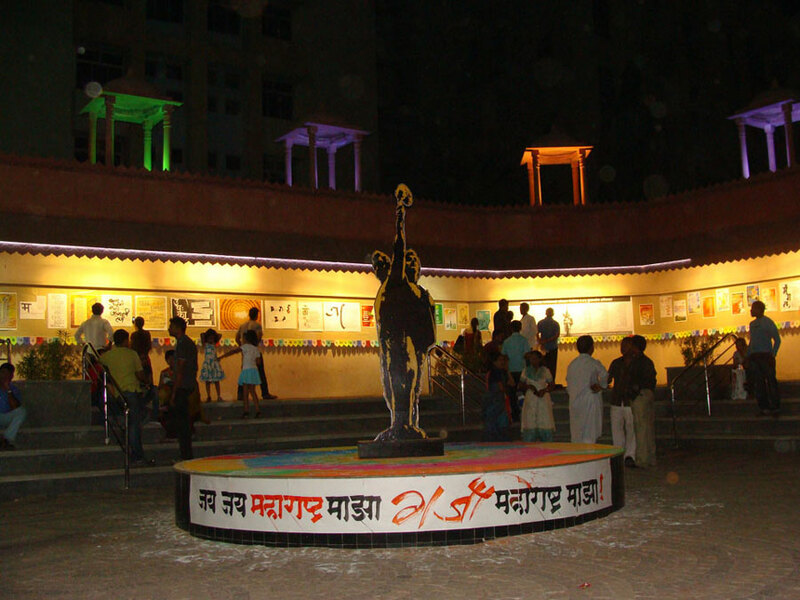 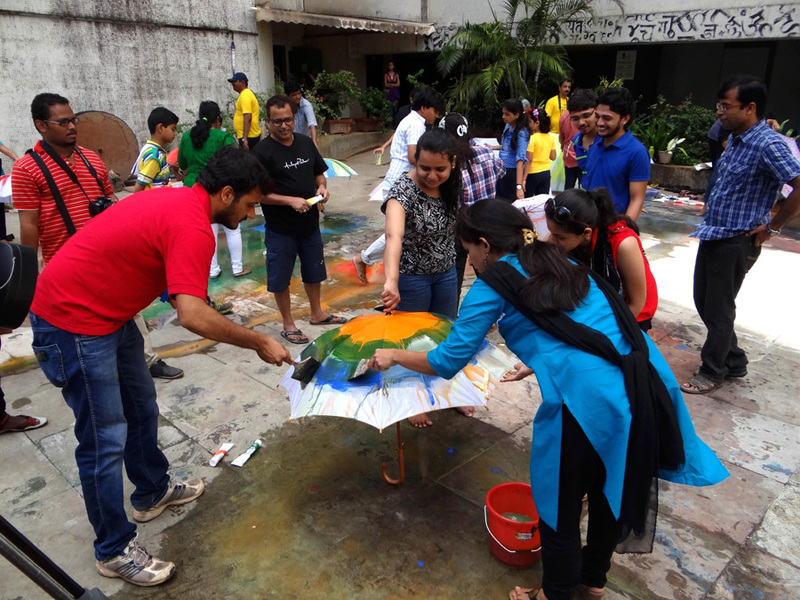 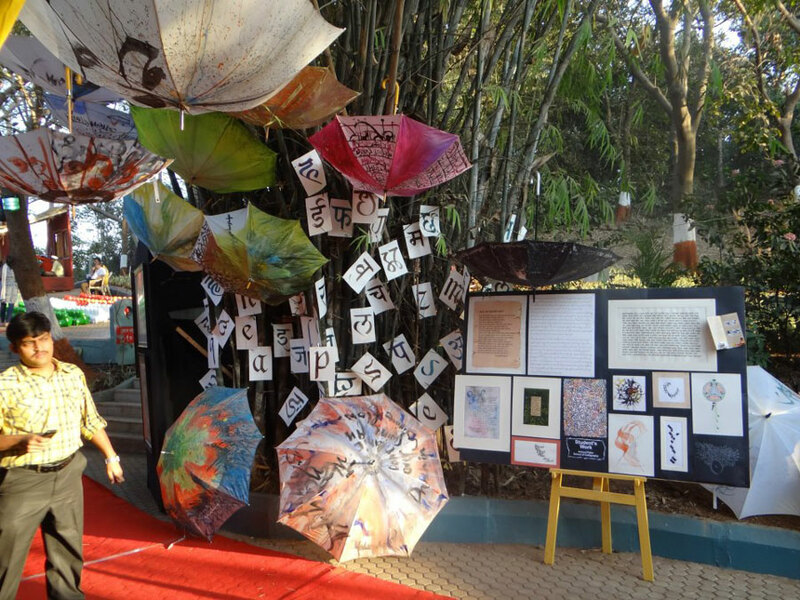 On the auspicious Date of 1st May- Maharashtra Day an exhibition of Students (APSC) works adorned the famous Shivaji Chowk in Navi Mumbai. 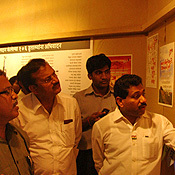 It was visited by locals & important faces from Navi Mumbai. 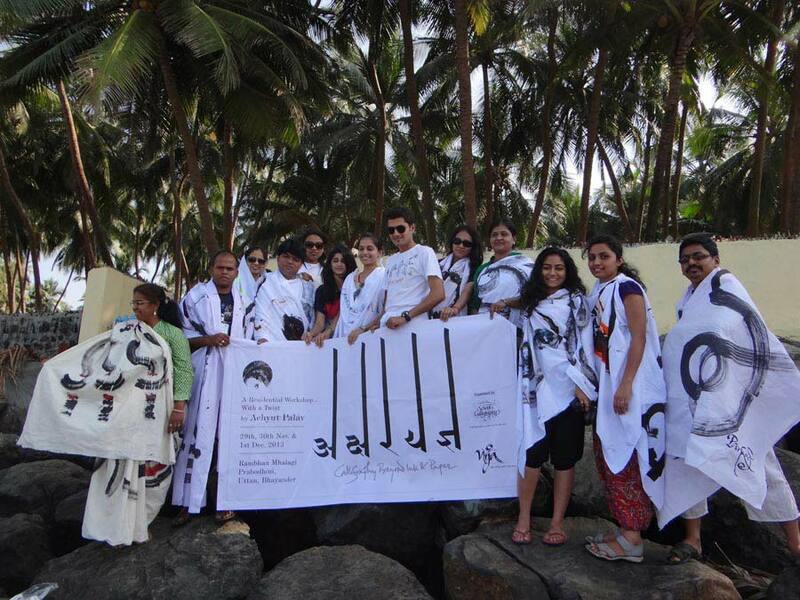 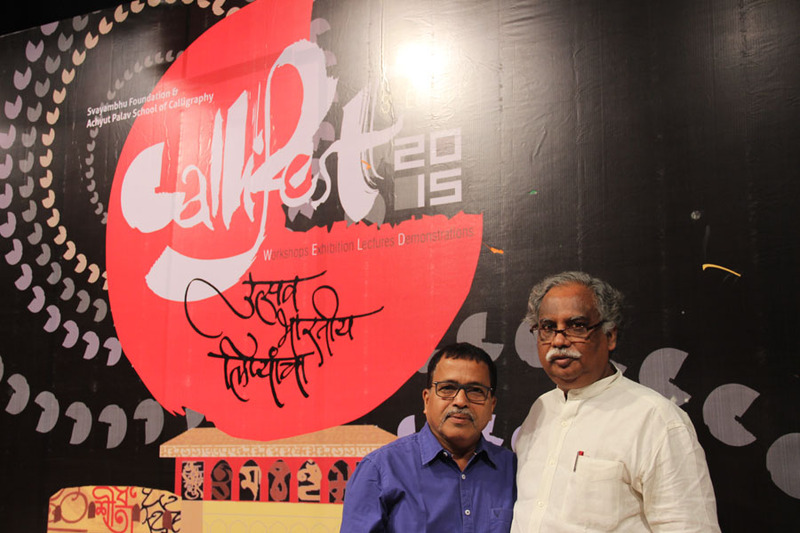 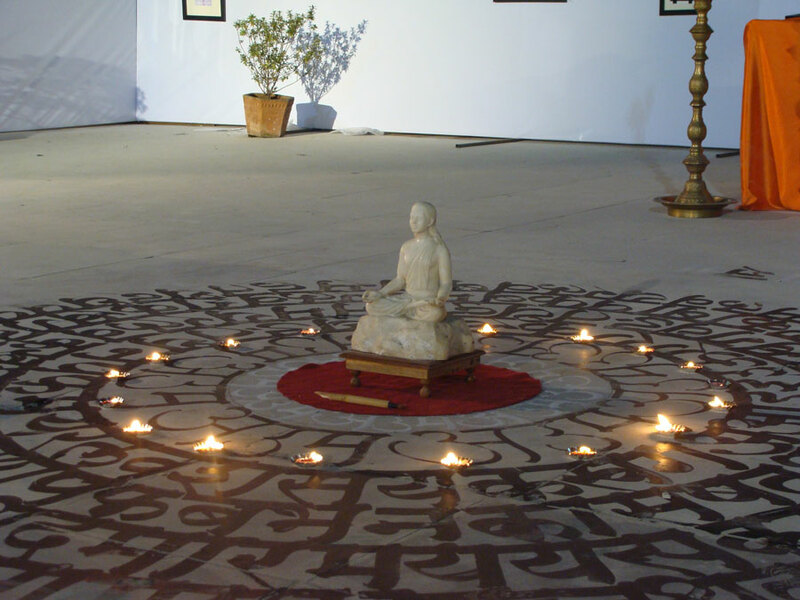 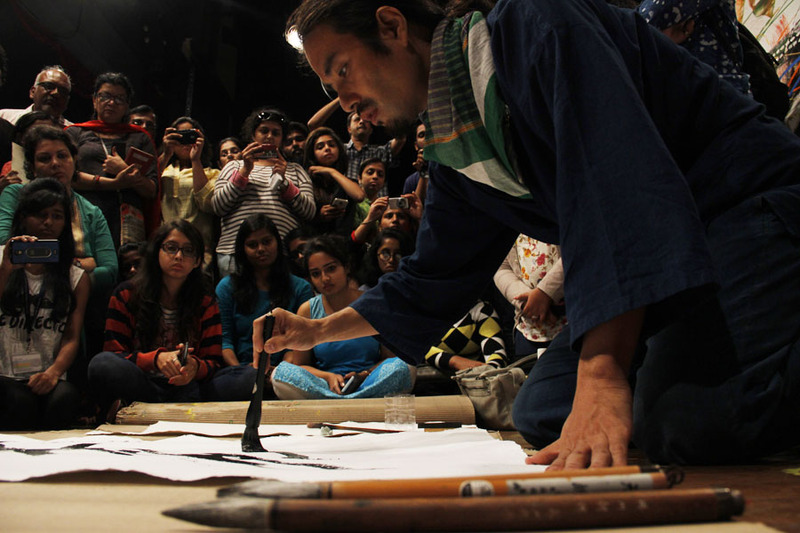 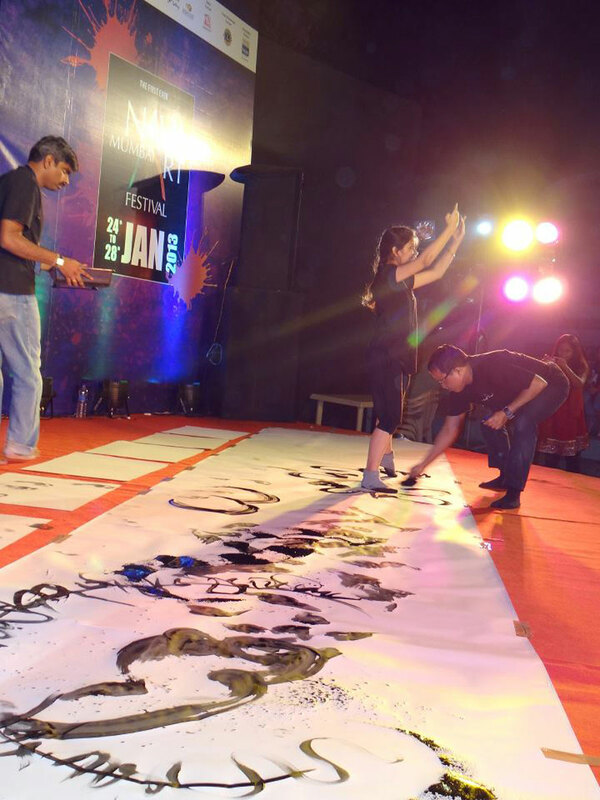 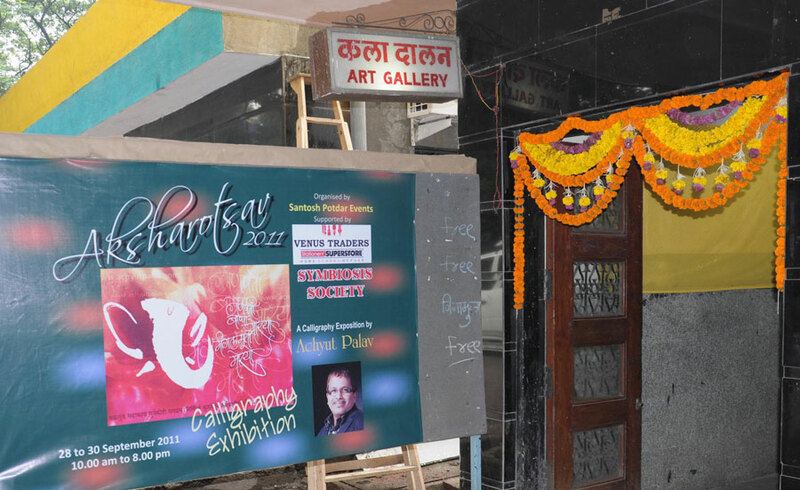 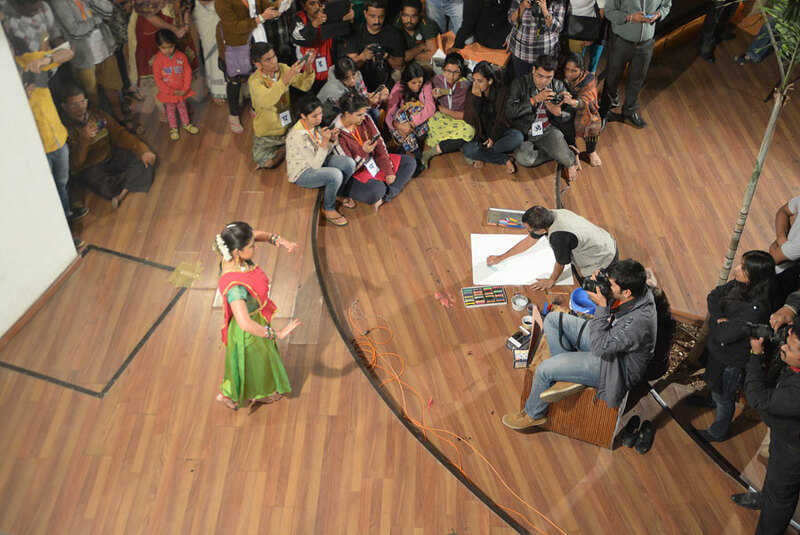 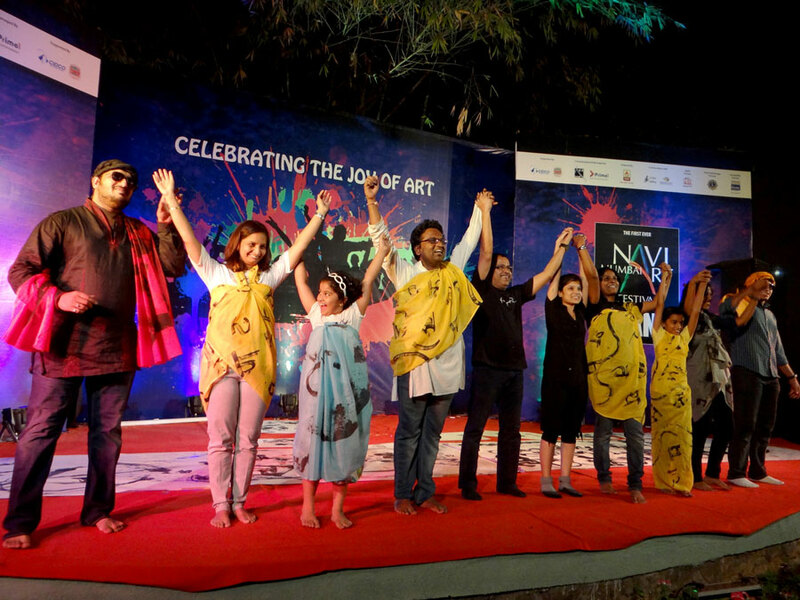 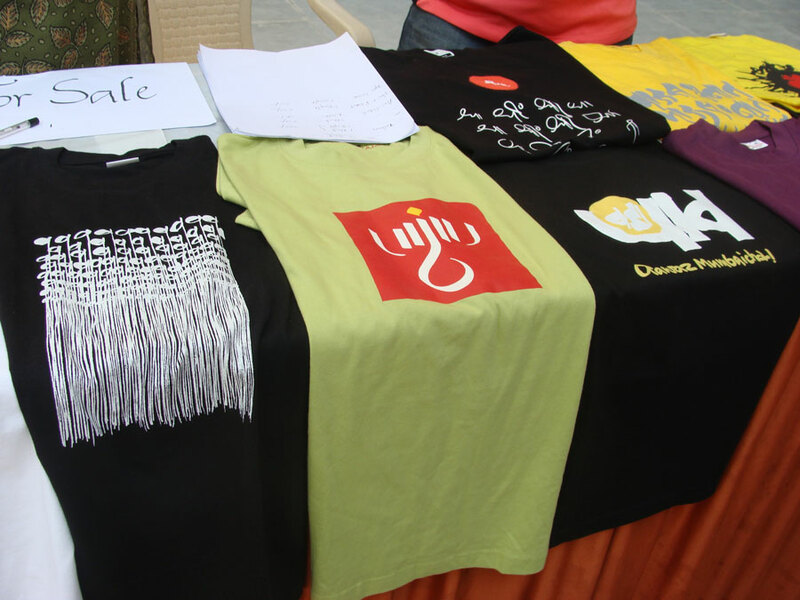 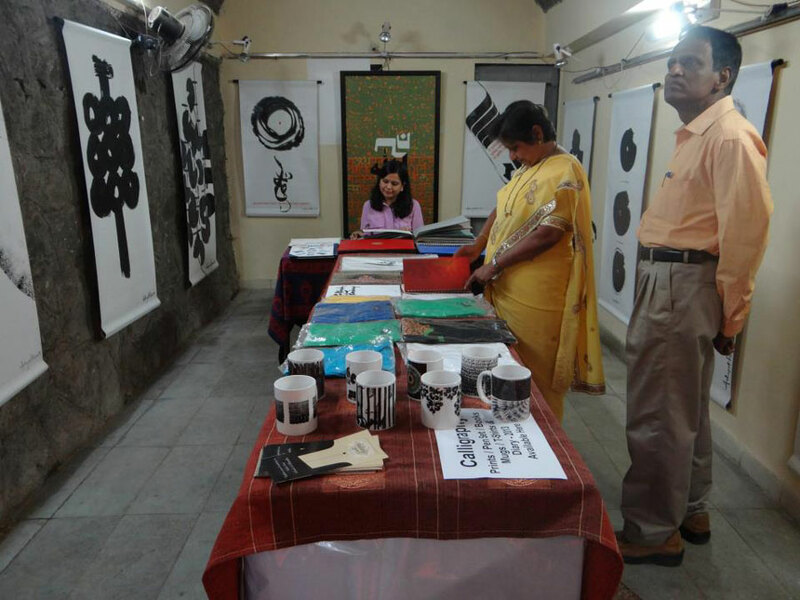 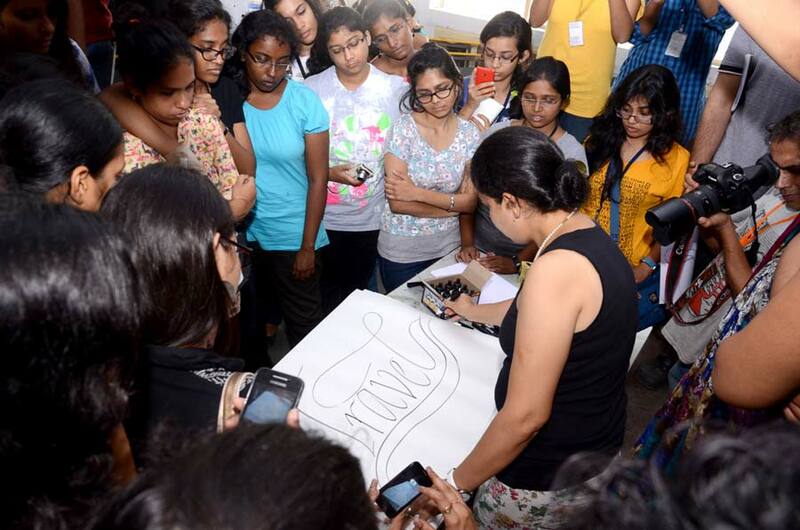 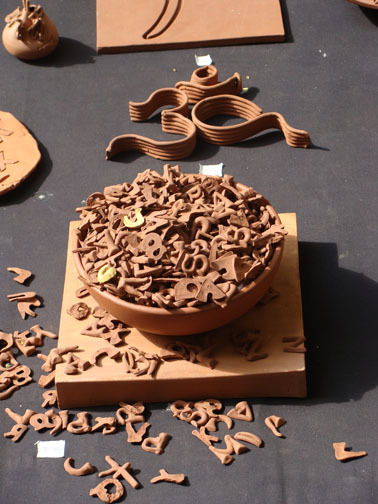 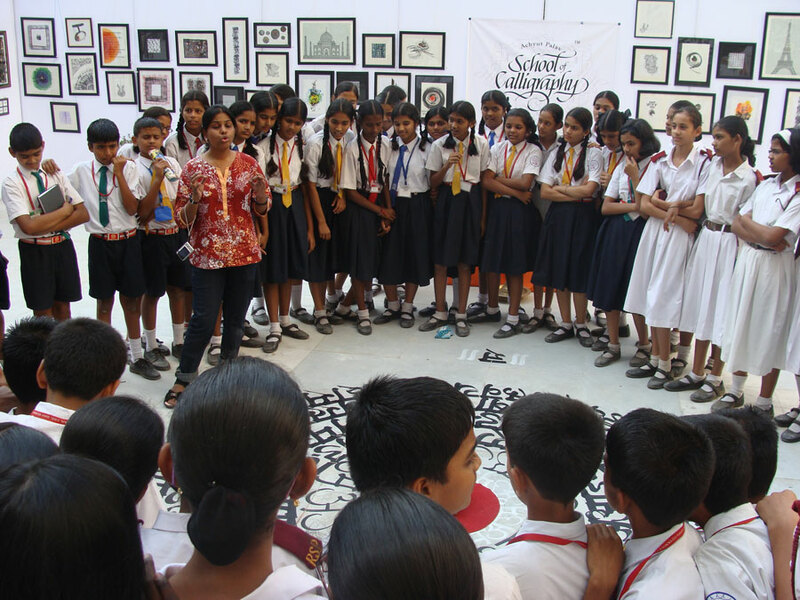 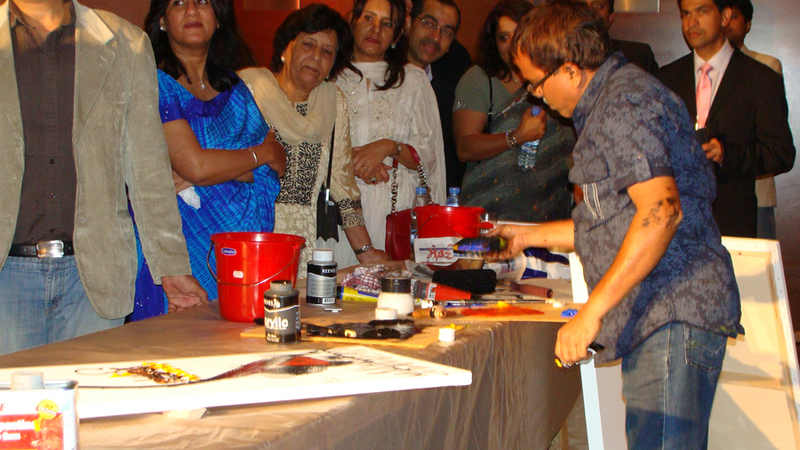 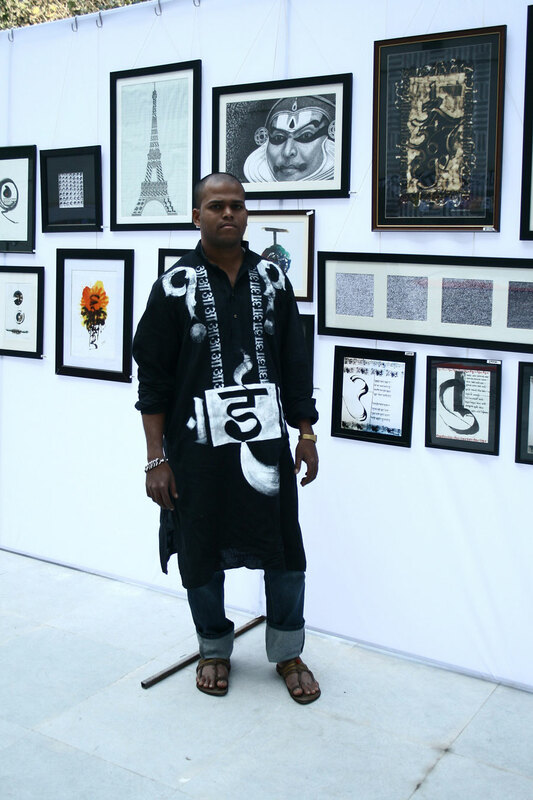 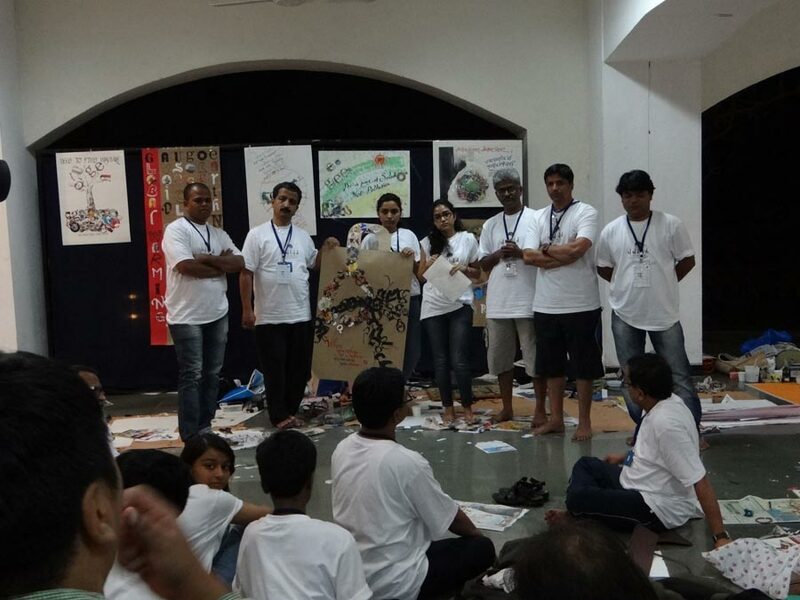 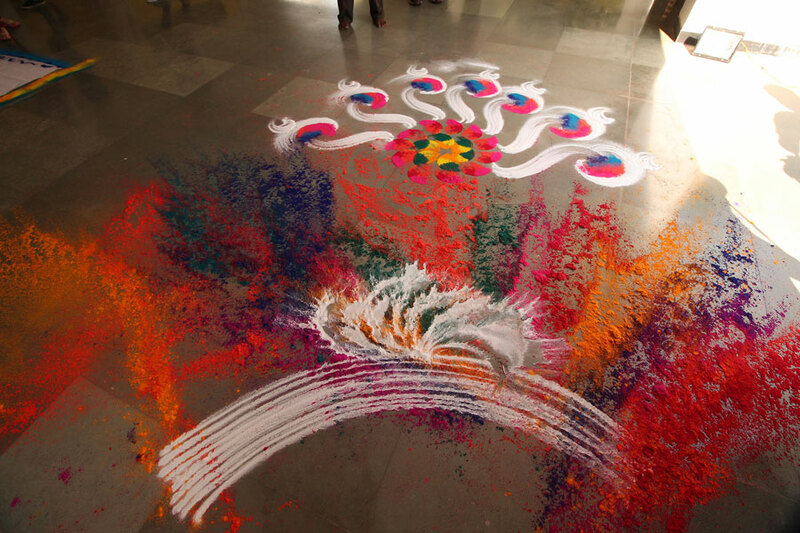 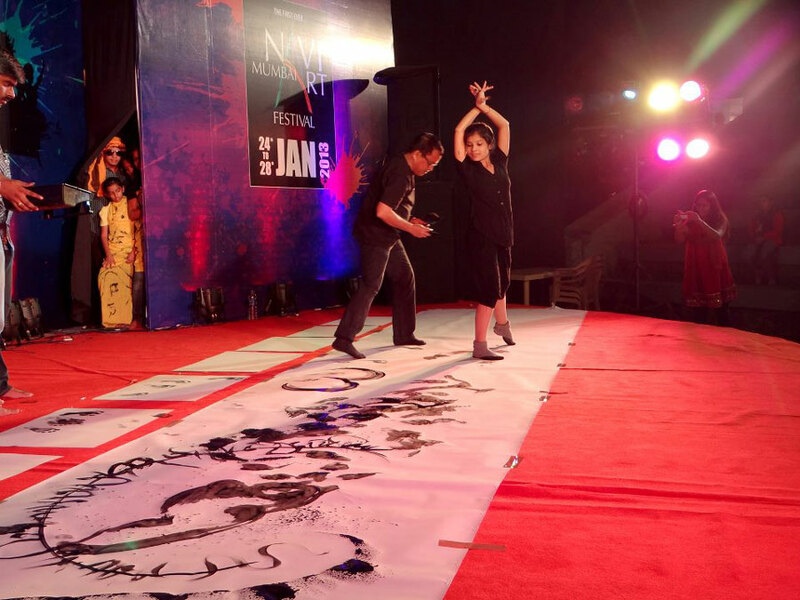 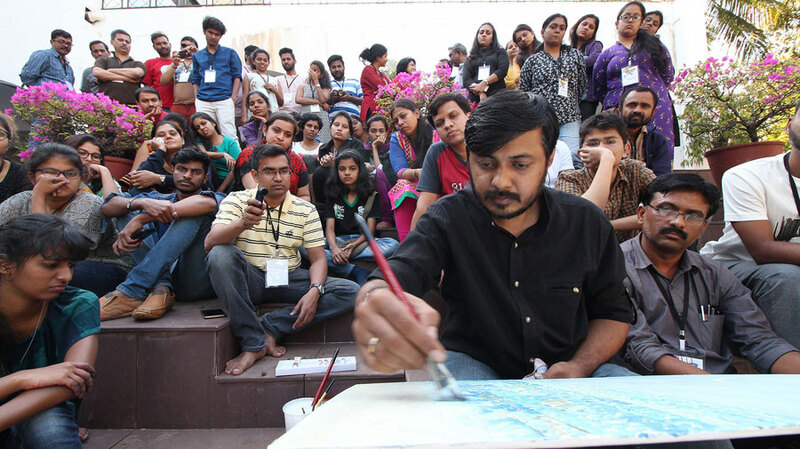 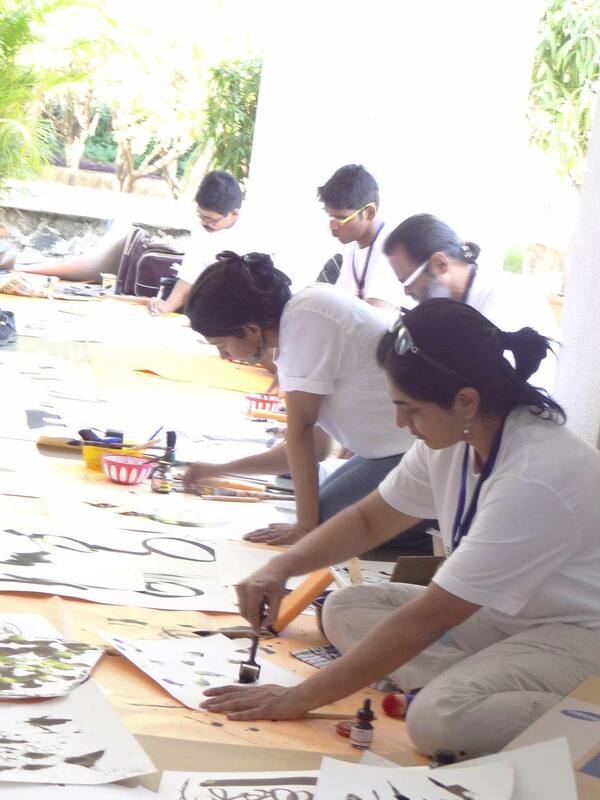 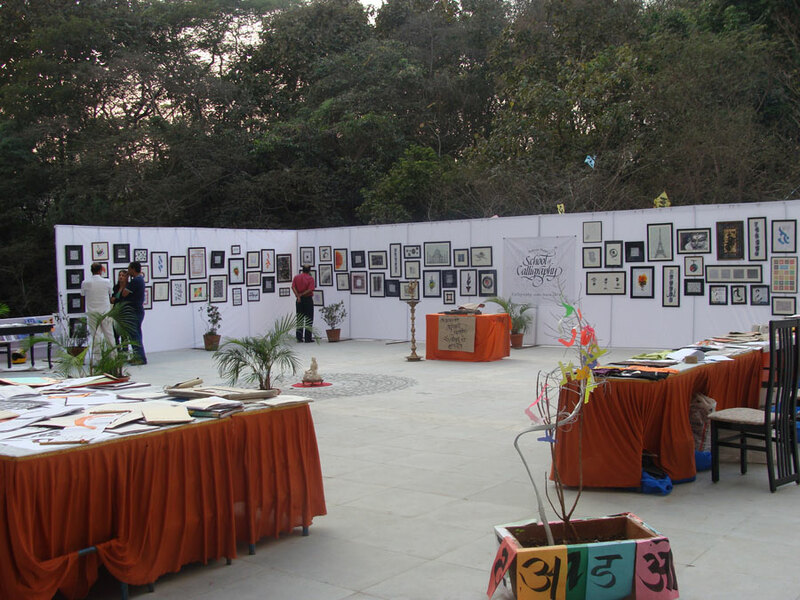 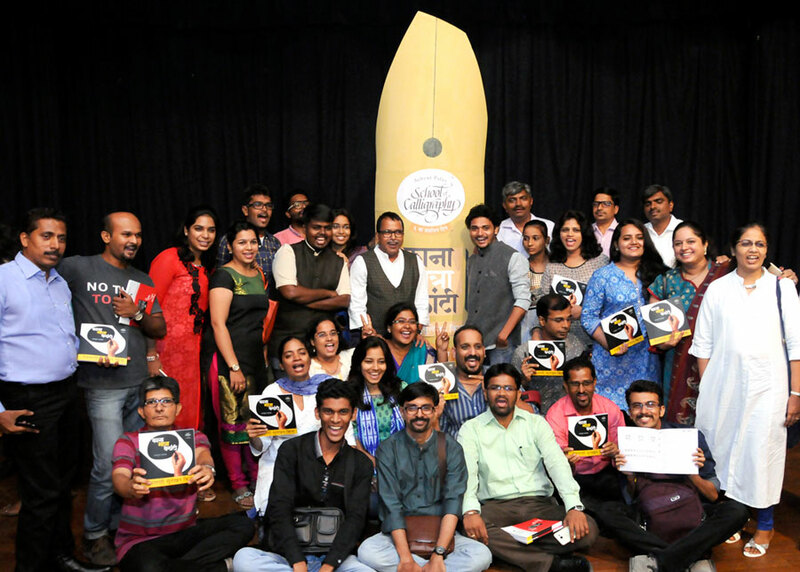 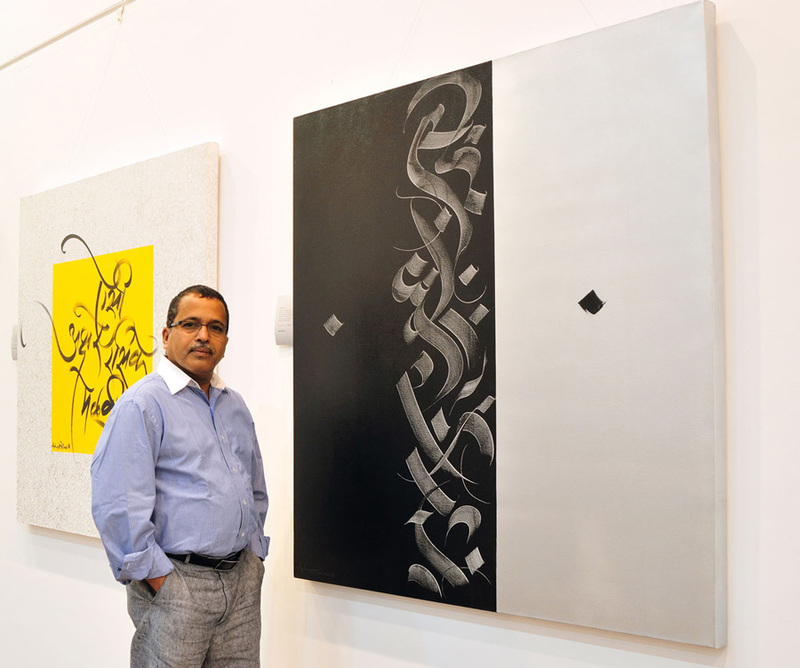 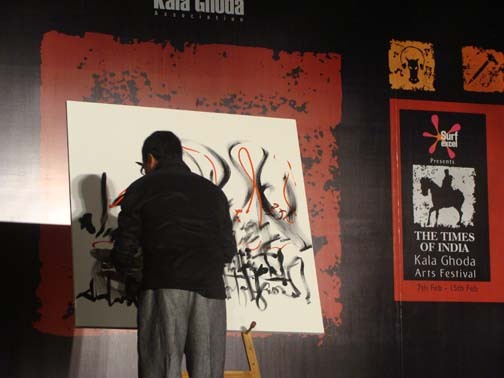 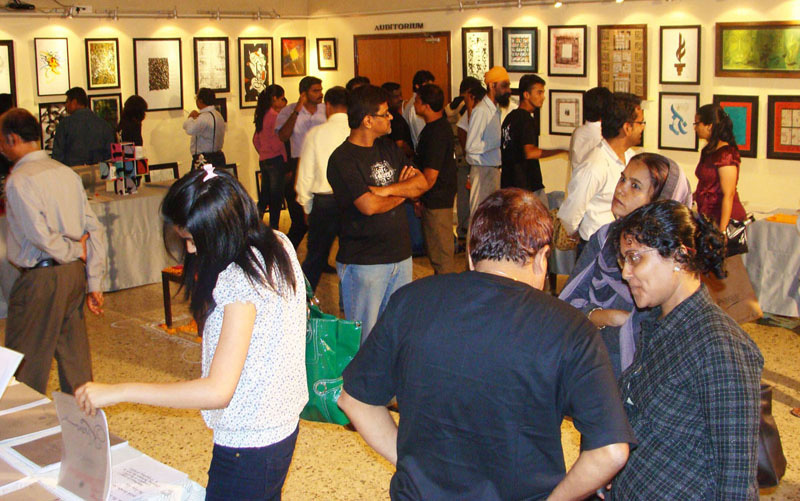 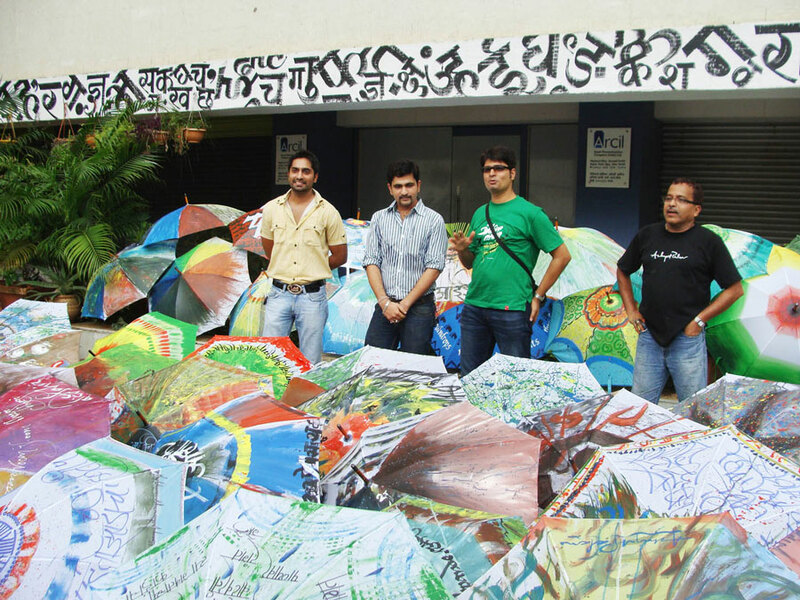 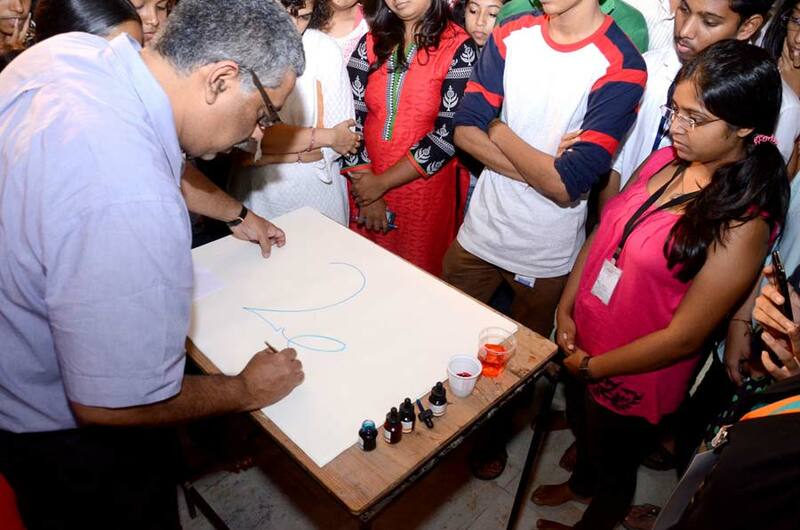 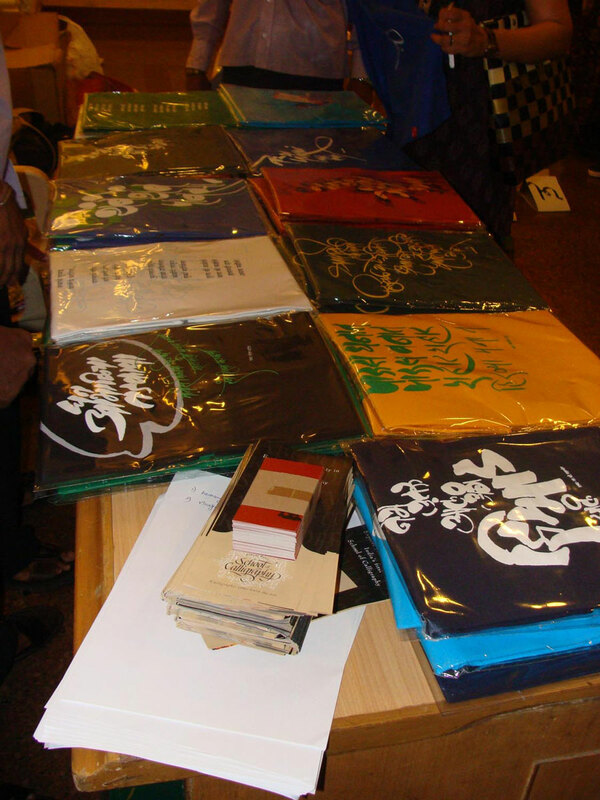 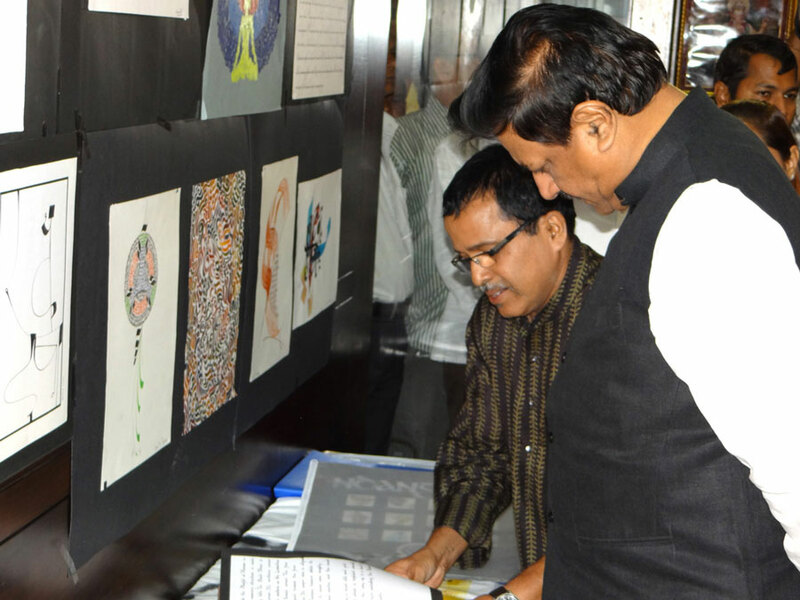 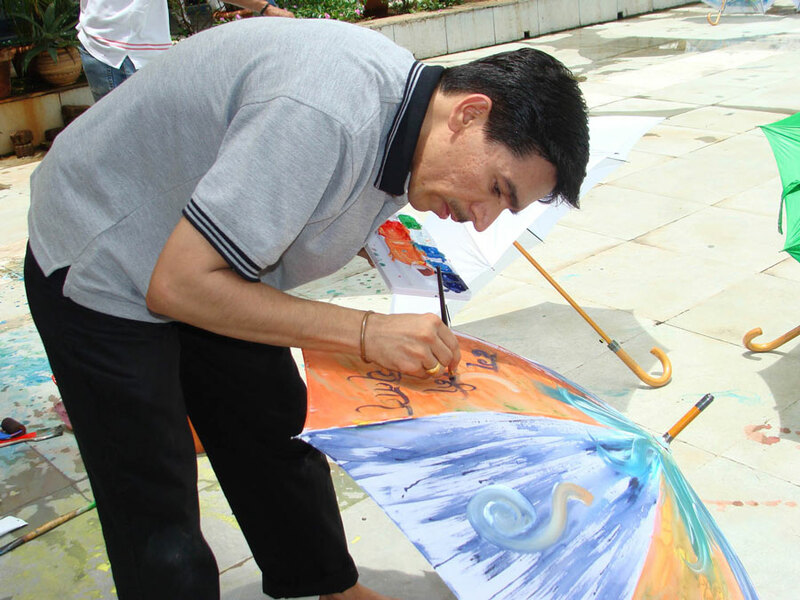 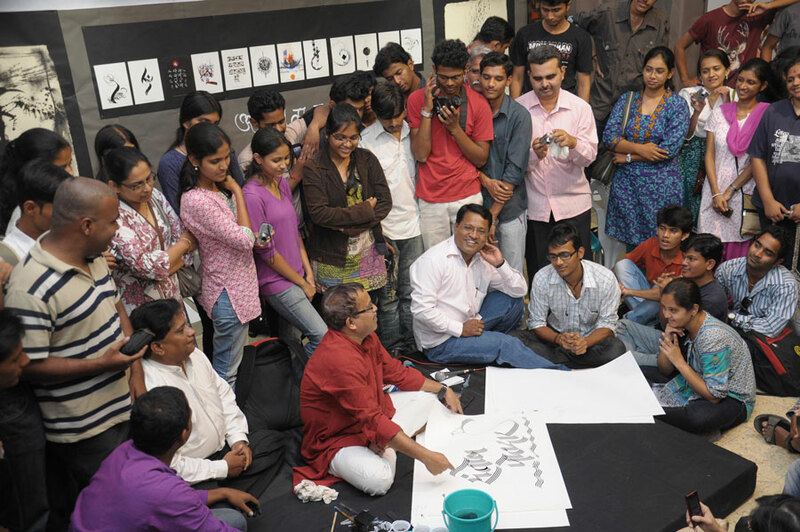 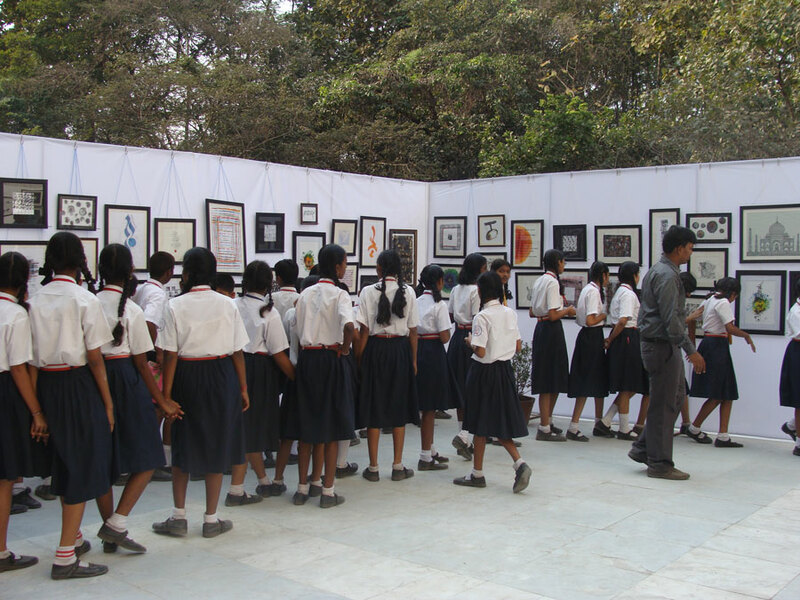 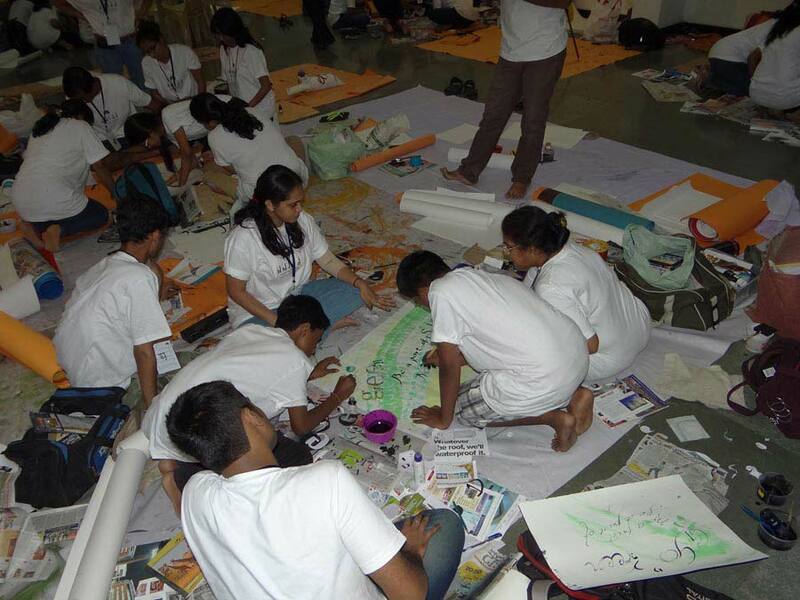 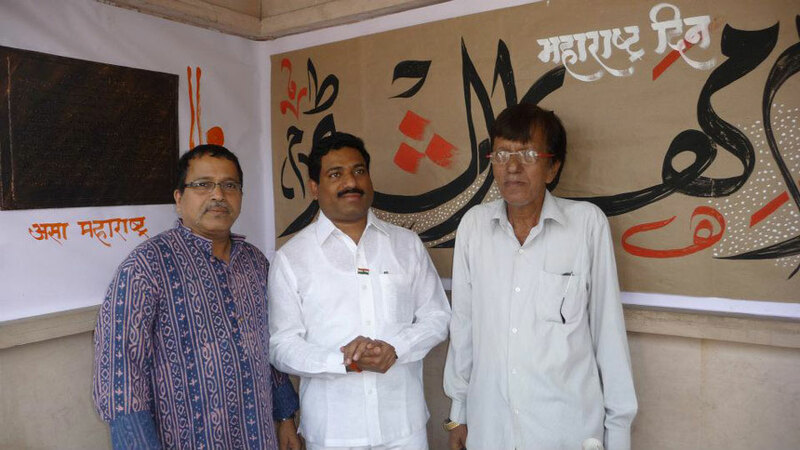 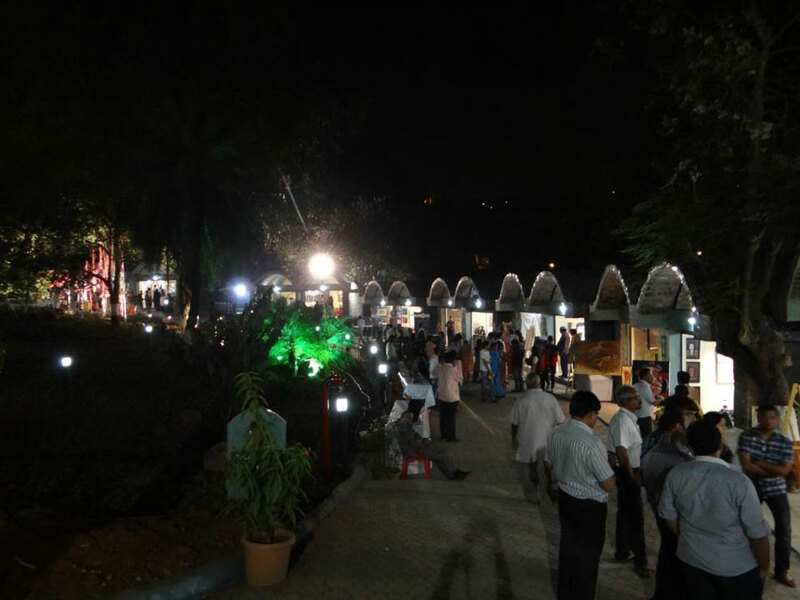 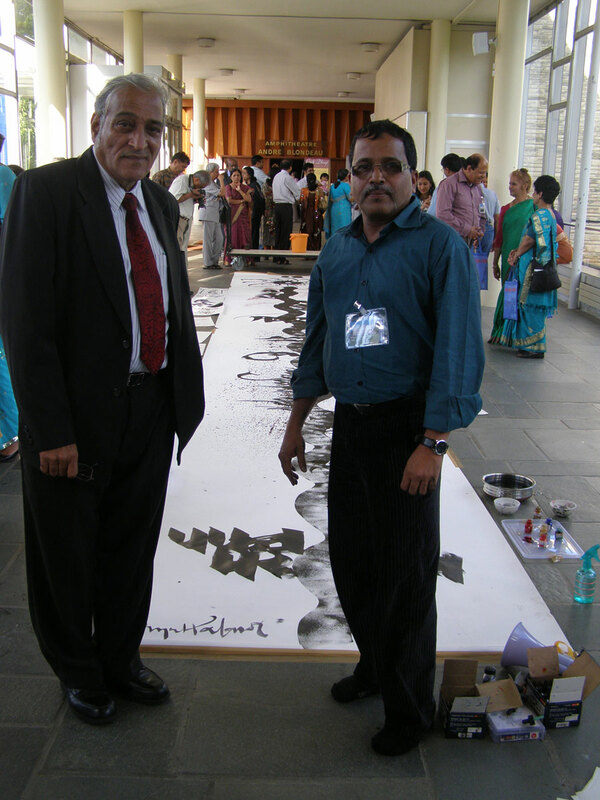 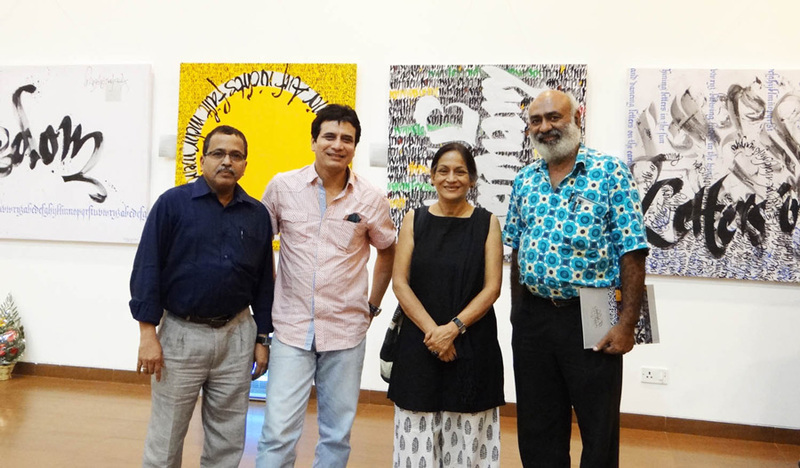 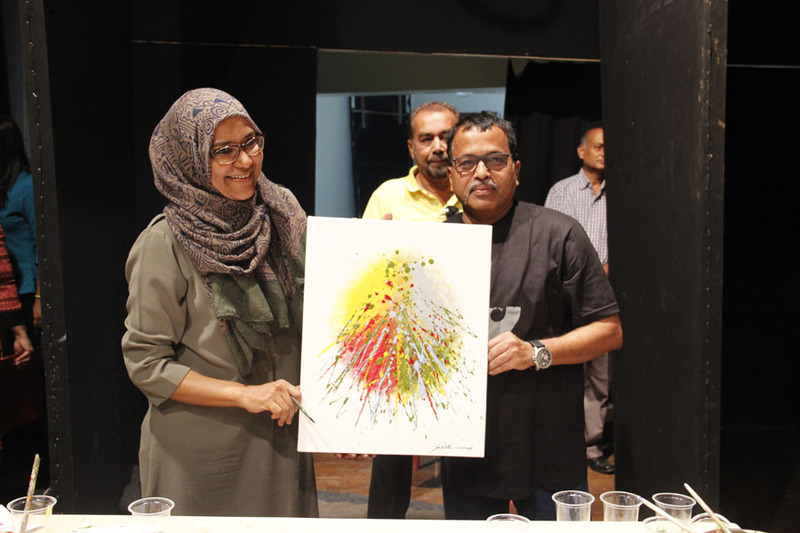 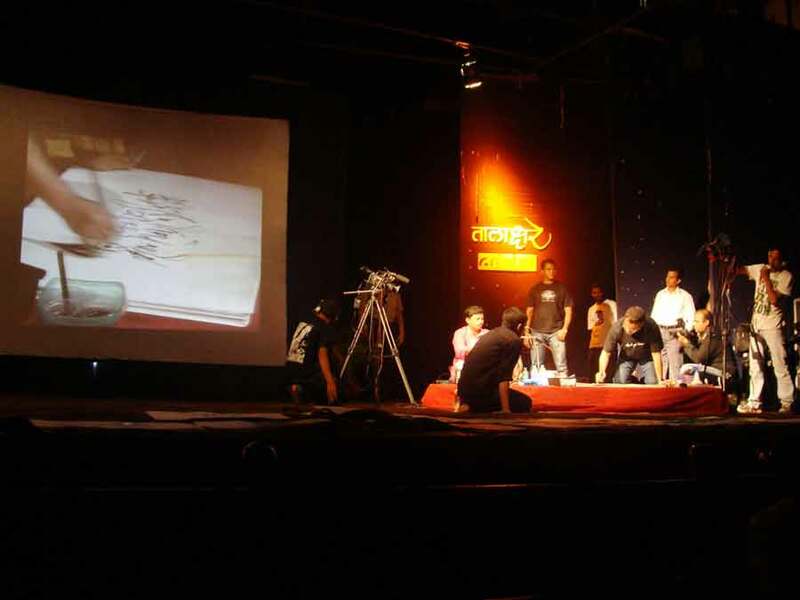 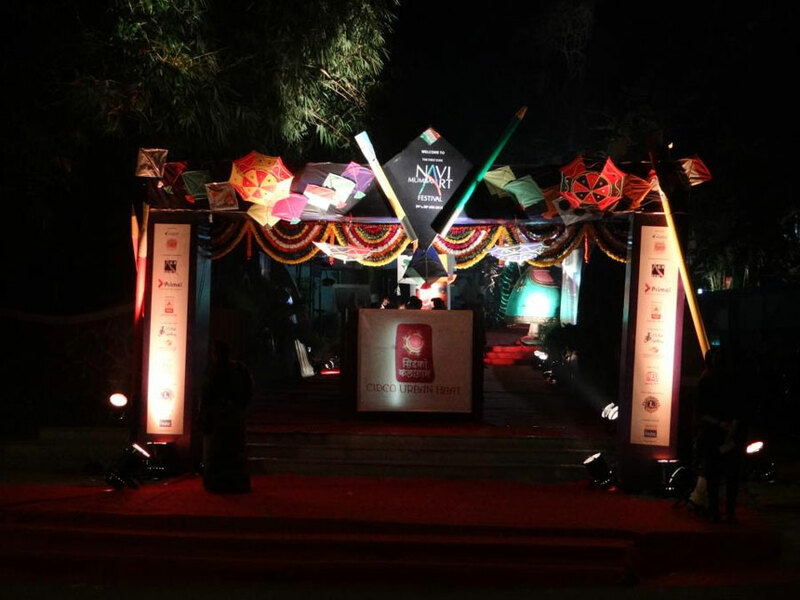 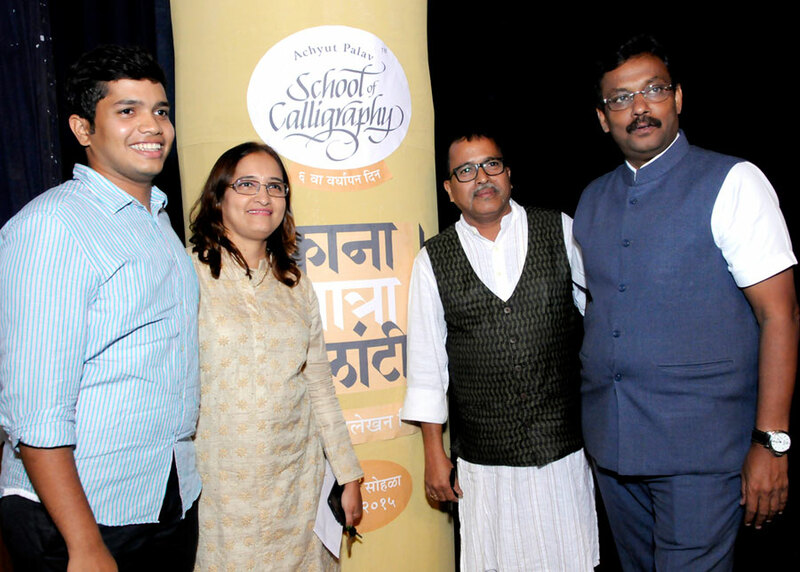 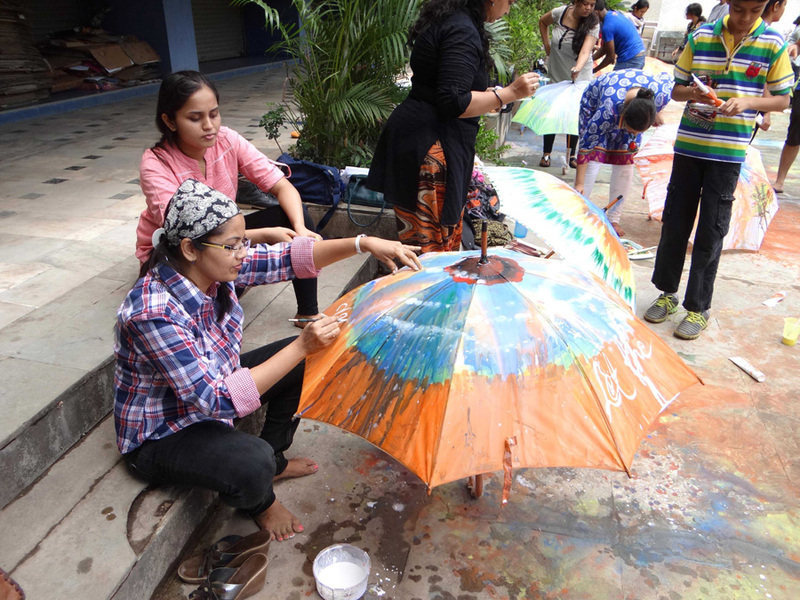 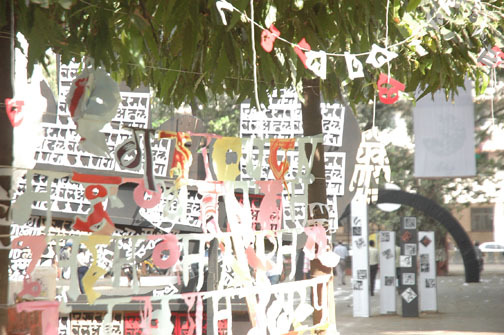 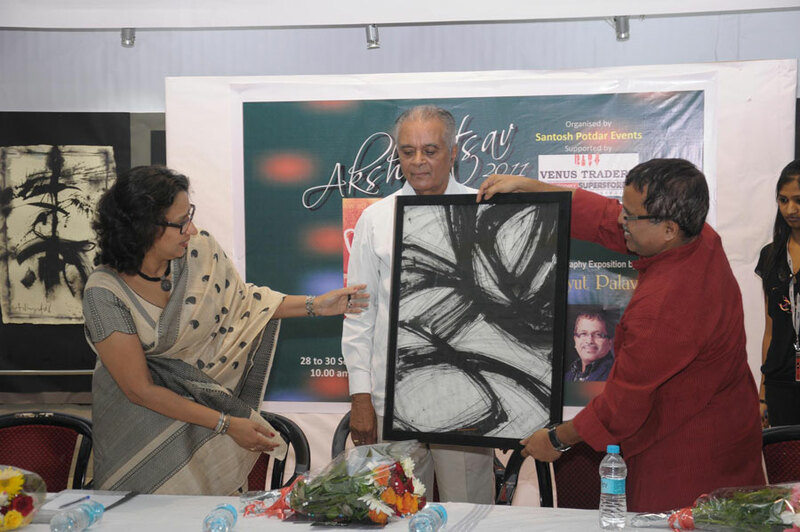 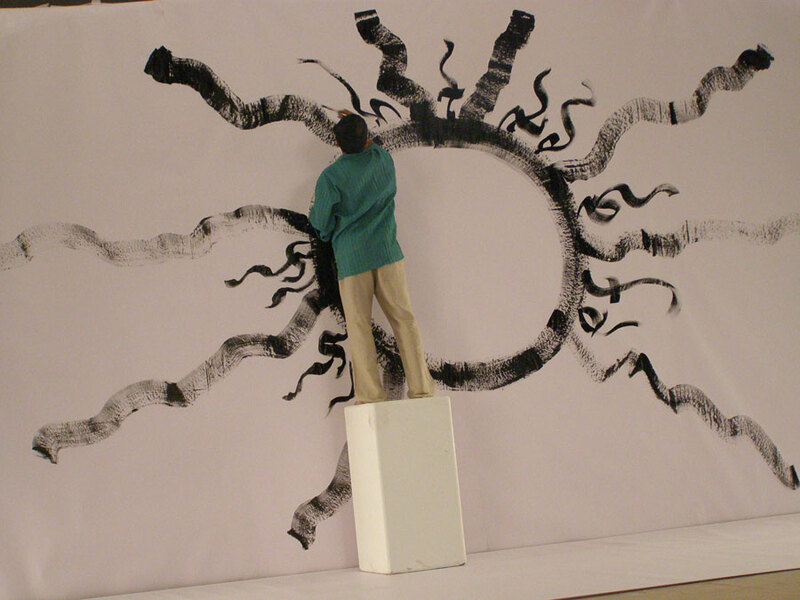 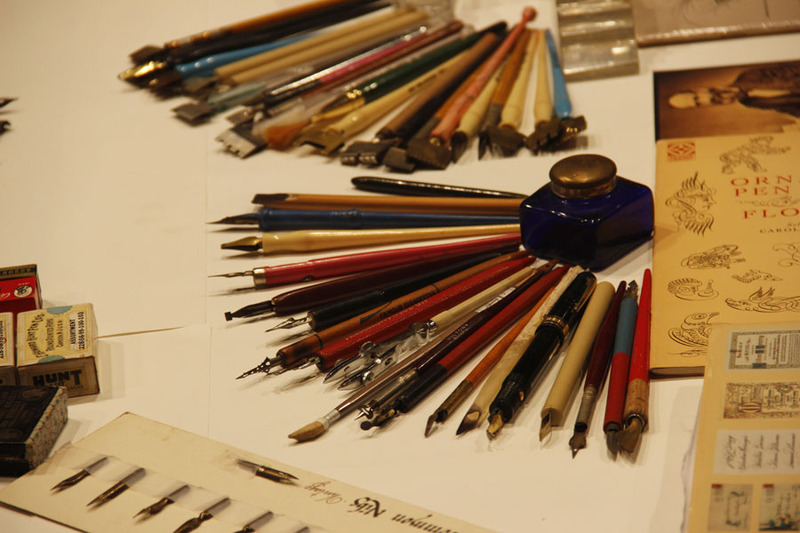 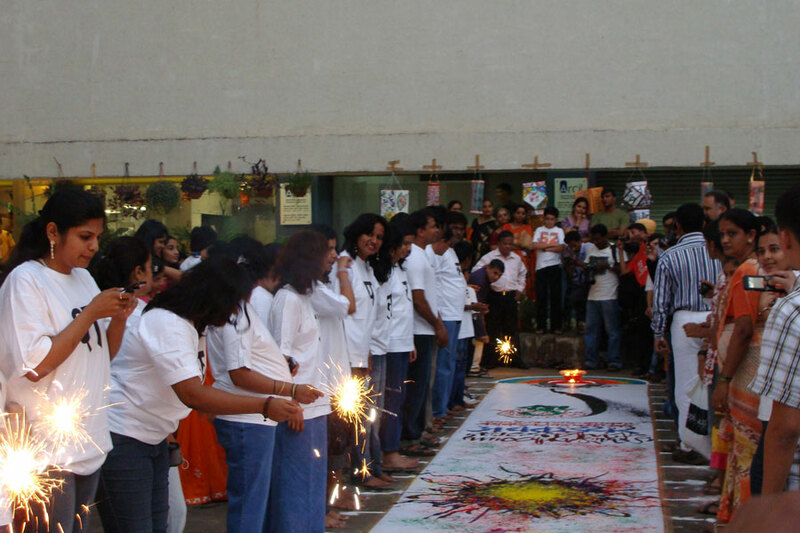 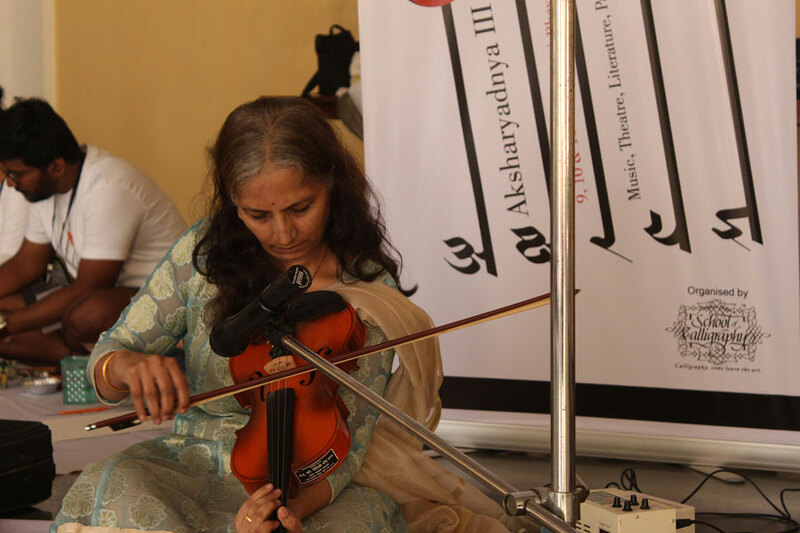 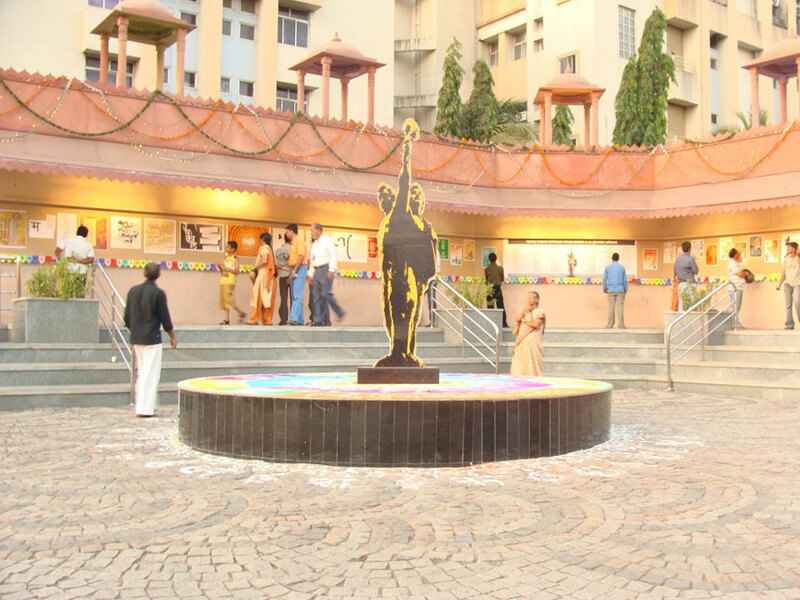 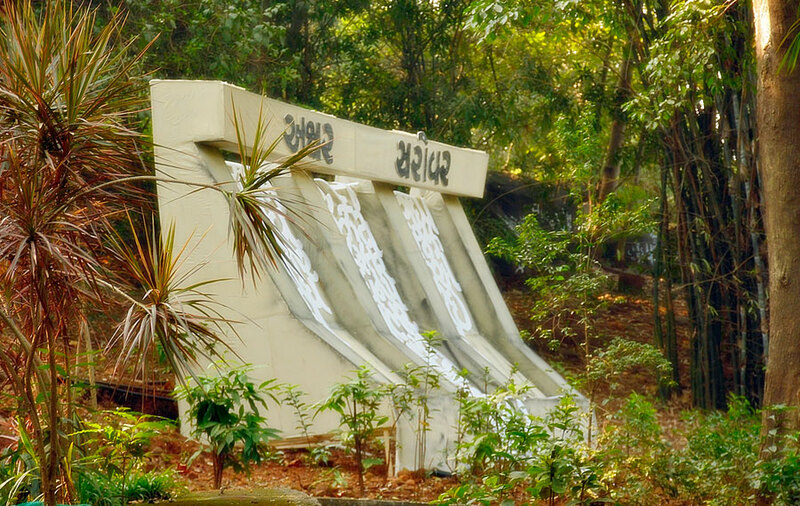 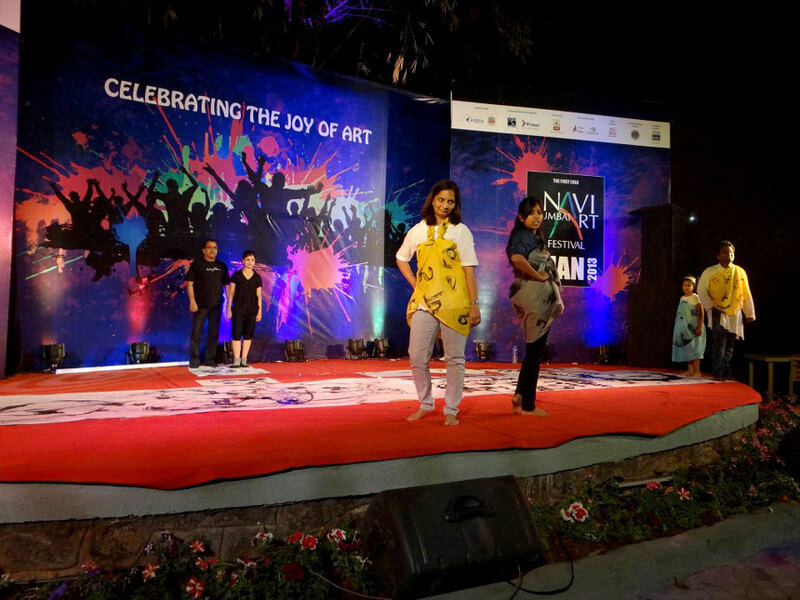 The arts festival organized in Navi Mumbai showcased works in Calligraphy & other arts. 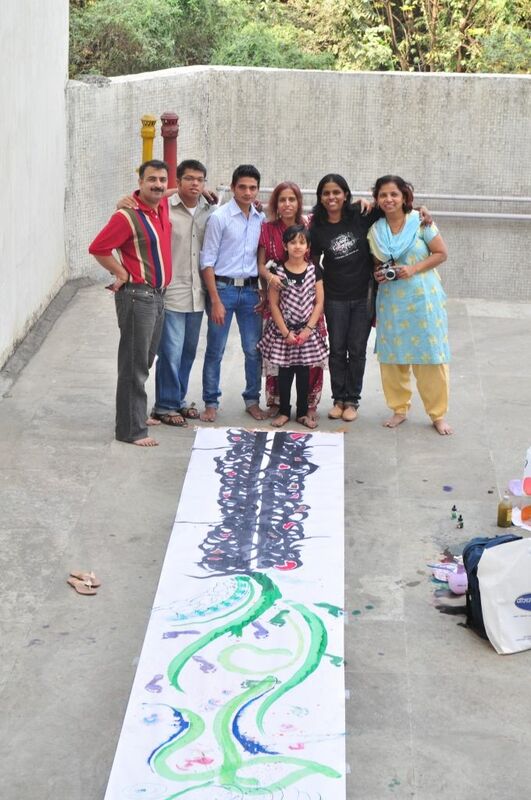 It was visited by art lovers across the city. 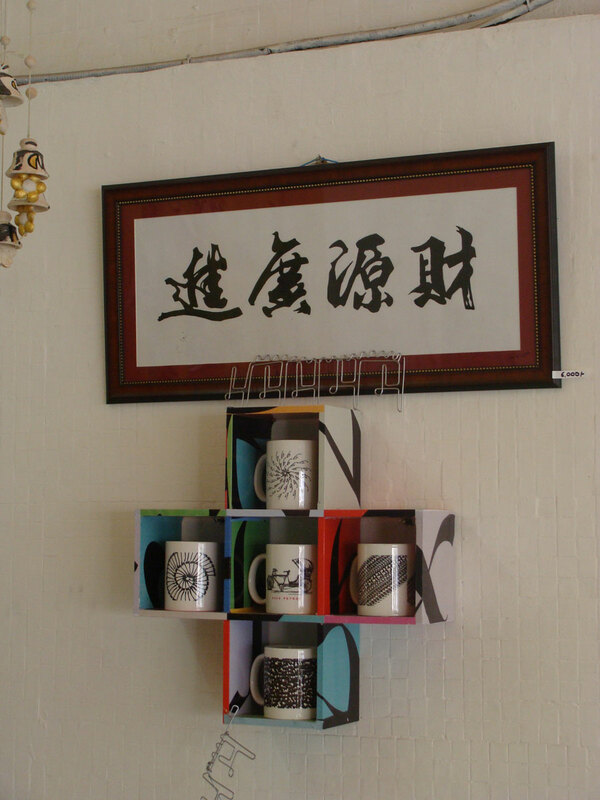 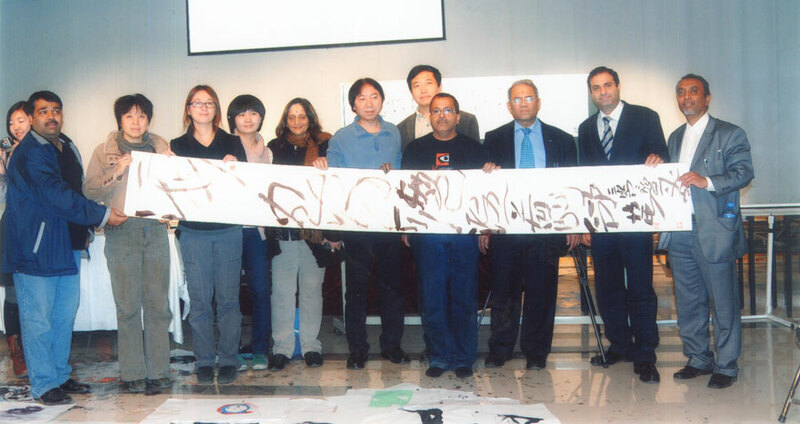 The work in calligraphy was highly appreciated as a upcoming art. 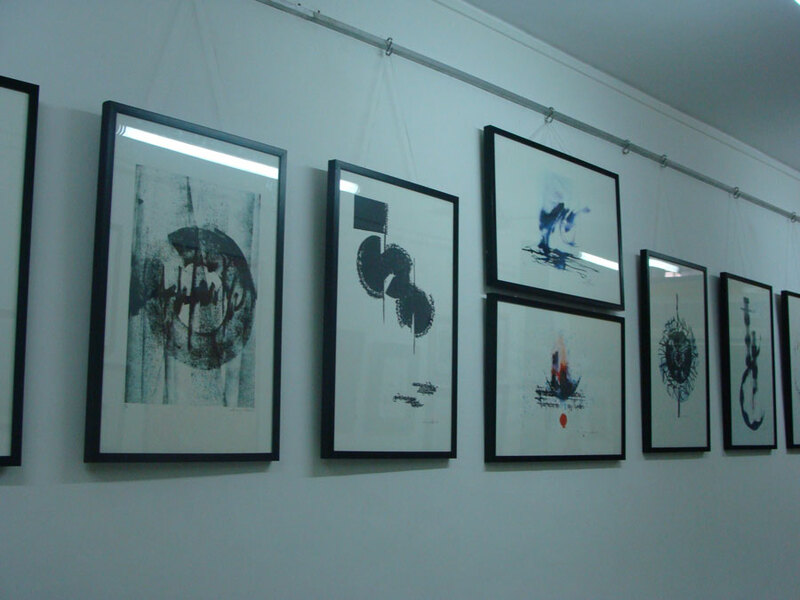 'Masterstrokes' an exhibition of these precious compositions. 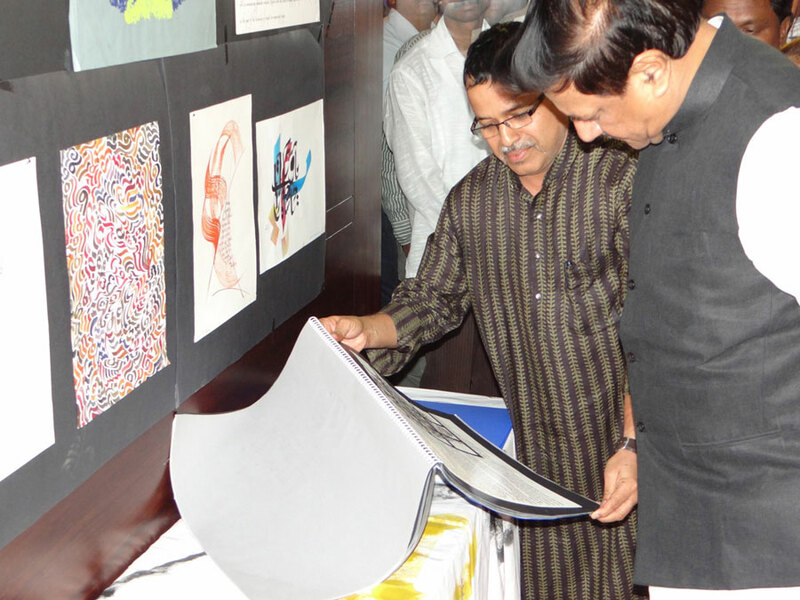 It is a sincere attempt to popularize this art among people & bring works of these masters into limelight. 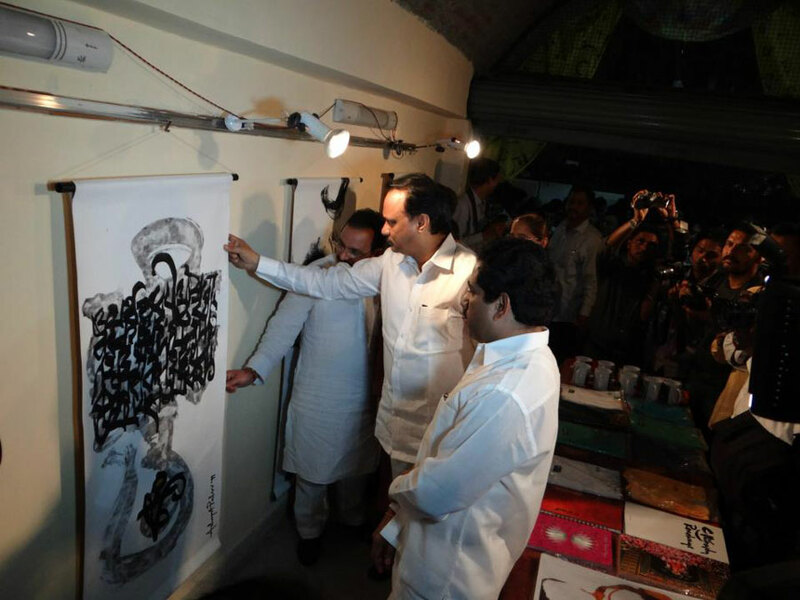 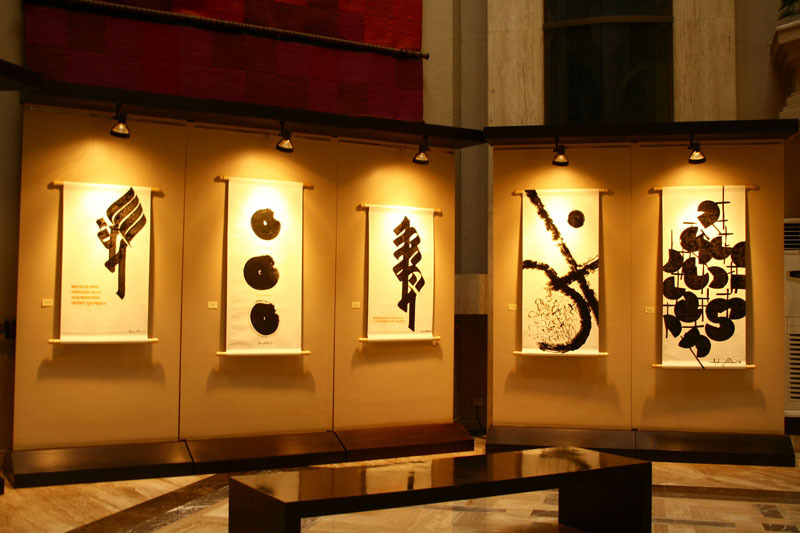 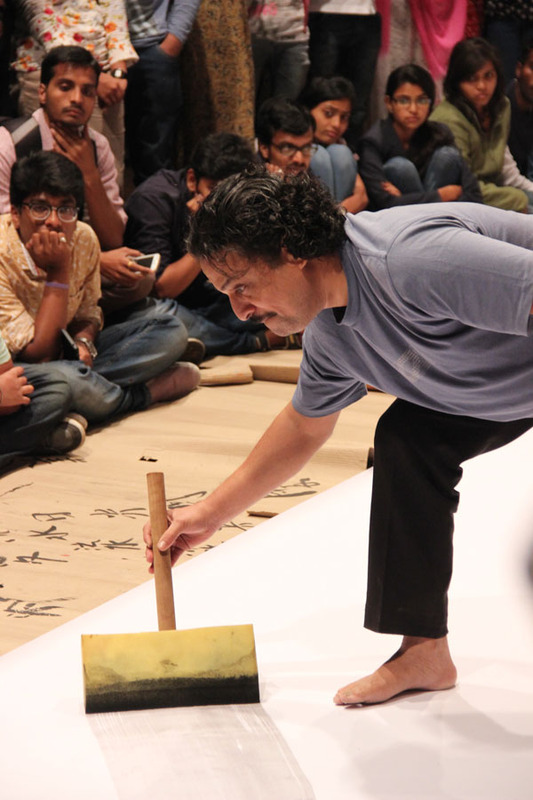 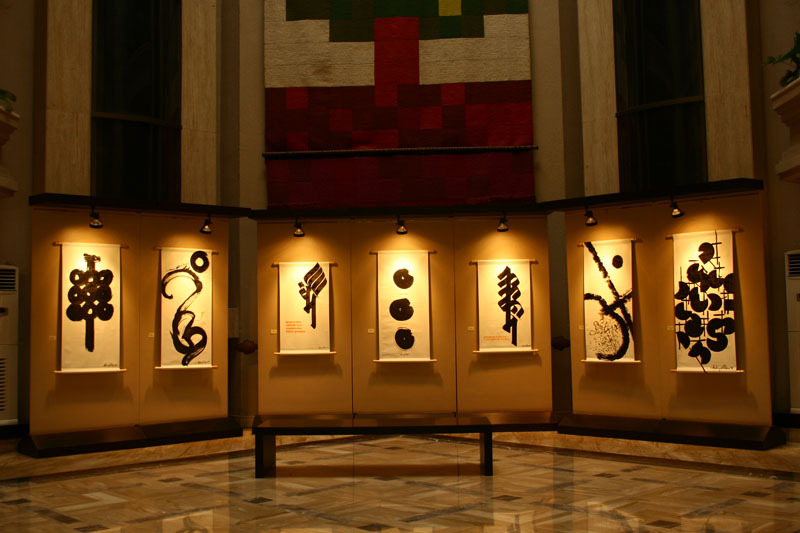 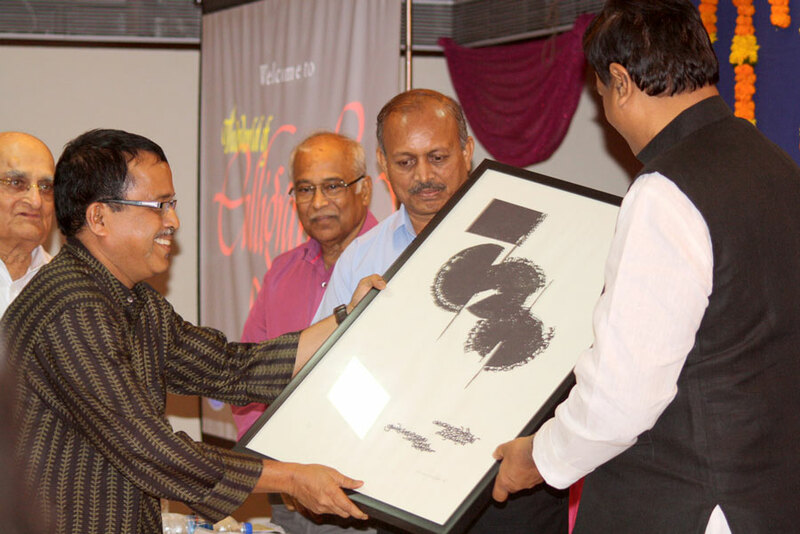 It displayed the beauty of foreign calligraphy before the next generation artists of India. 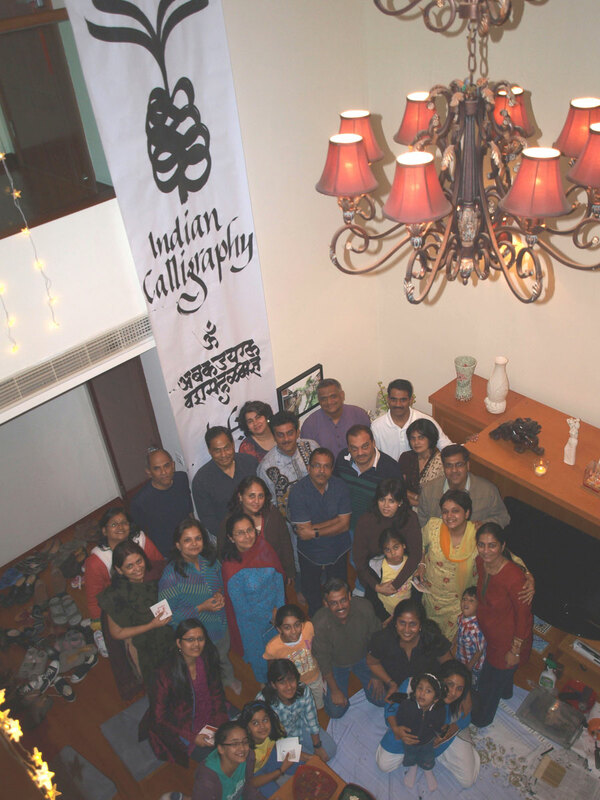 A Celebration of Friendship. 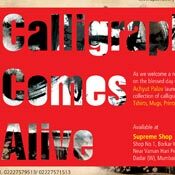 Along with a long time friend & fellow calligrapher from Germany Achyut Palav held an exhibition & launched a book 'Silver Calligraphy' at a ceremony at the Nehru Centre Gallery - Mumbai. 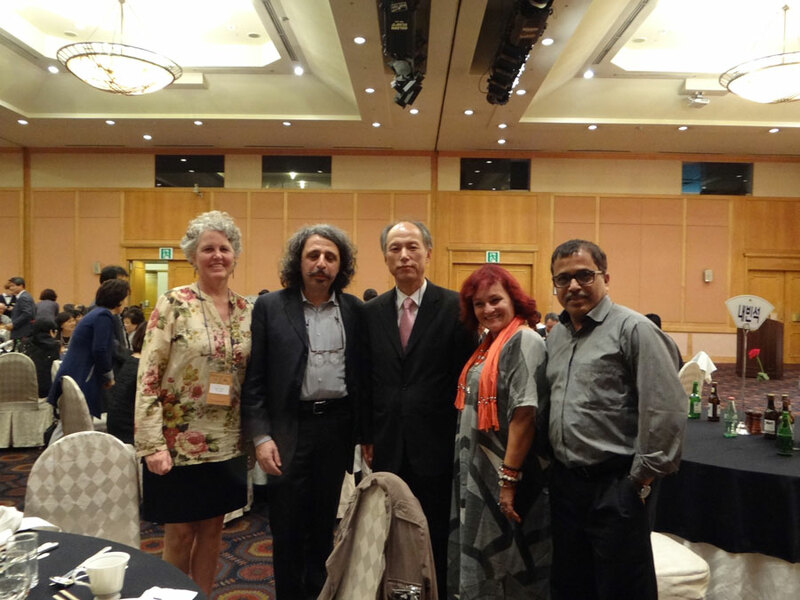 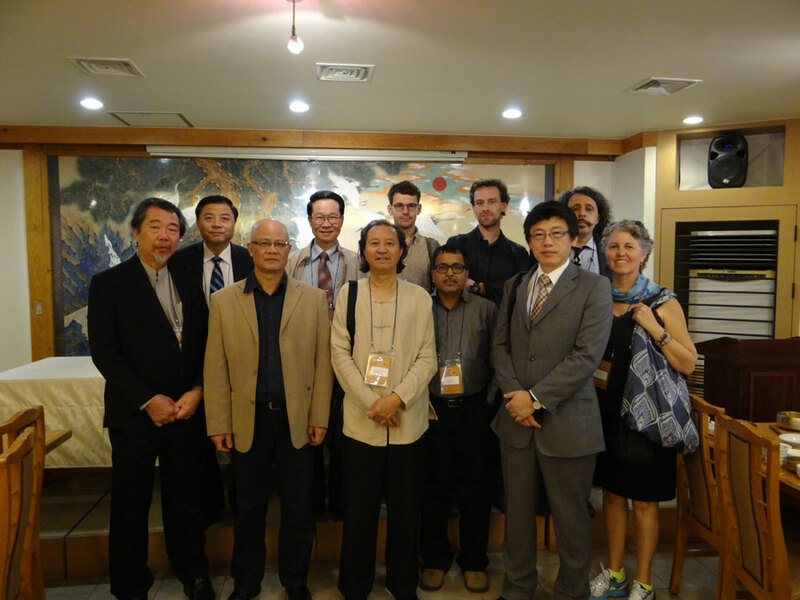 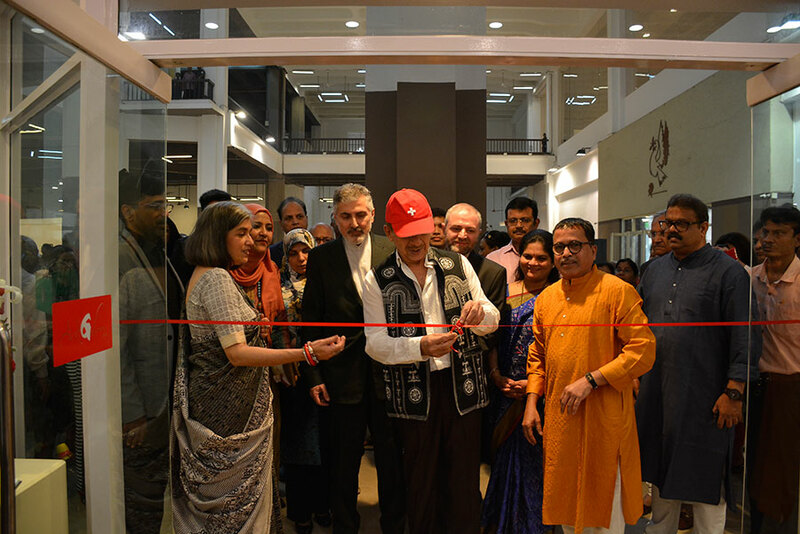 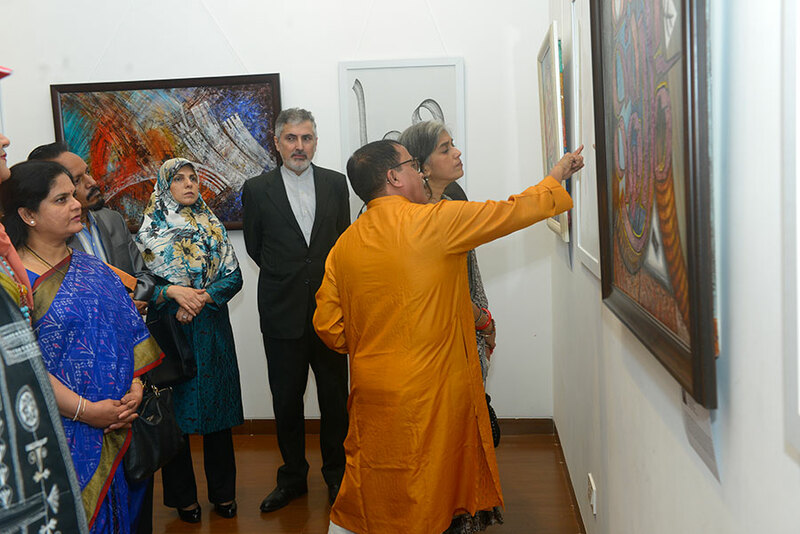 It laid the base for artistic ties between the two countries. 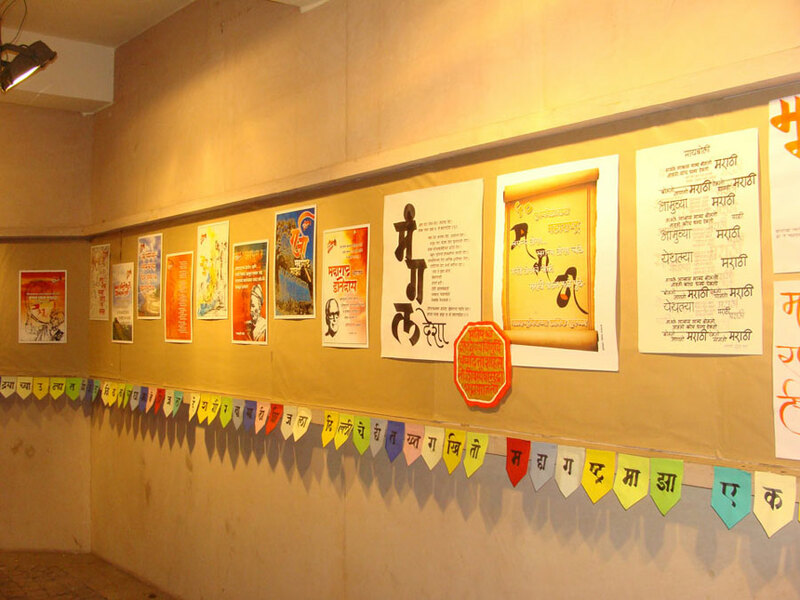 This friendship has flourished over the years & a lot of fusion work of Indian & German scripts has evolved. 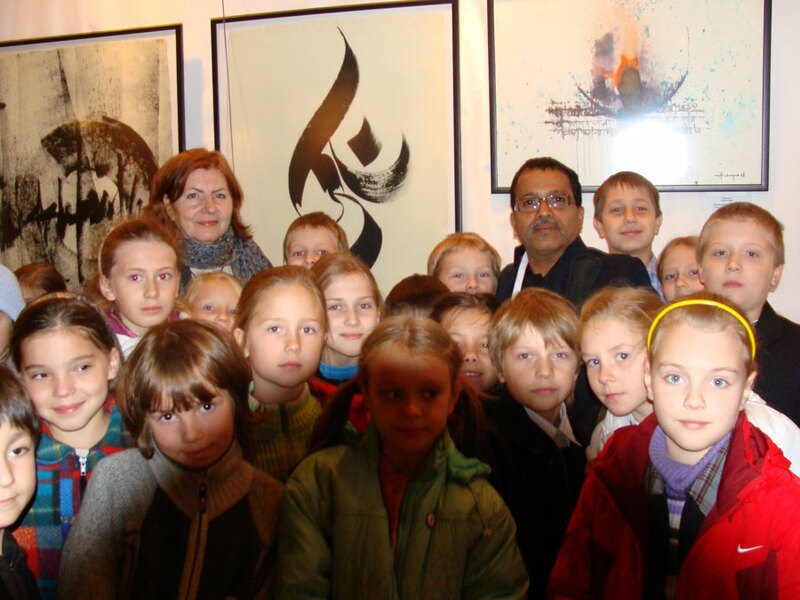 The year 2011 marks the 25th year of a friendship & also a milestone in the artistic & calligraphic companionship of India & Germany. 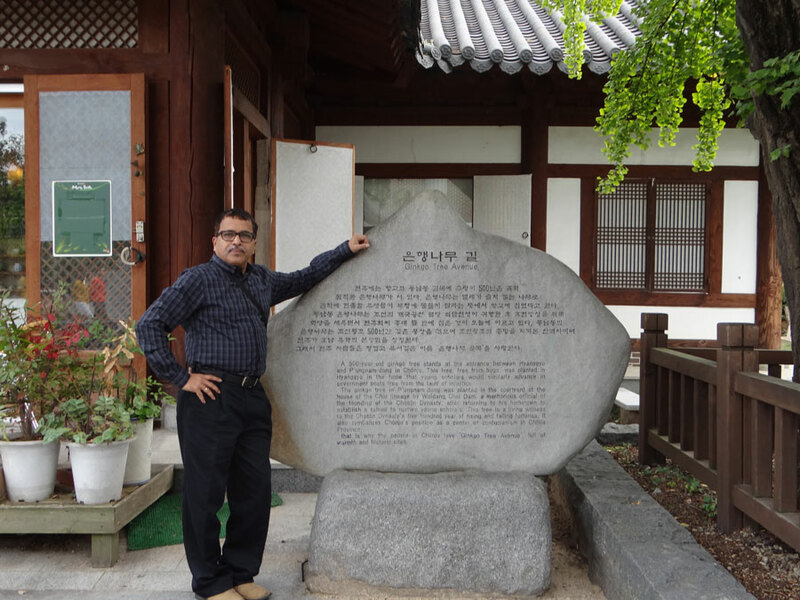 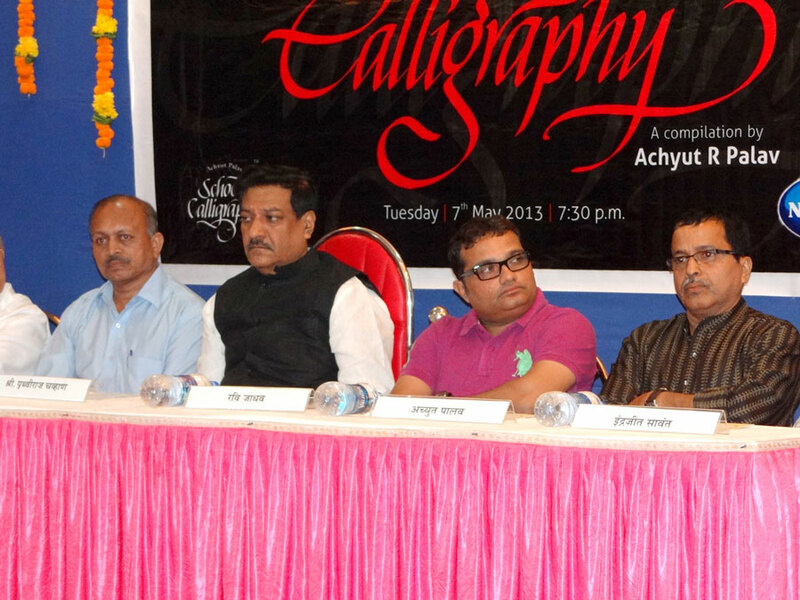 It was 25 years ago that Achyut Palav had visited Germany & worked with eminent calligraphers there. 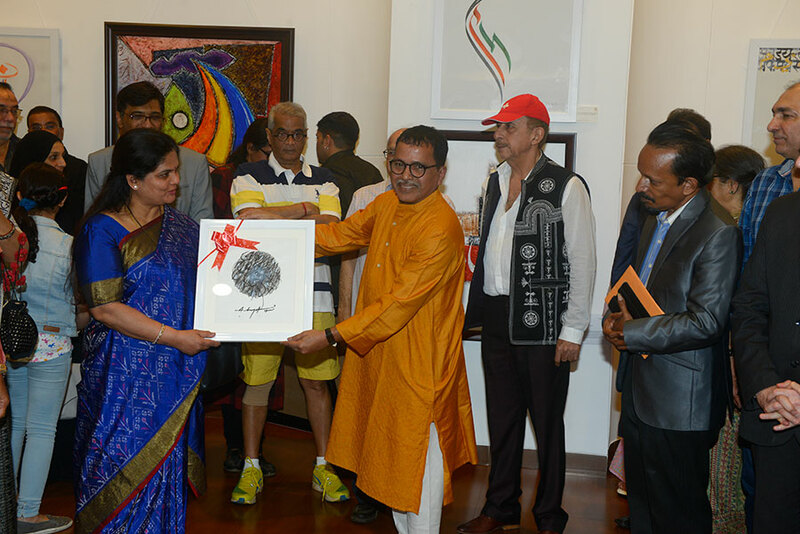 It laid the base for artistic ties between the two countries. 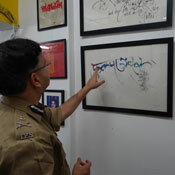 This friendship has flourished over the years & a lot of fusion work of Indian & German scripts has evolved. 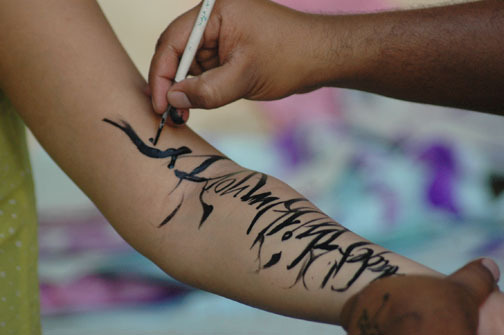 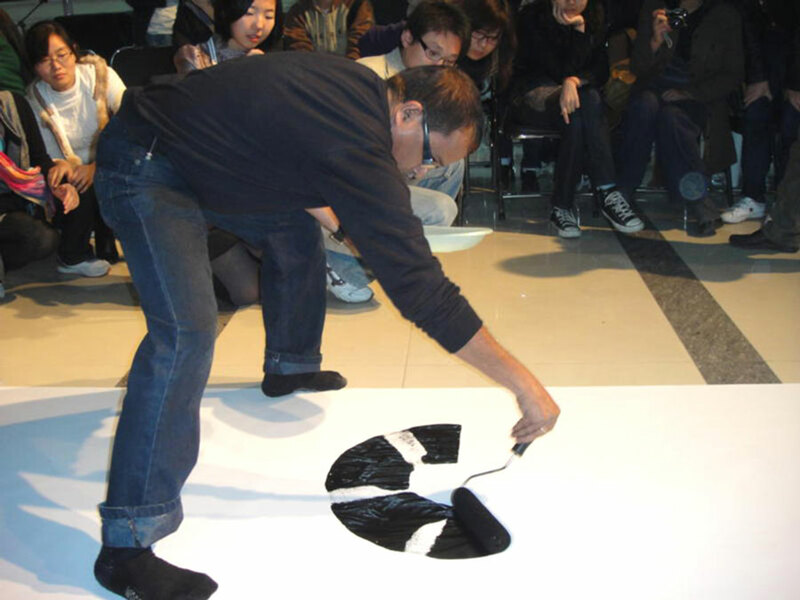 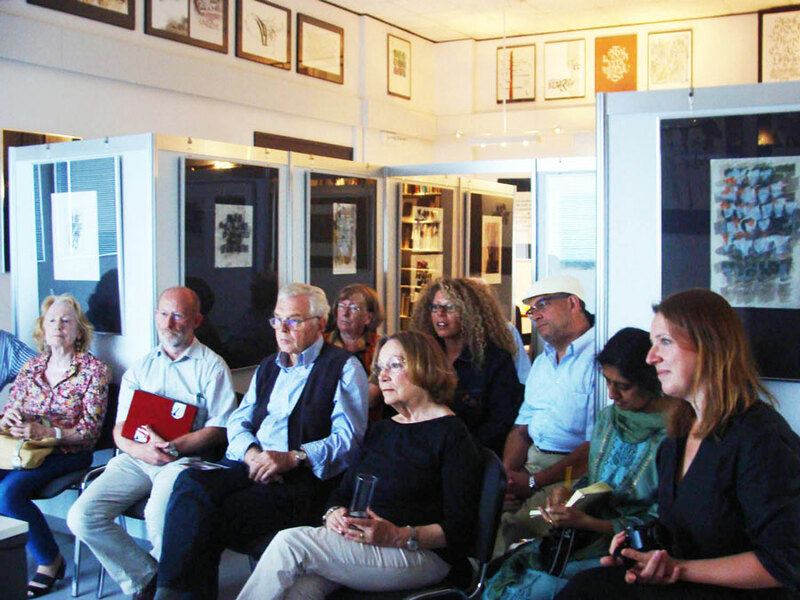 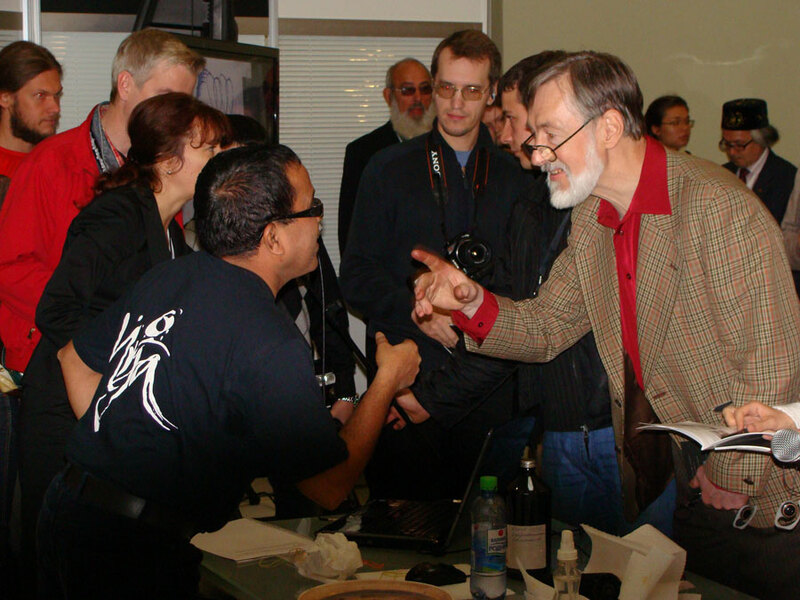 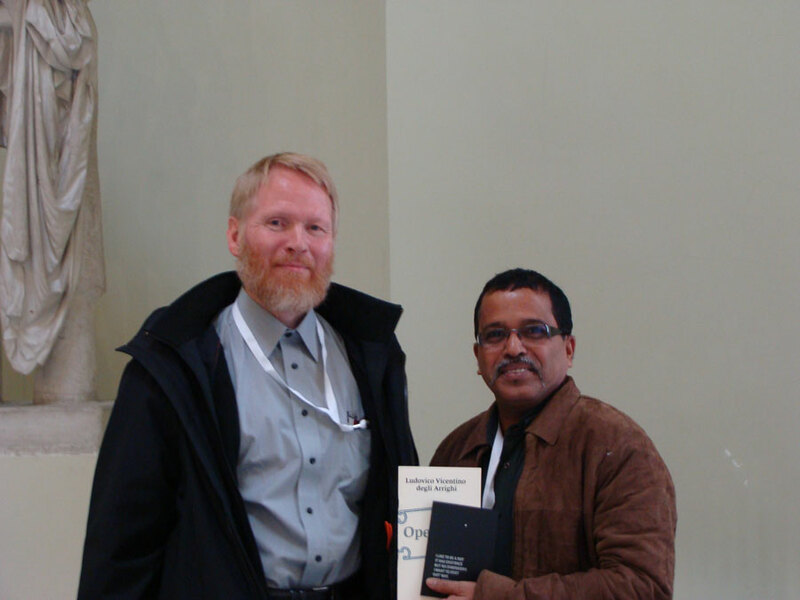 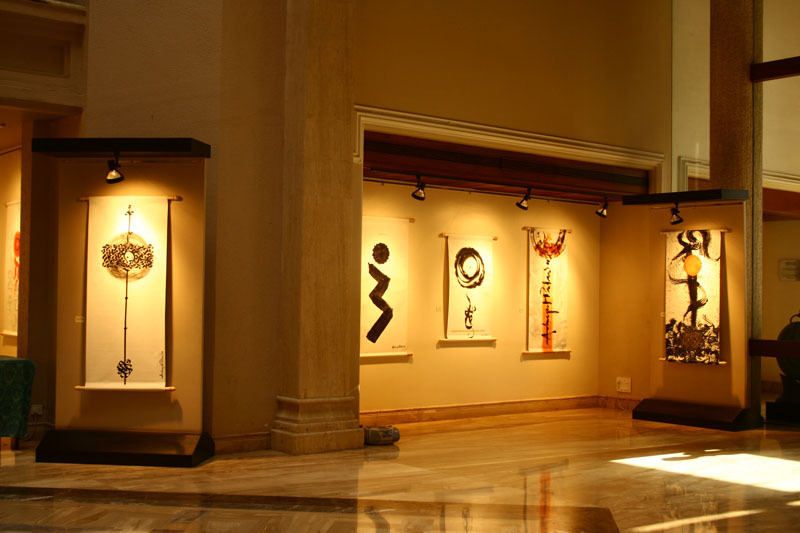 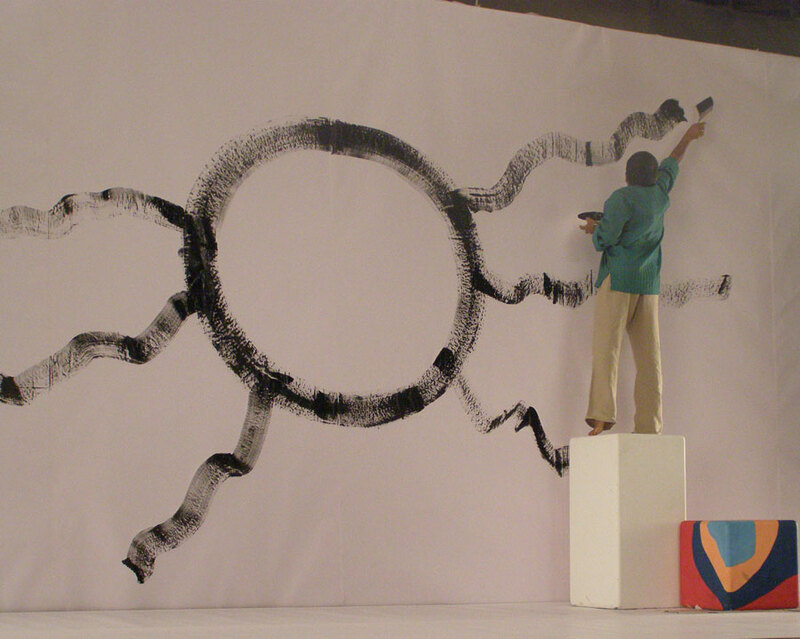 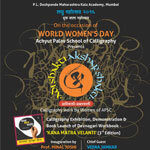 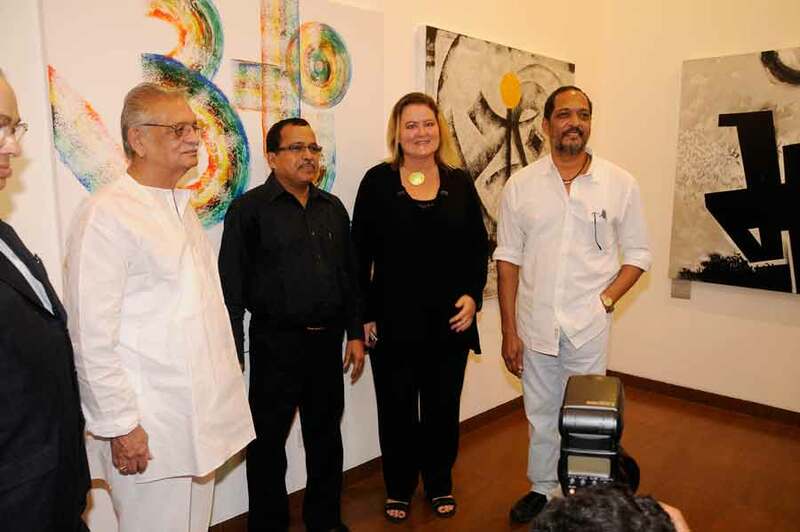 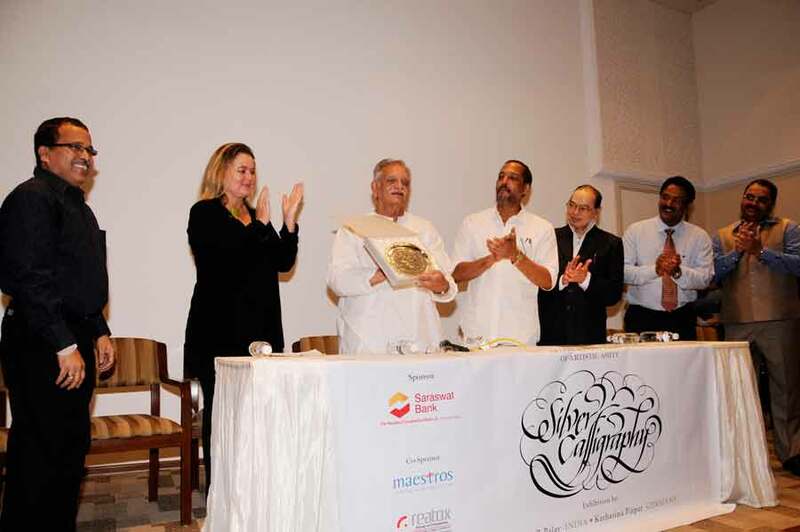 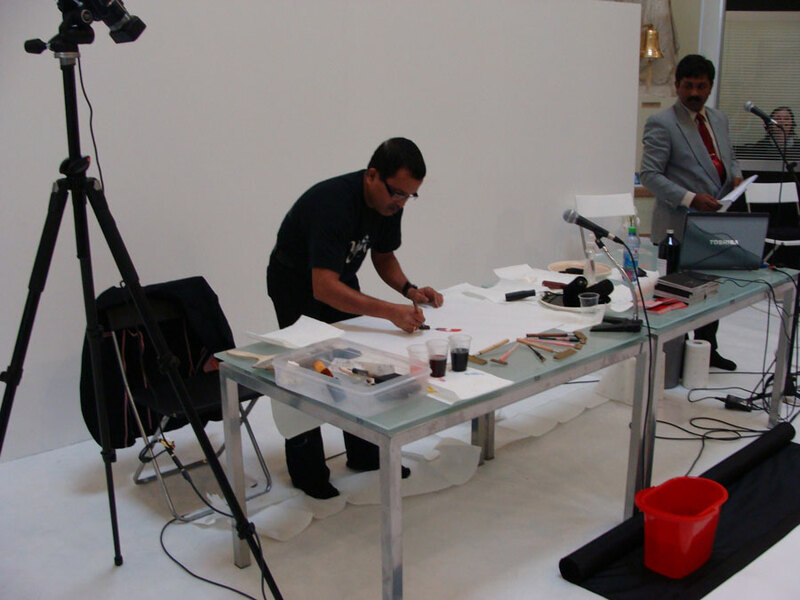 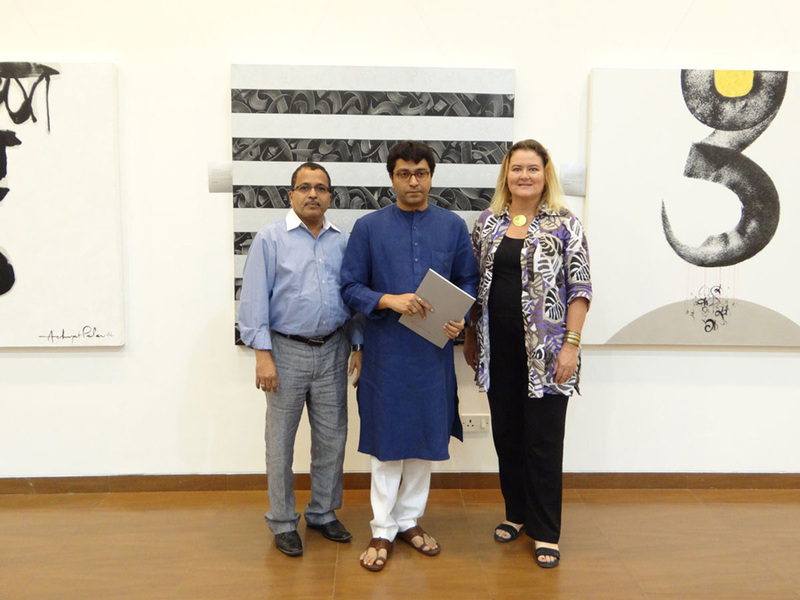 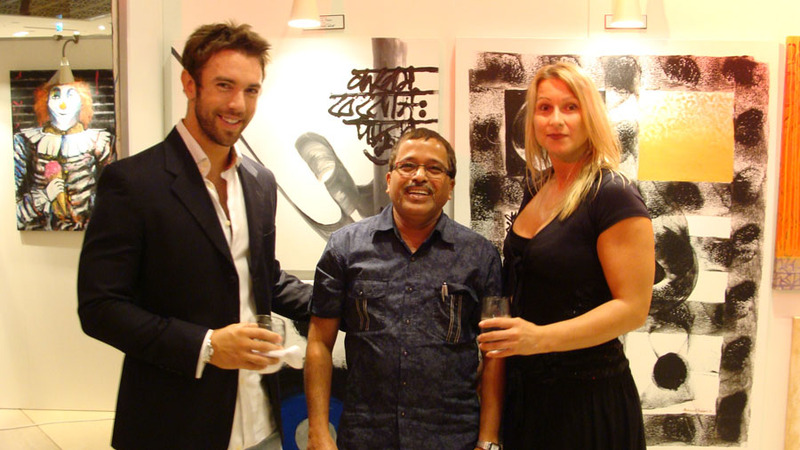 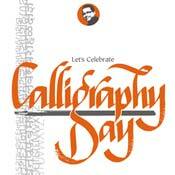 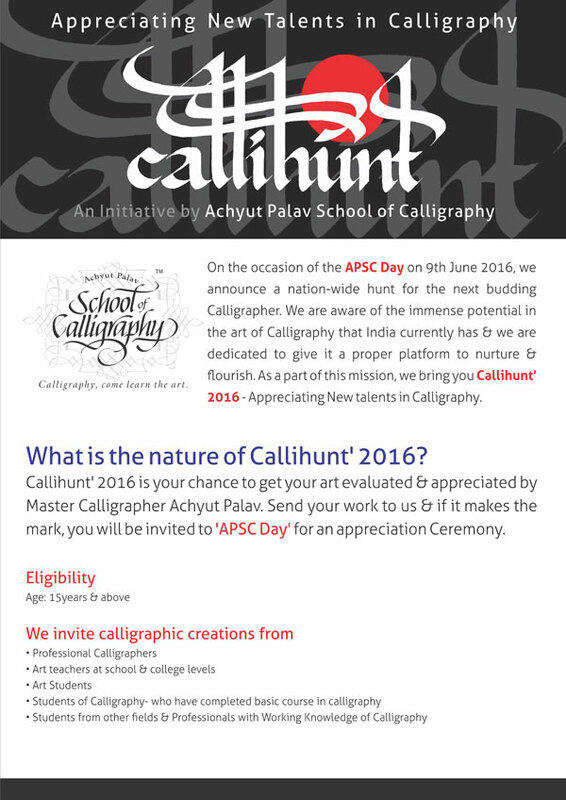 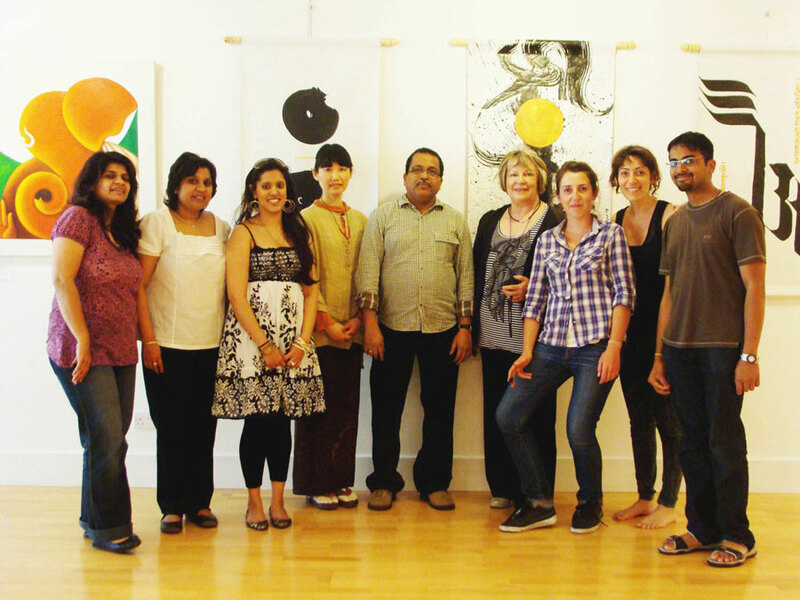 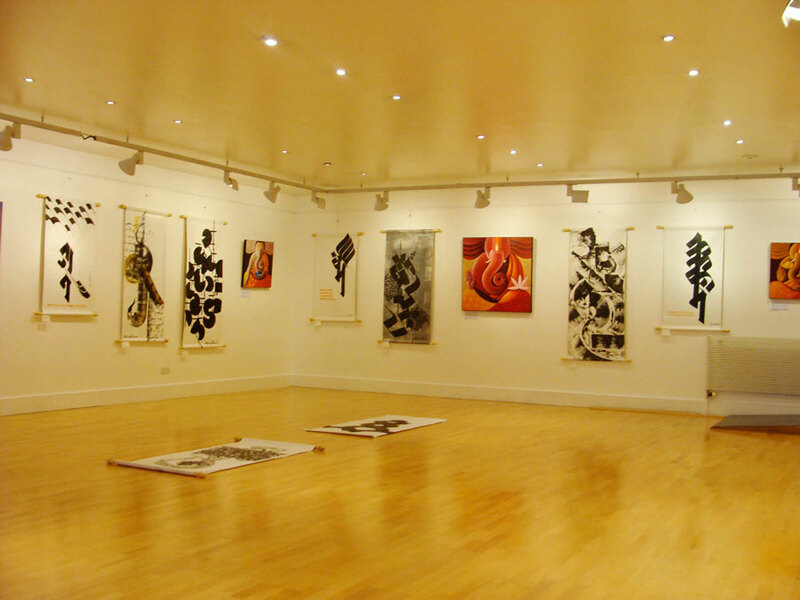 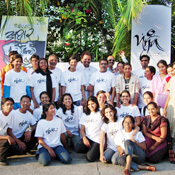 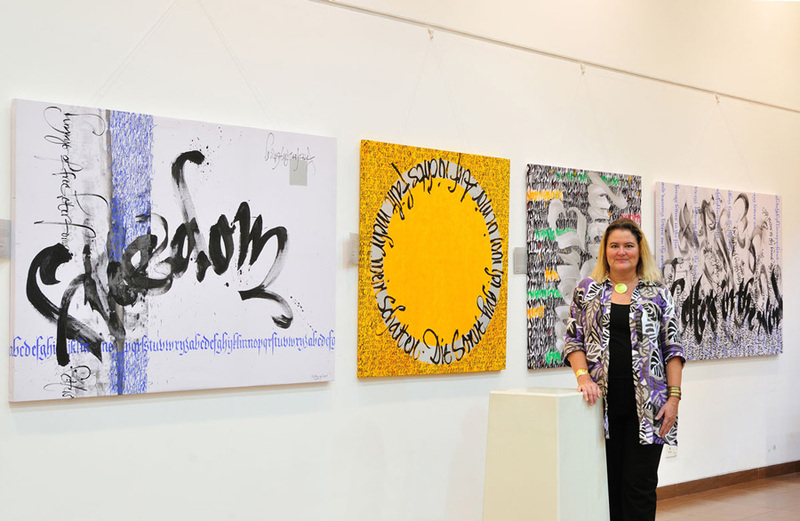 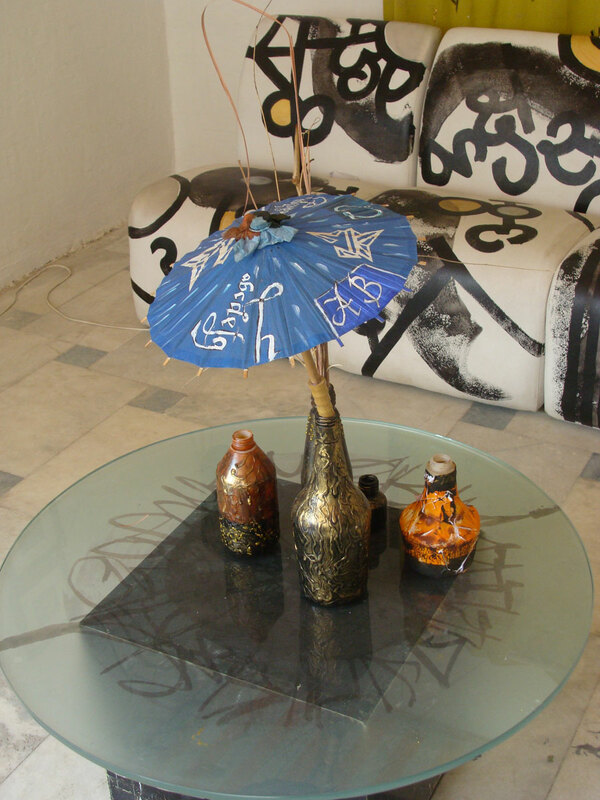 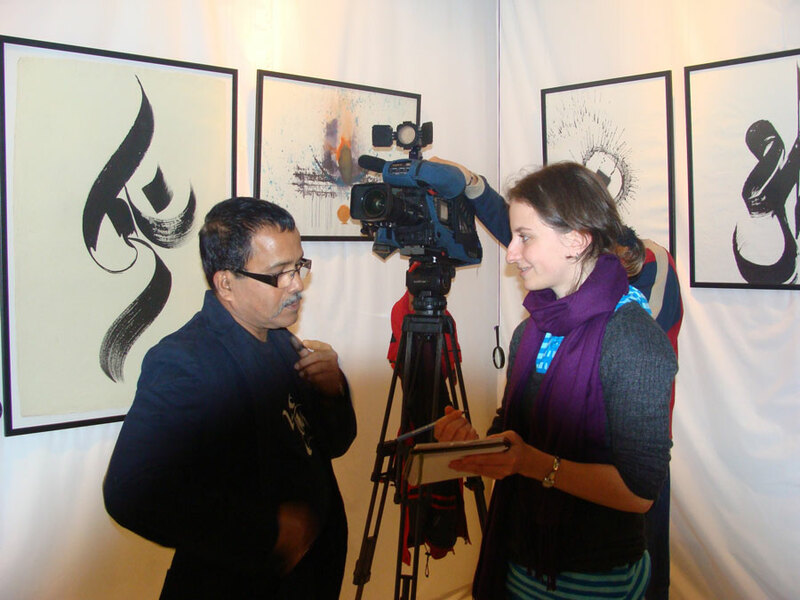 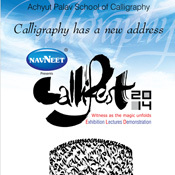 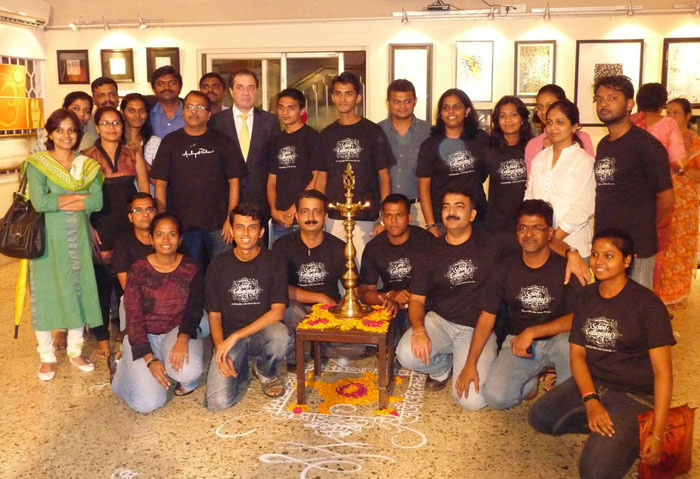 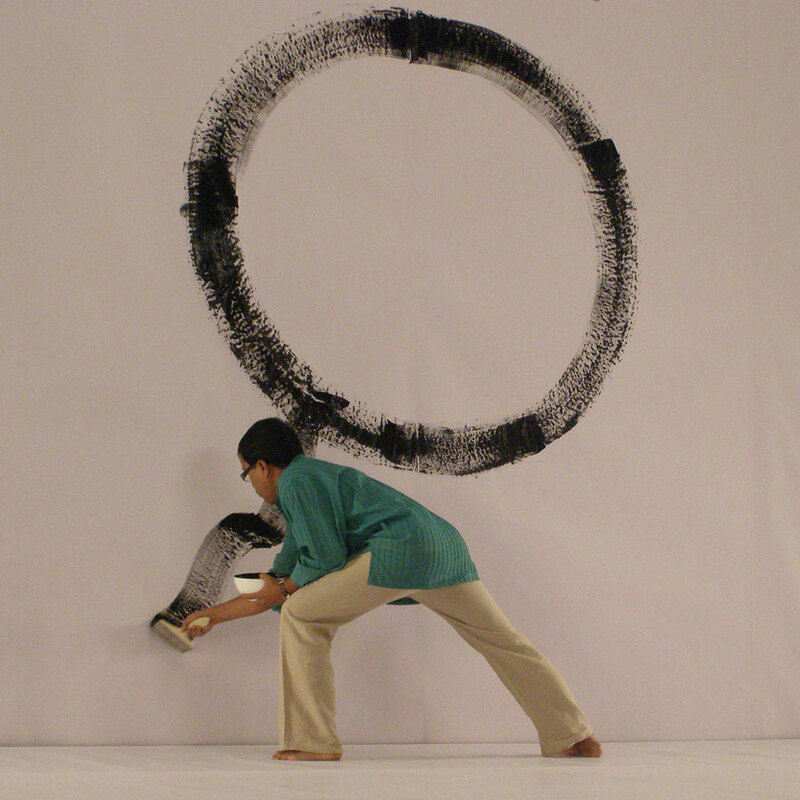 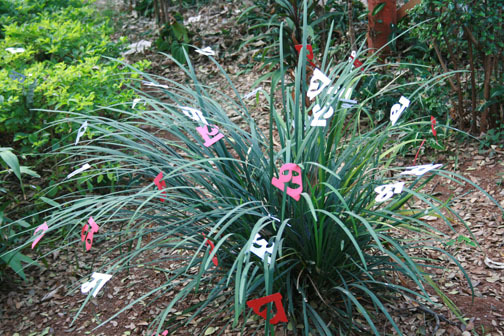 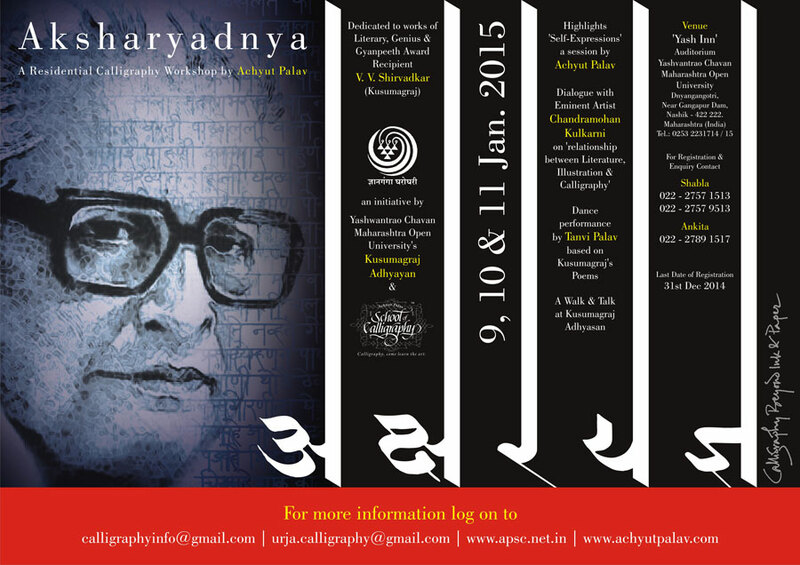 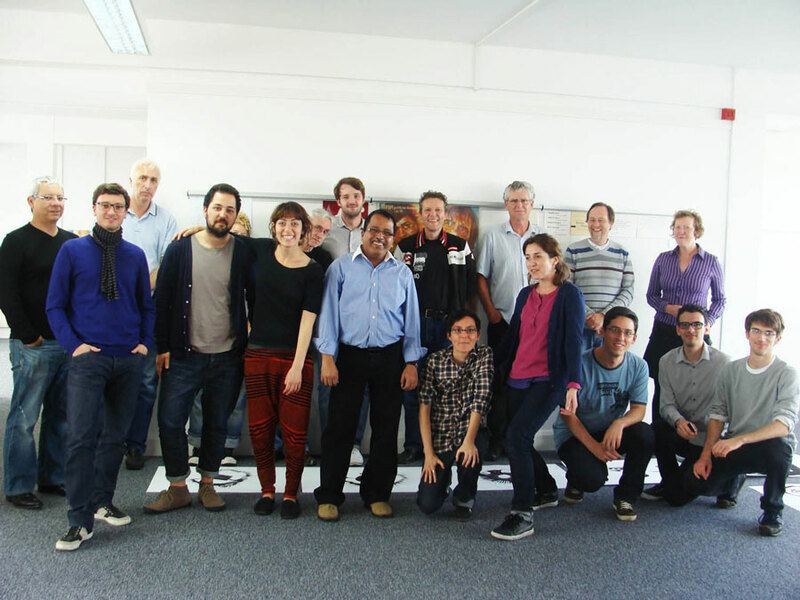 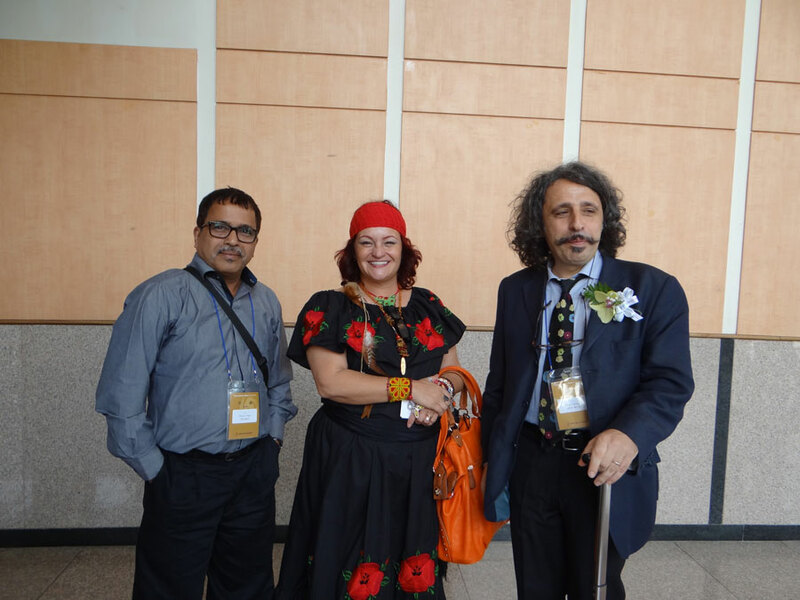 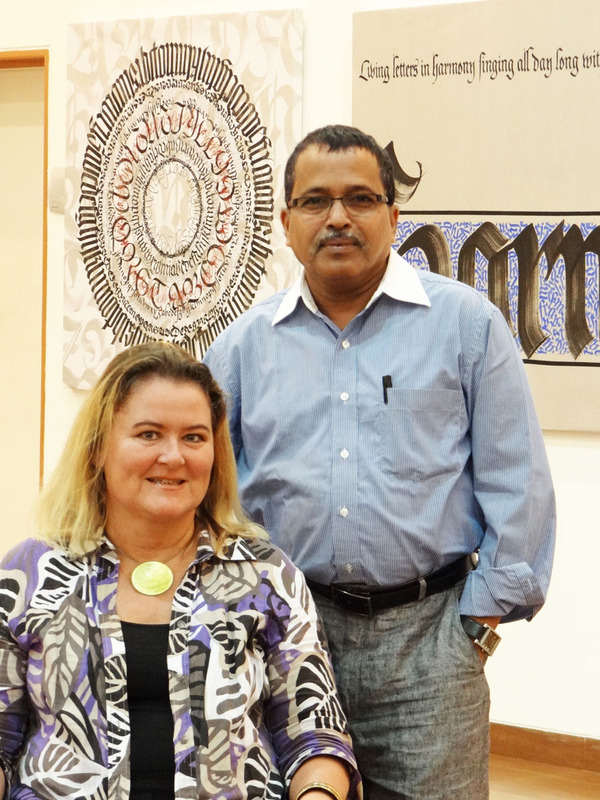 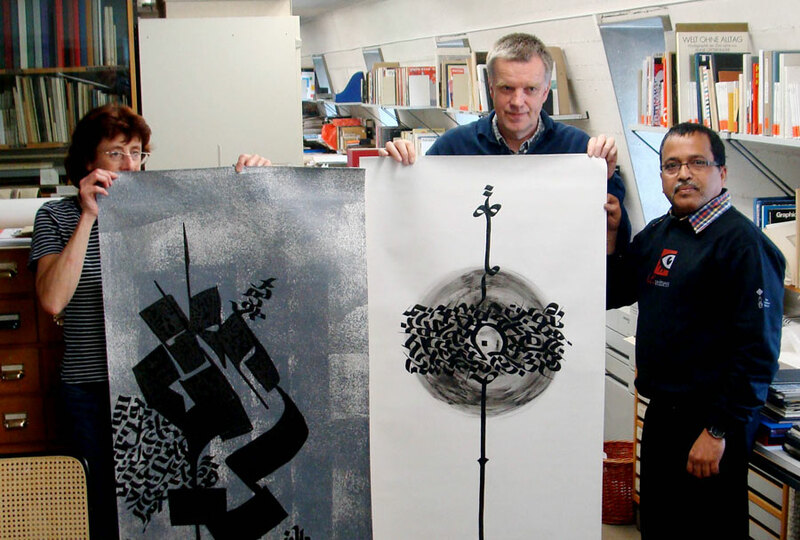 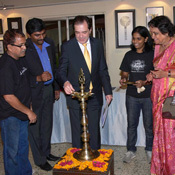 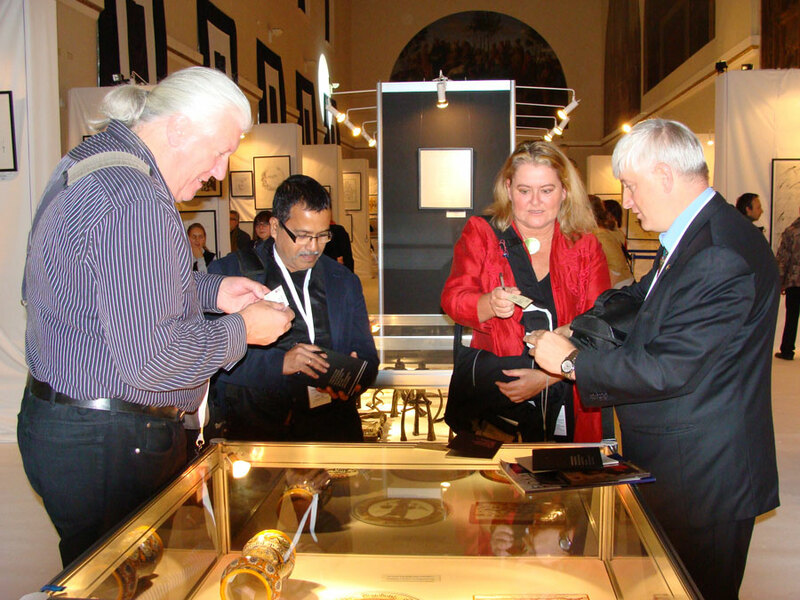 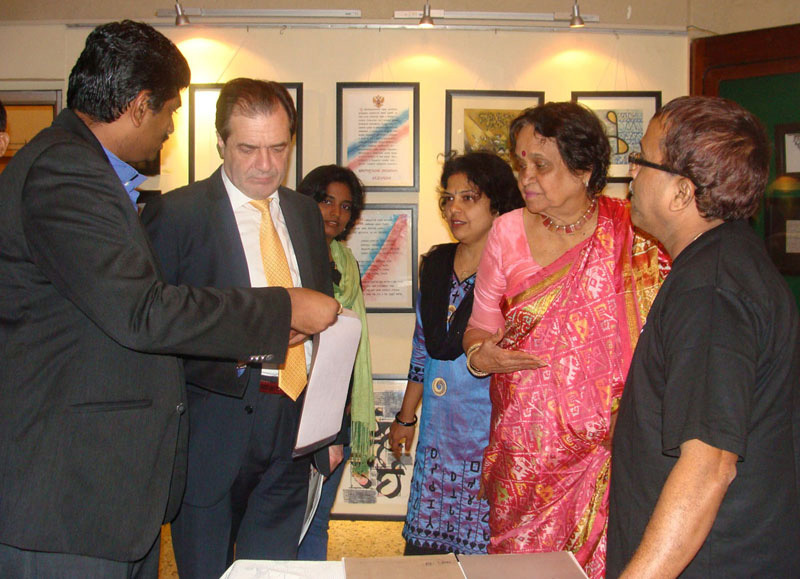 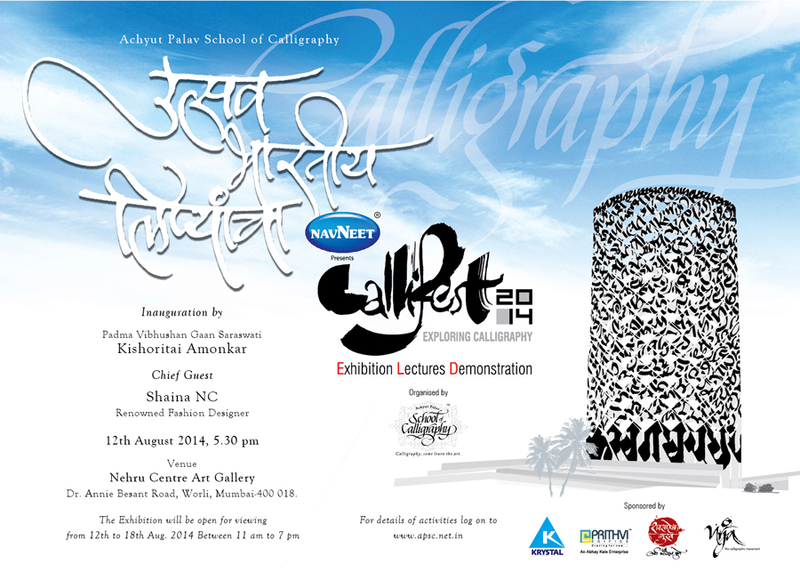 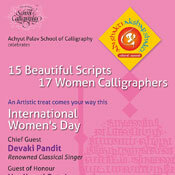 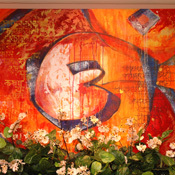 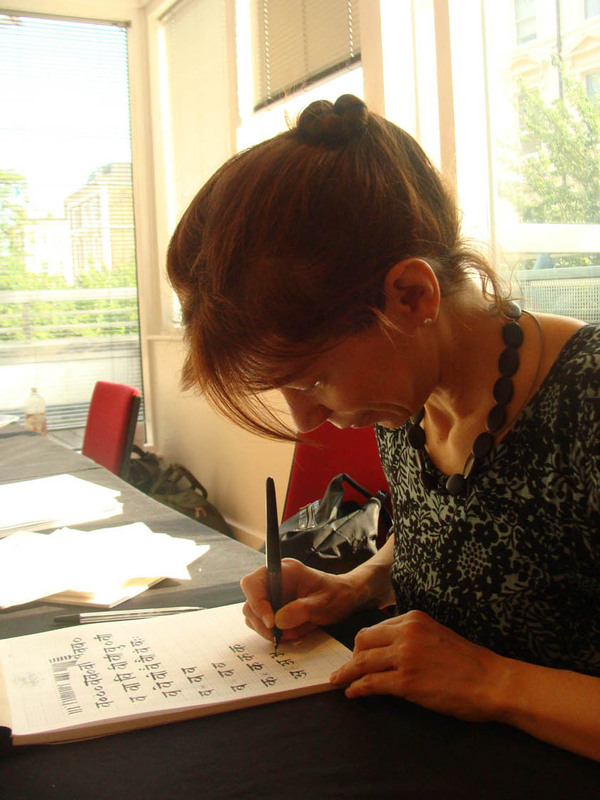 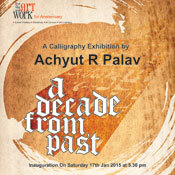 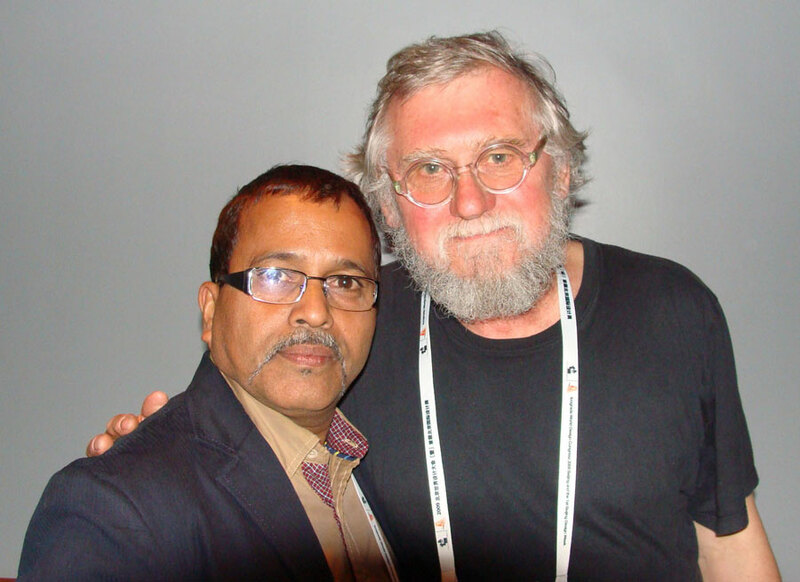 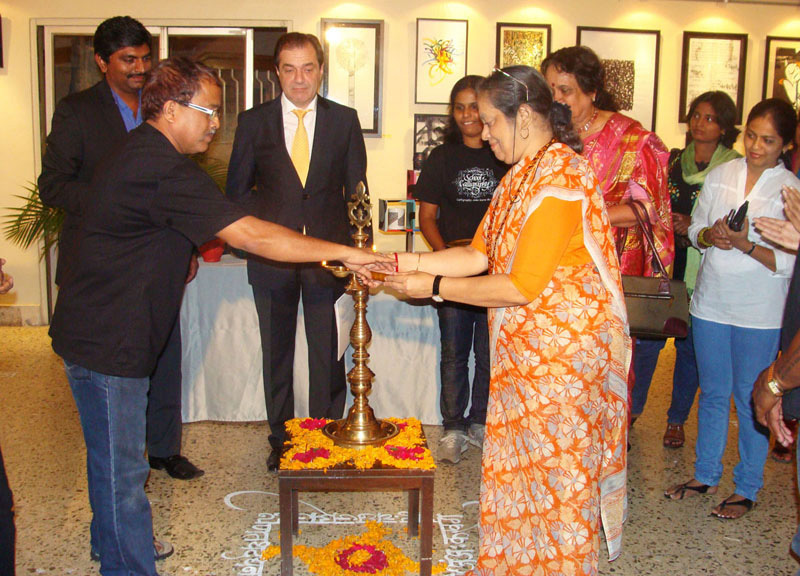 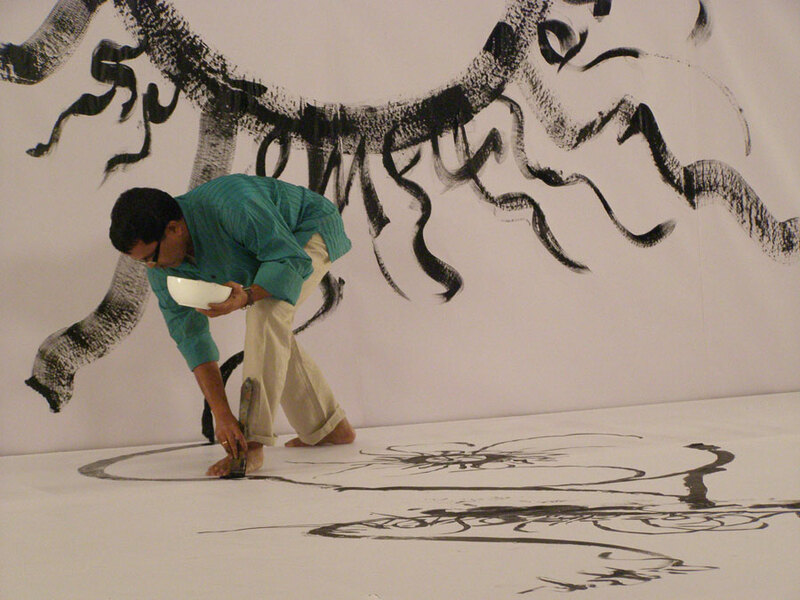 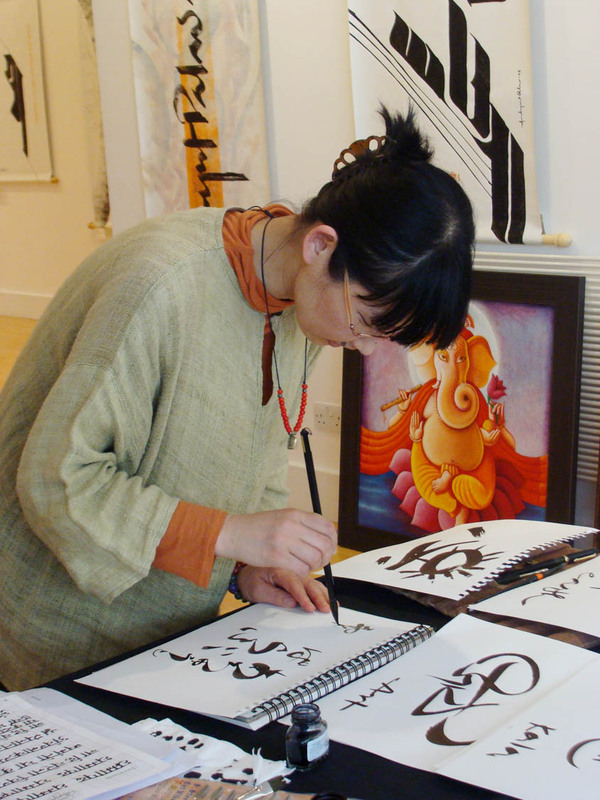 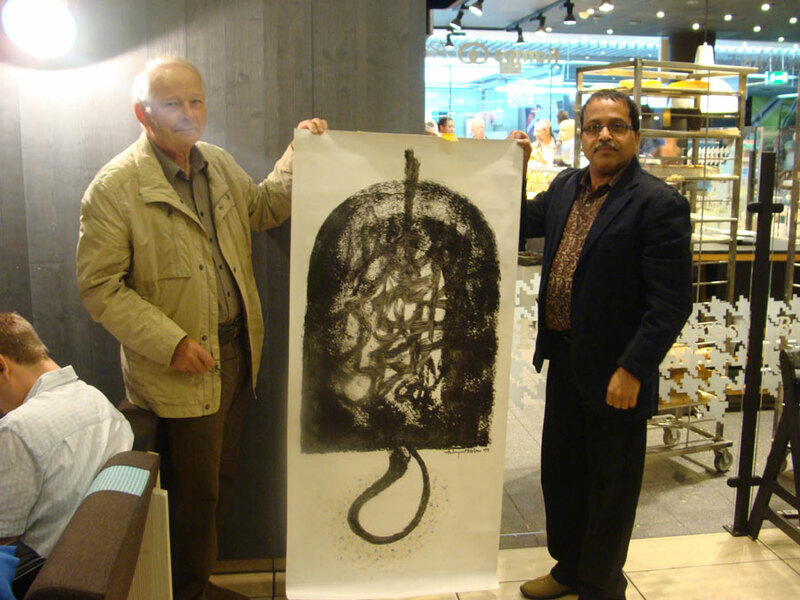 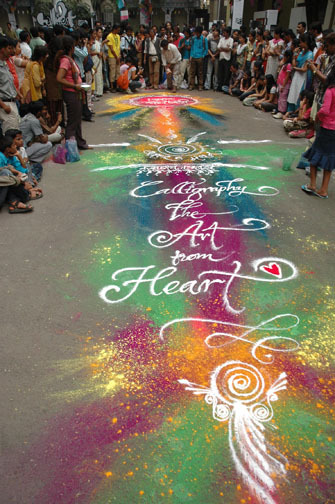 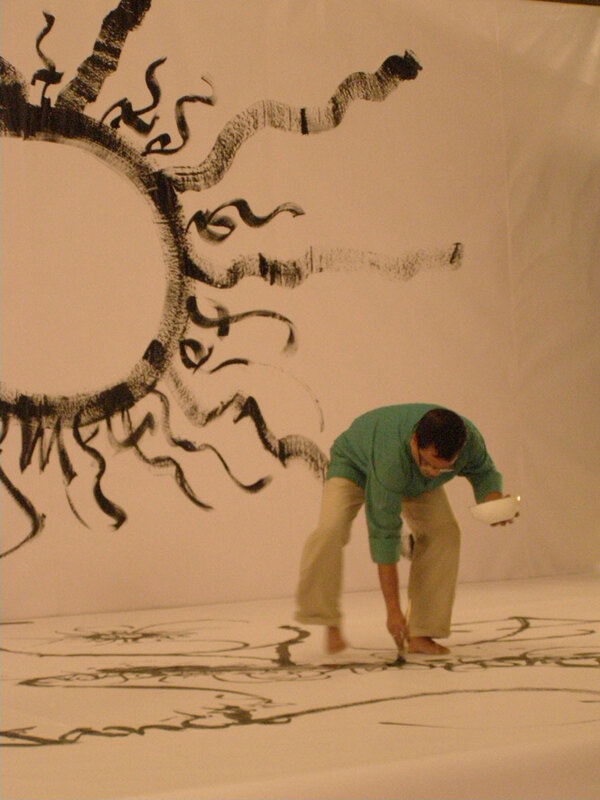 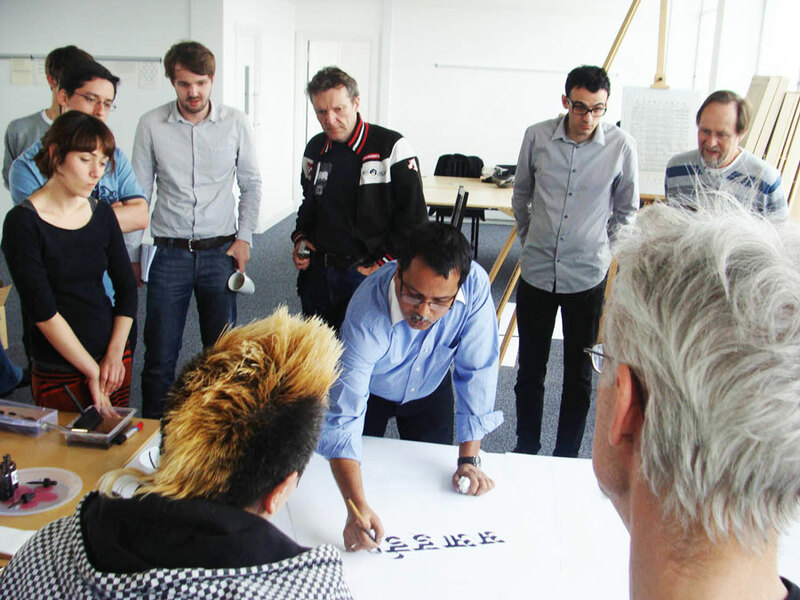 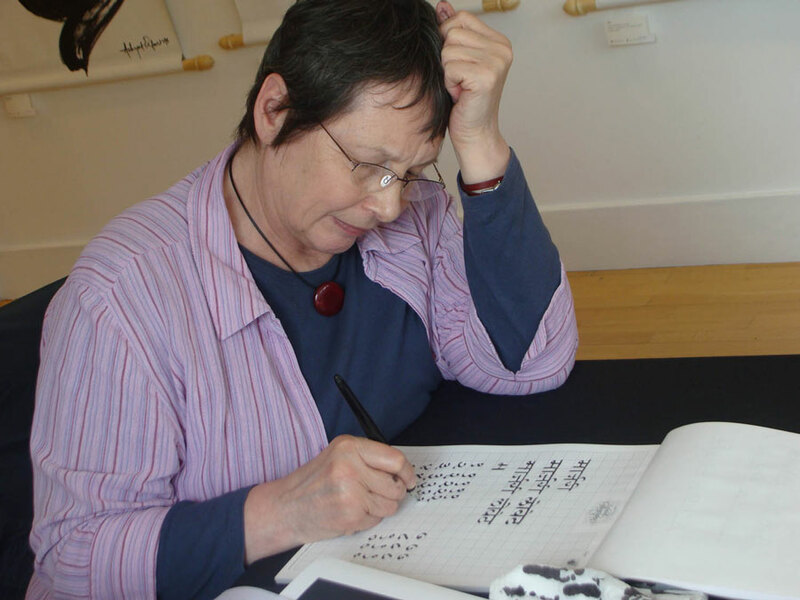 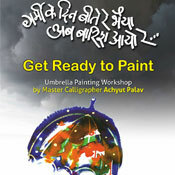 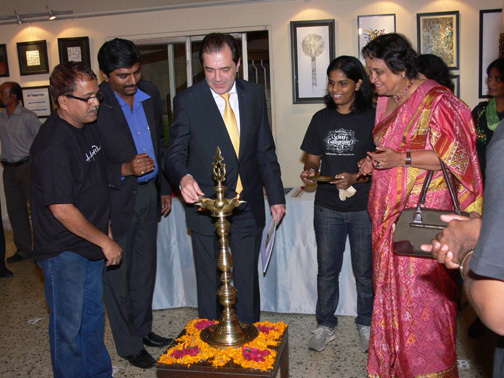 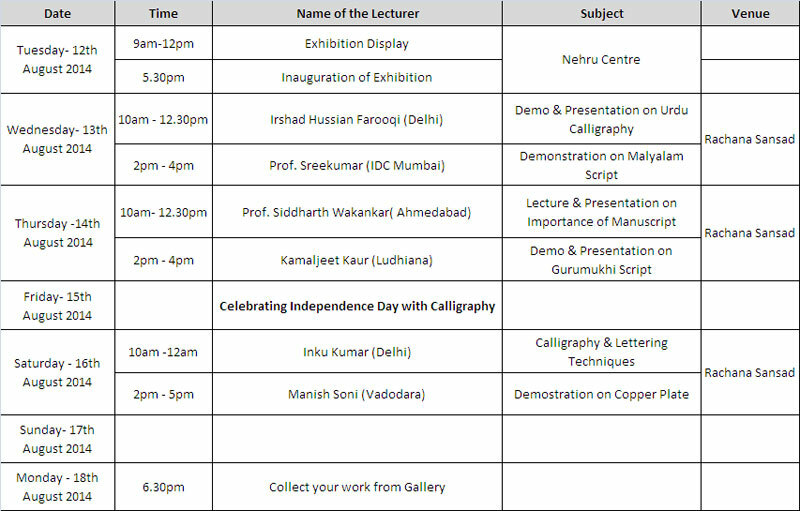 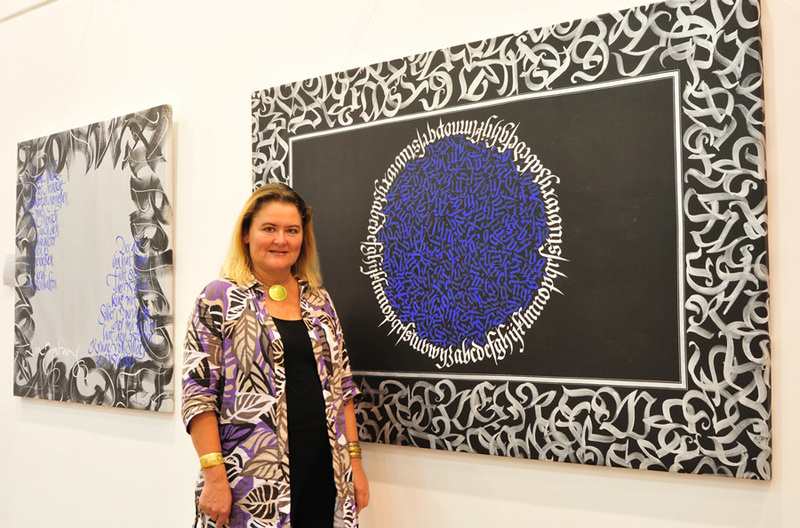 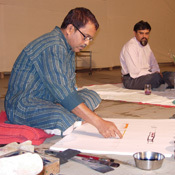 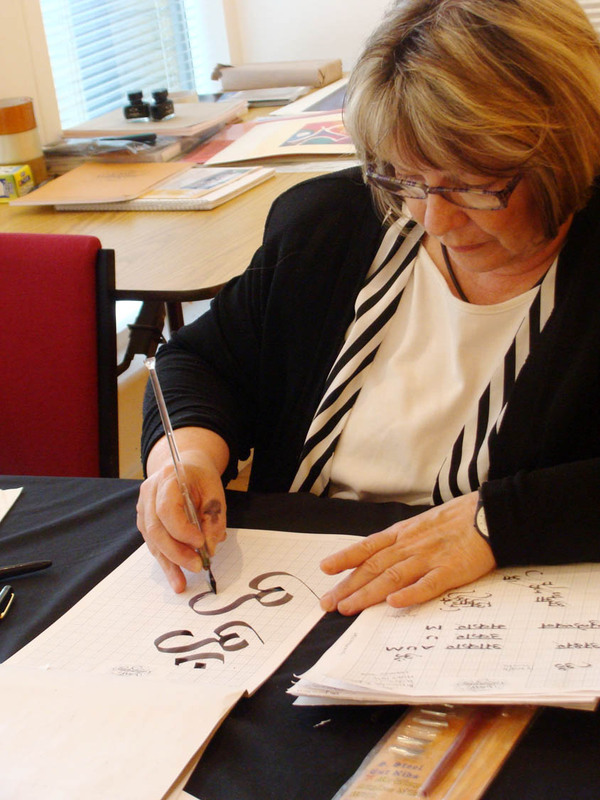 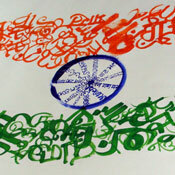 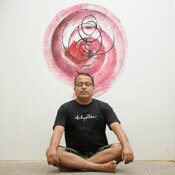 Achyut Palav along with a noted calligrapher from Germany, Katharina Pieper, plans to have a special event in 2011. 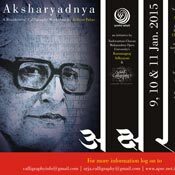 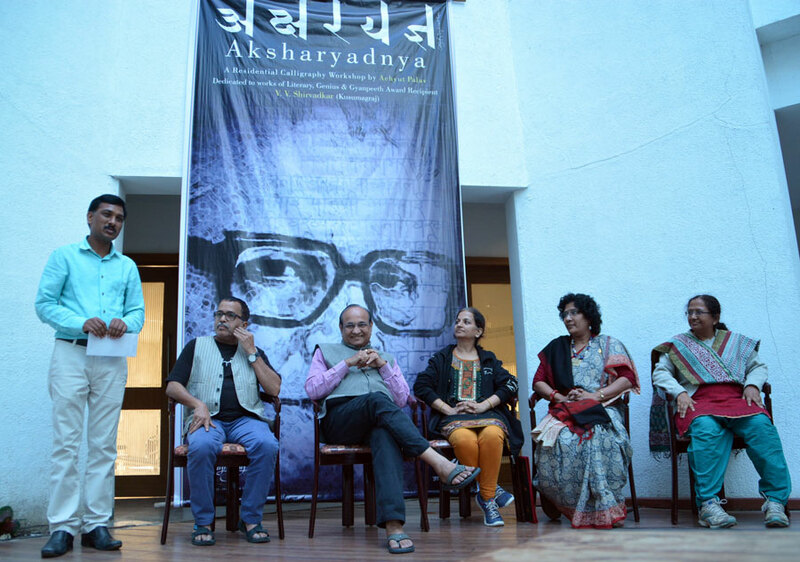 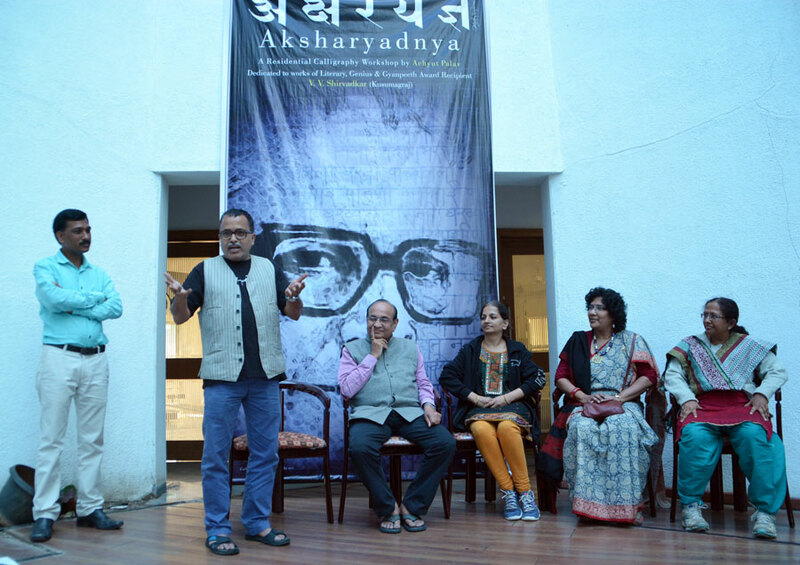 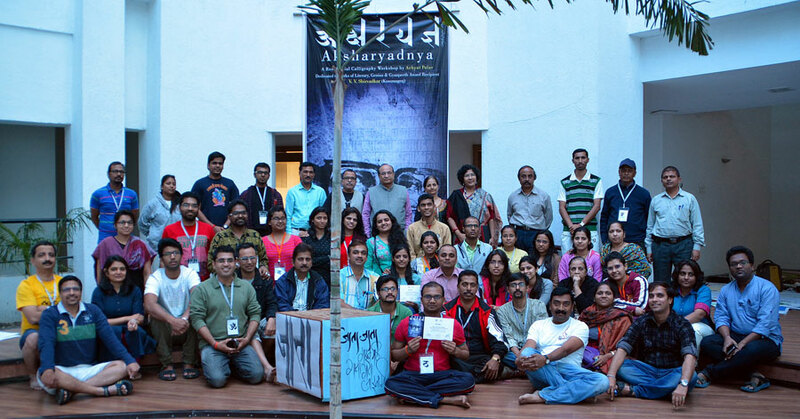 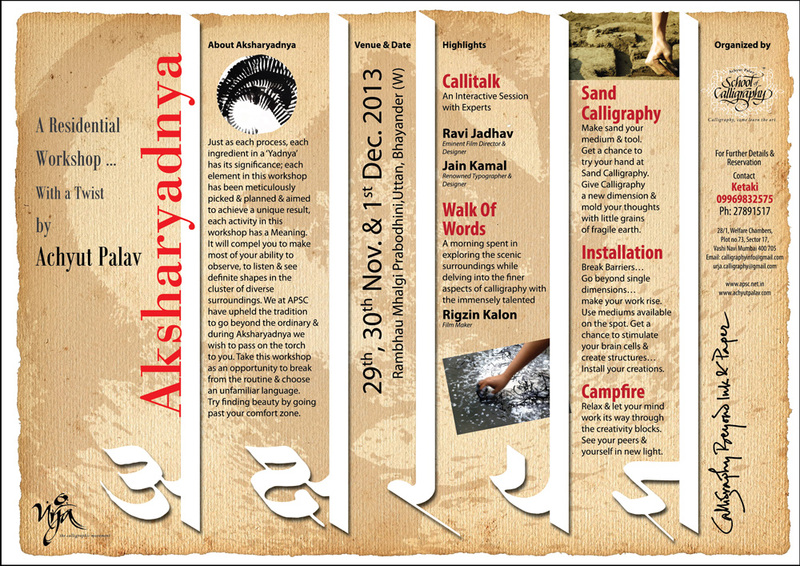 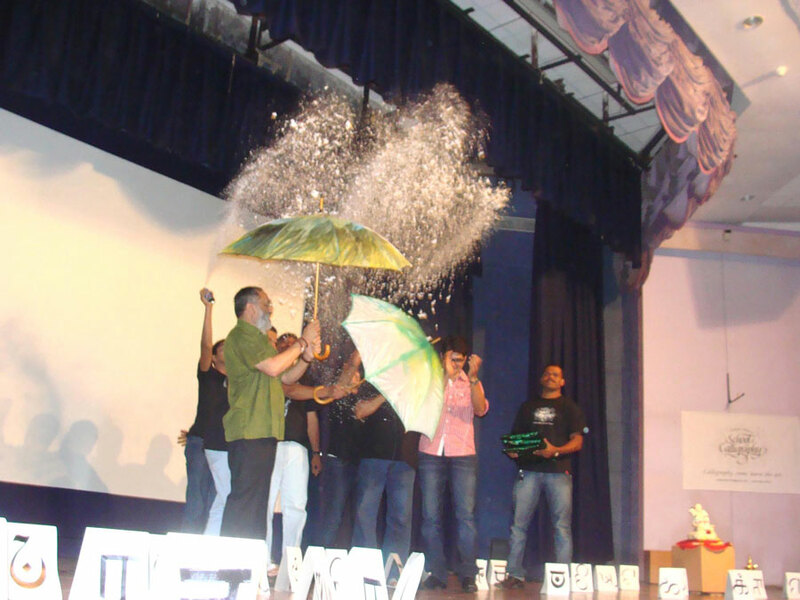 Akasharotsav - as the name goes was truly a celebration of letters. 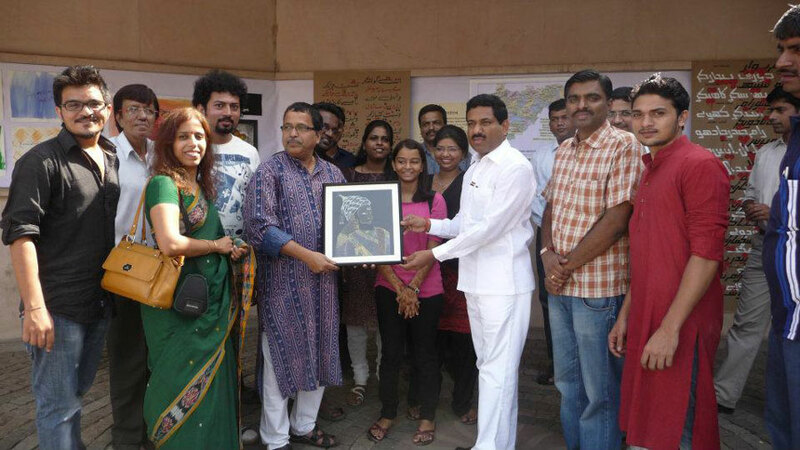 This 2 day workshop & exhibition of student's works saw the presence of eminent industrialist Mr. Kirloskar & noted singer Arti Anklikar. 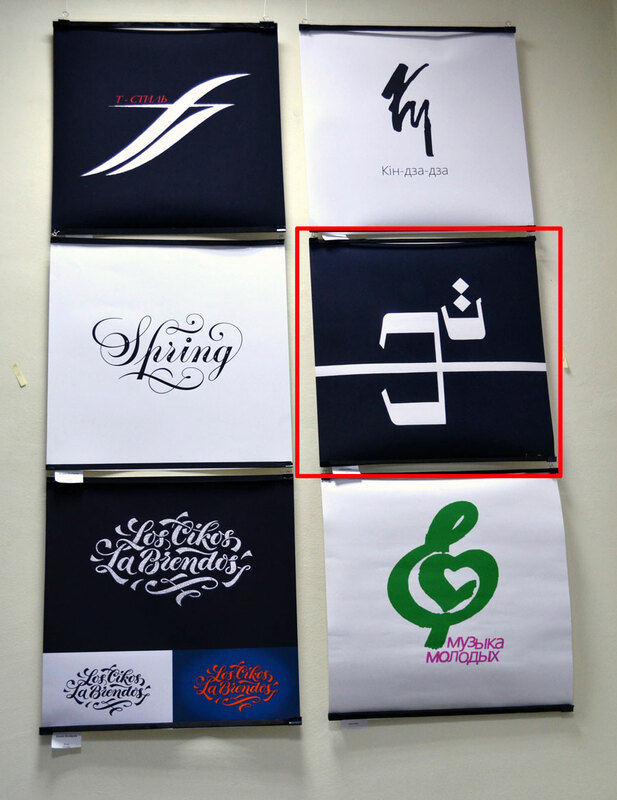 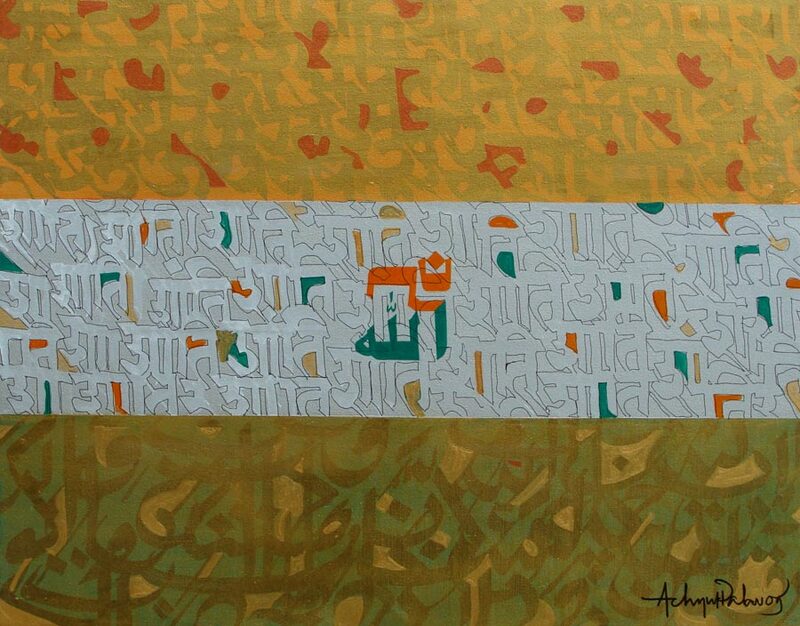 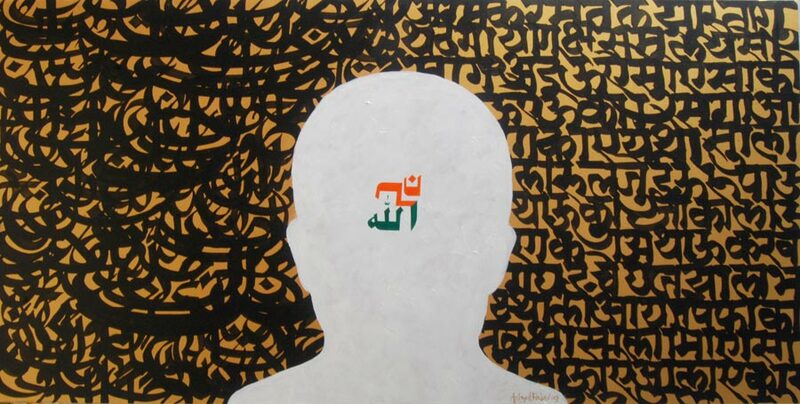 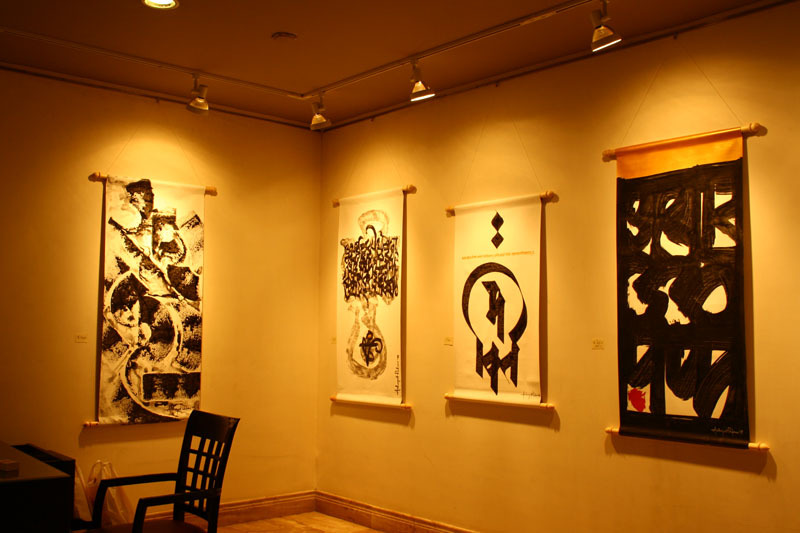 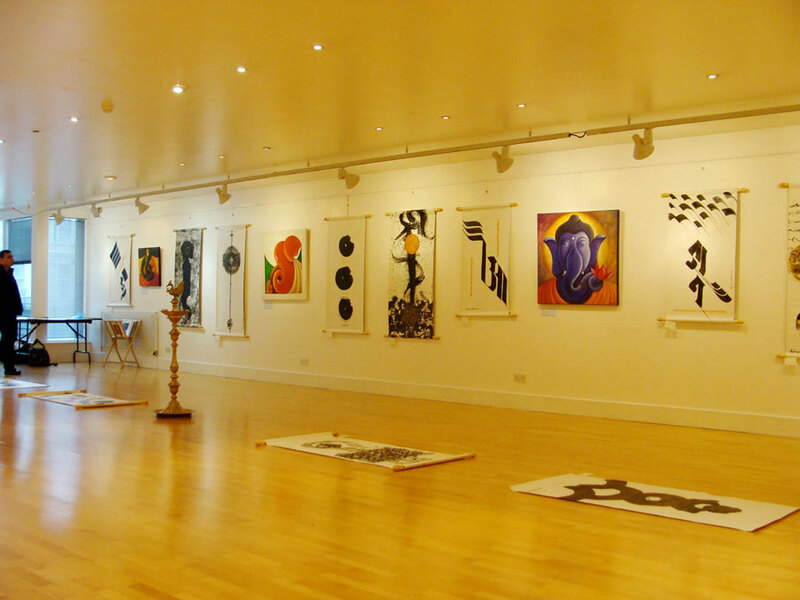 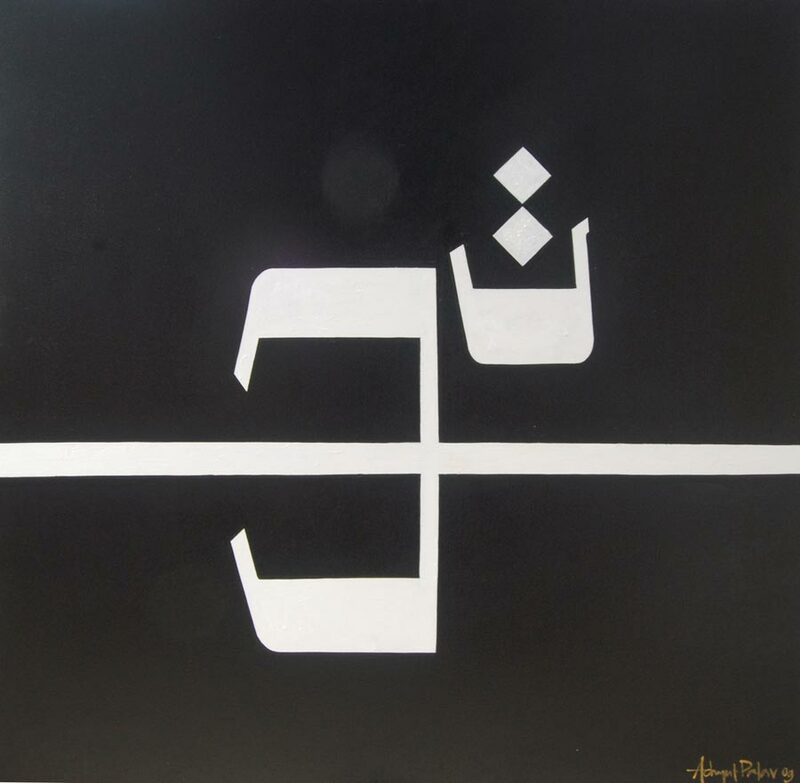 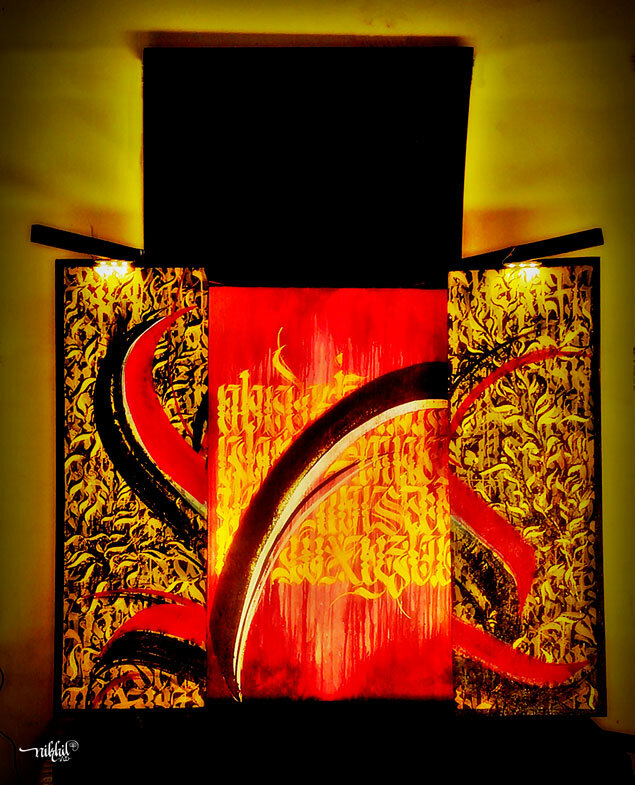 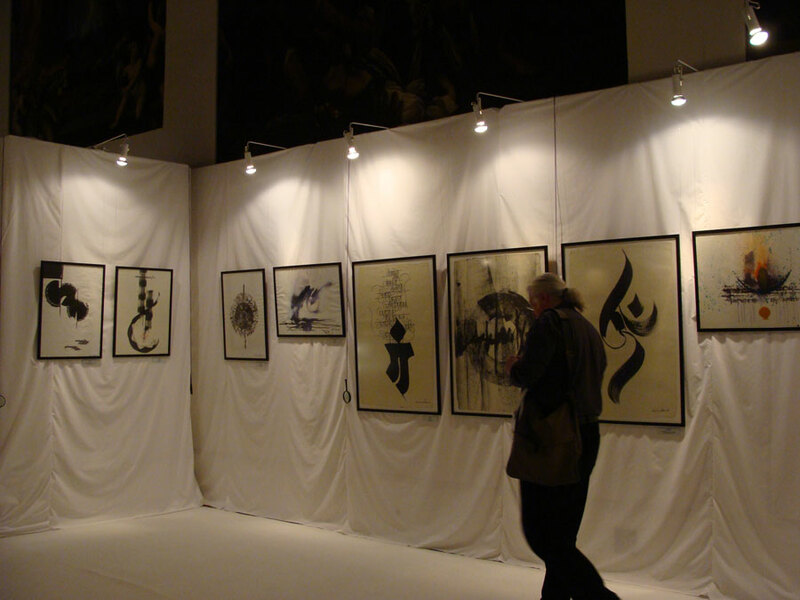 Calligraphic creations using the scroll or the traditional 'Khalita' as a medium were showcased in London. 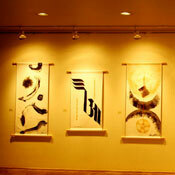 The term 'Calliscrolls' is coined from the phrase - Calligraphy on Scrolls. 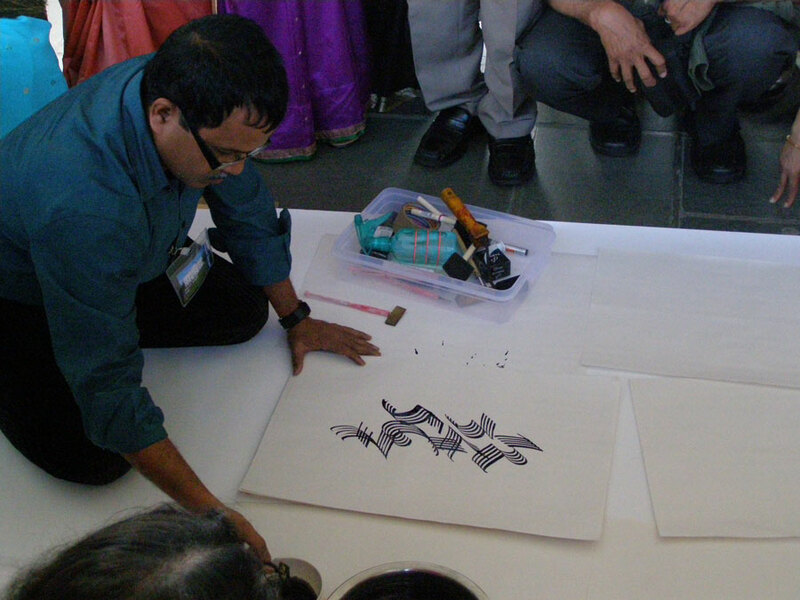 Indian calligraphy is much appreciated in the west. 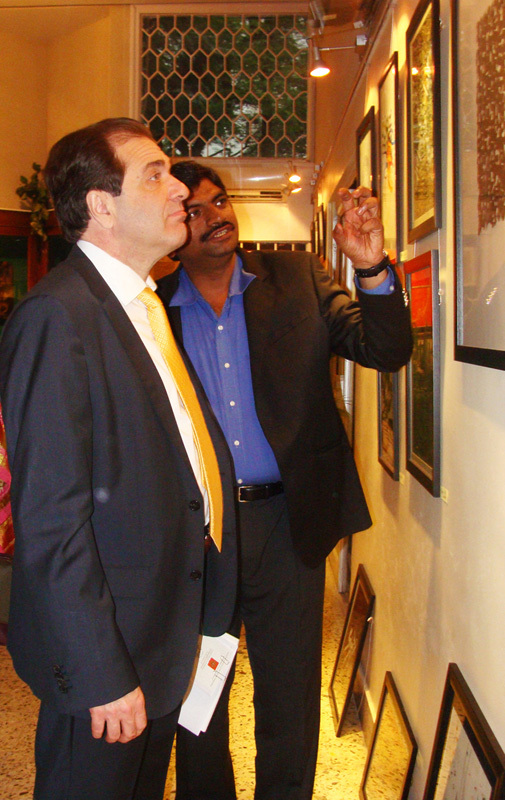 Its rich & ornate nature appeals the most to art patrons. 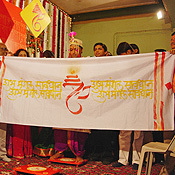 The compositions from scriptures & scripts are popular. 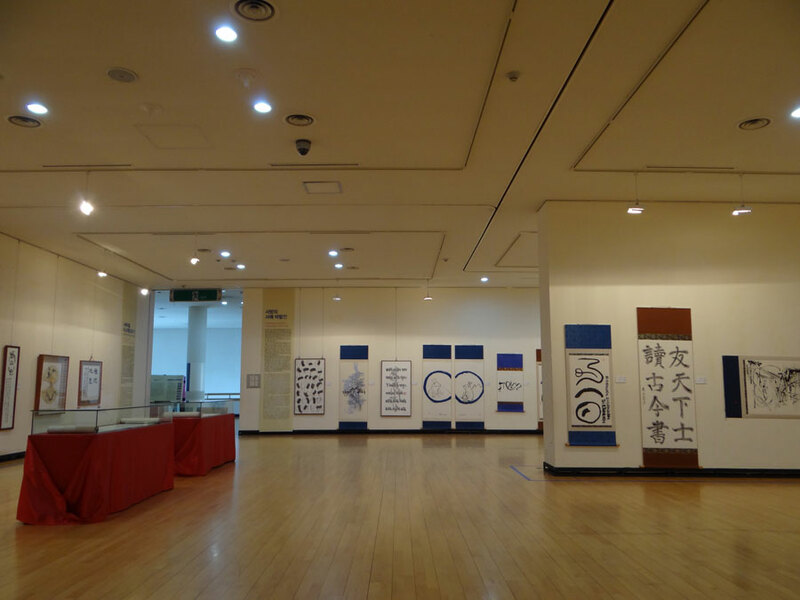 It showcased about 25 works of art. 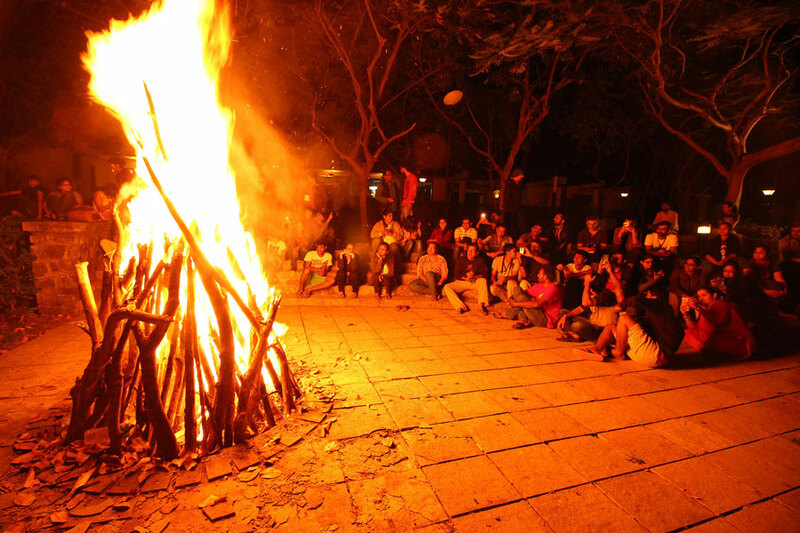 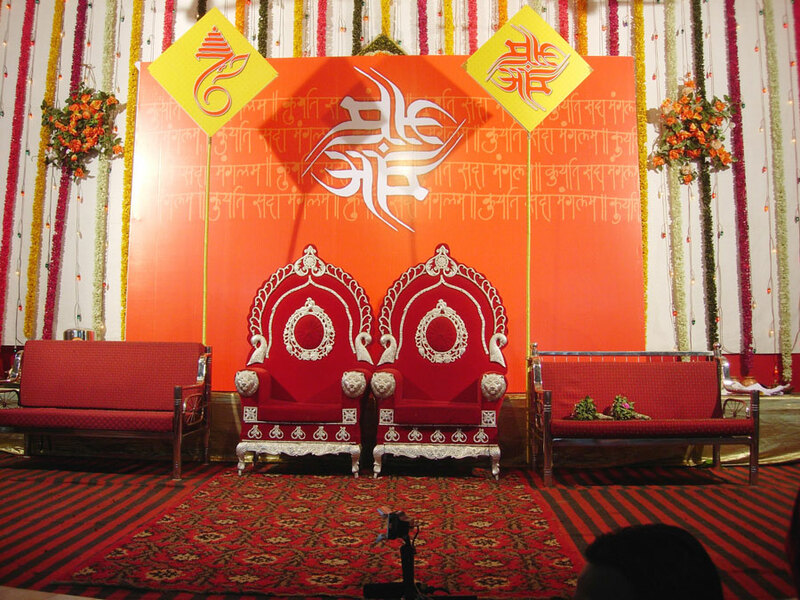 The theme is Urja- the energy from the cosmos & the sacred inspiration derived from the Holy Book of 'Gita'. 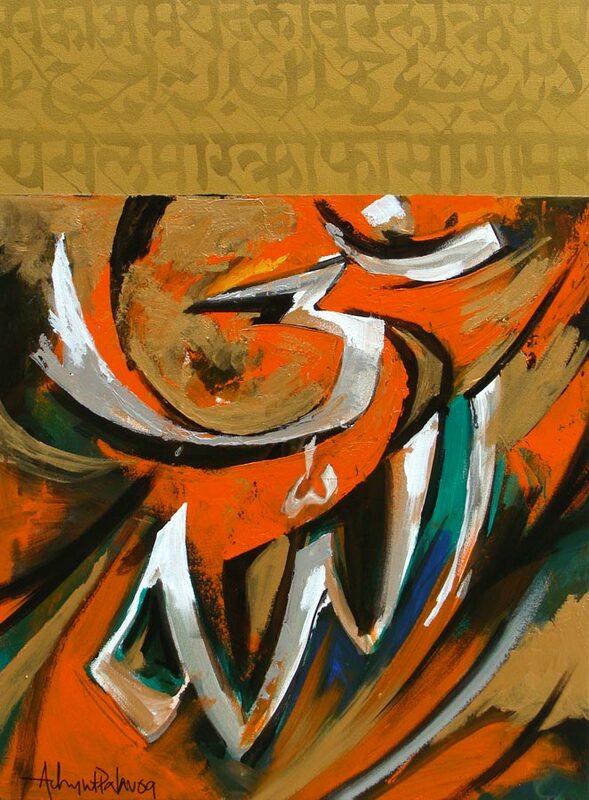 The creations resonate the eternal power of the Gita verses that have laid the rules of a Pious Karma & the energy resulting from the vibrant universe. 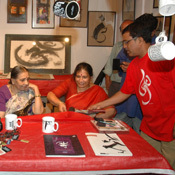 A preview was arranged on Friday, 13th May 2011 at the Tao Art Gallery before calliscrolls was taken to London for an Exhibition. 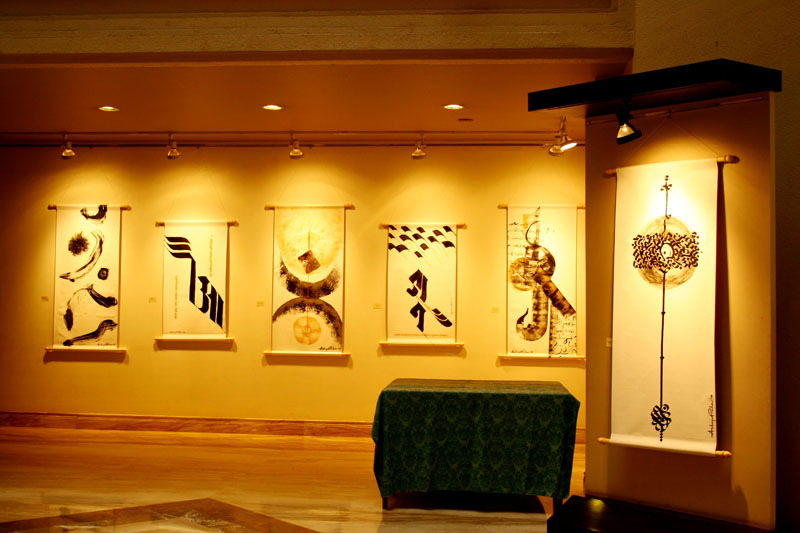 Calligraphic creations using the scroll or the traditional 'Khalita' as a medium were showcased in London. 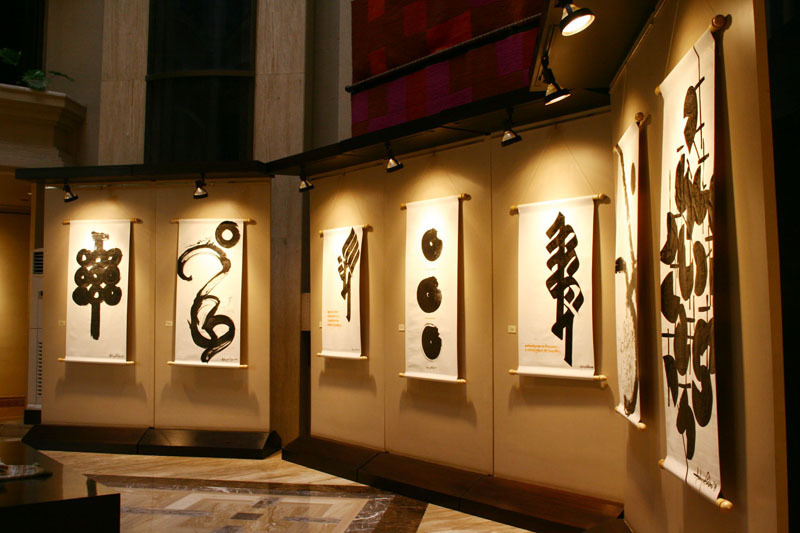 The term 'Calliscrolls' is coined from the phrase - Calligraphy on Scrolls. 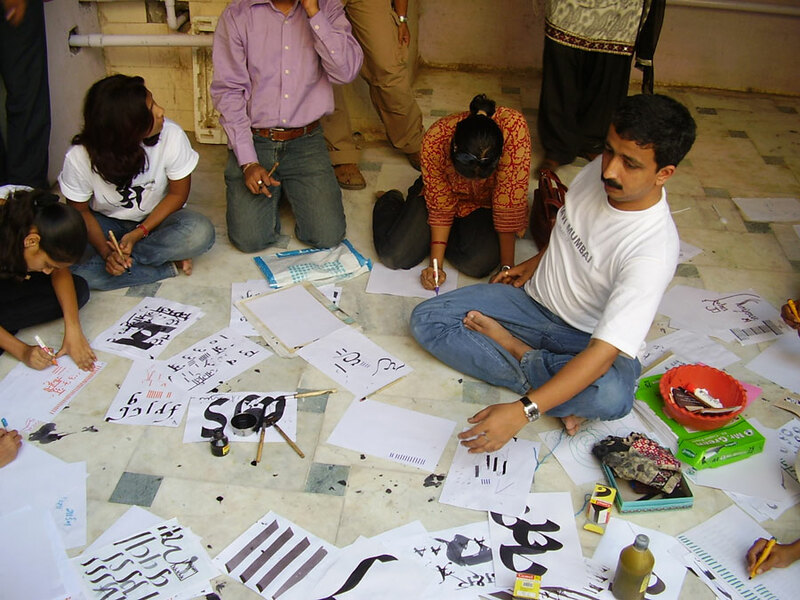 Indian calligraphy is much appreciated in the west. 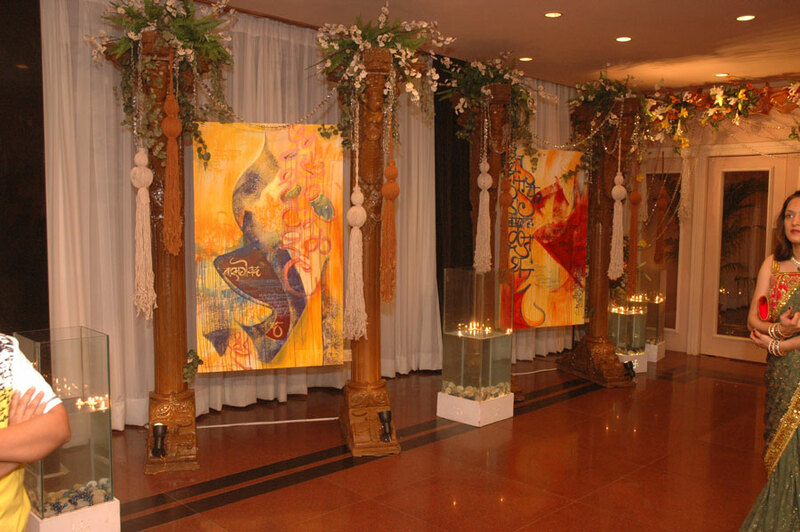 Its rich & ornate nature appeals the most to art patrons. 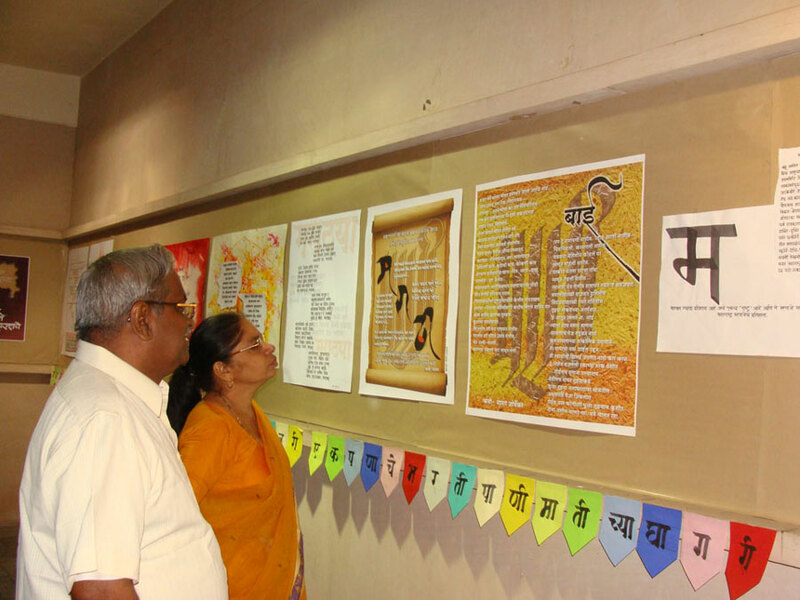 The compositions from scriptures & scripts are popular. 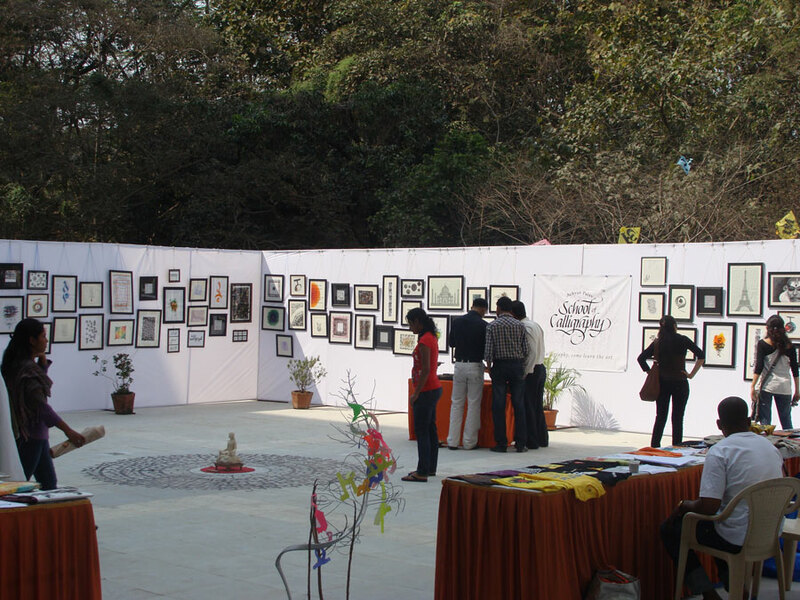 It showcased about 25 works of art. 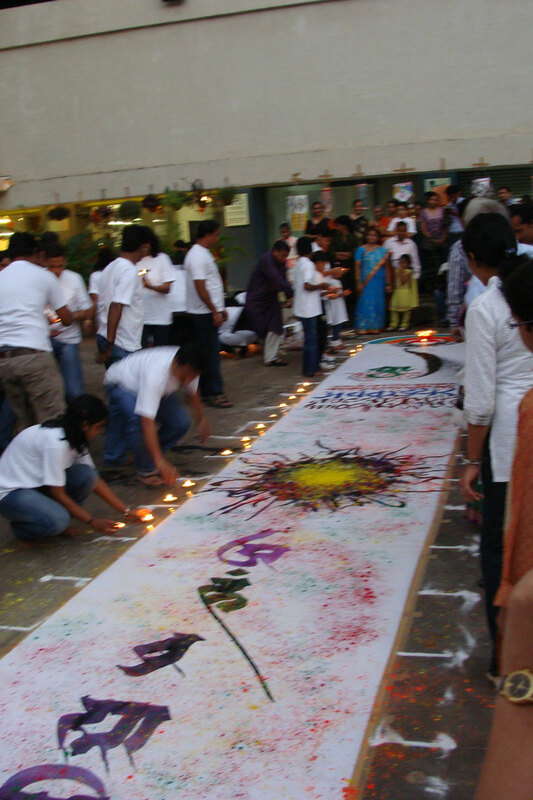 The theme is Urja - the energy from the cosmos & the sacred inspiration derived from the Holy Book of 'Gita'. 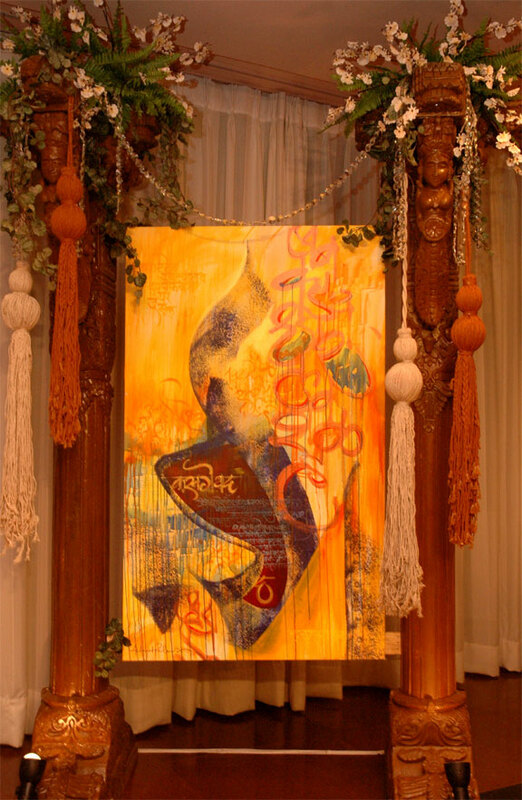 The creations resonate the eternal power of the Gita verses that have laid the rules of a Pious Karma & the energy resulting from the vibrant universe. 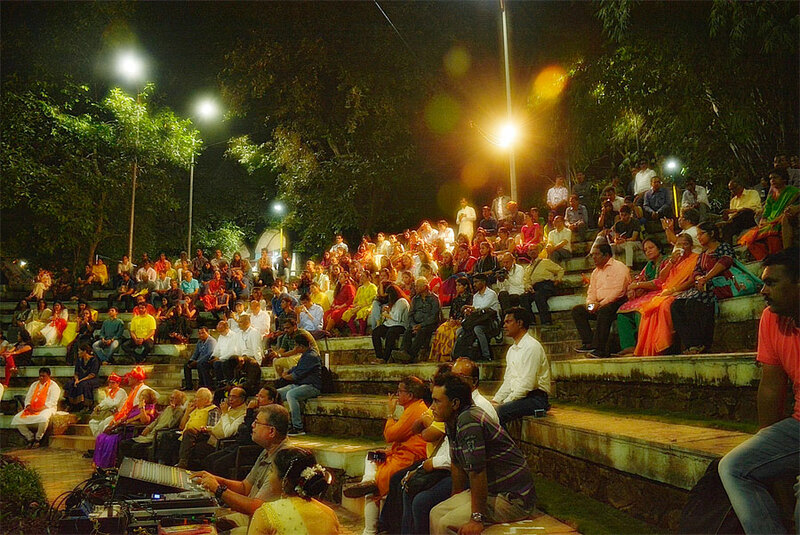 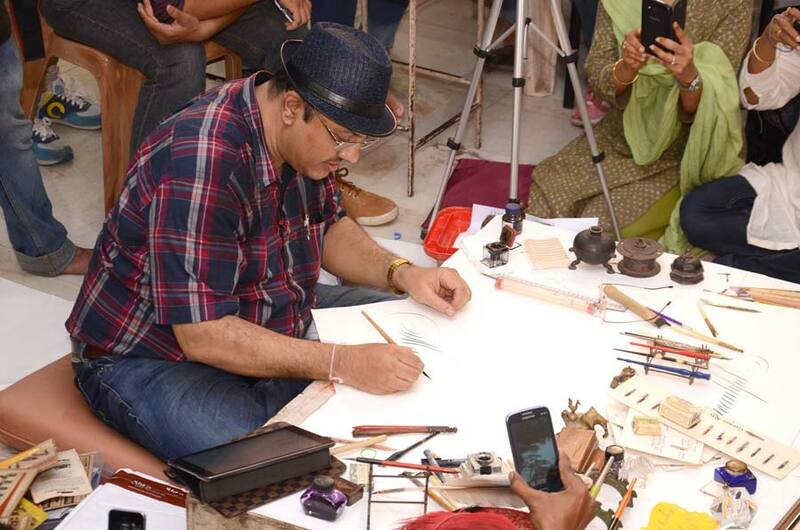 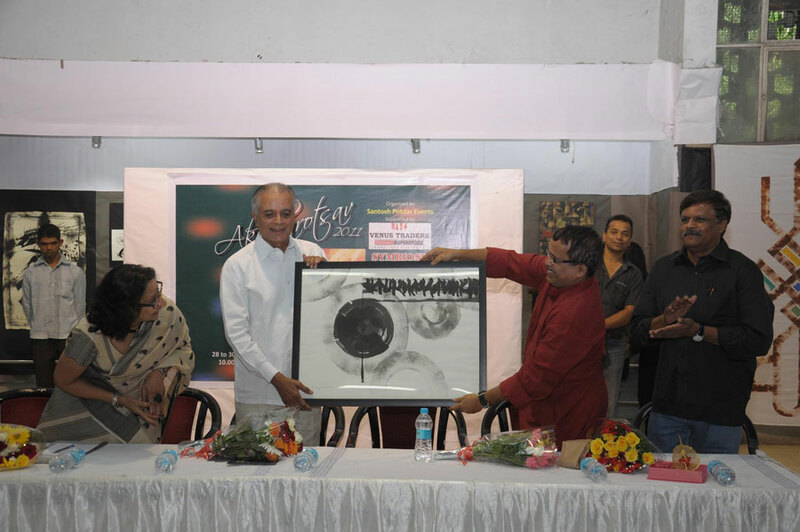 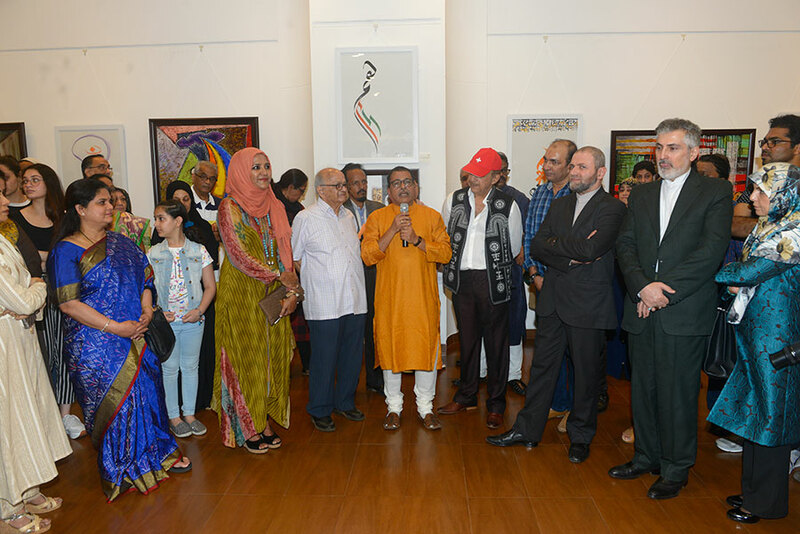 Art lovers in Nagpur enjoyed a thrilling experience when the magic of calligraphy by Master Calligrapher Achyut Palav fused with the foot tapping beats of Tabla & the lovely sounds of Indian music. 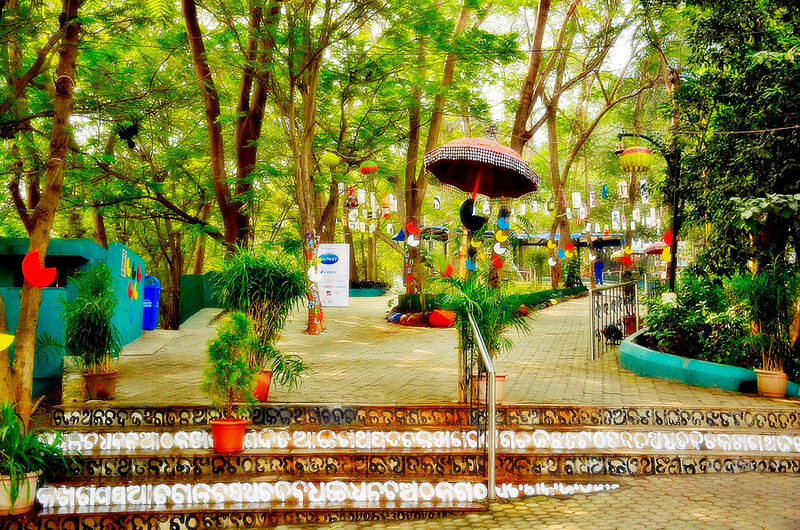 The whole ambiance was colourful & heavenly. 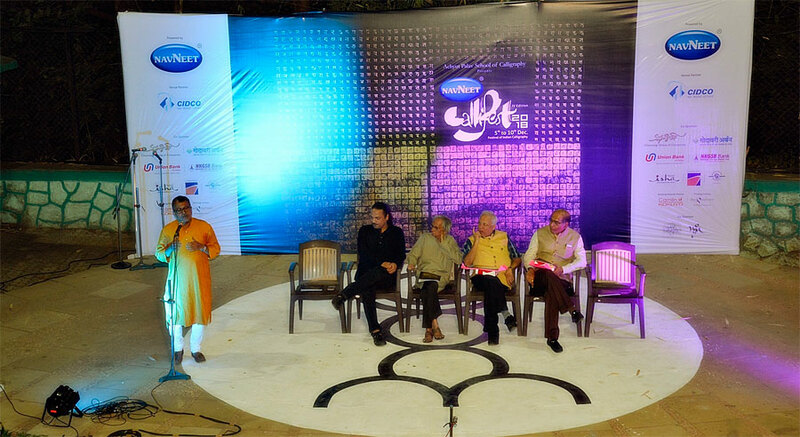 Gracing the occasion are Mr. Atul Shirodkar, Mr. Kavi Grace and Dr. Avinash Rode. 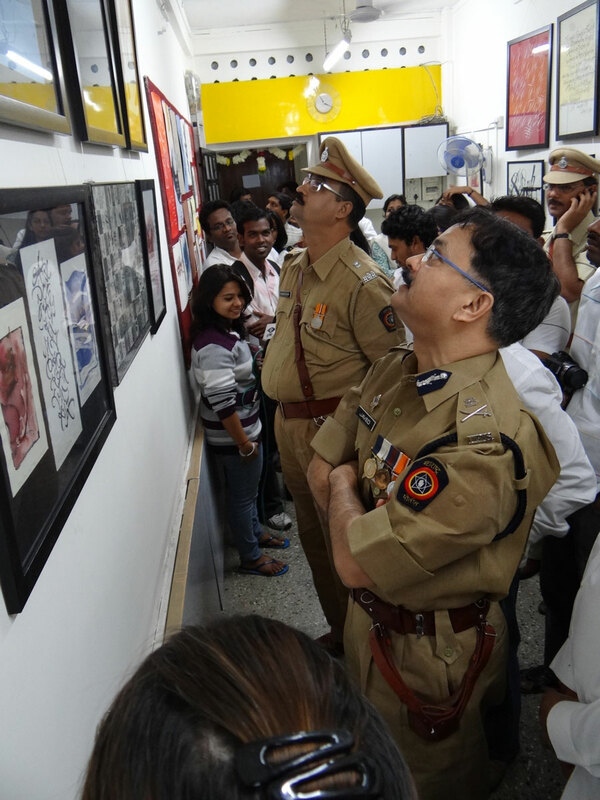 The exhibition afterwards was attended & appreciated by many. 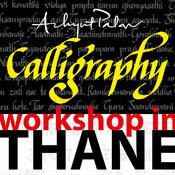 Unique Calligraphy Workshop by Achyut Palav at Belapur on the 4th July 2010. 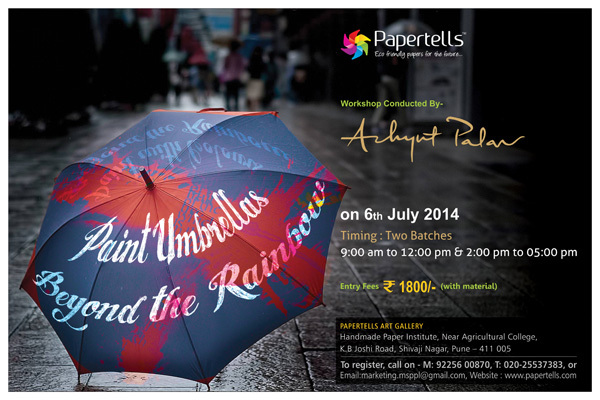 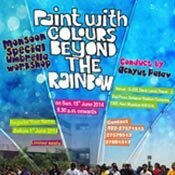 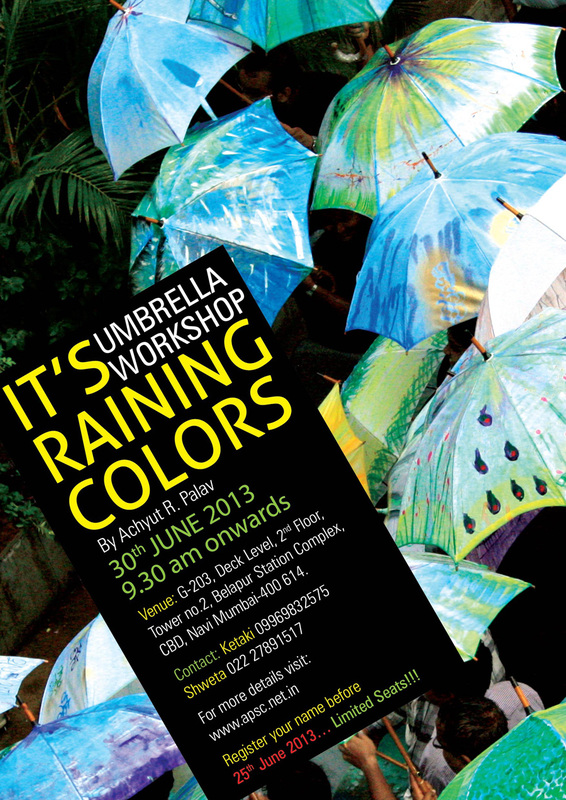 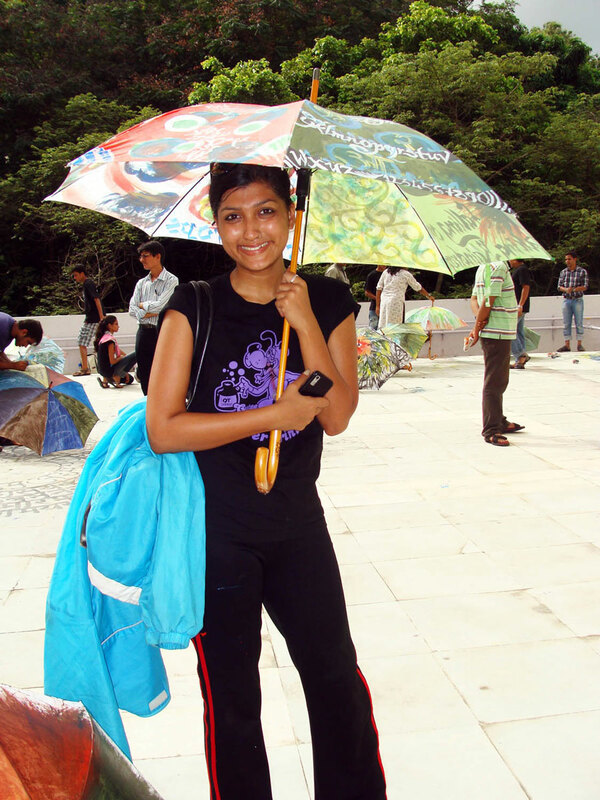 We gave you an opportunity to catch them on a universal icon of rains... 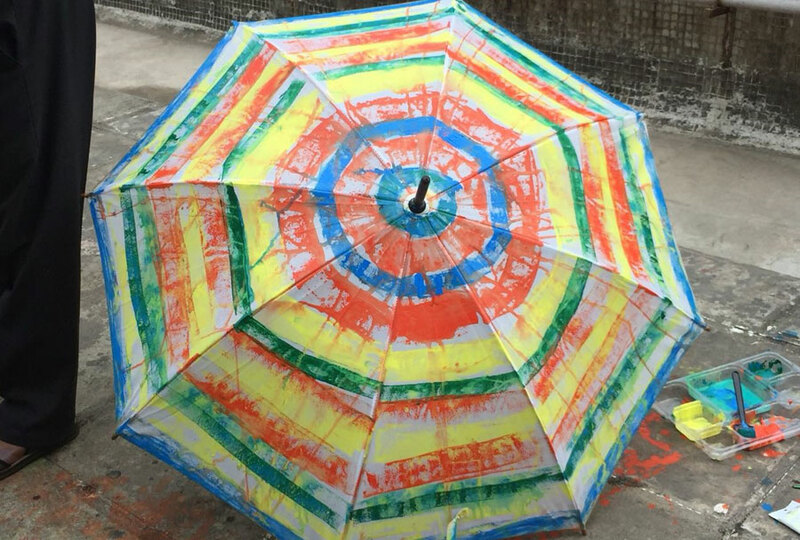 The Umbrella. 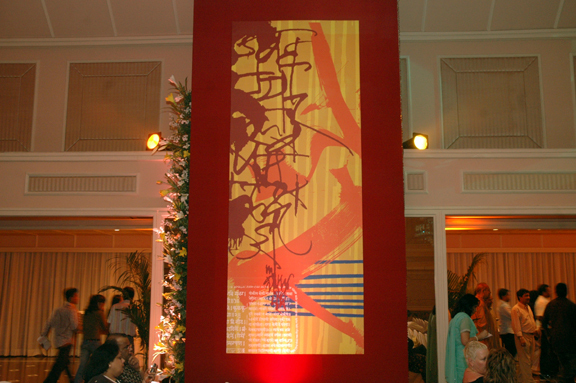 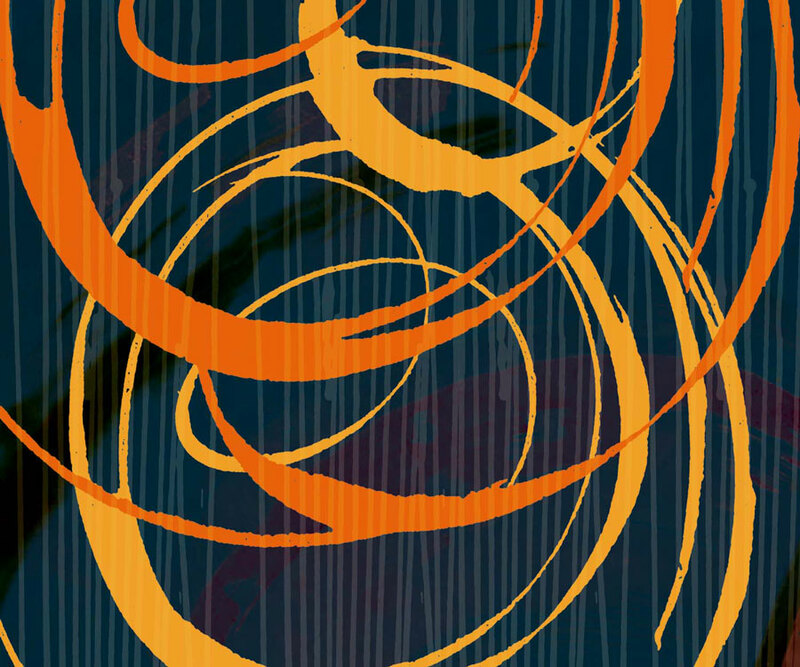 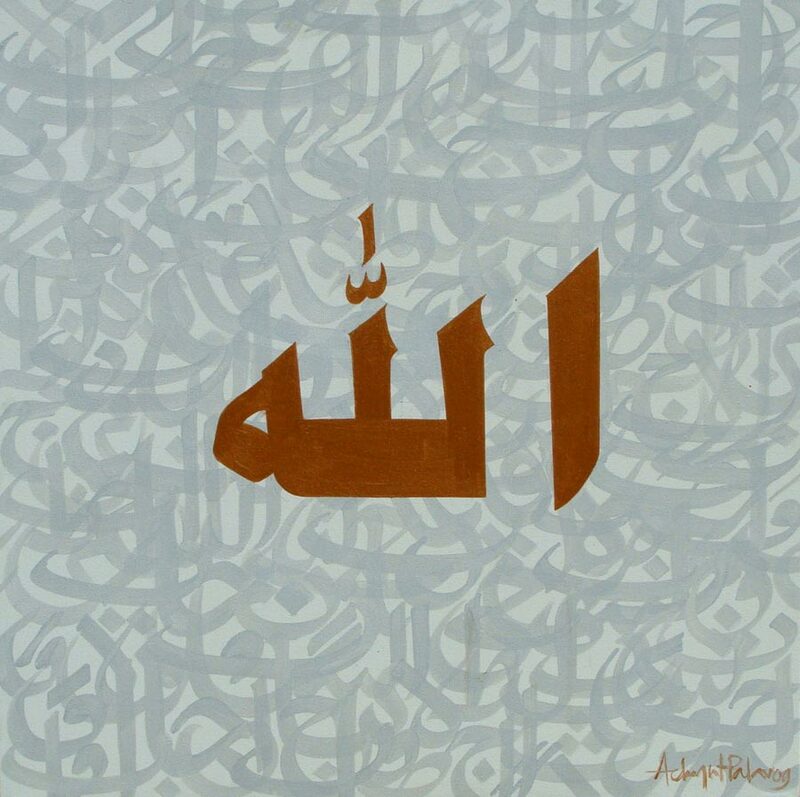 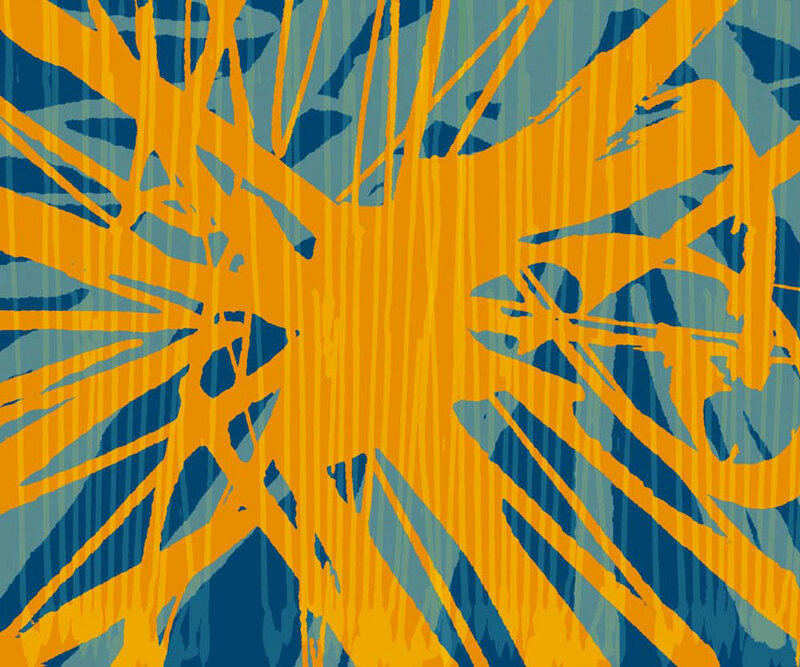 A wonderful combination of calligraphic strokes & colors took place on 4th of July 2010. 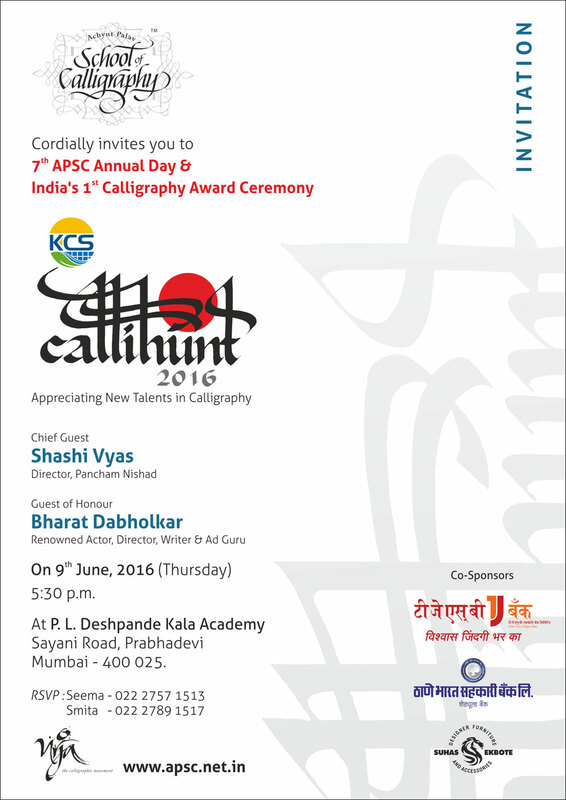 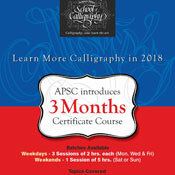 Achyut Palav School of Calligraphy recently completed its successful 1 year. 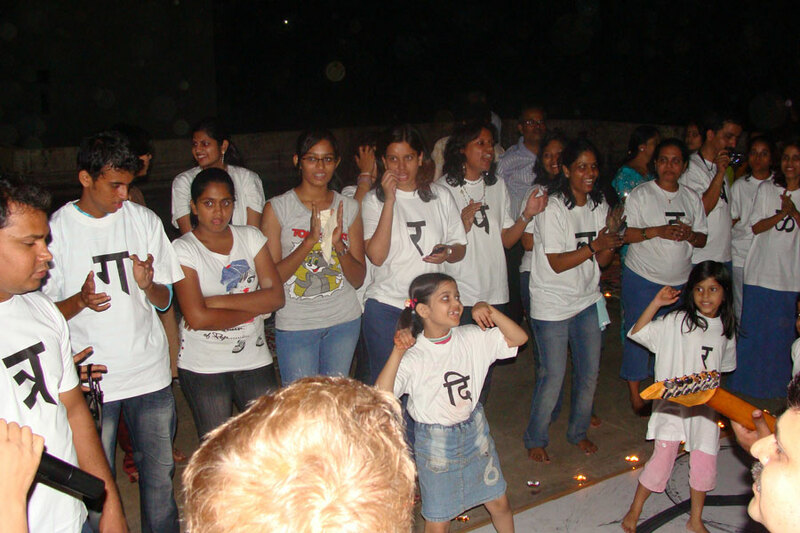 The event on Sunday 20th June, 2010 was celebrated by its students, instructors, staff & the Palav family in a small event held at the P.L. 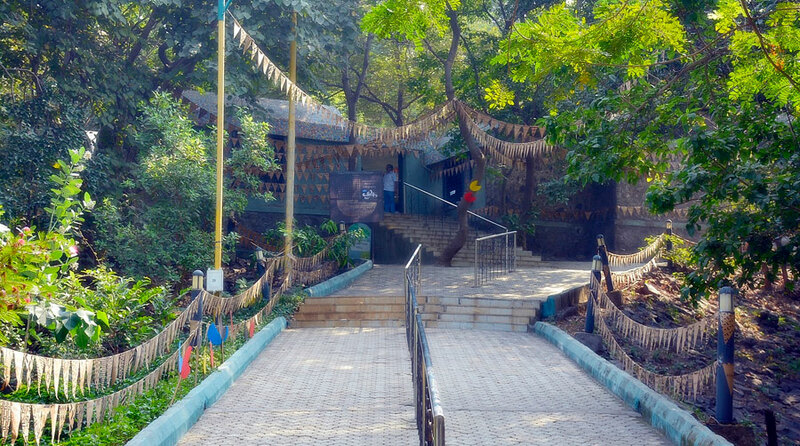 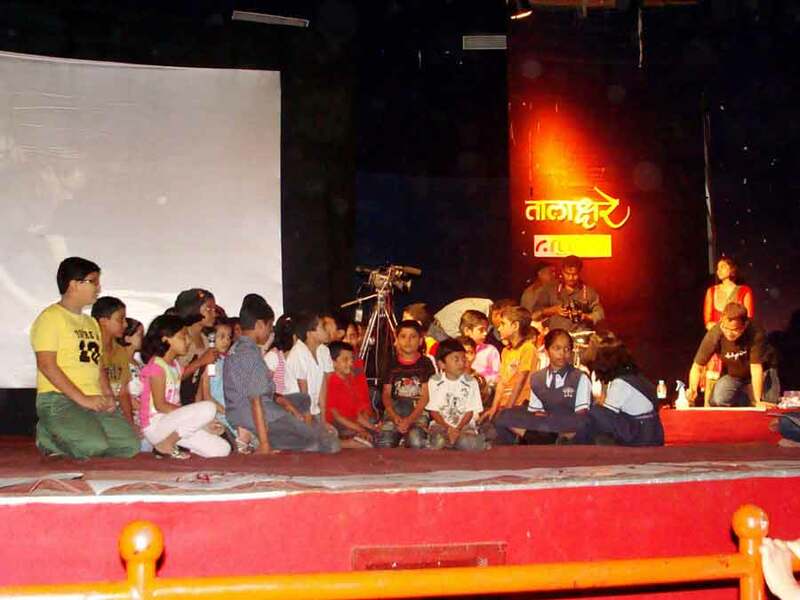 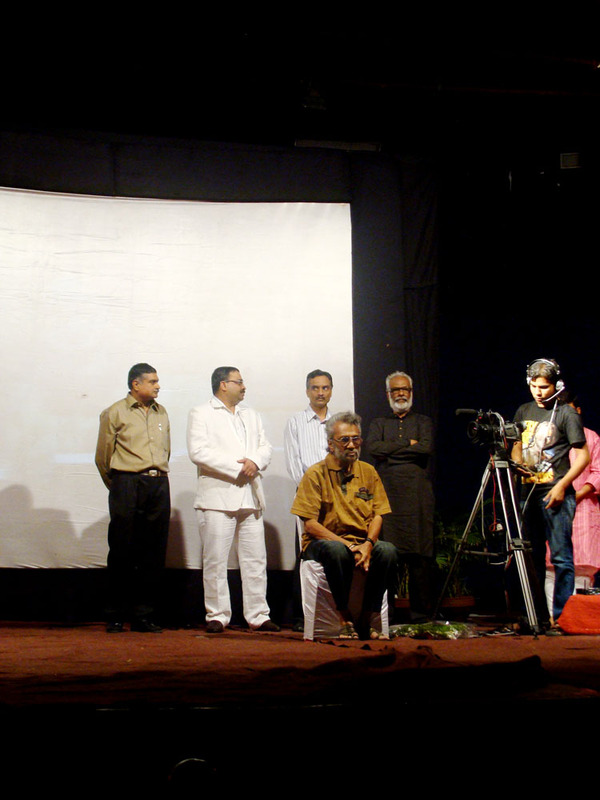 Deshpande Kala Academy's Mini Theater. 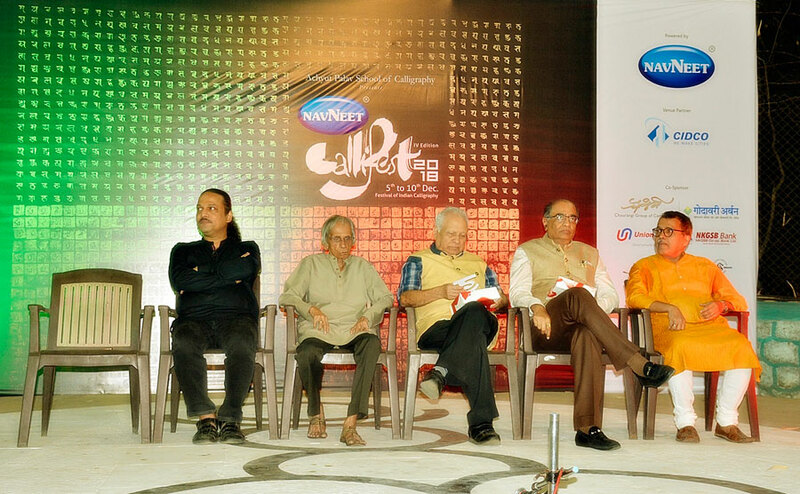 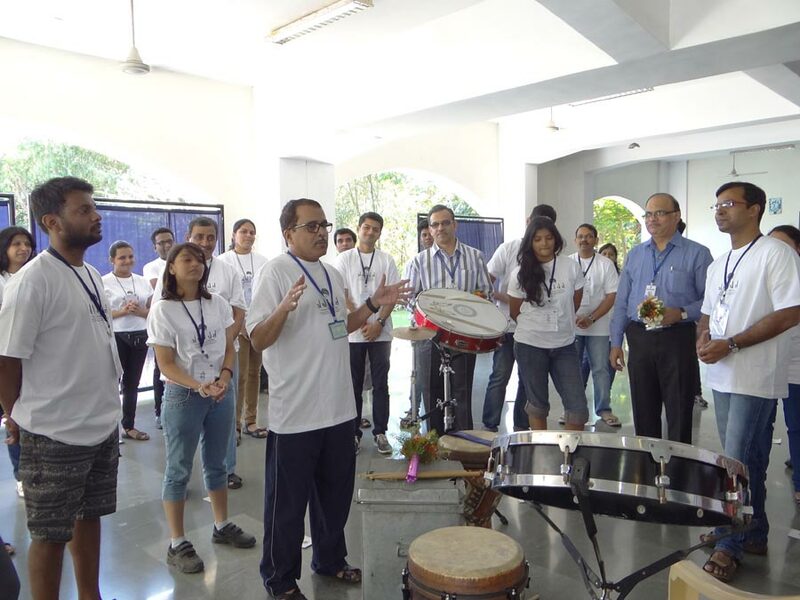 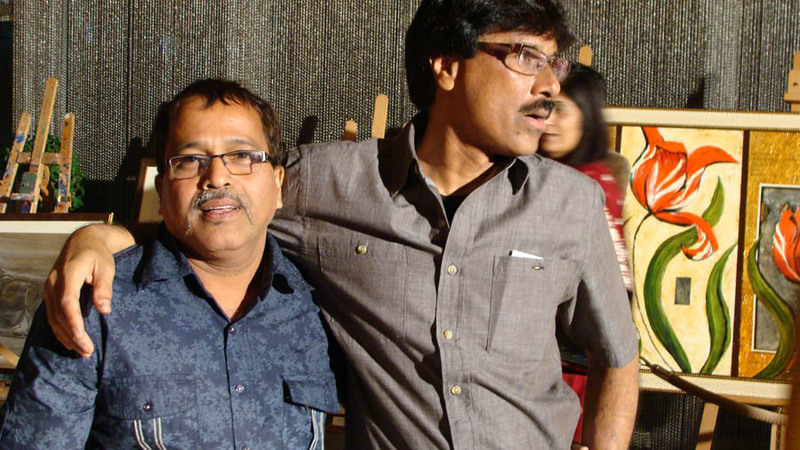 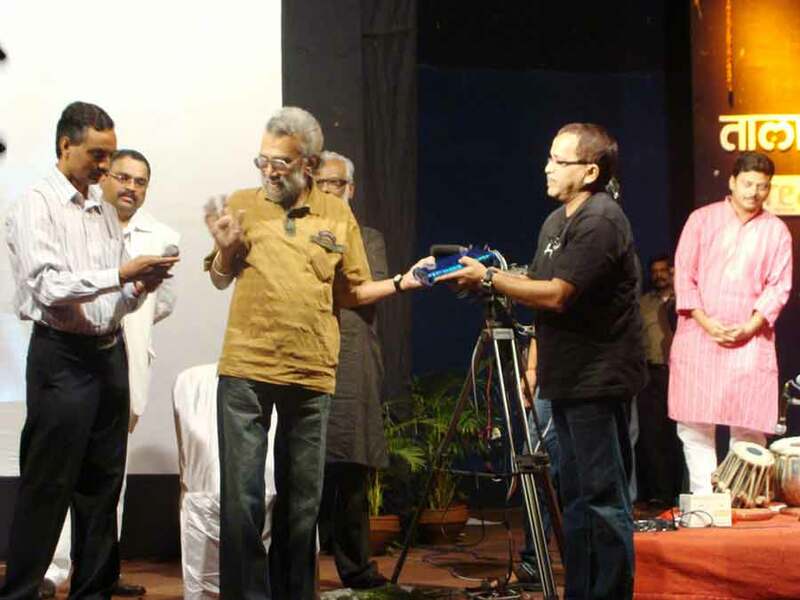 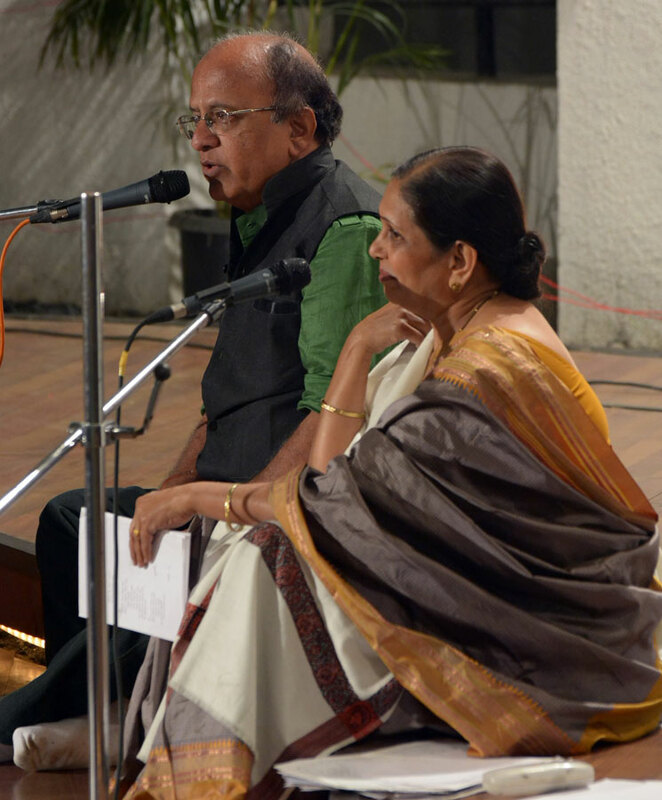 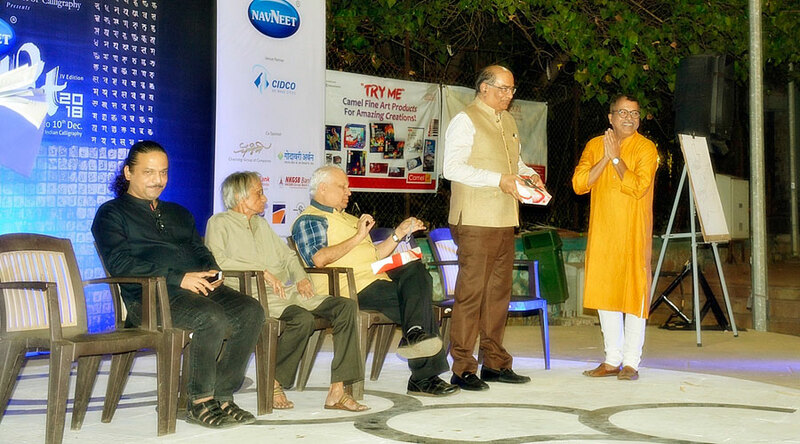 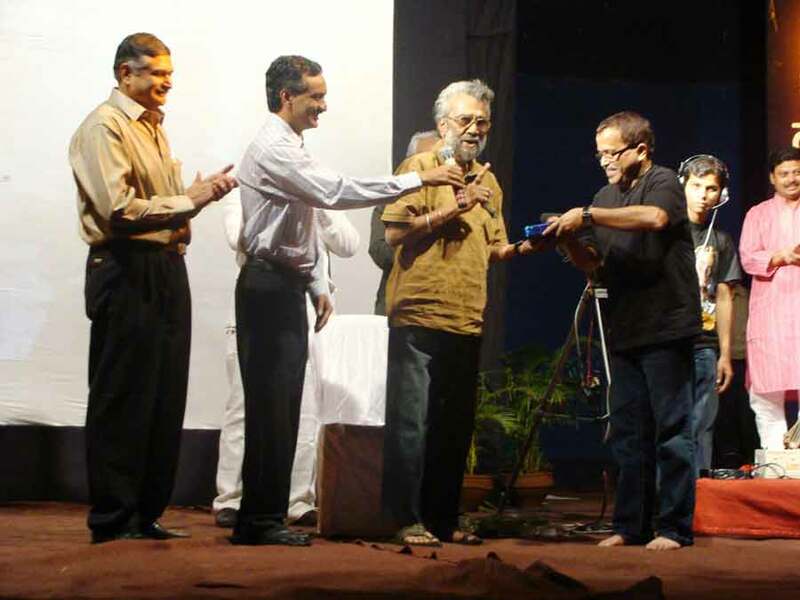 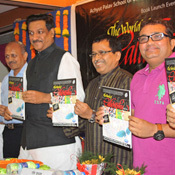 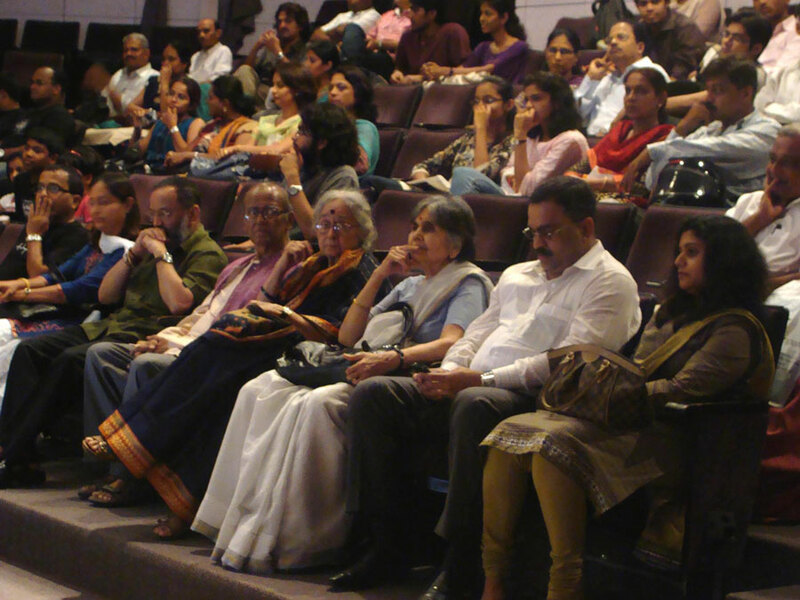 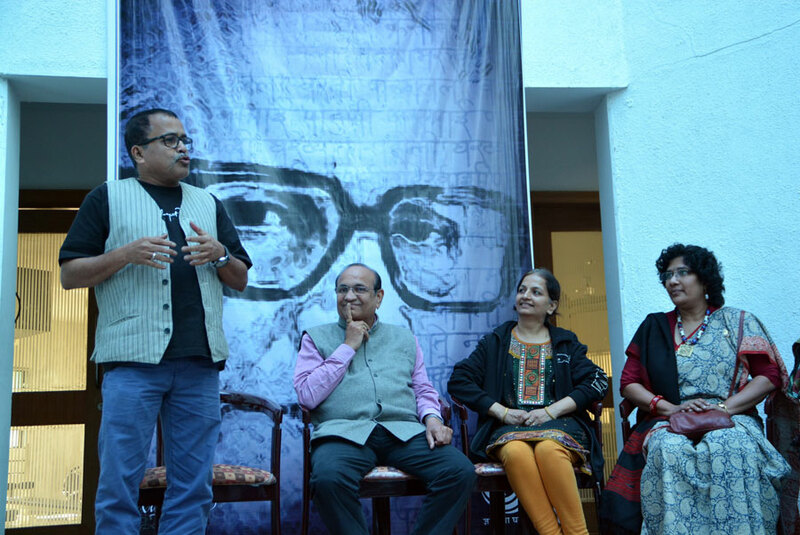 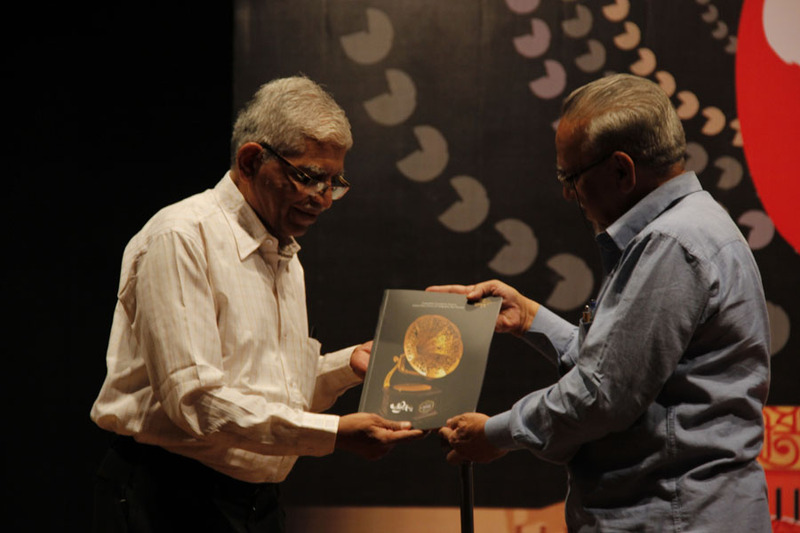 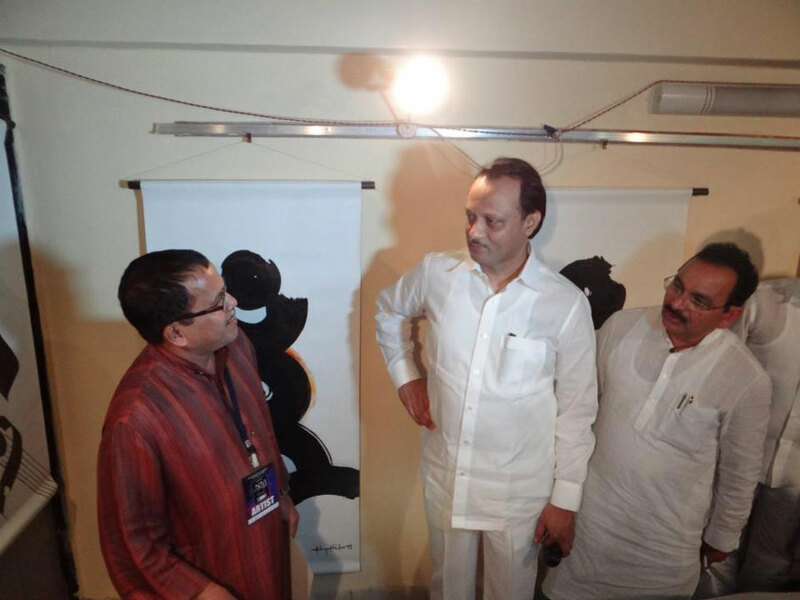 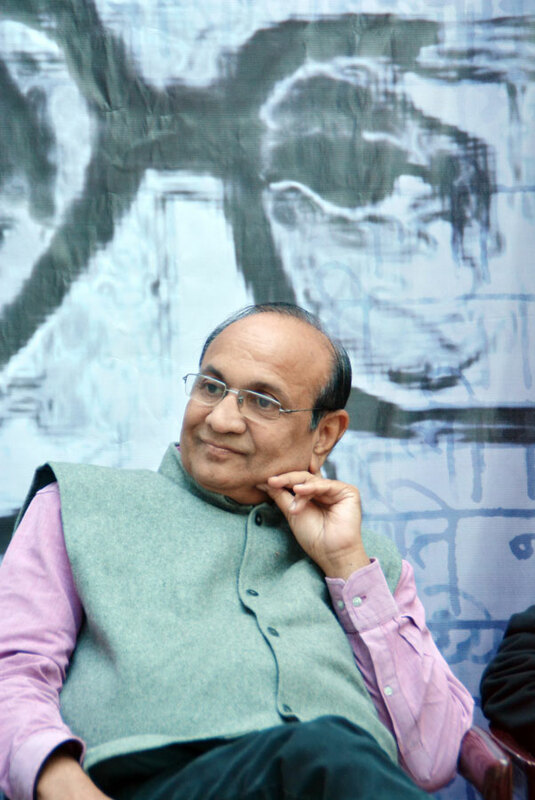 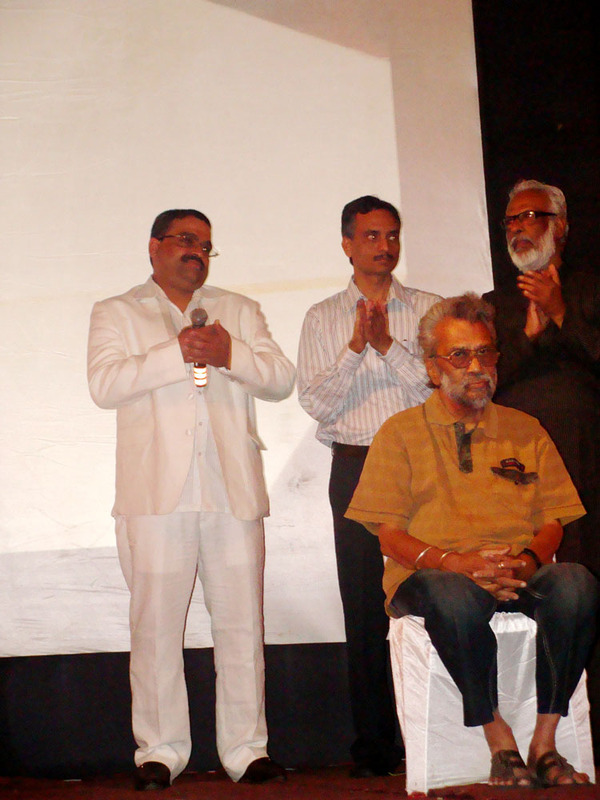 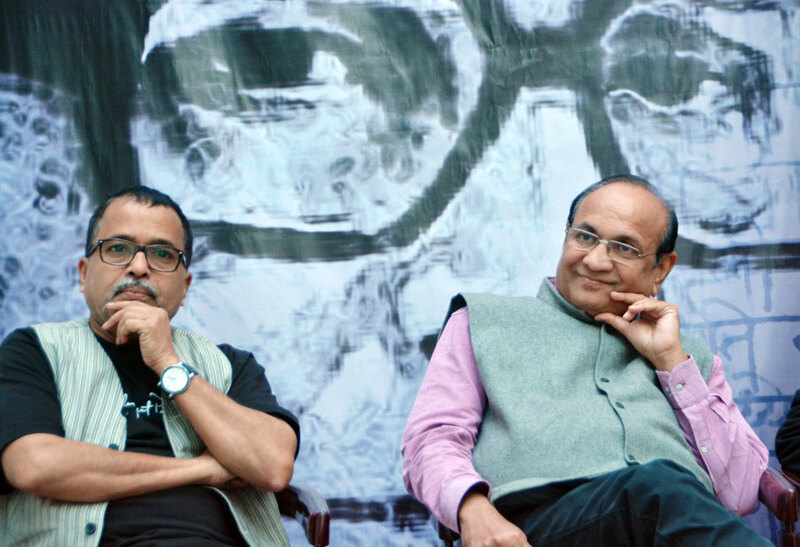 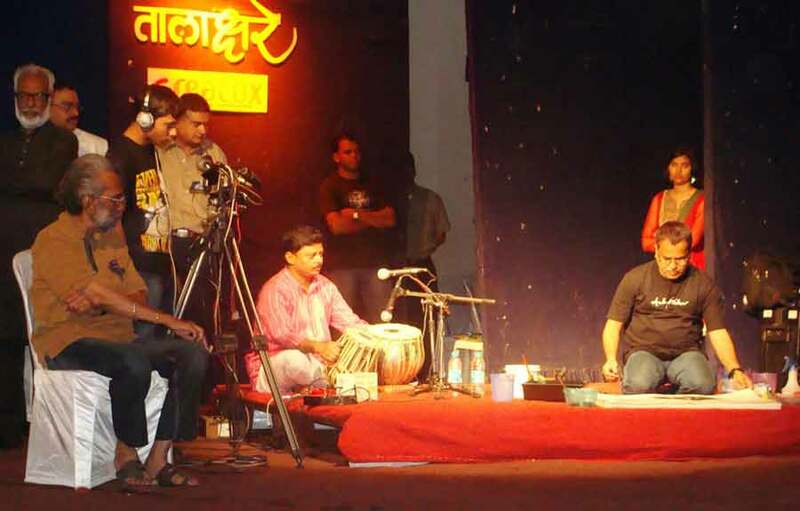 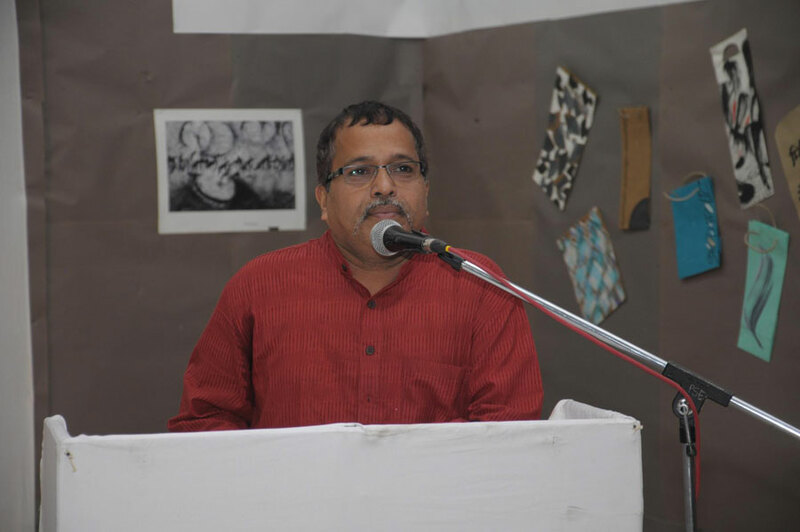 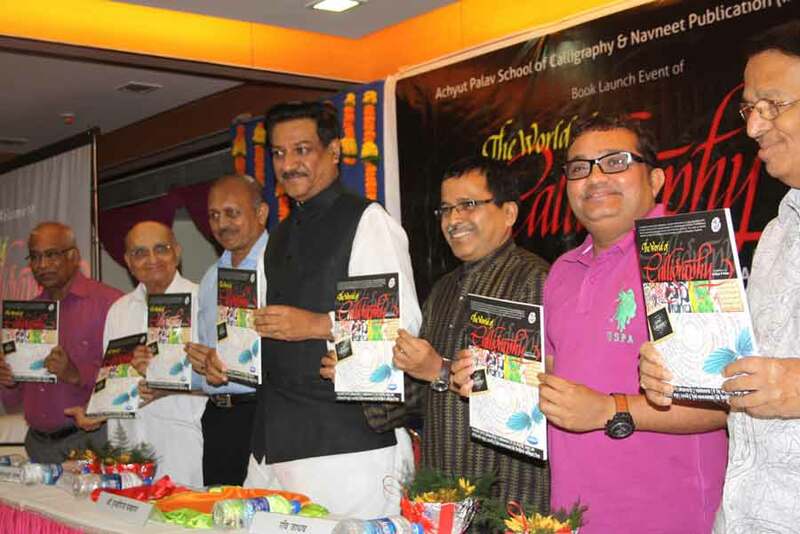 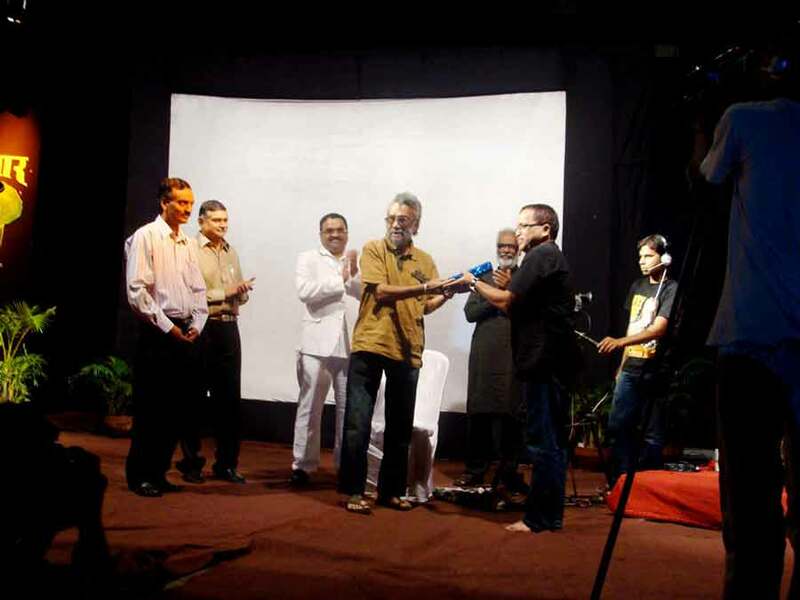 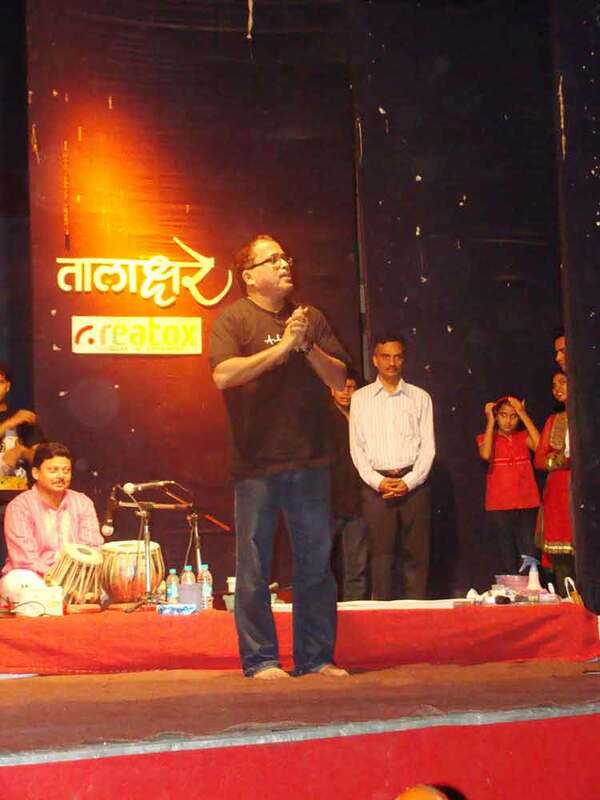 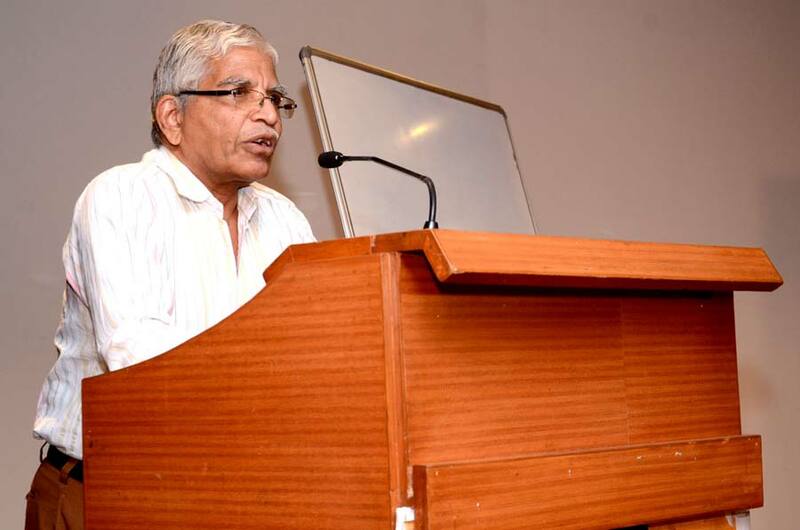 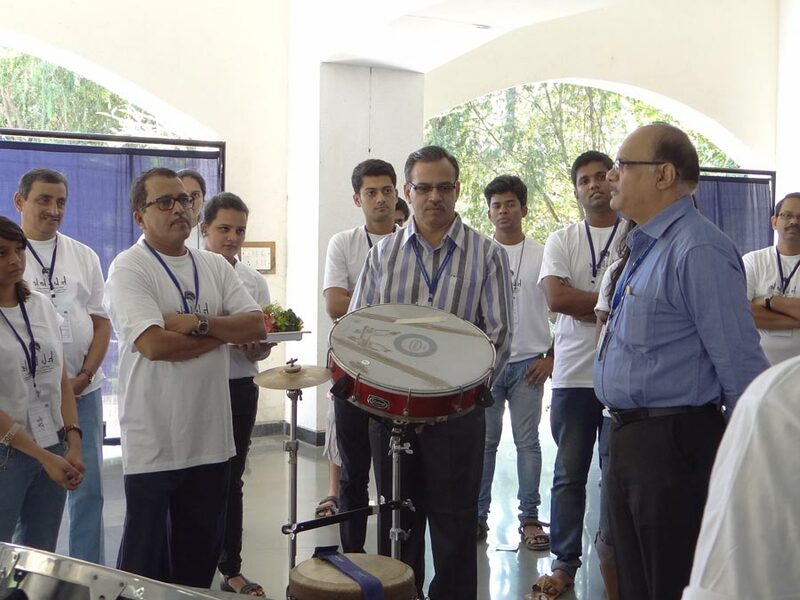 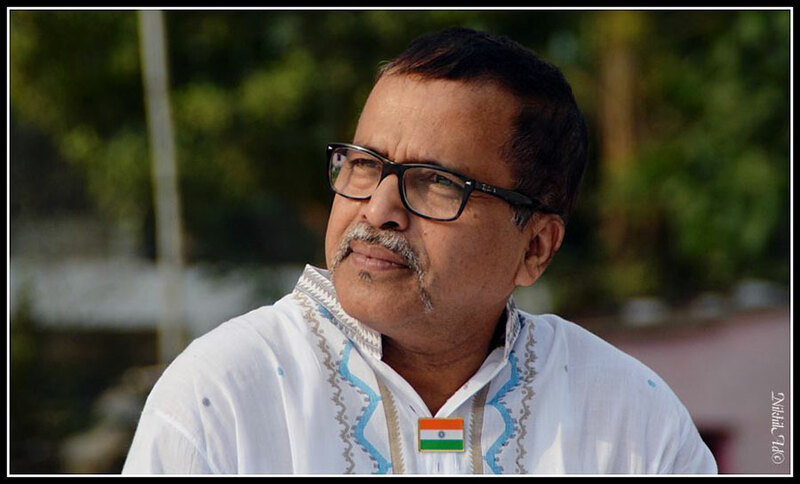 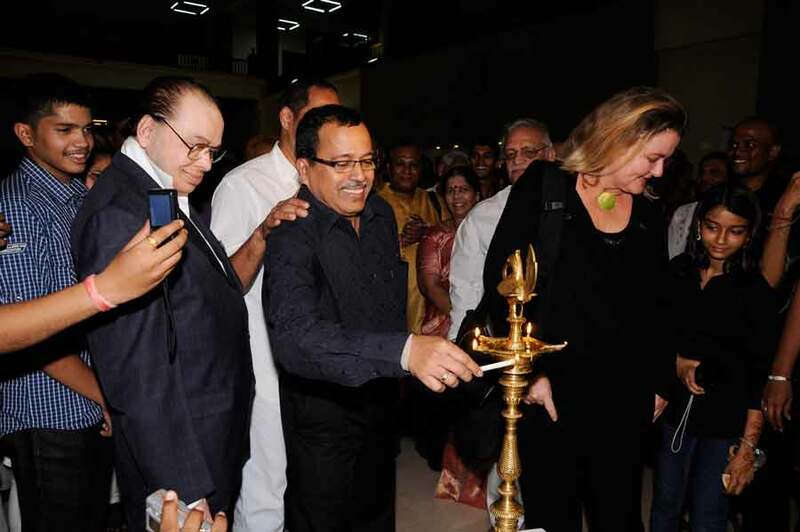 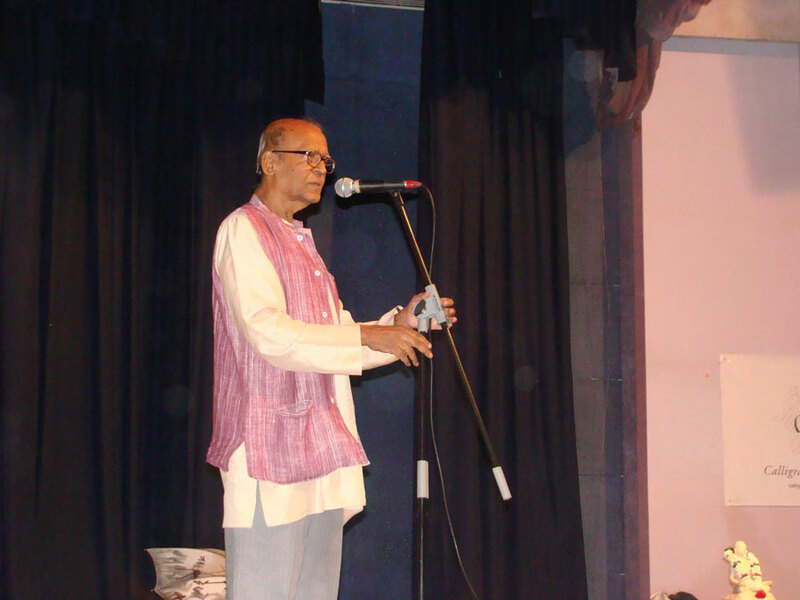 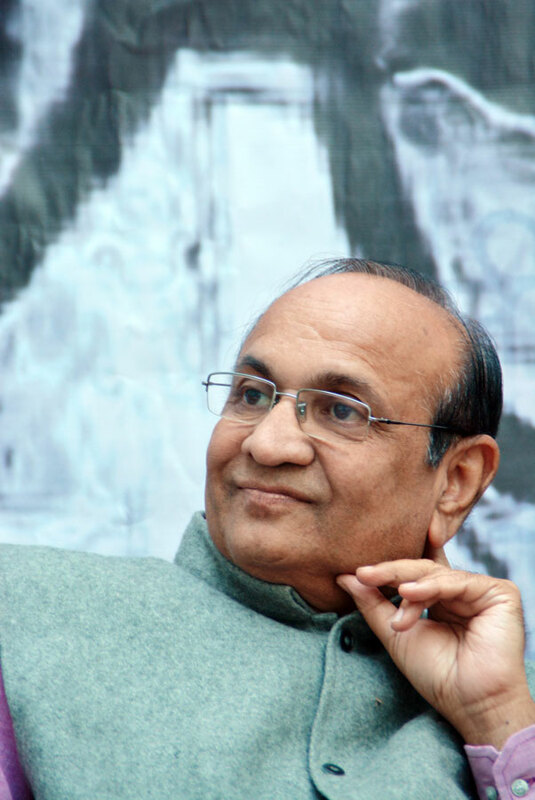 The event witnessed the presence of the noted Musicologist & Composer Dr. Ashok Ranade, the G.M. 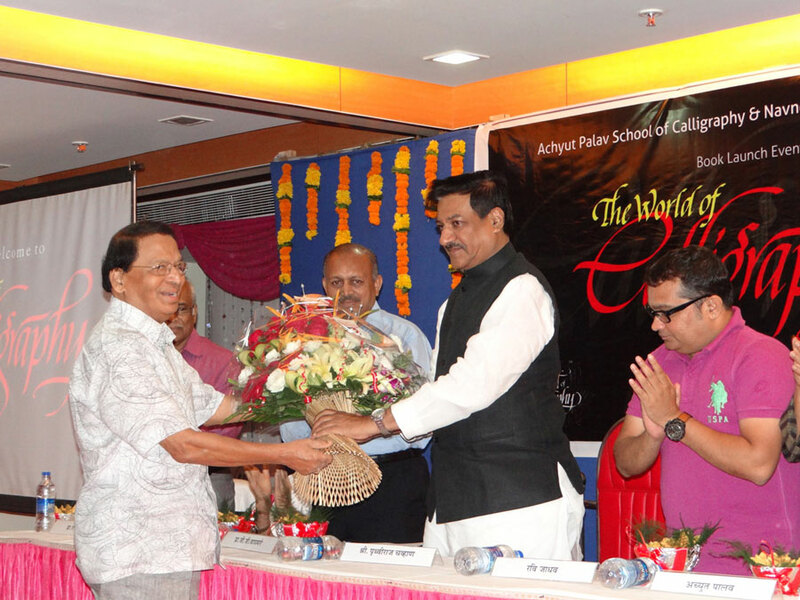 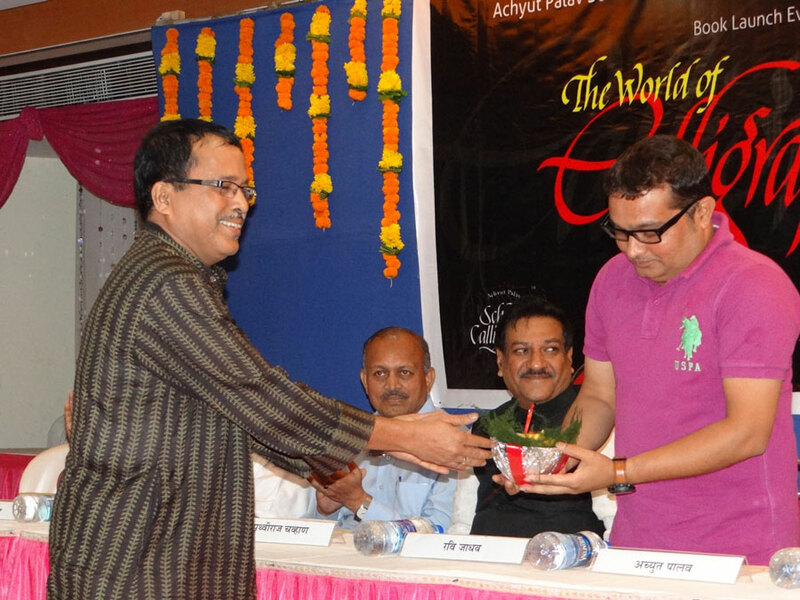 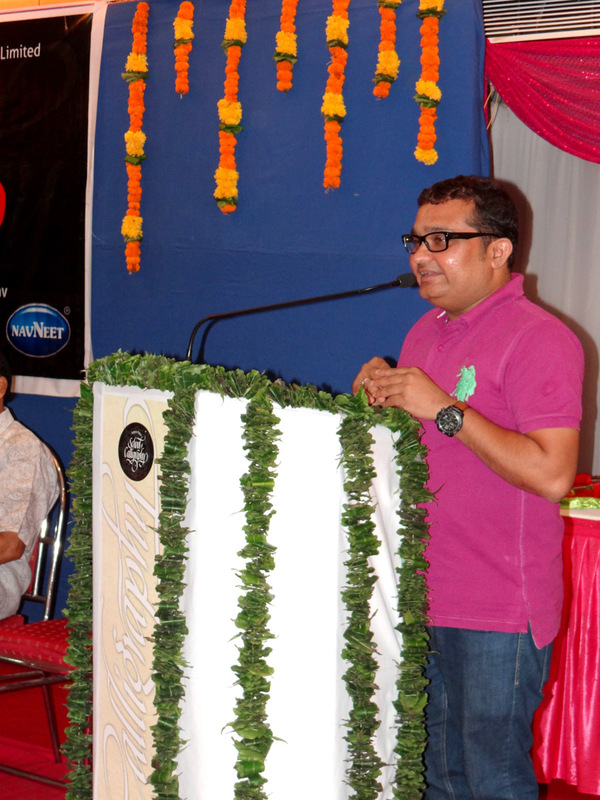 I/C (Regional Services) of Indian Oil Corp. Mr. Shrikant Bapat as the guest of honour & well-known Marathi writer Smt. 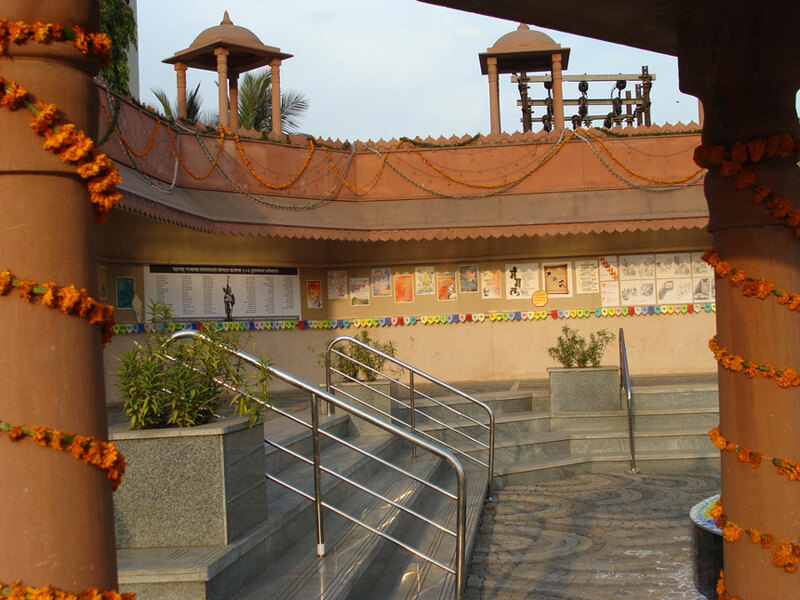 Vijaya Rajadhyaksha. 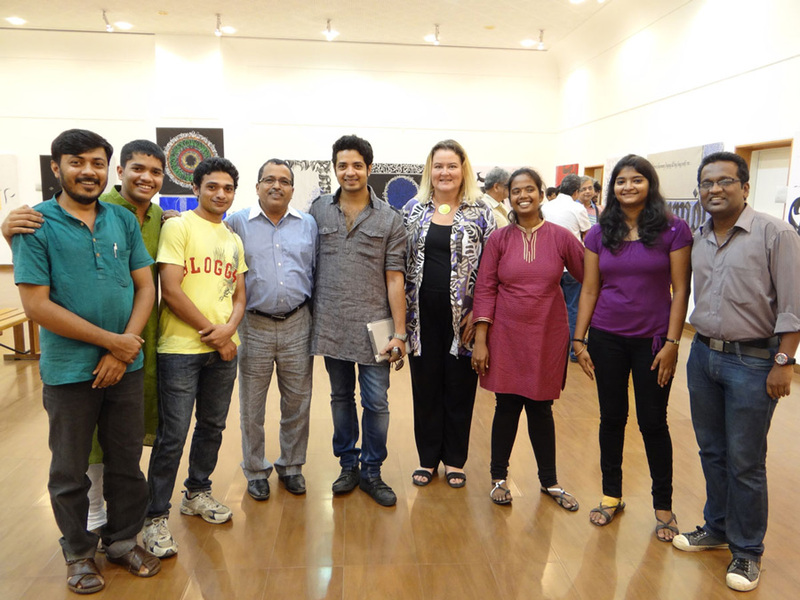 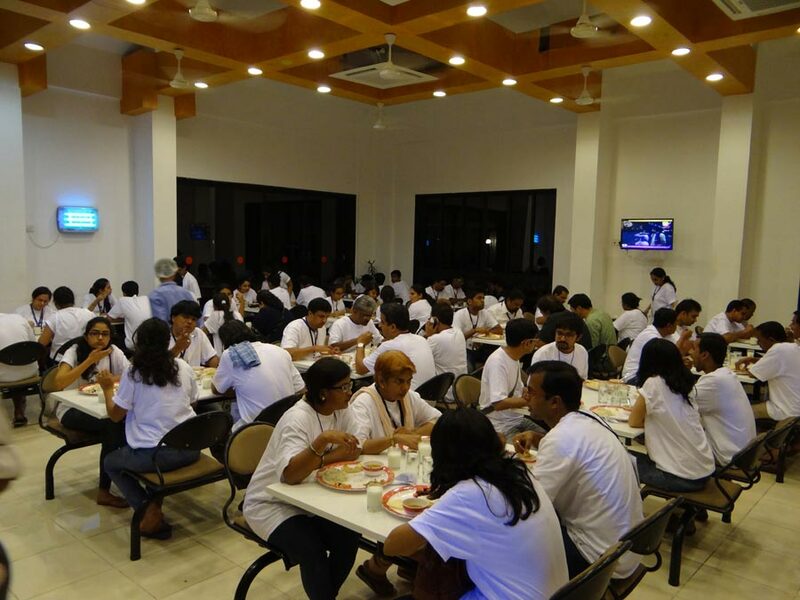 The evening ended with informal celebrations that were attended by current & past students of APSC. 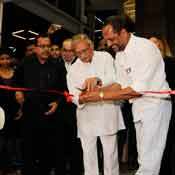 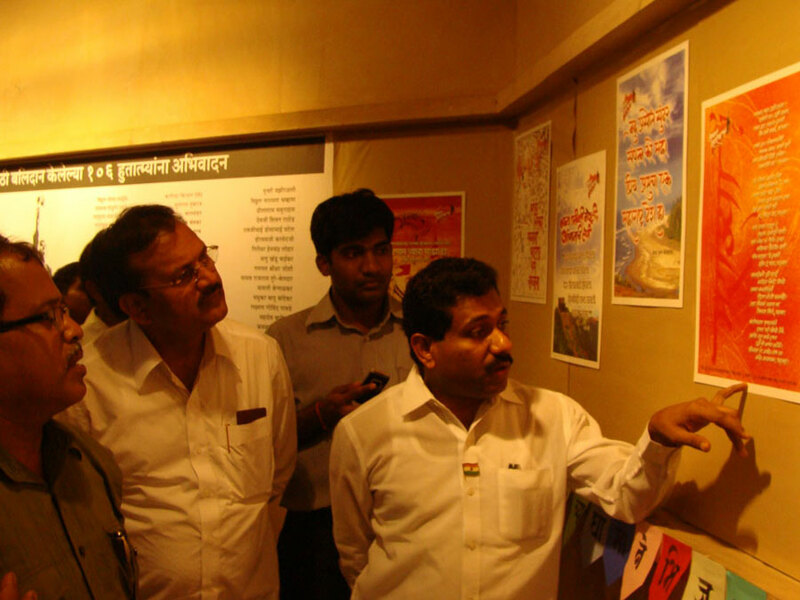 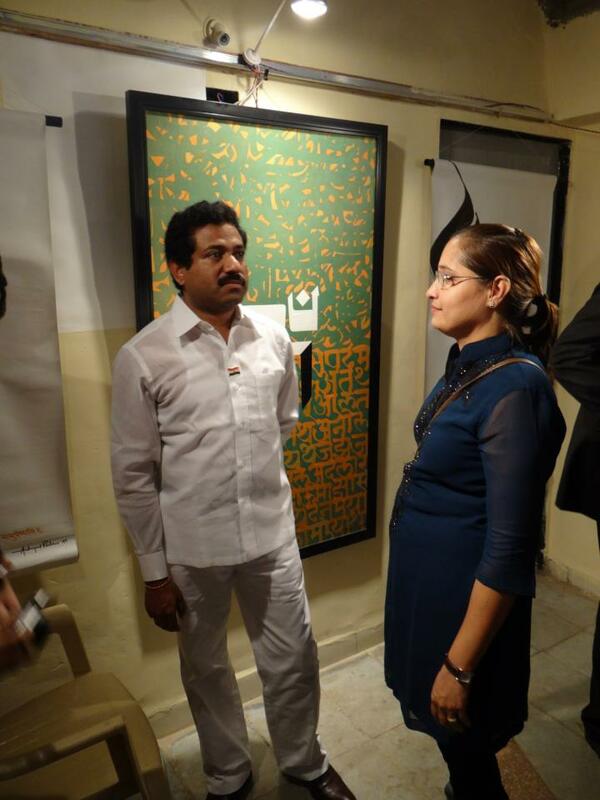 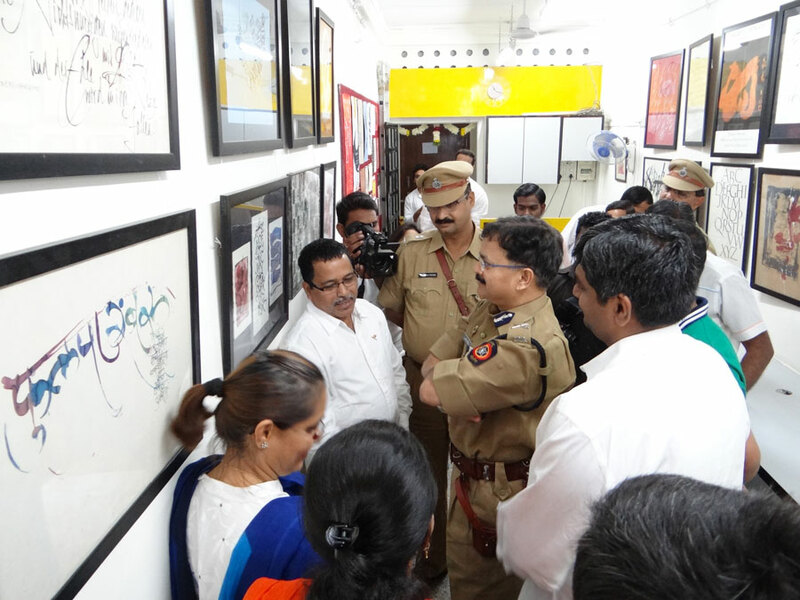 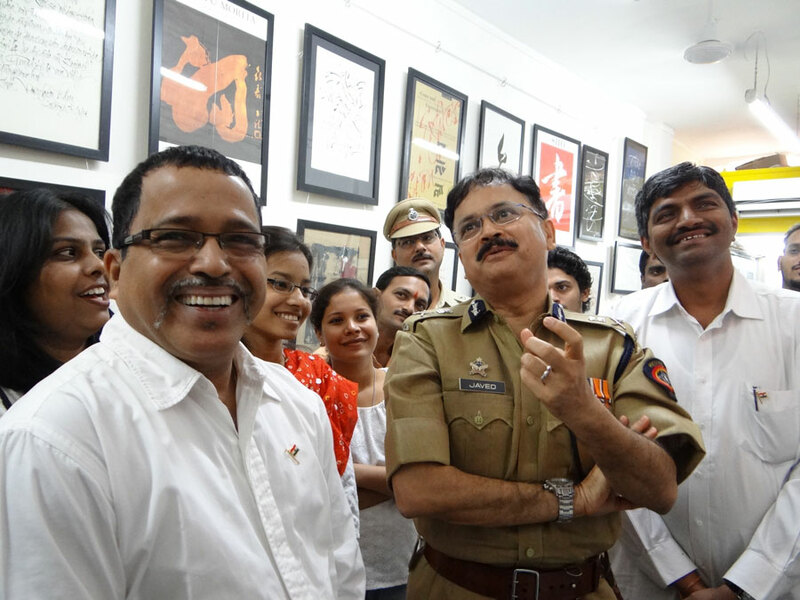 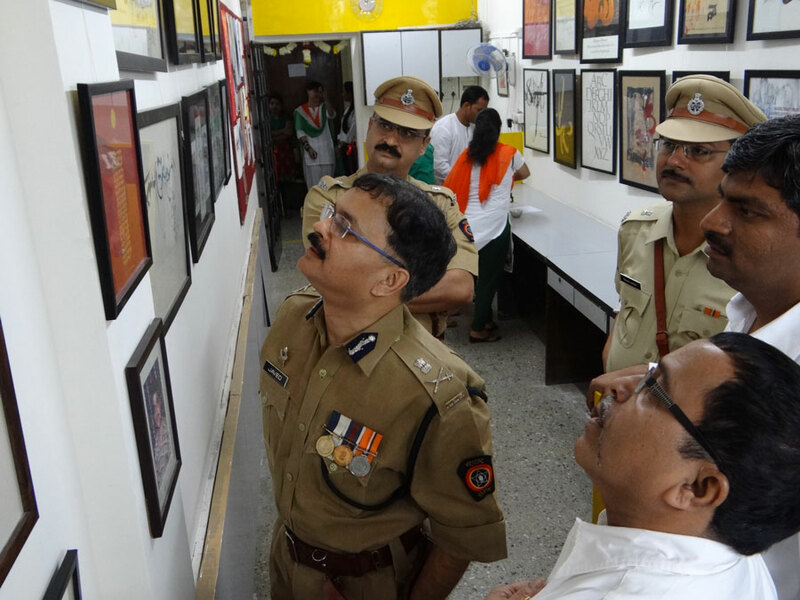 The exhibition was inaugurated by the noted political figure of Navi Mumbai, Dr. Sanjeev Naik (MP) on 1st May 2010. 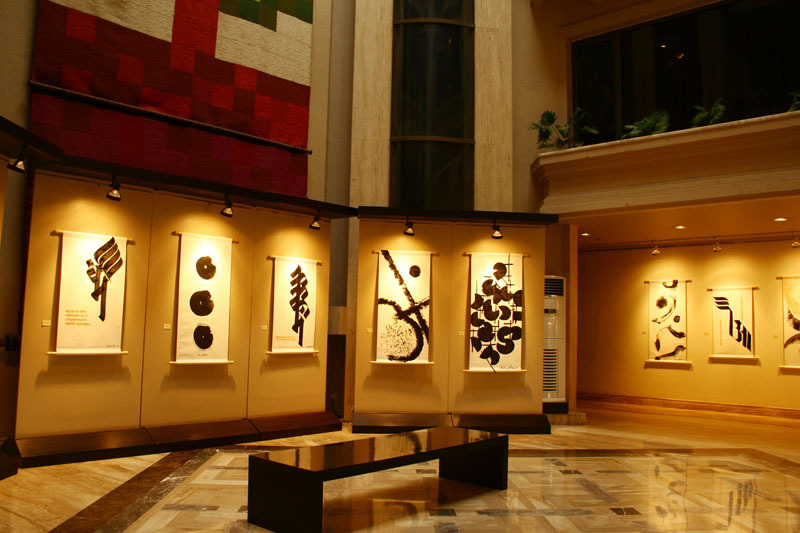 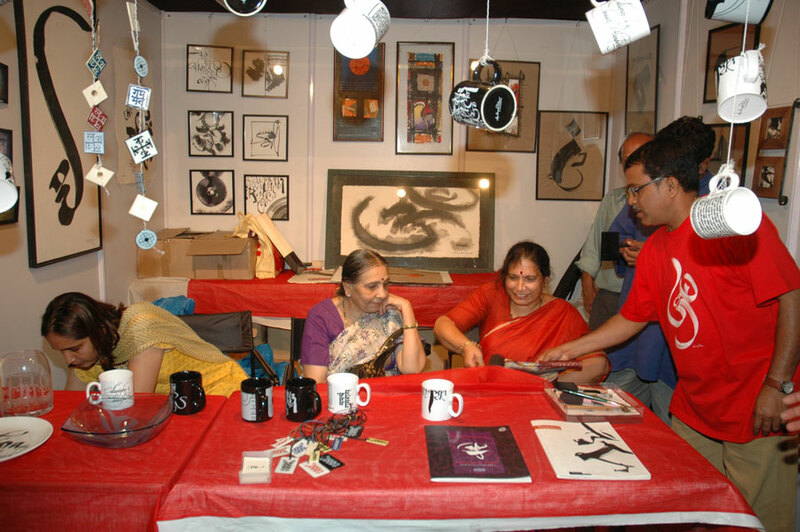 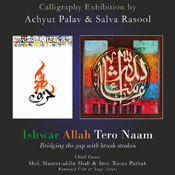 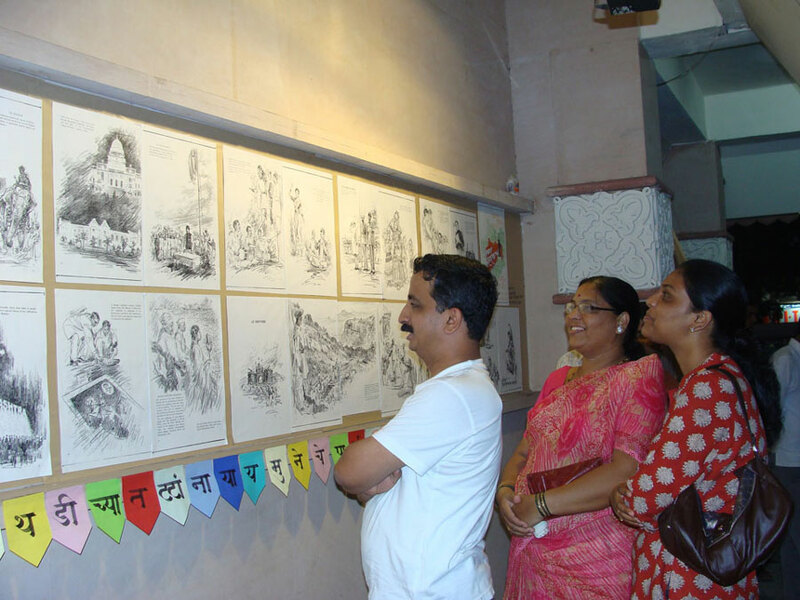 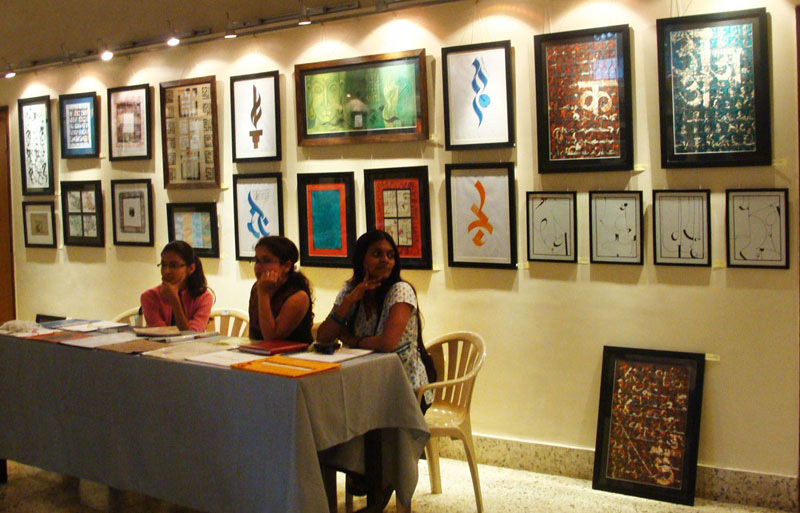 The exhibit was open for public viewing on 1st & 2nd May 2010 from 9:00 a.m. to 9:00 p.m.
Urja - The Calligraphic Movement along with the 'Achyut Palav School of Calligraphy' participated in the famous Kalaghoda Arts Festival. 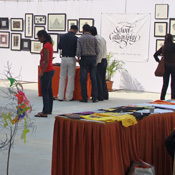 The festival commenced on the 6th of February 2010 (Saturday) & ended on the 14th of February 2010 (Sunday). 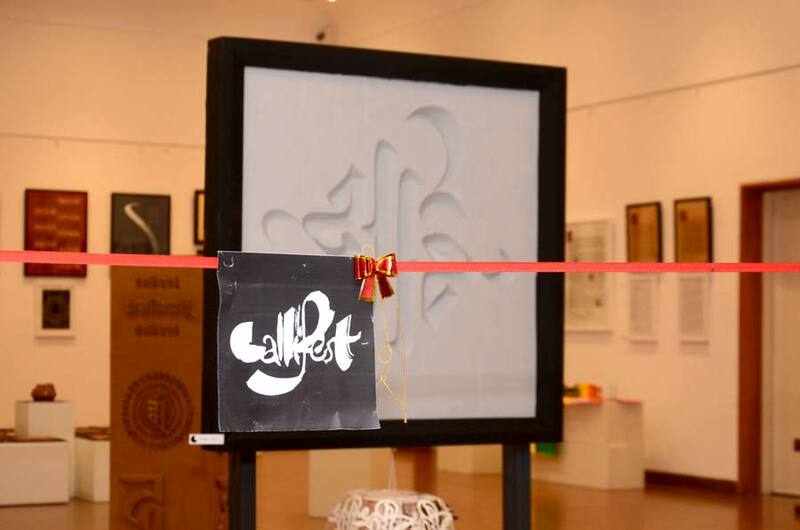 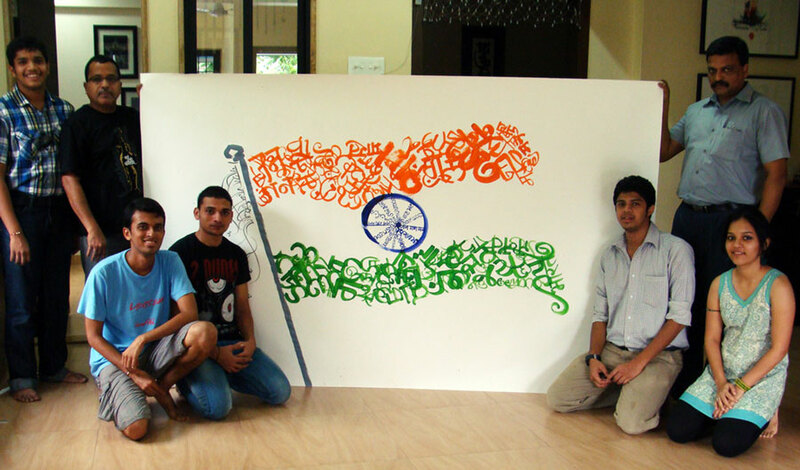 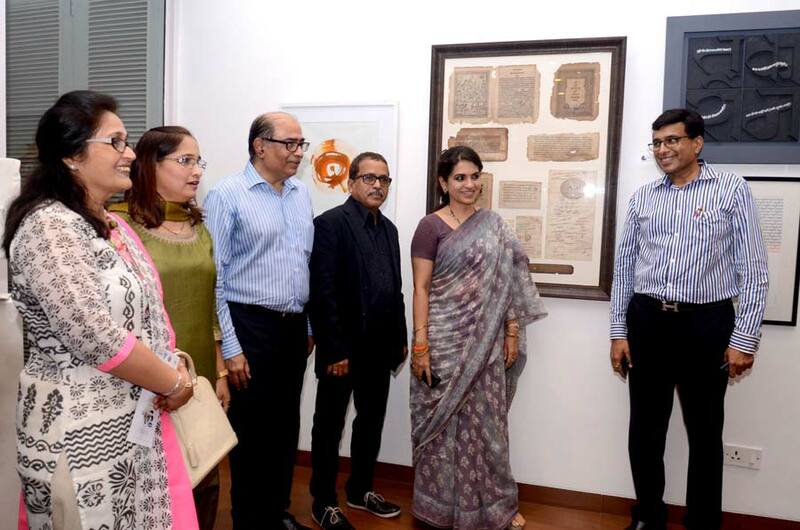 The Achyut Palav School of Calligraphy, which was established in the mid of 2009 is celebrating the spirit of calligraphy in a unique way. 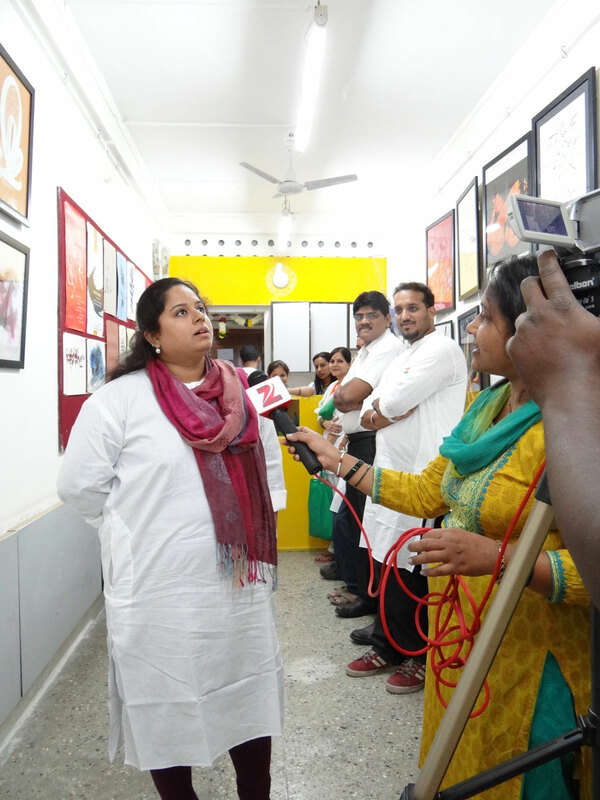 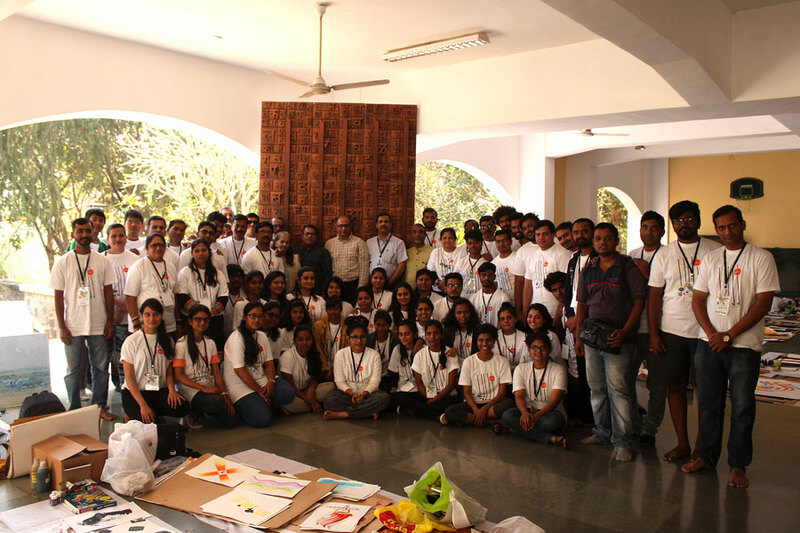 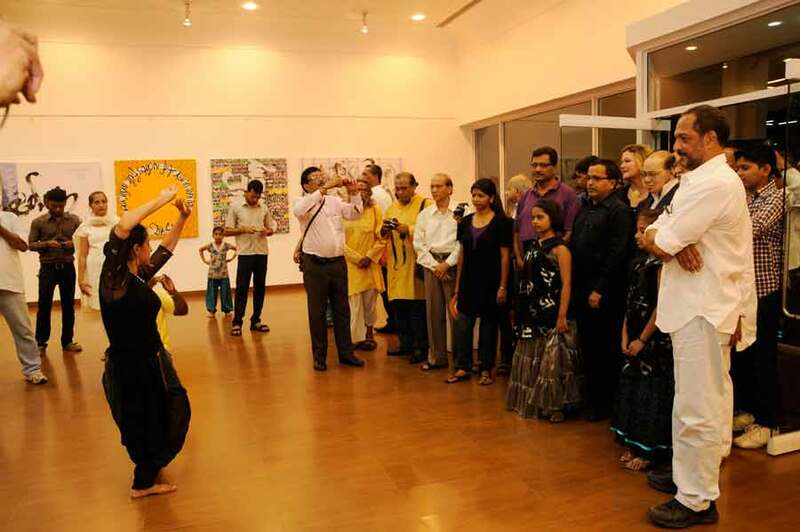 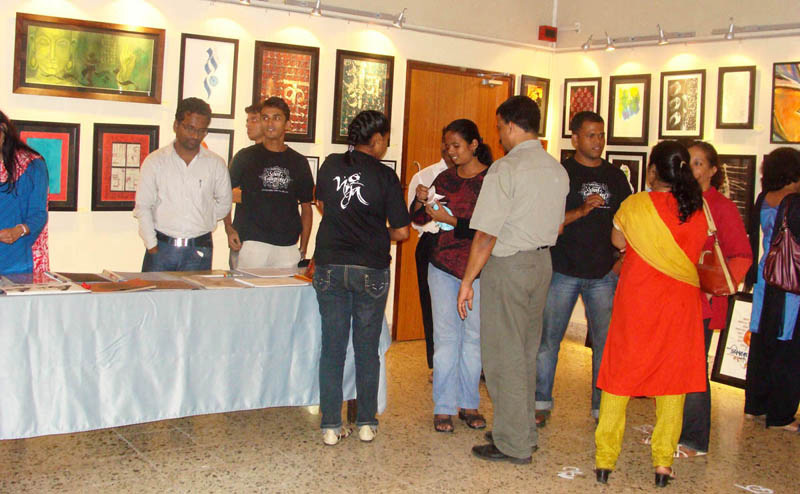 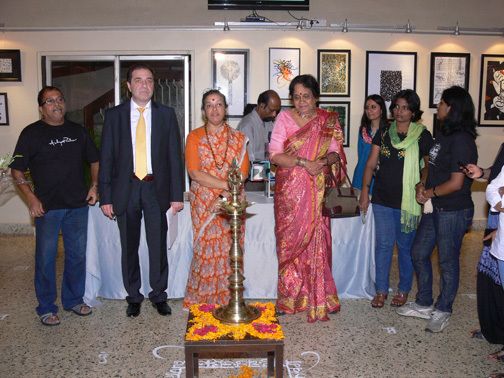 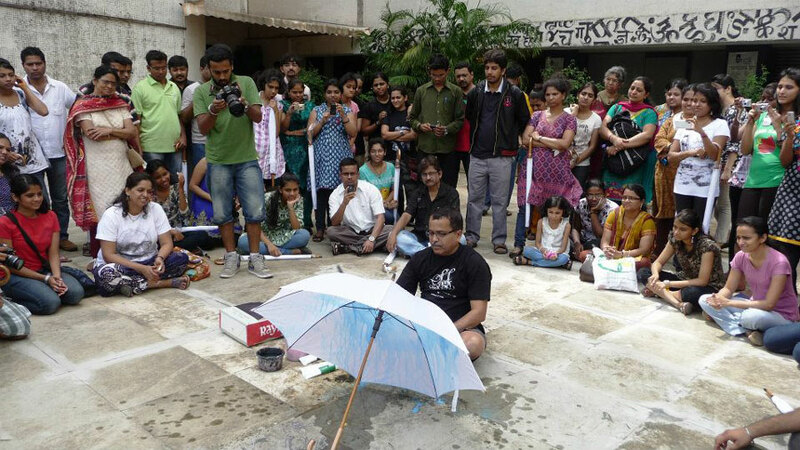 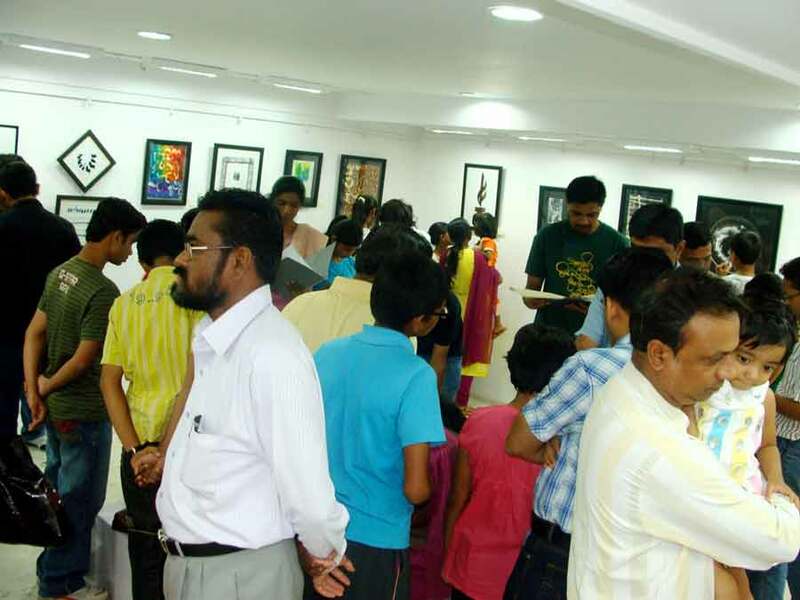 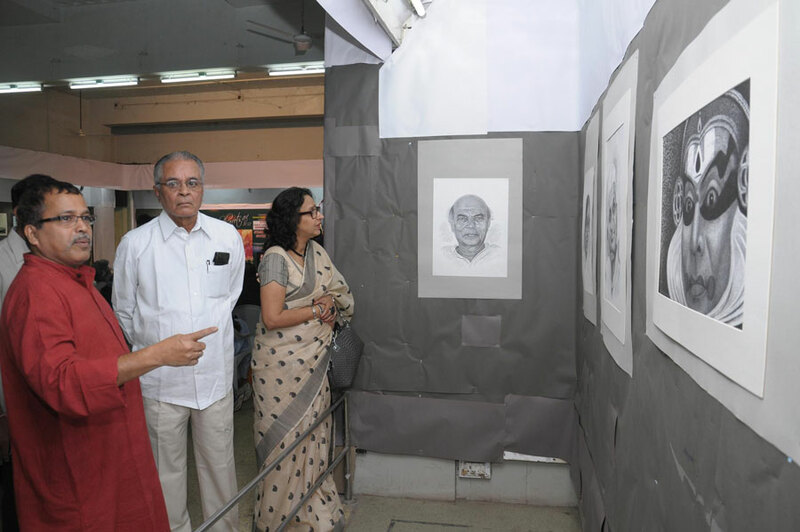 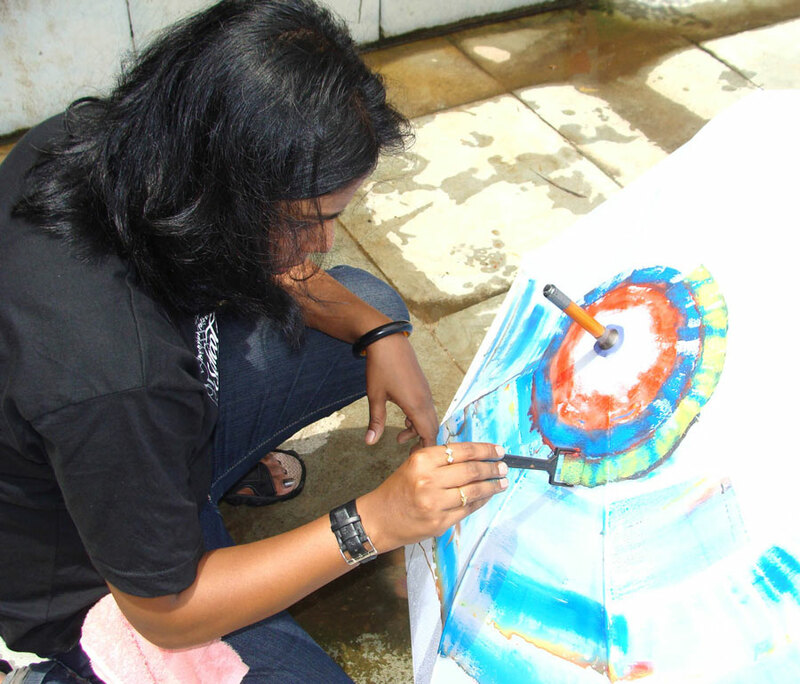 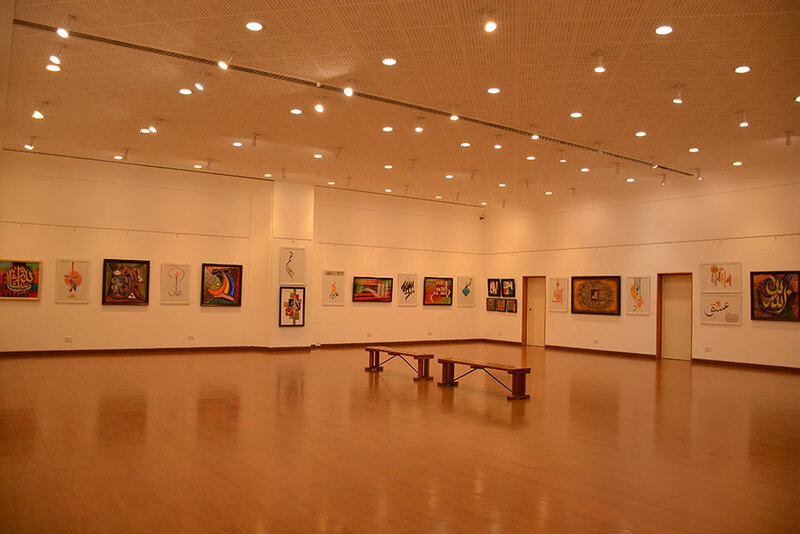 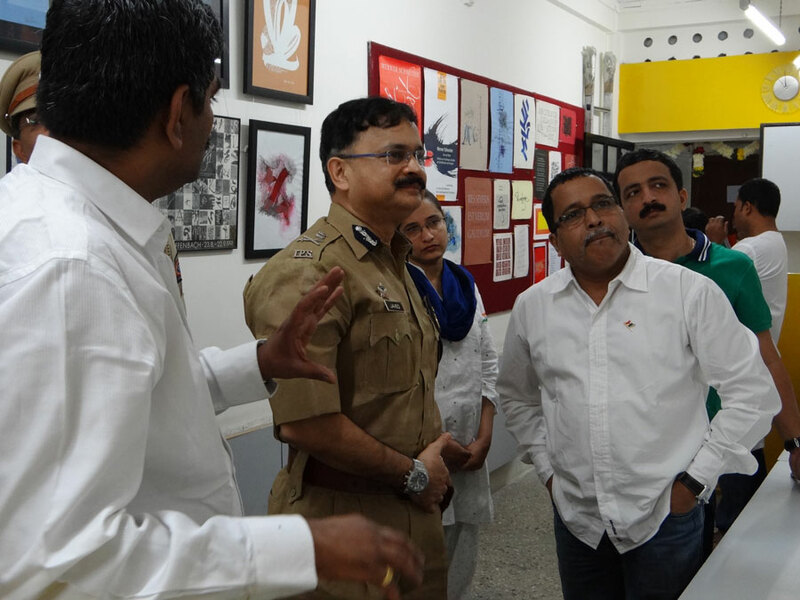 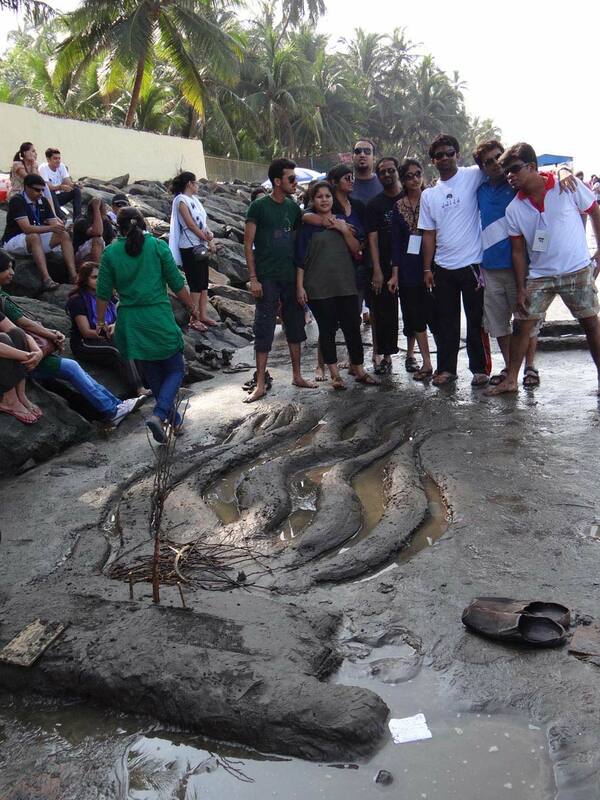 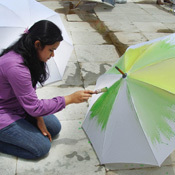 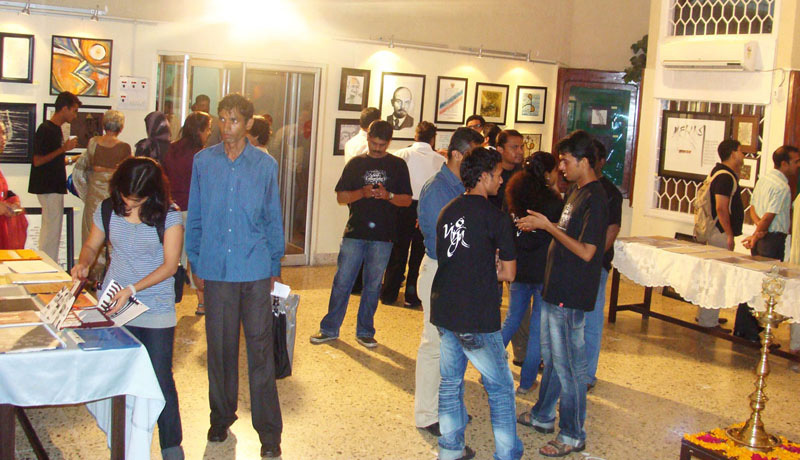 It is holding an exhibition that will showcase the works of its students from various batches. 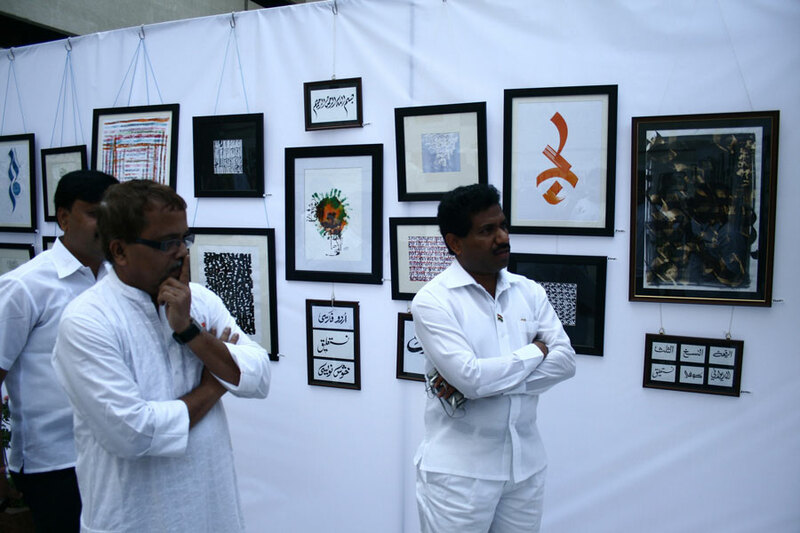 This exhibition, which is a part of the CIDCO's Navi Mumbai Festival, will prove to be an excellent platform for Calligraphy students. 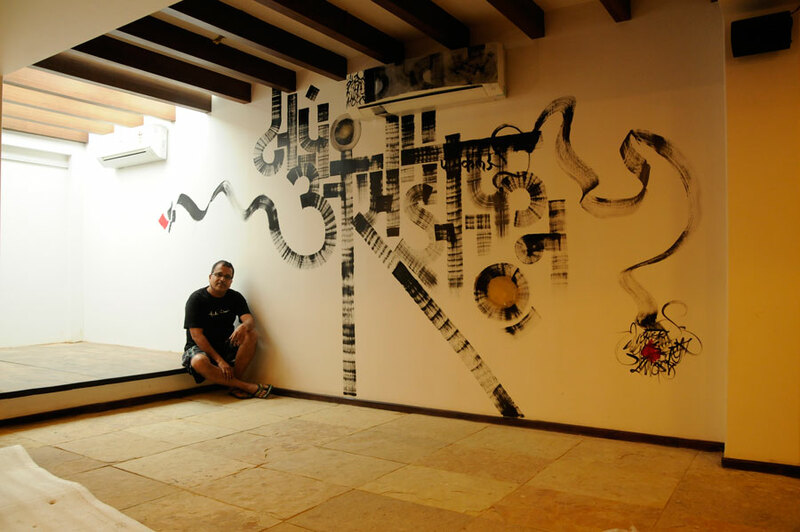 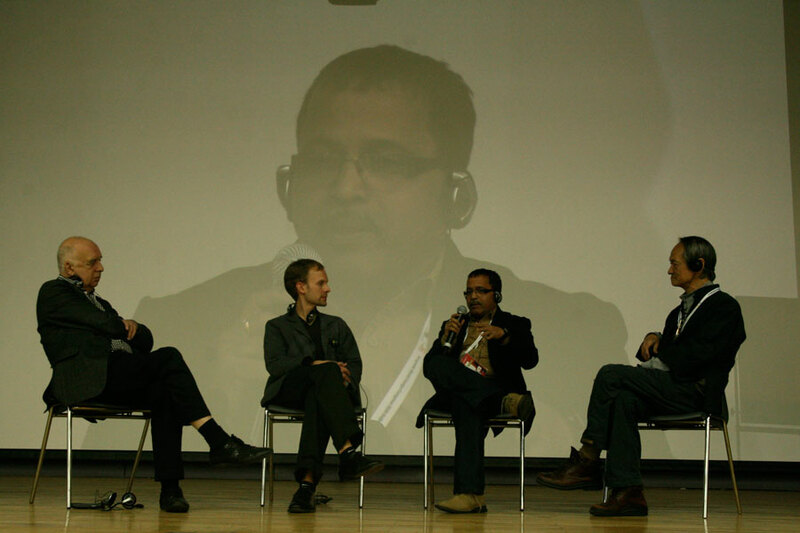 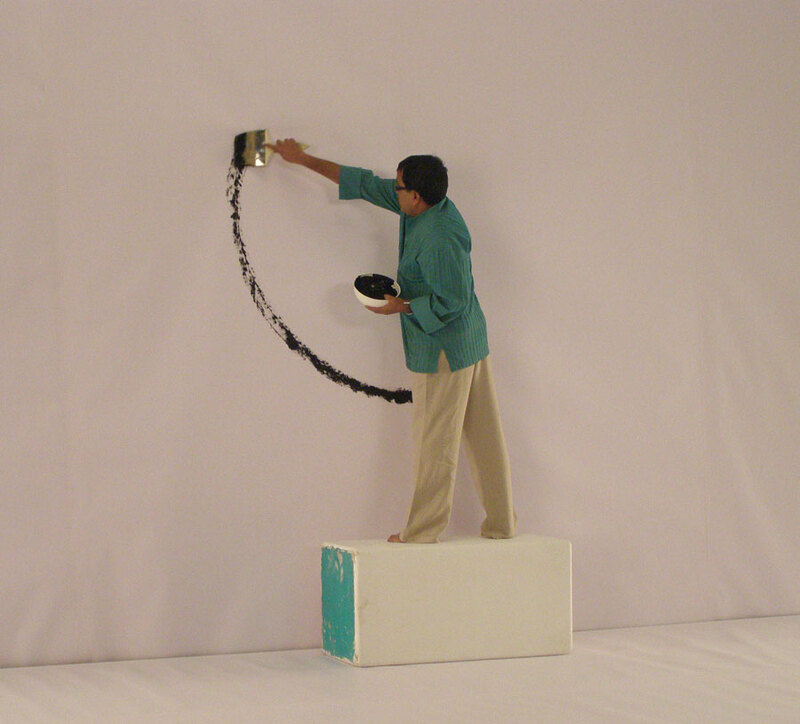 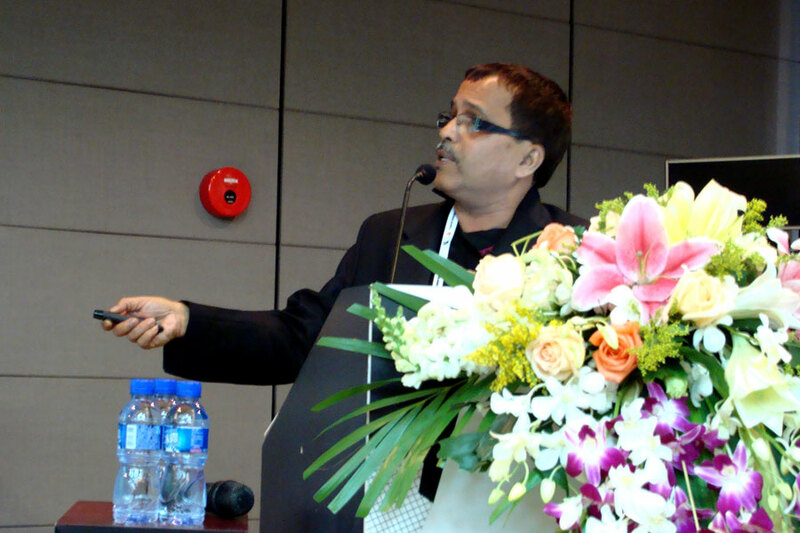 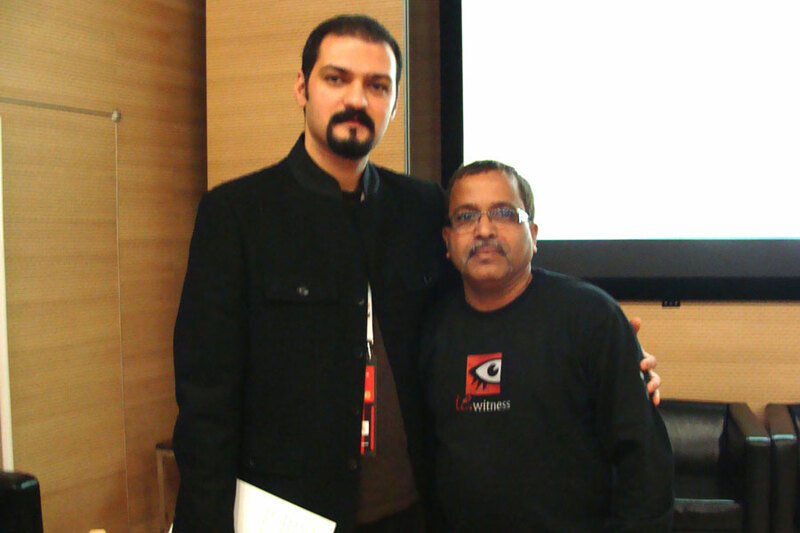 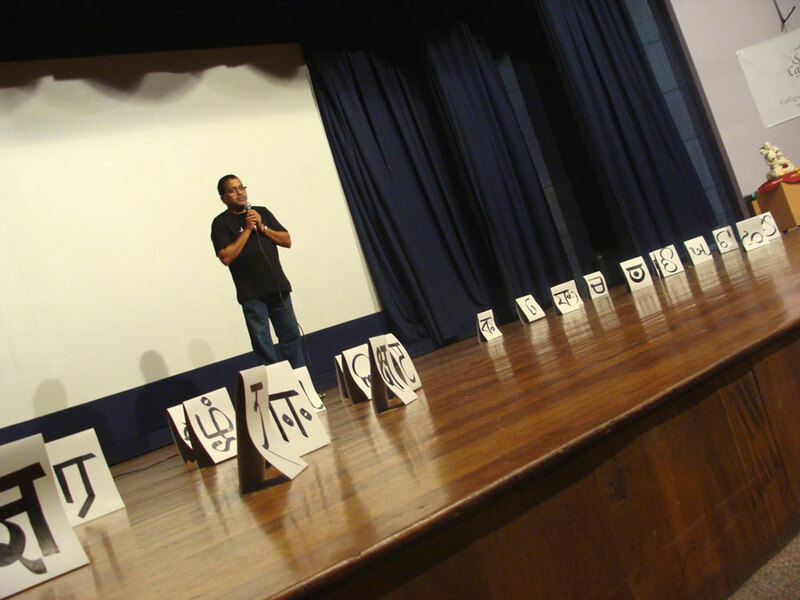 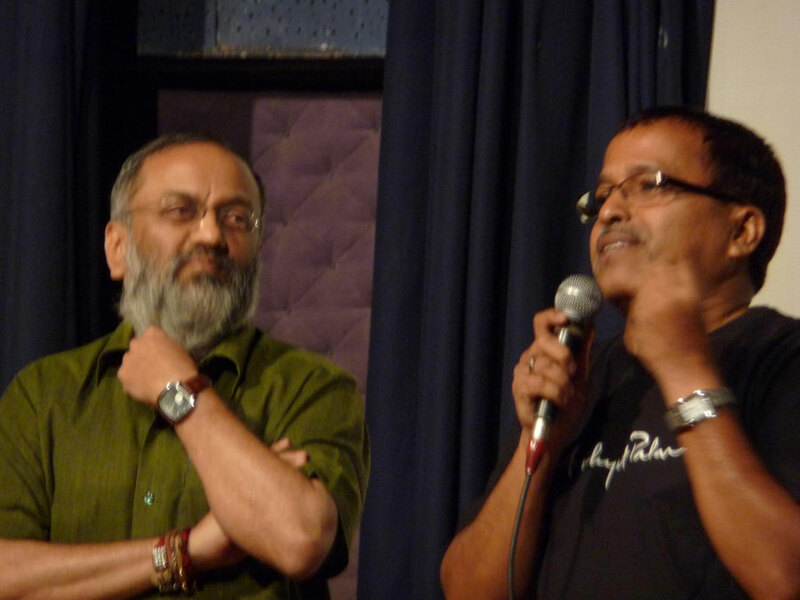 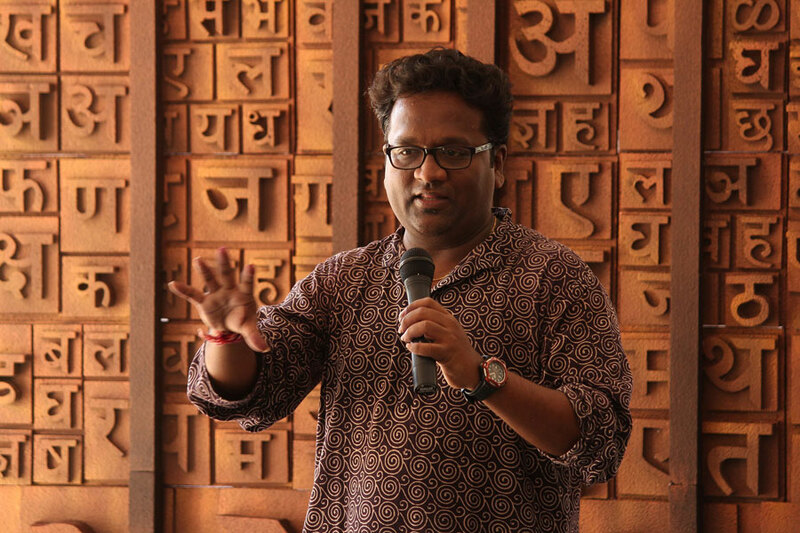 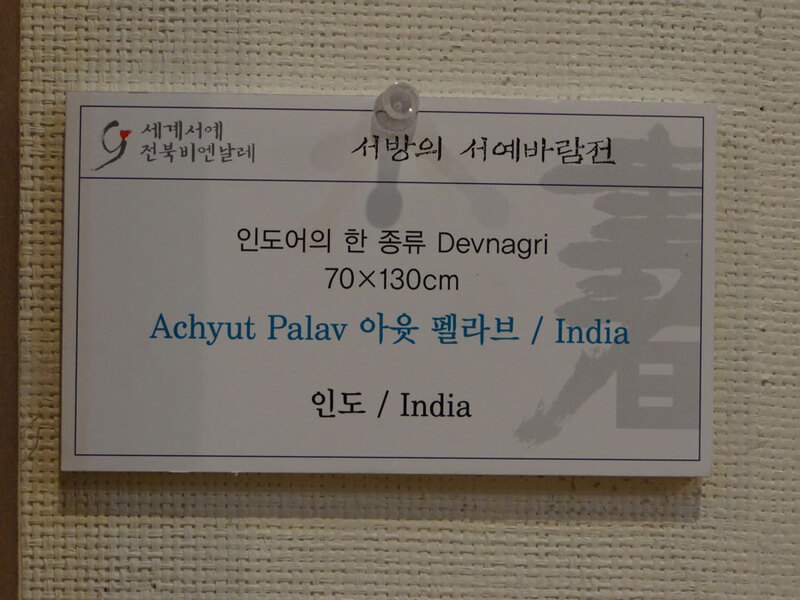 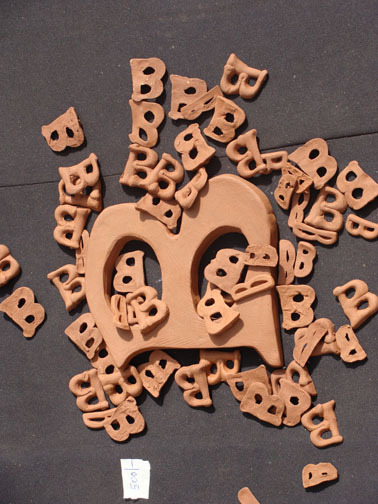 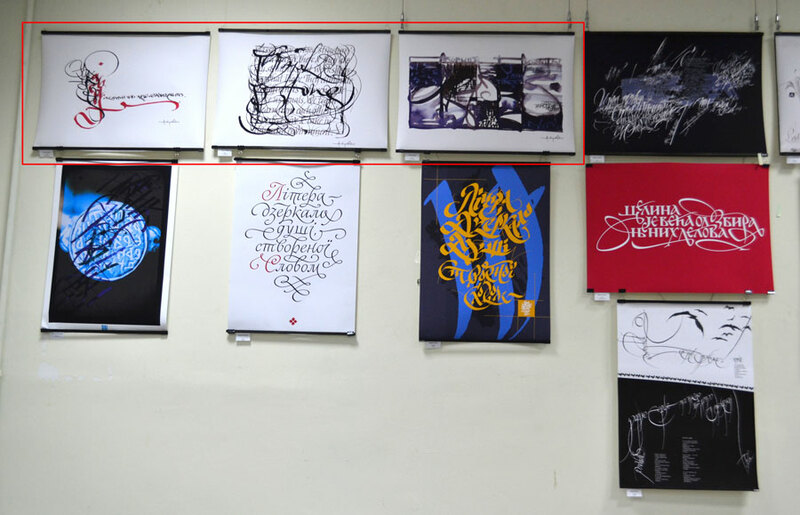 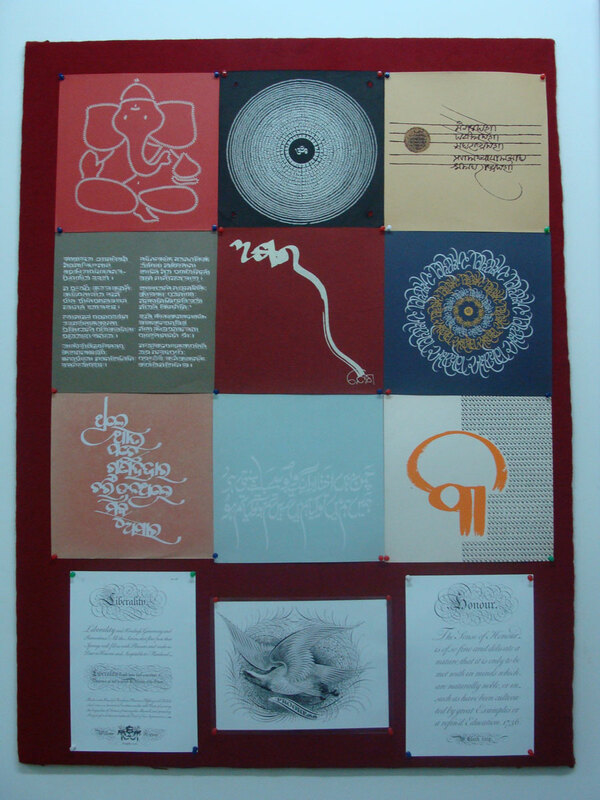 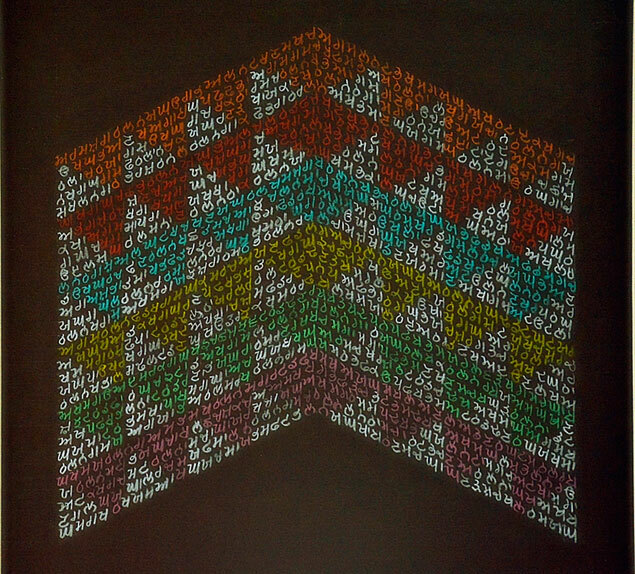 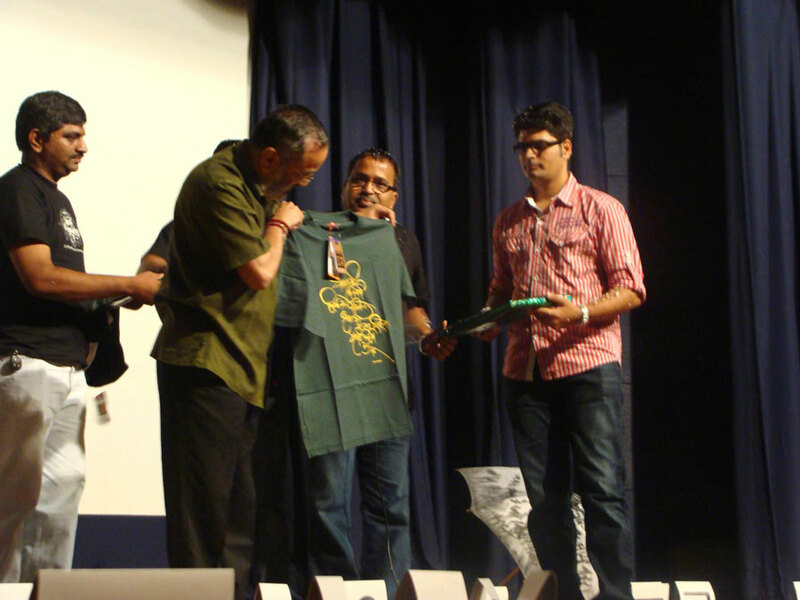 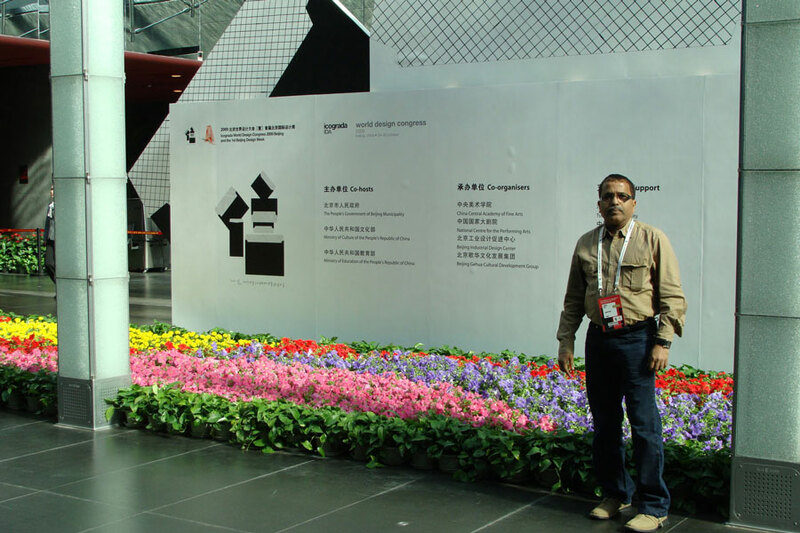 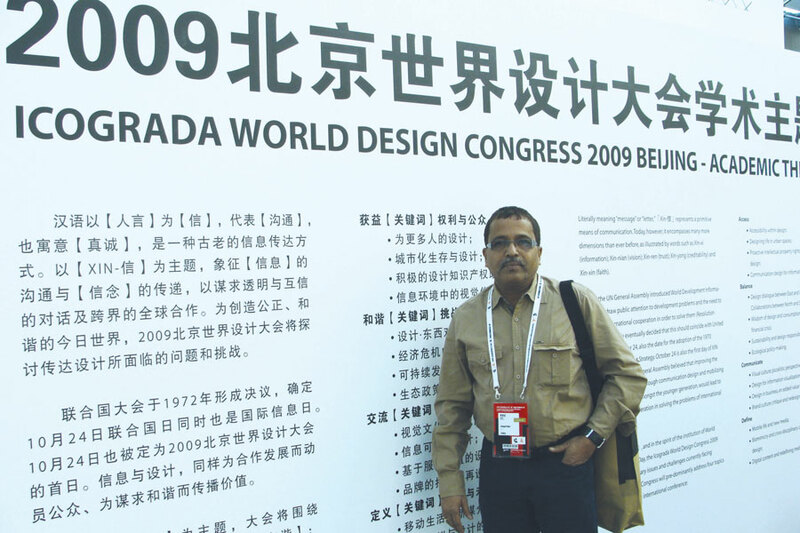 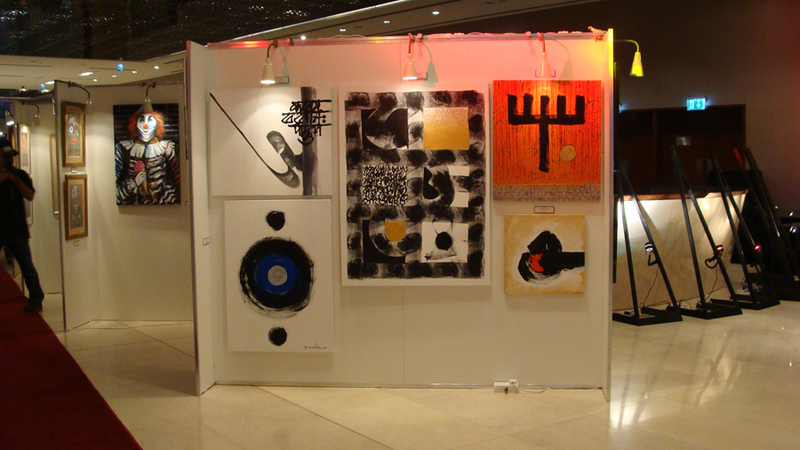 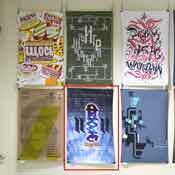 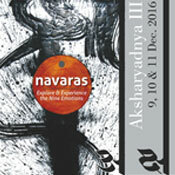 Achyut Palav was invited to speak at the XIN: ICOGRADA WORLD DESIGN CONGRESS 2009 and his works were a part of the exhibition at the Typography Unity With New Life - bt 09 Exhibition. 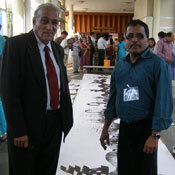 The title of his presentation was 'Calligraphy- a Voice of an Expressive Nation'. 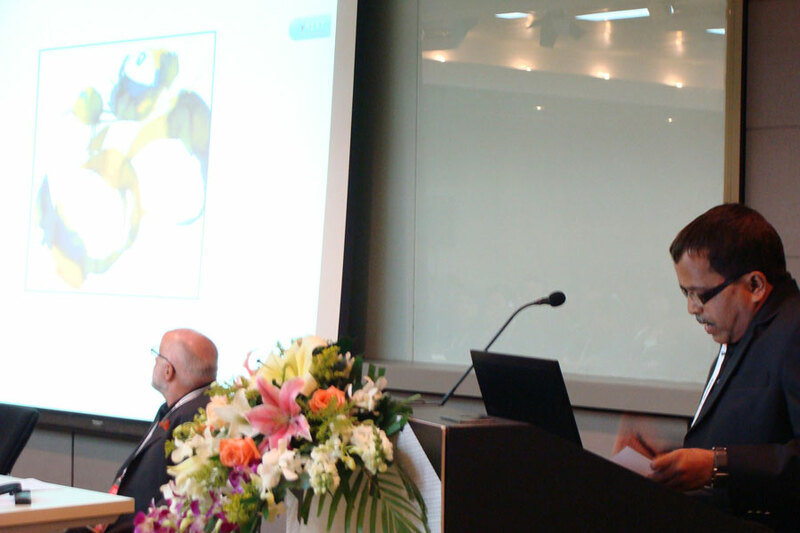 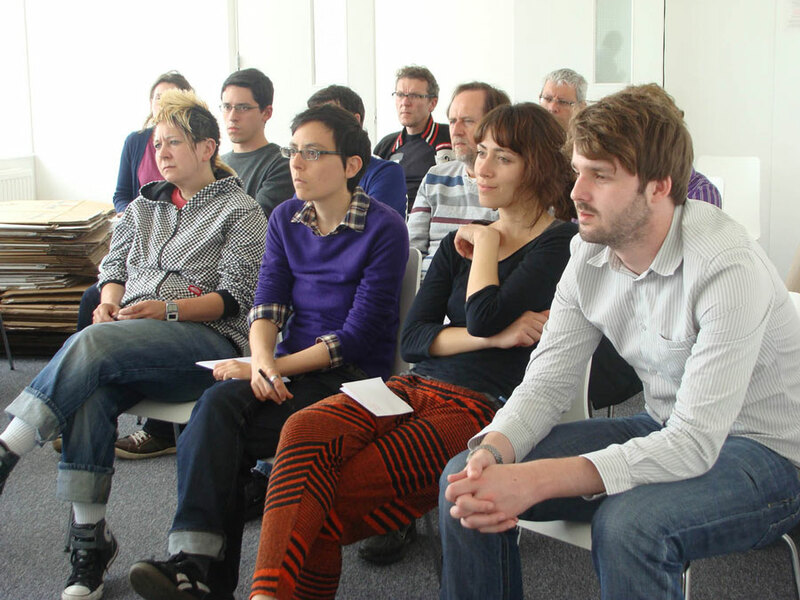 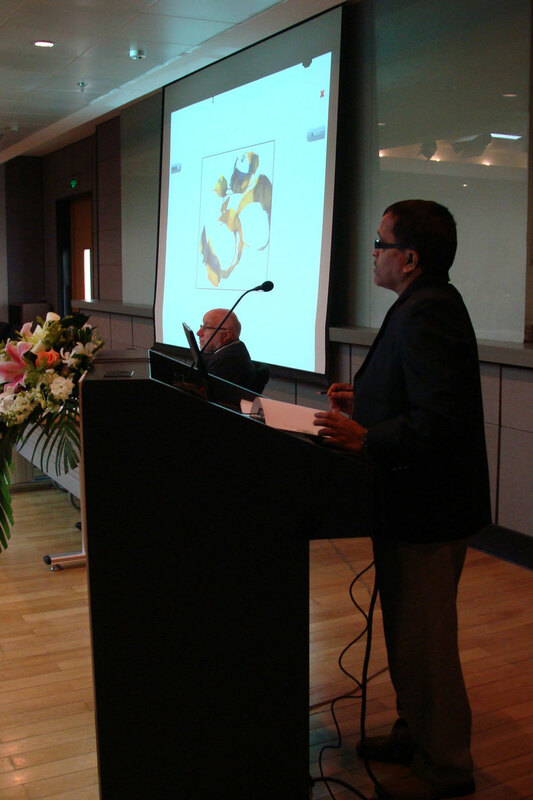 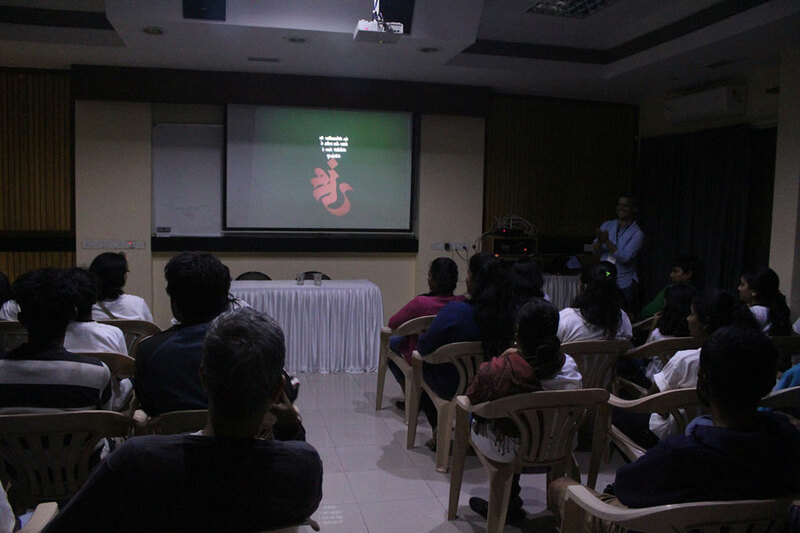 The presentation comprises of a talk, slideshow & a short AV. 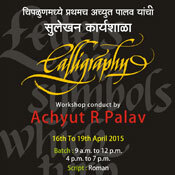 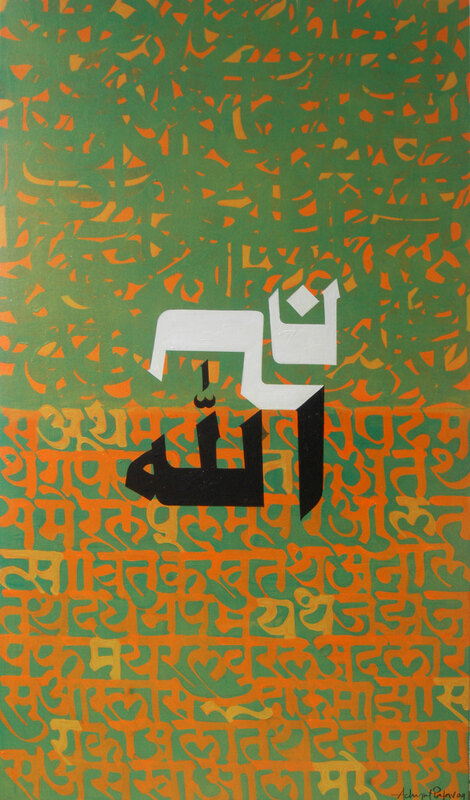 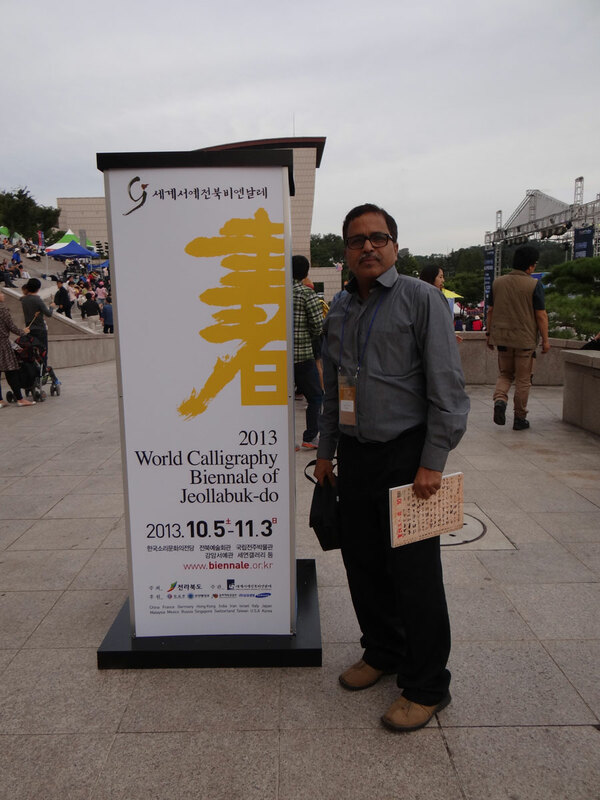 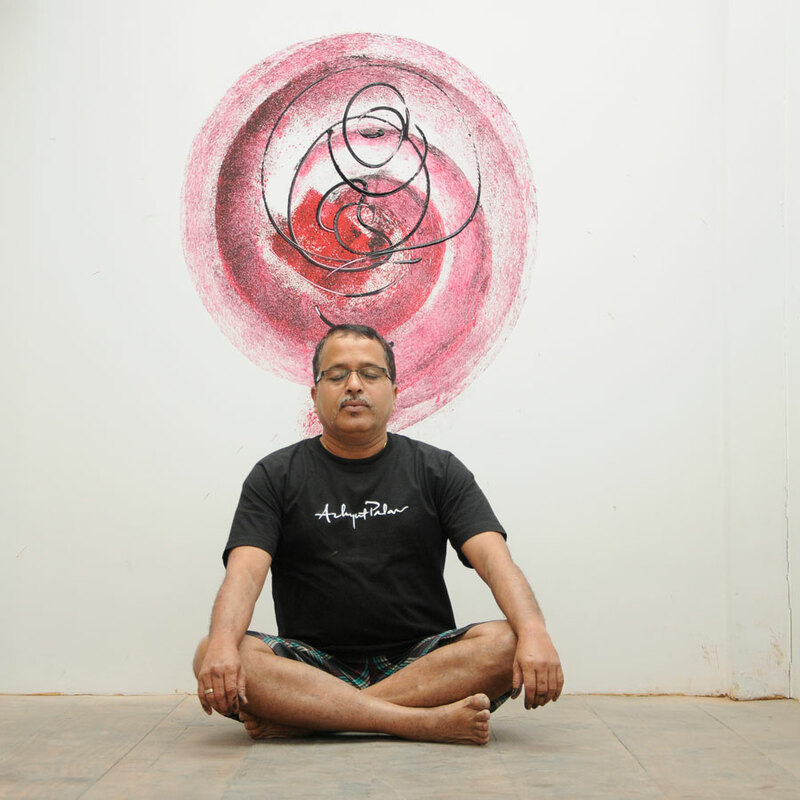 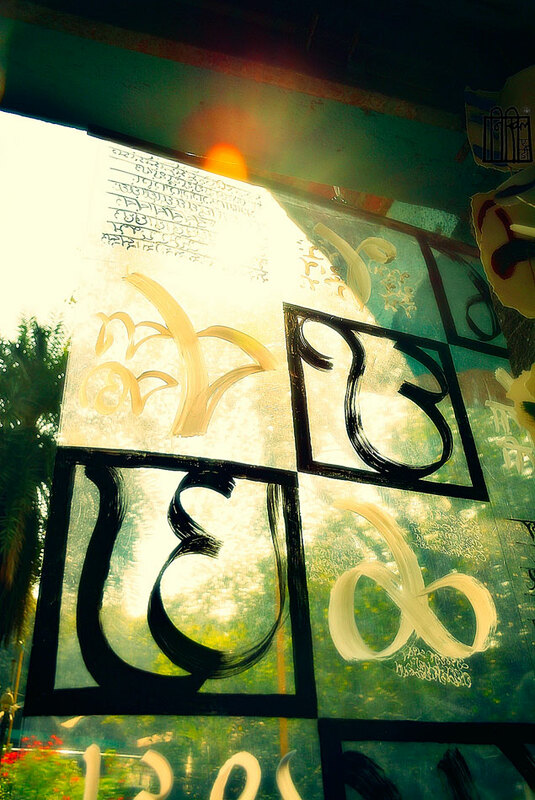 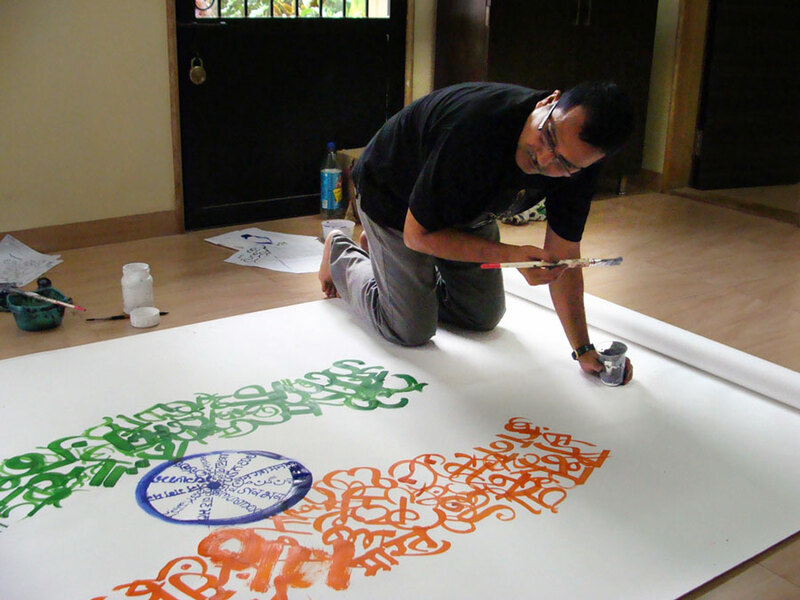 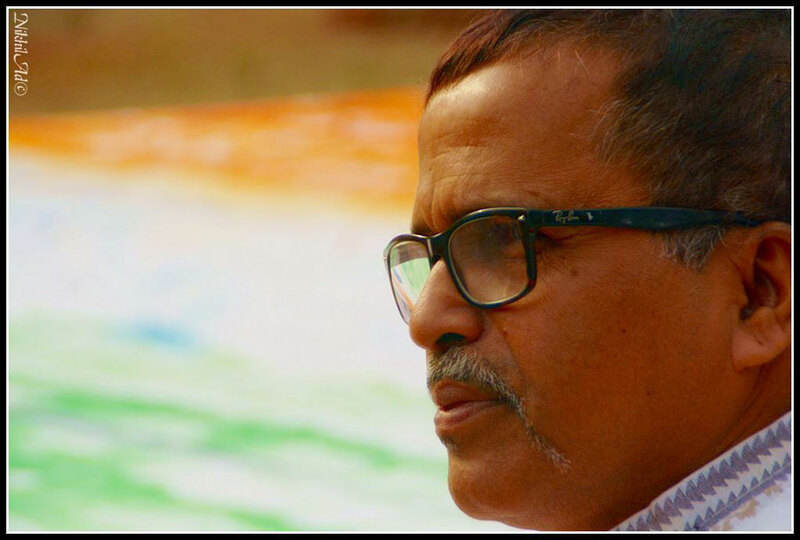 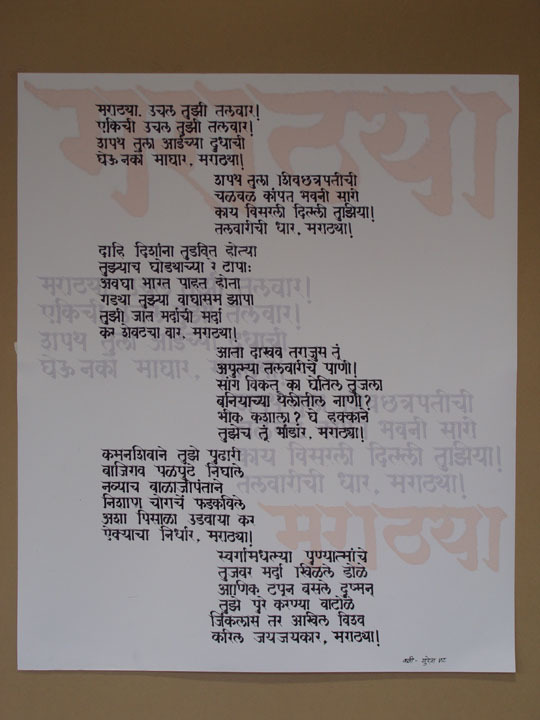 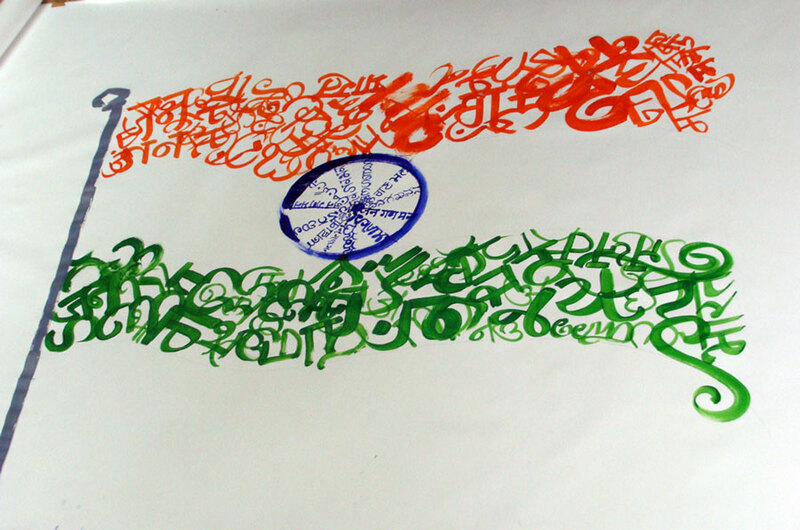 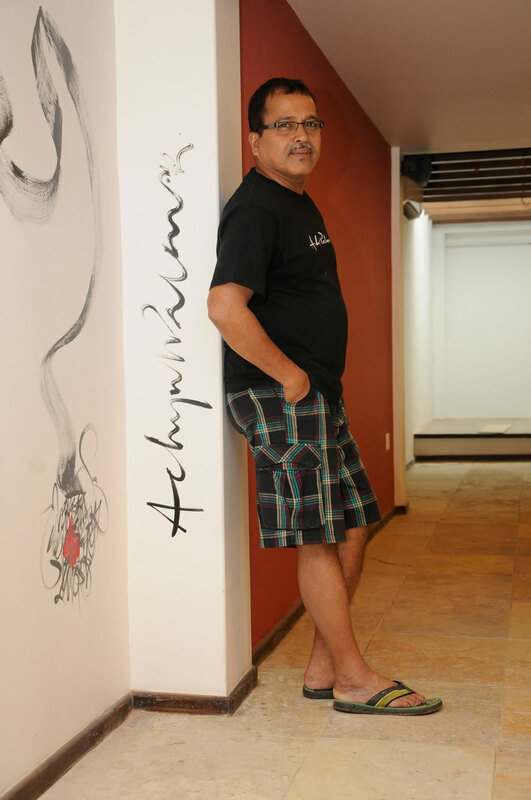 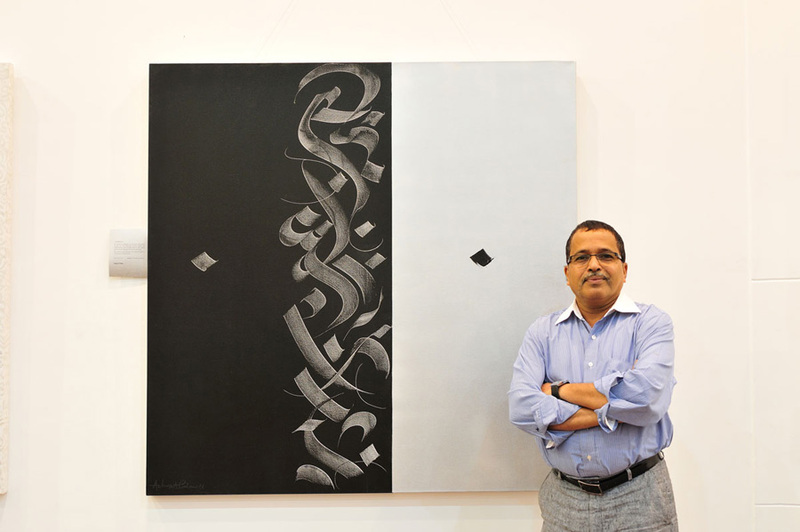 Achyut Palav has been working for the development & propagation of calligraphy. 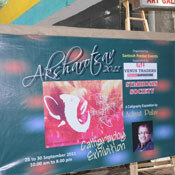 AksharGanesh an exhibition dedicated to the Vighnaharta Ganpati is to be held in the month of August' 09. 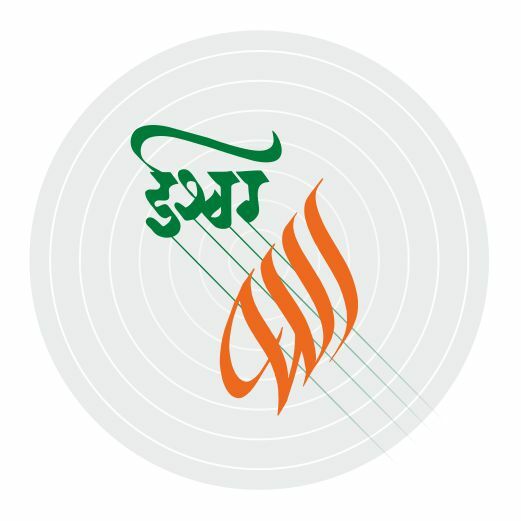 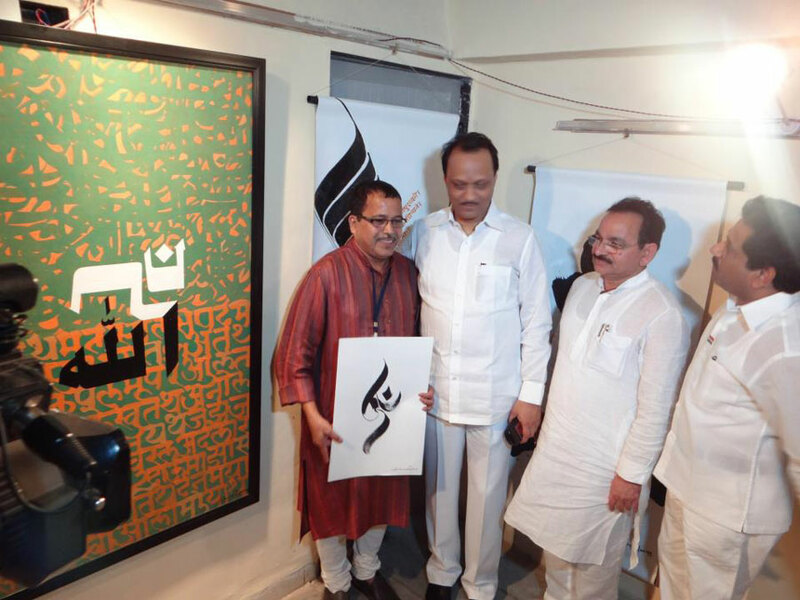 It is the initiative of Urja- The calligraphic Movement & is held at the Achyut Palav School of Calligraphy in Navi Mumbai. 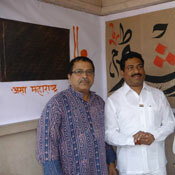 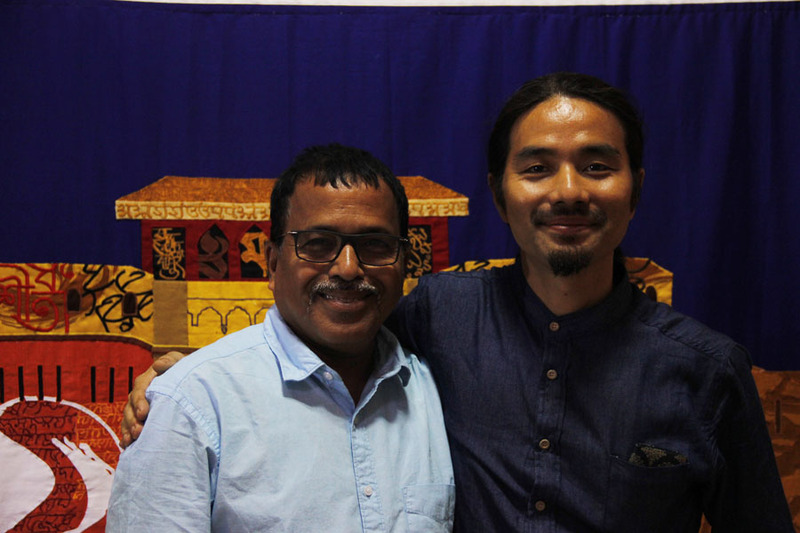 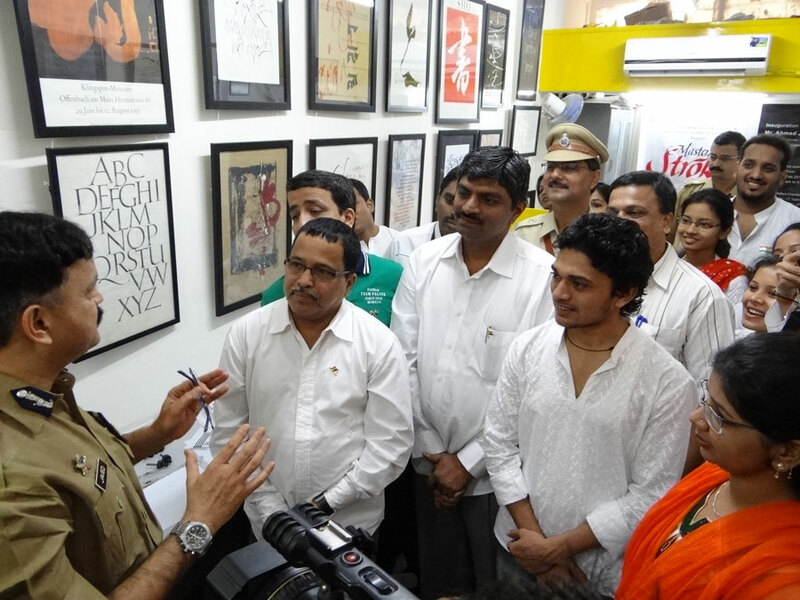 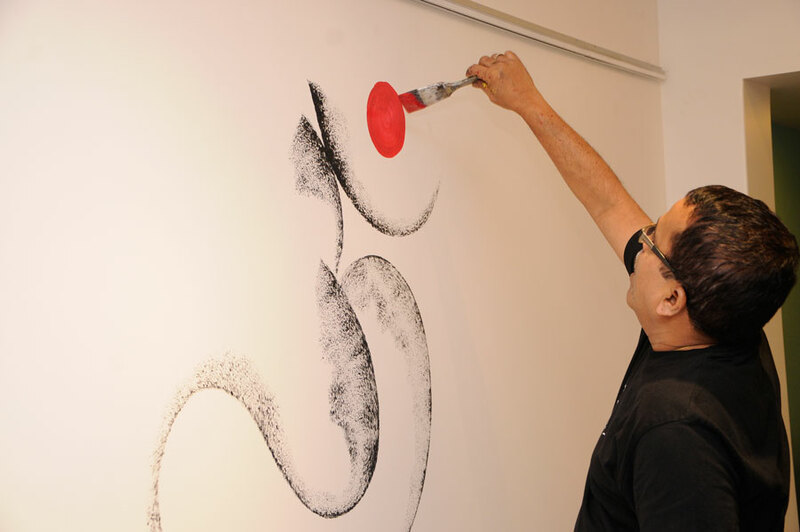 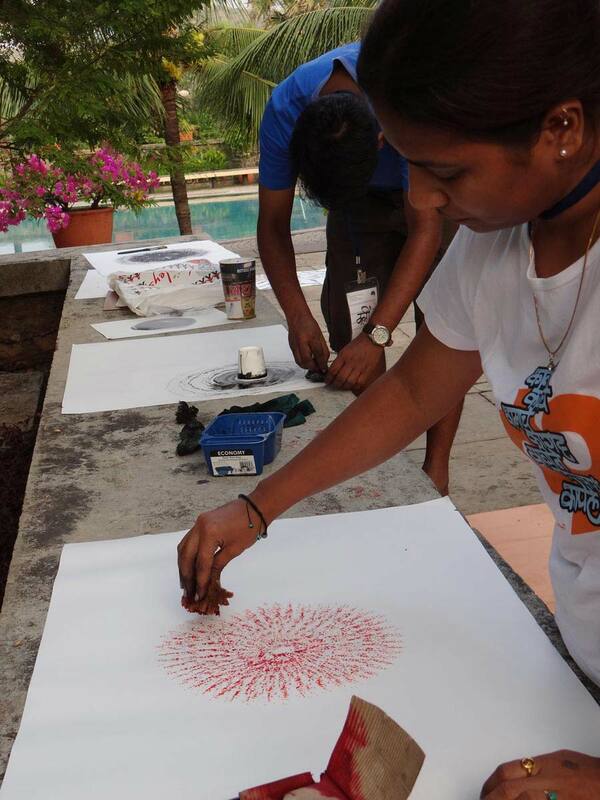 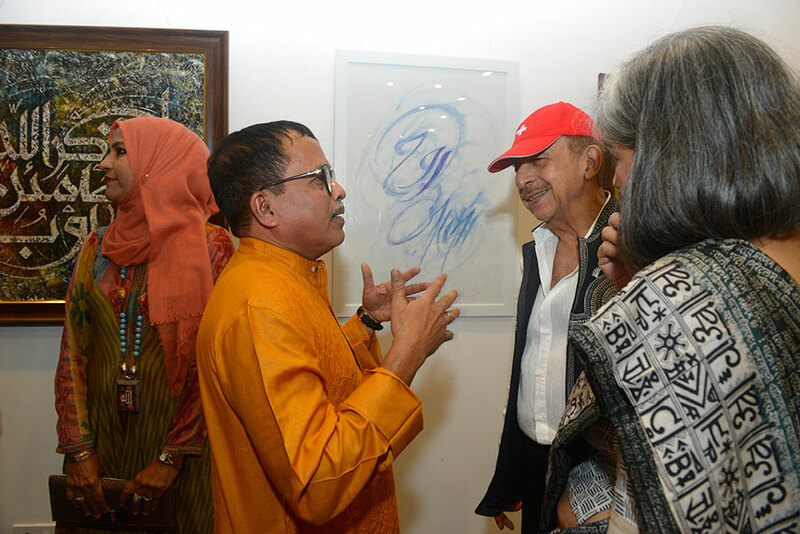 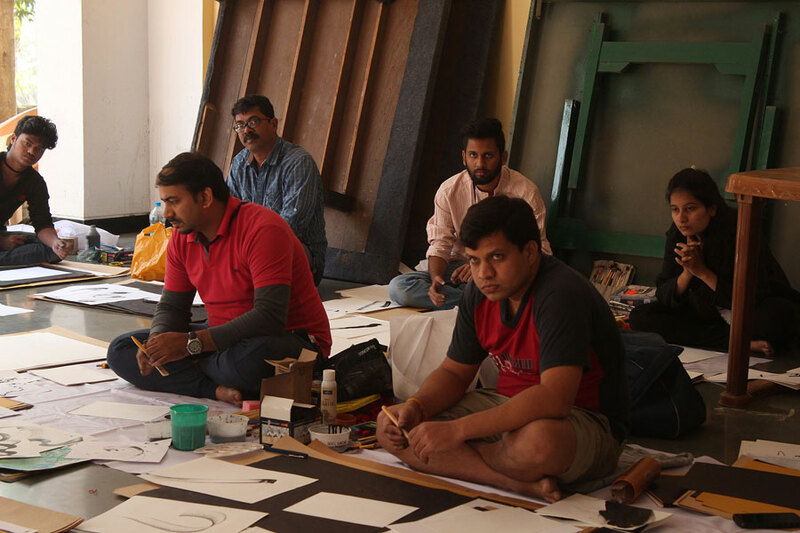 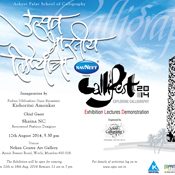 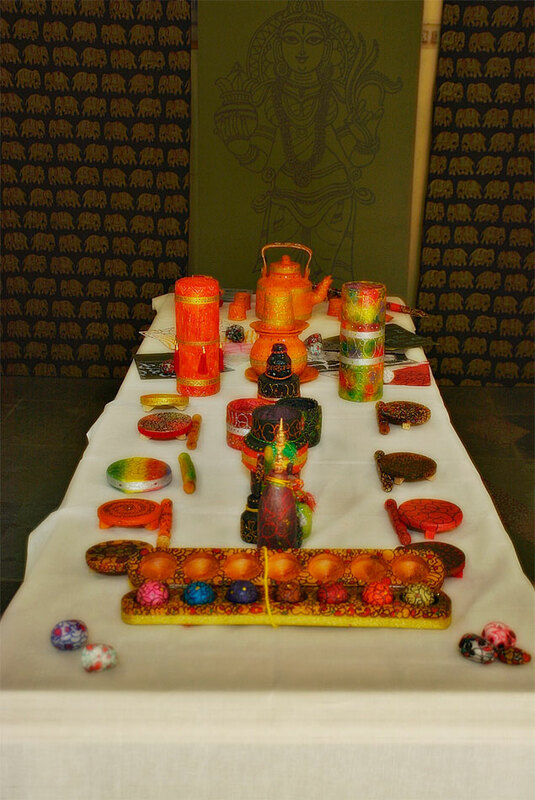 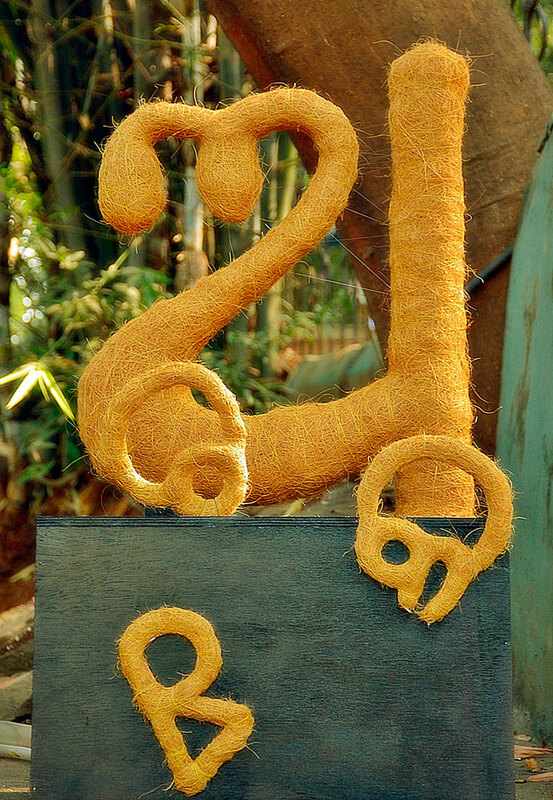 The exhibition will have paintings, sculptures & other artworks of lord Ganesh in calligraphic. 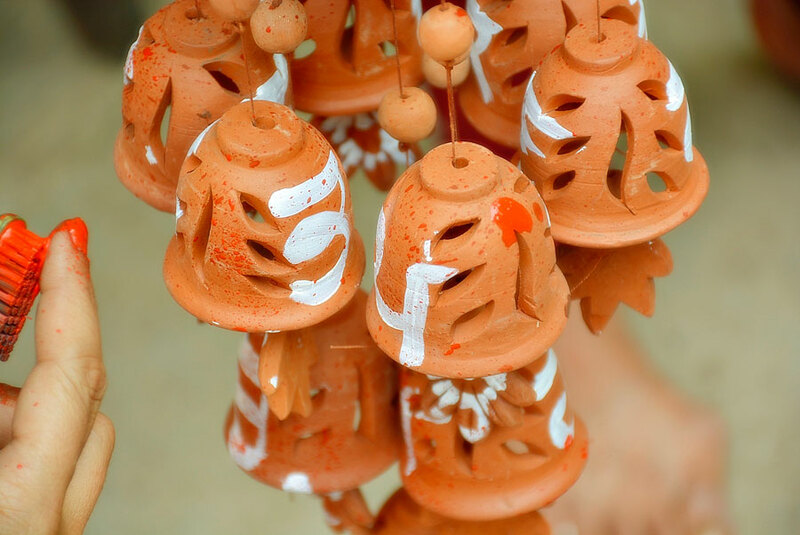 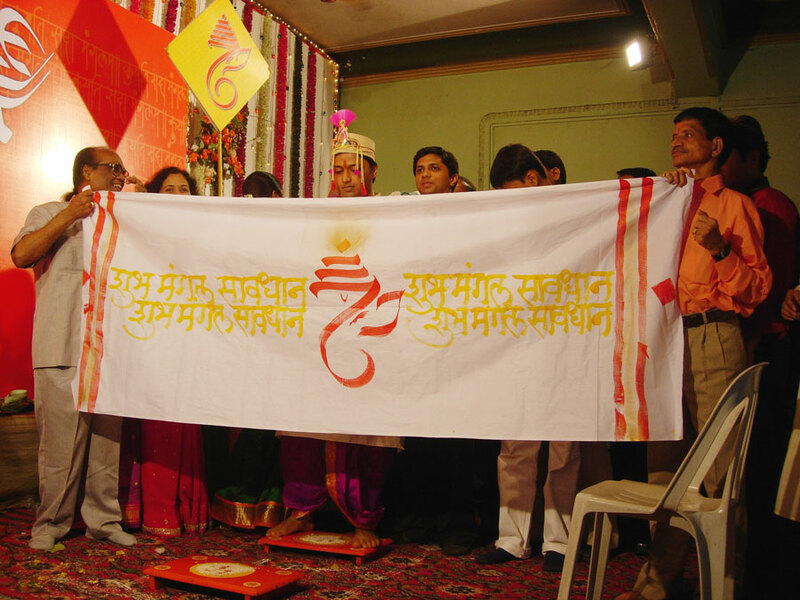 The Lord Ganesh appears to us in various forms, each name of the almighty tells a different story of him. 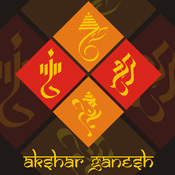 He is after all the god of intelligence & talent & he is the start... an auspicious beginning of all good things. 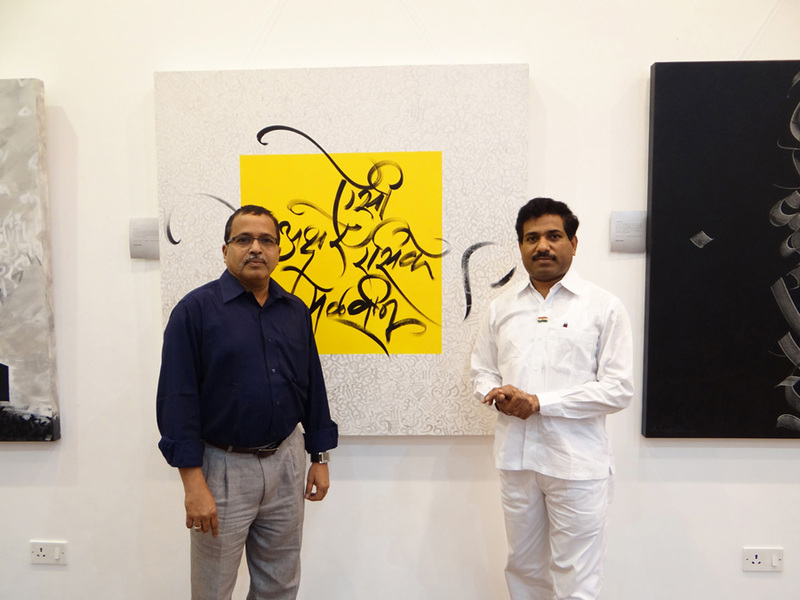 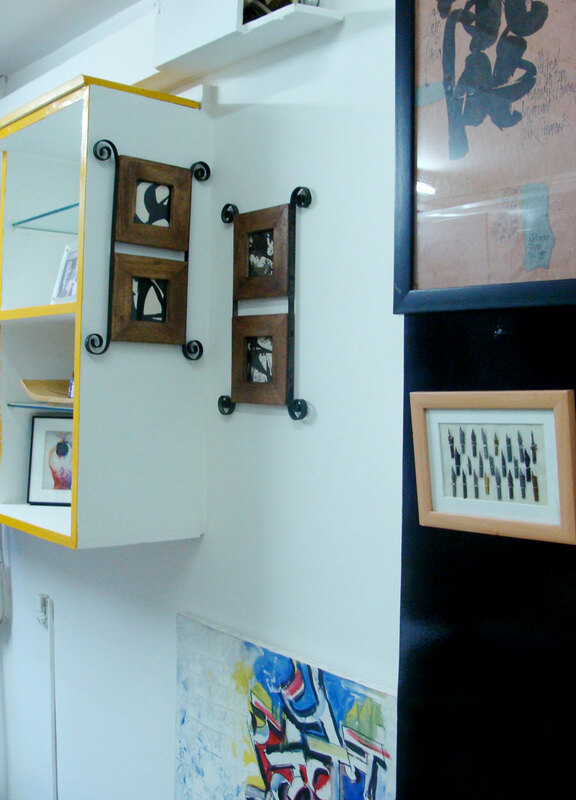 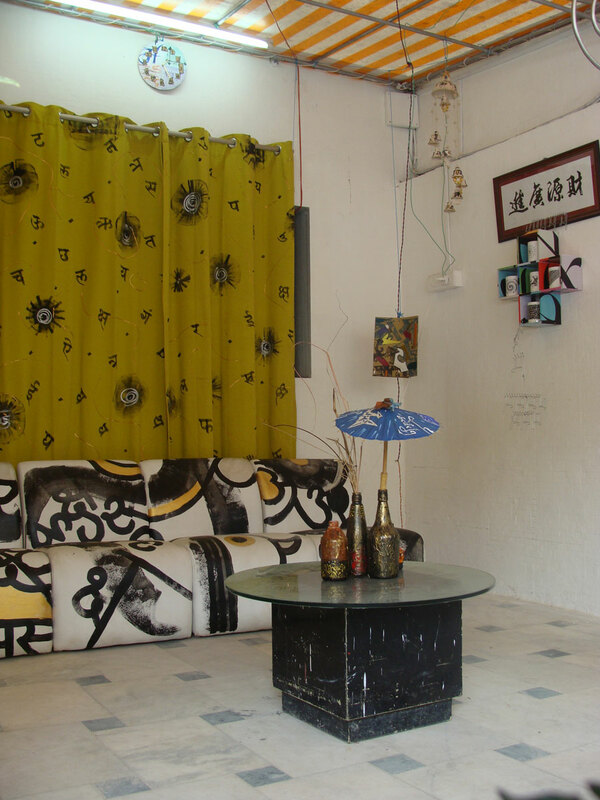 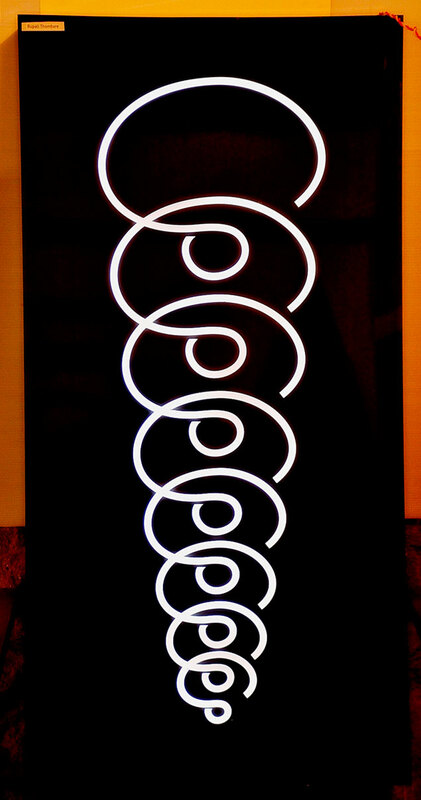 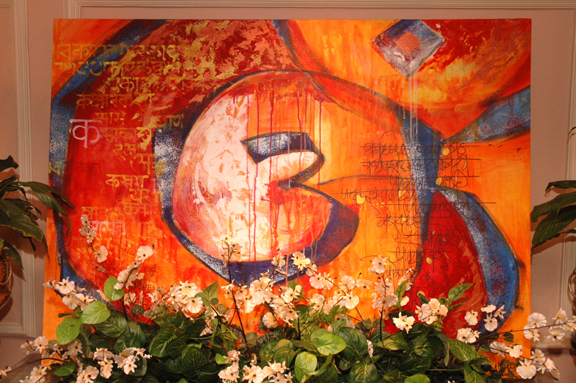 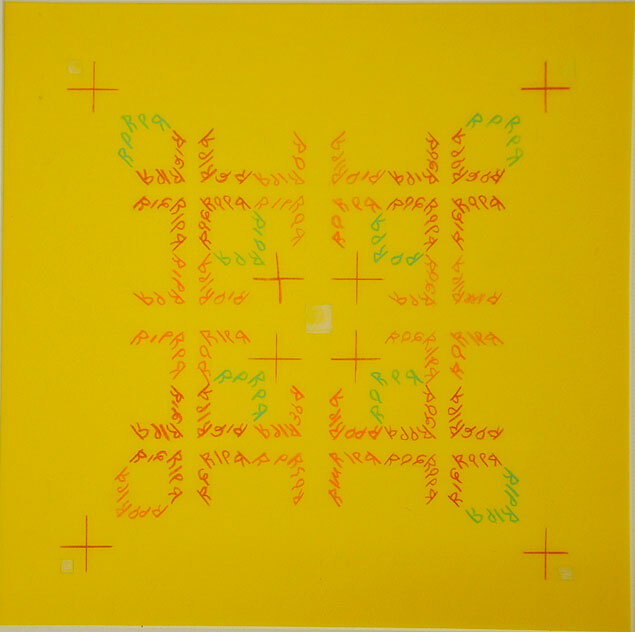 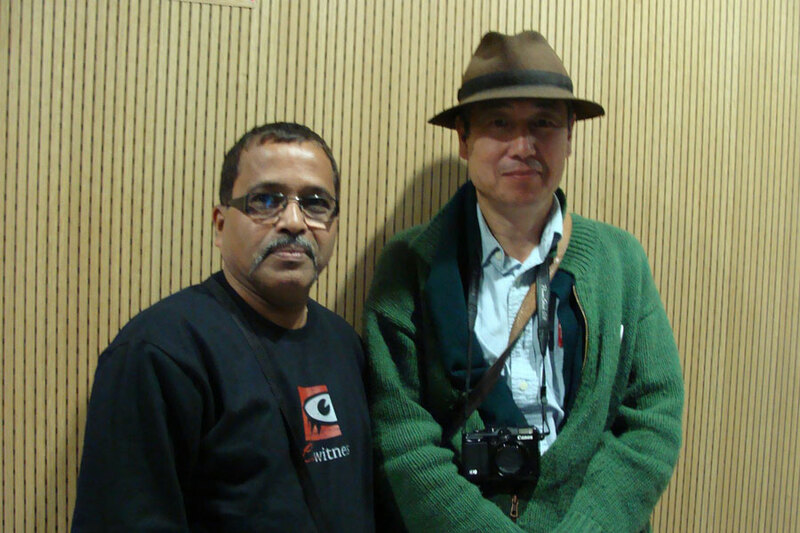 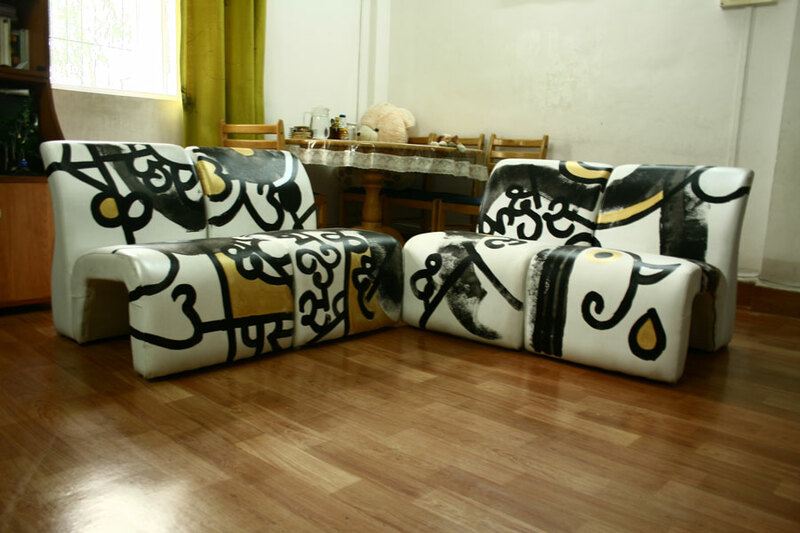 The inspiration one derives from him manifests in various artworks that we are exhibiting. 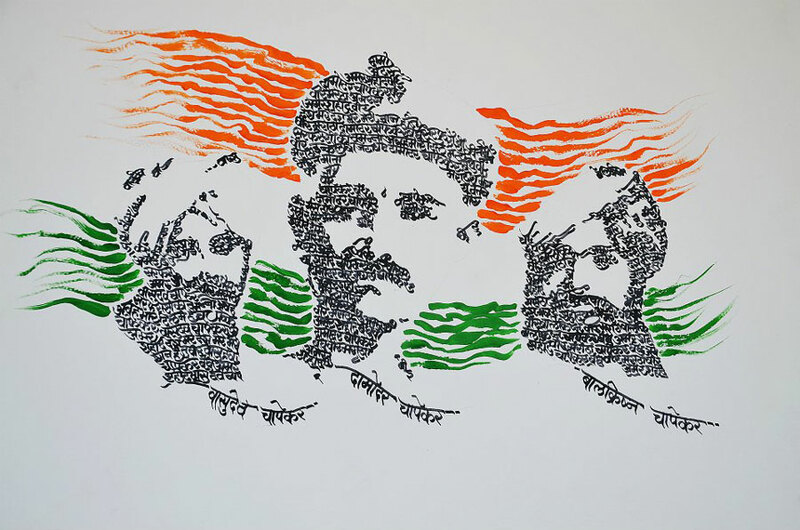 The unity & spirit the entire nation feels & the jubilation during those 10 or 11 days is simply marvelous & no artist can stay away from it. 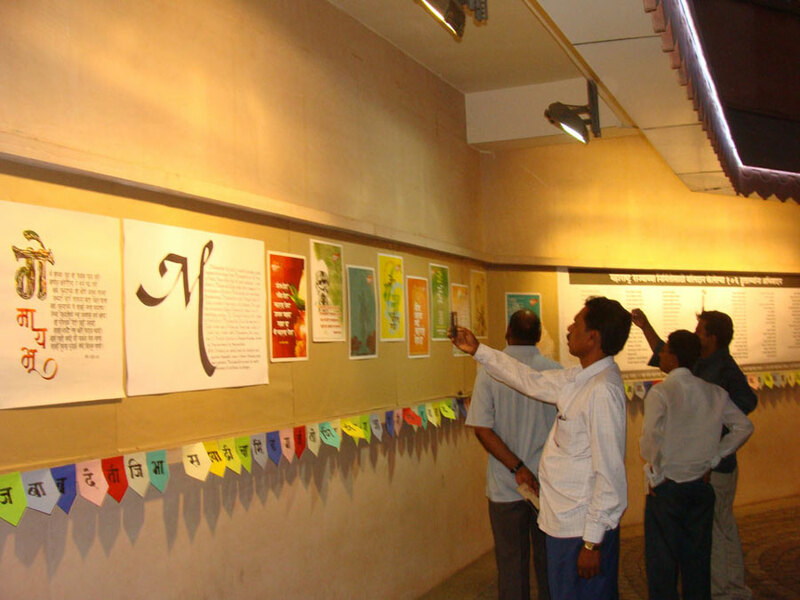 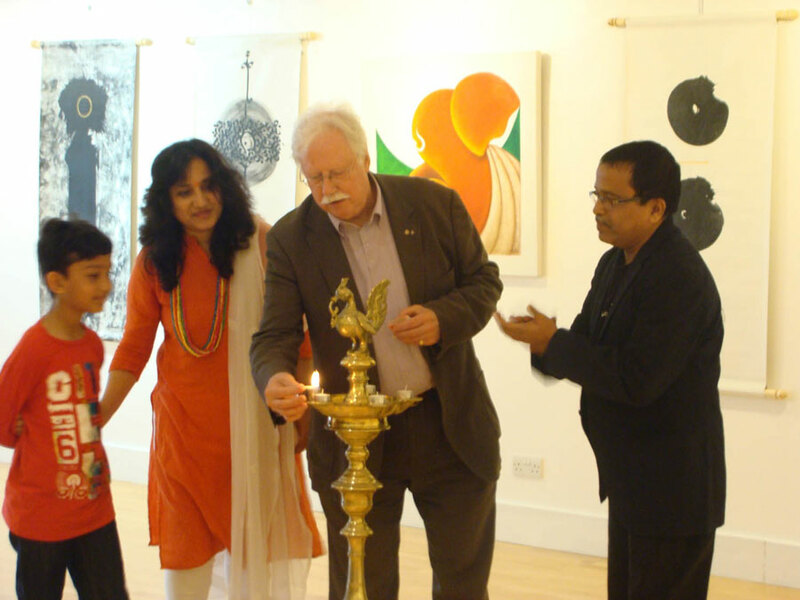 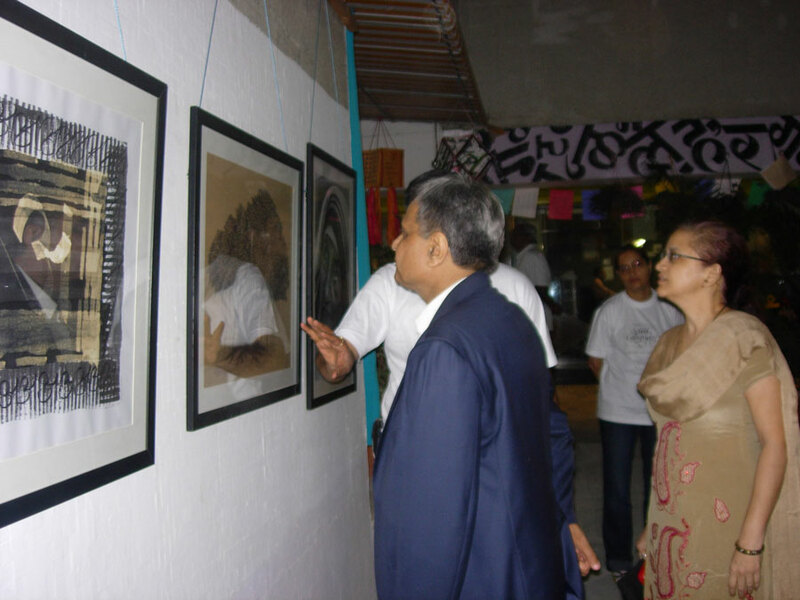 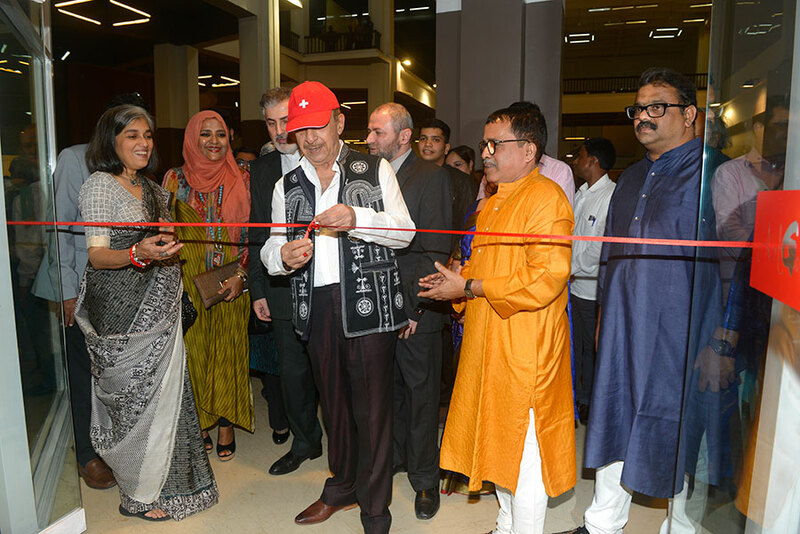 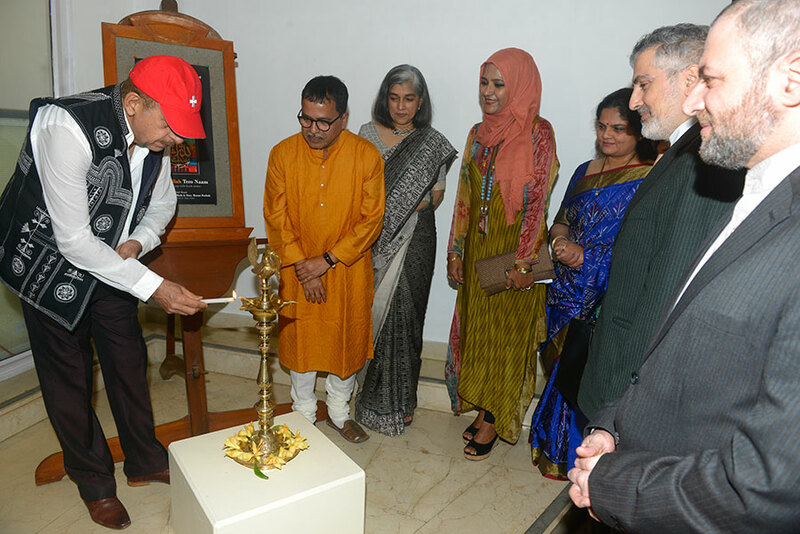 The exhibition OM & Allah was inaugurated on 6th August, 09 by Pt. 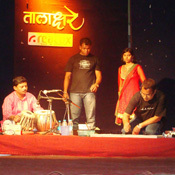 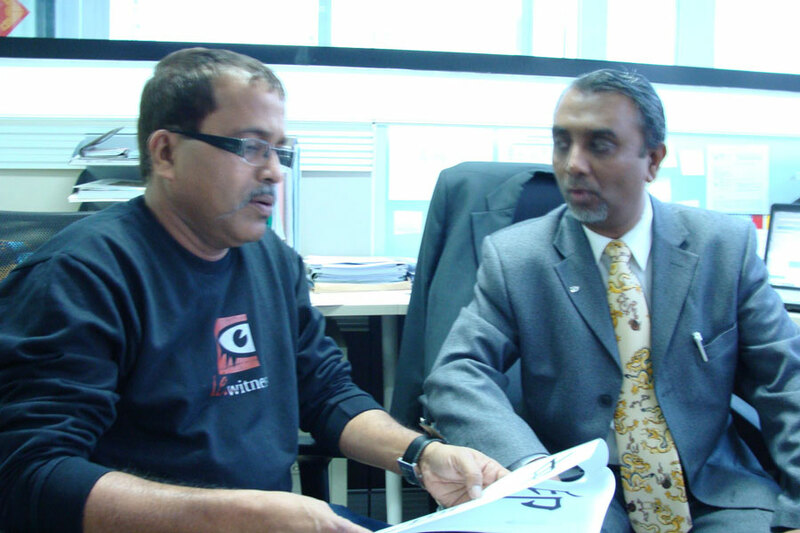 Jasaraj & M.P. 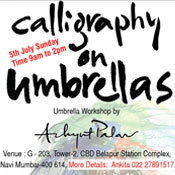 Mrs. Priya Dutt. 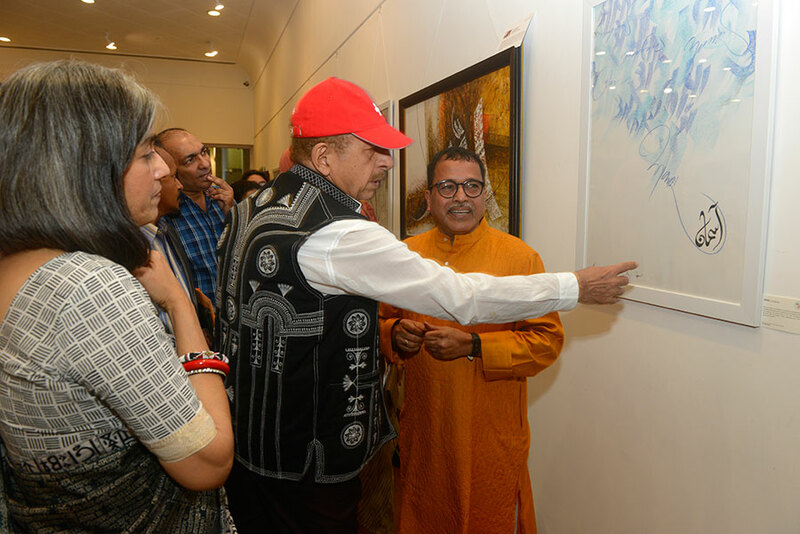 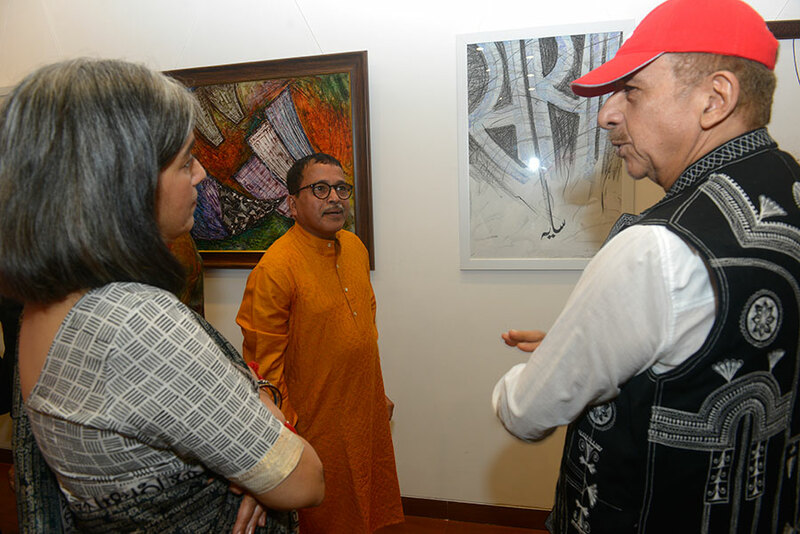 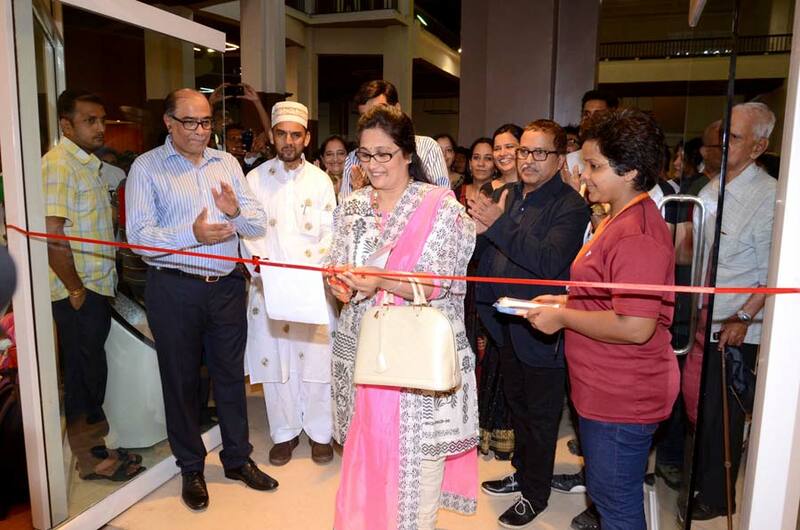 The event witnessed the presence of eminent personalities like Madhura Jasraj, Talat Aziz, Laila Khan, Sussane Roshan, Poonam Dhillon, Pooja Bedi, Sanjay Khan, Kiran Juneja & other art lovers & patrons. 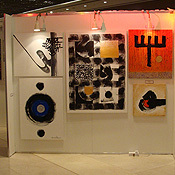 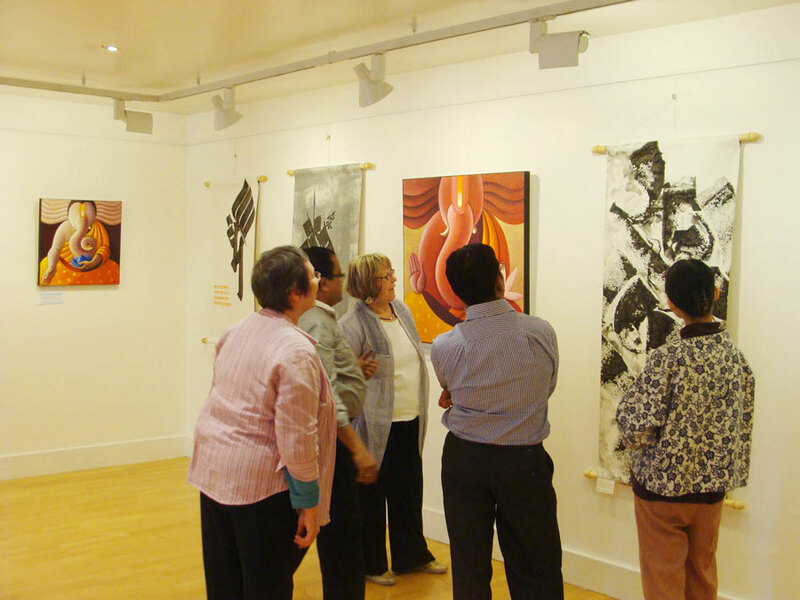 The exhibition was well received by all & won accolades. 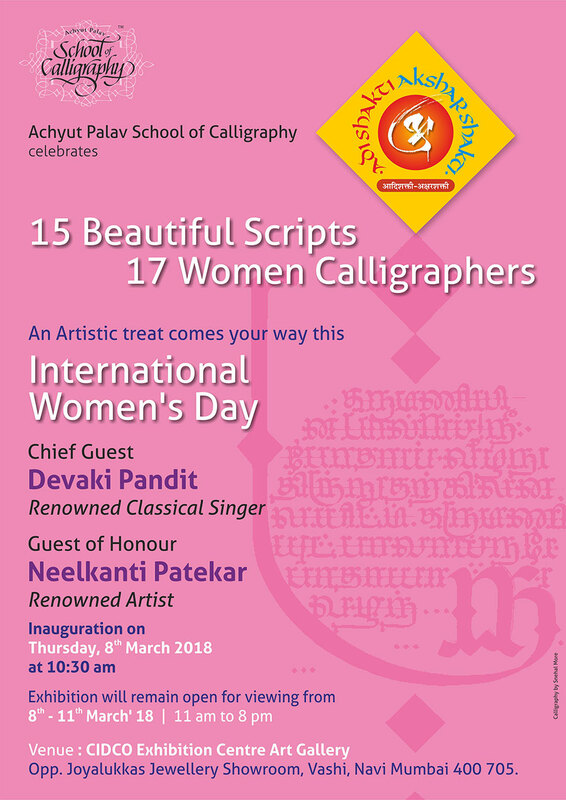 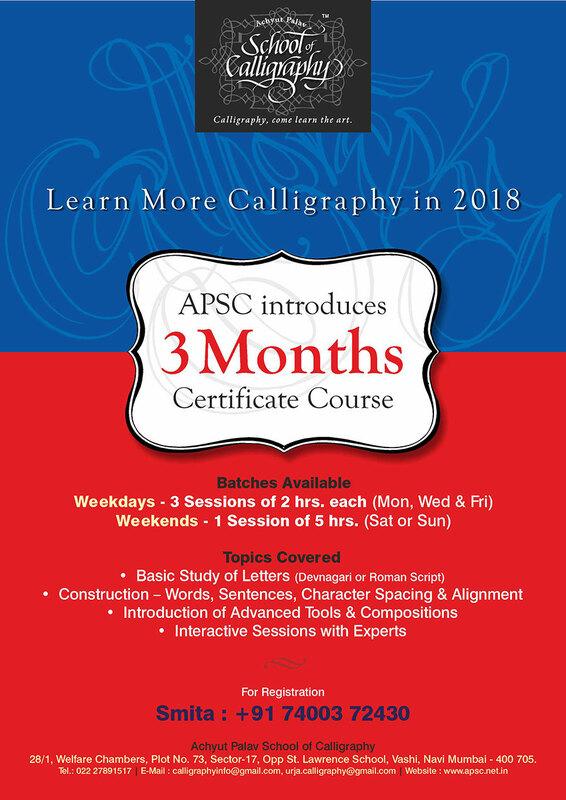 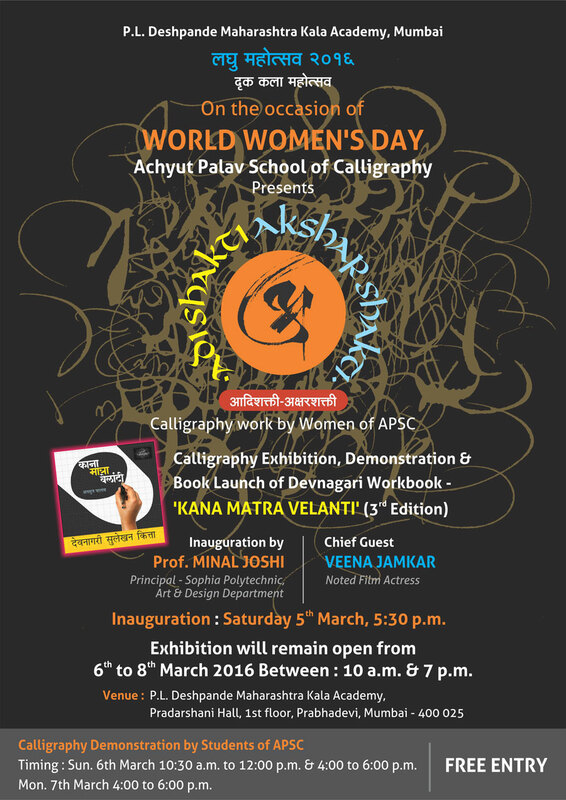 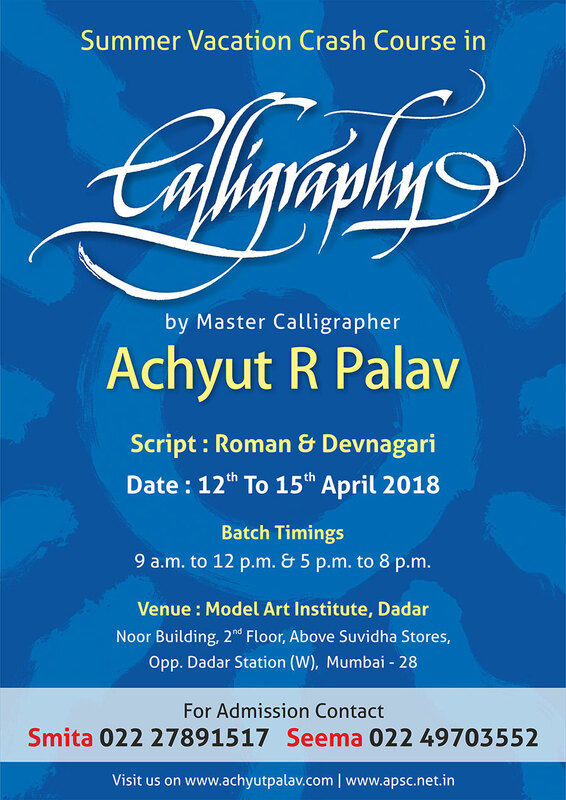 Achyut Palav School of Calligraphy is a venture which takes the mission started by Achyut Palav to propagate the art of calligraphy, a step further. 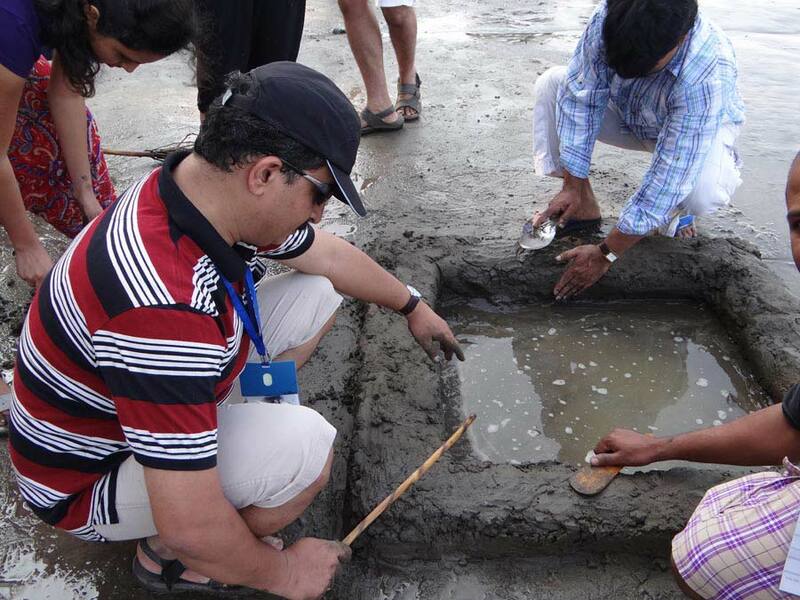 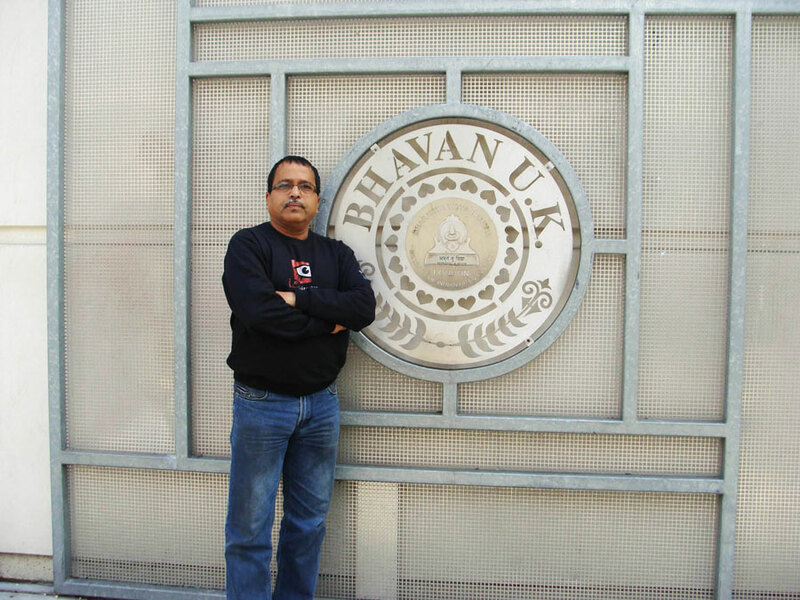 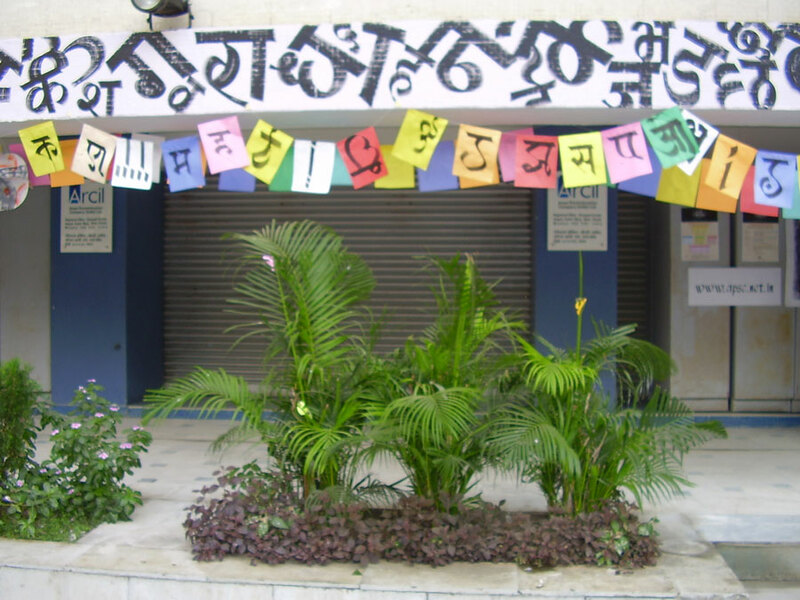 The school is built on the foundation of our rich culture & vast heritage of scripts. 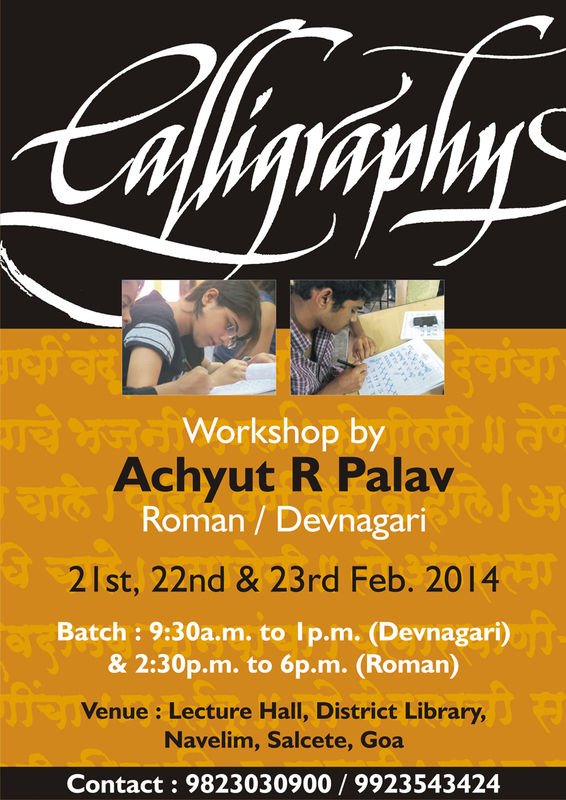 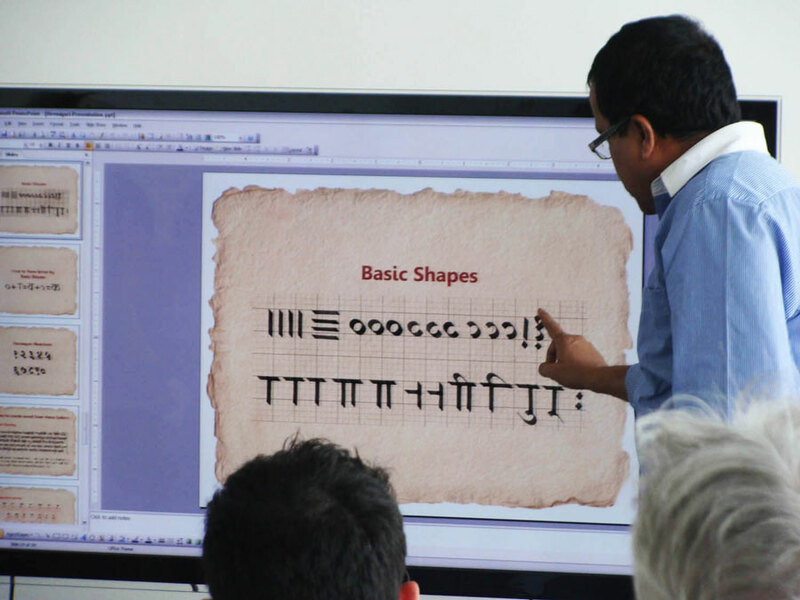 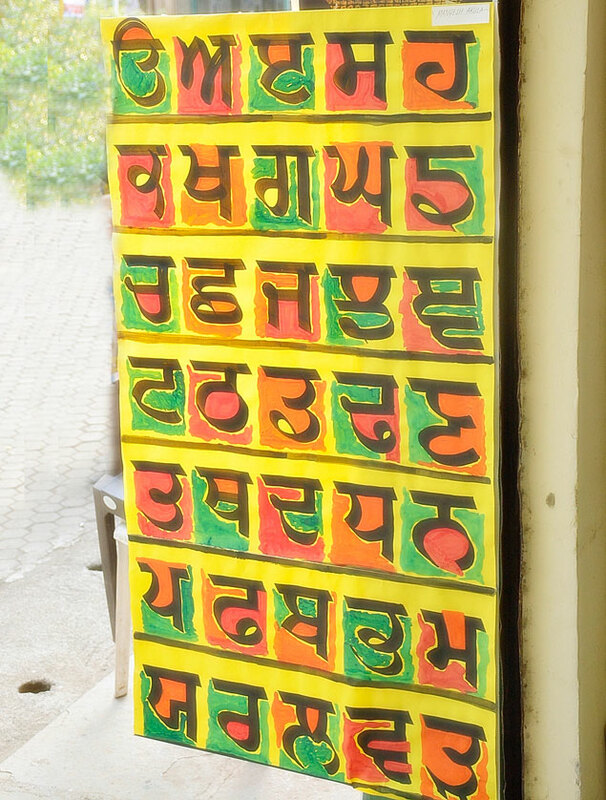 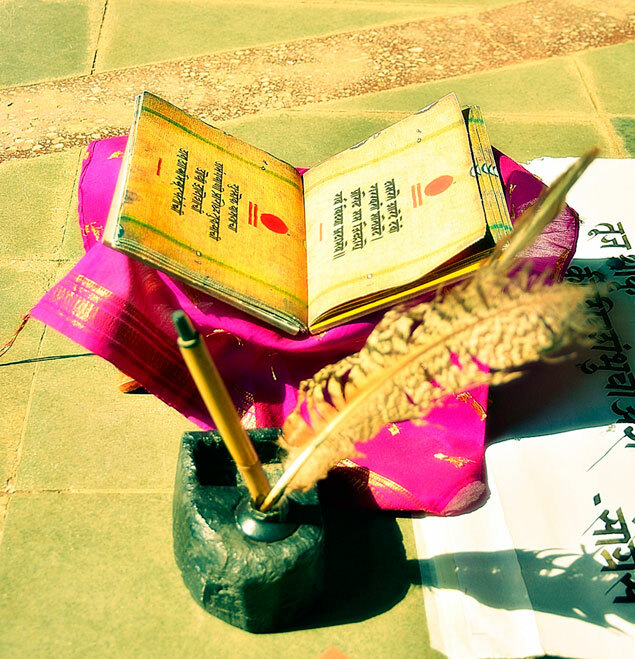 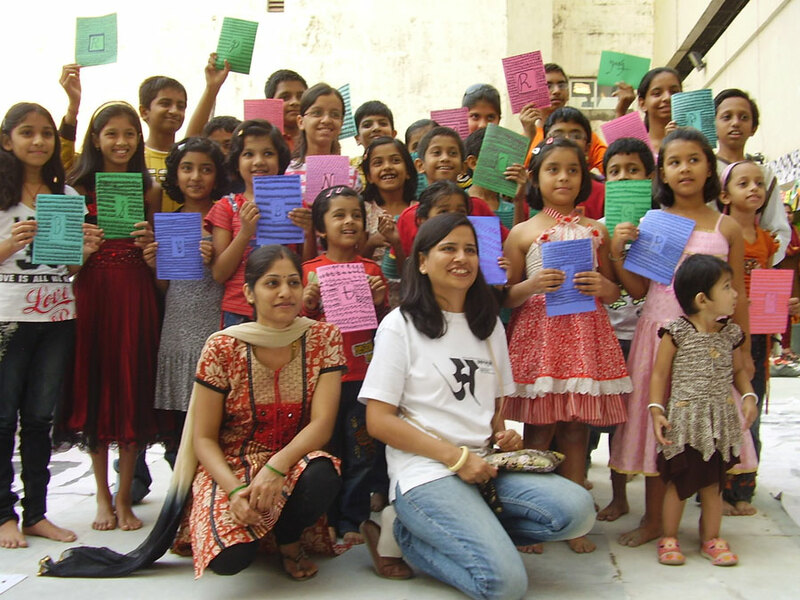 The school will have courses in basic calligraphy for Devnagri scripts (Hindi & Marathi) & Roman (English) scripts. 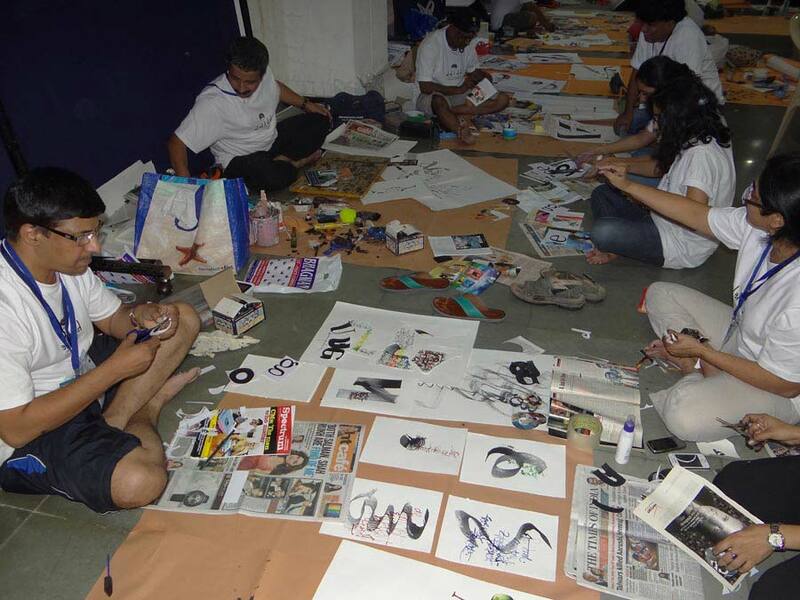 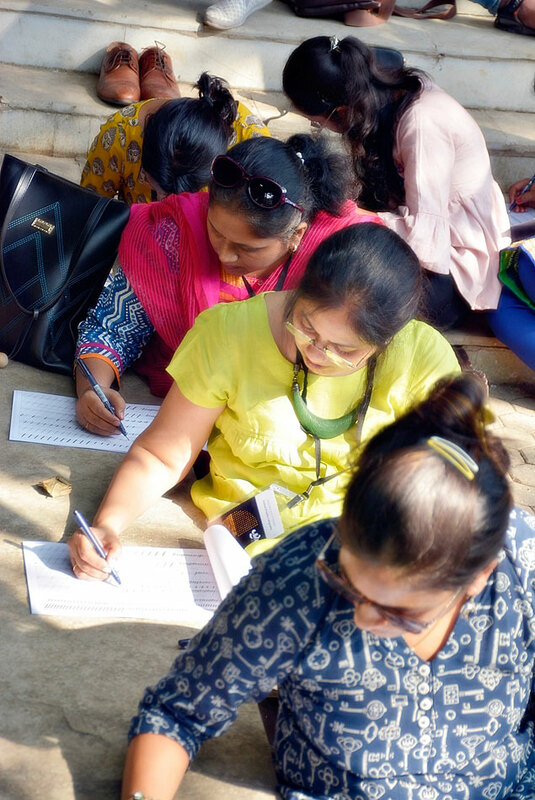 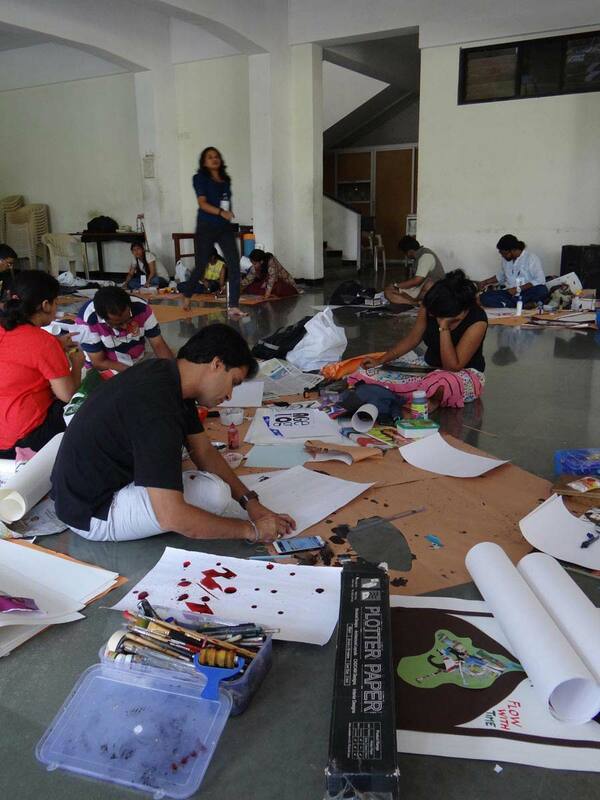 There will be regular batches which will be conducted in sessions of 2 hours each on Mondays, Wednesdays & Fridays. 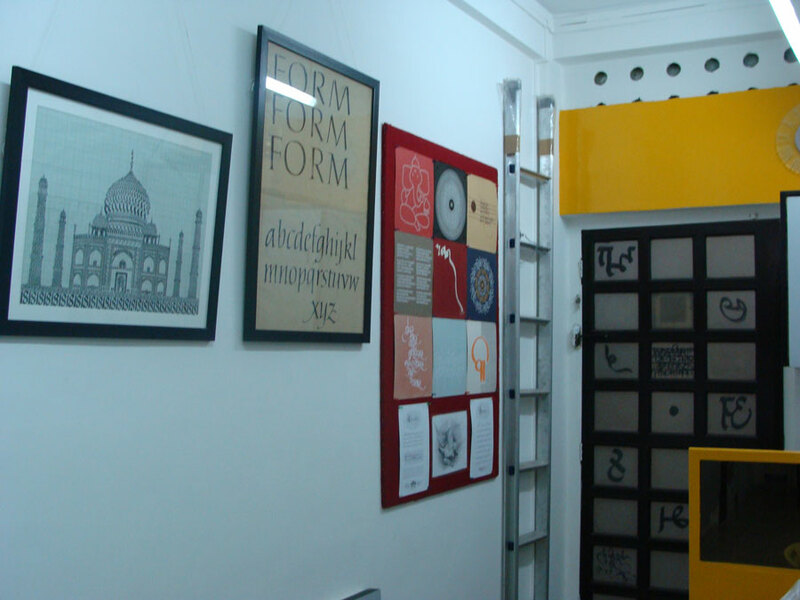 The school is also equipped with a calligraphy shop & a library. 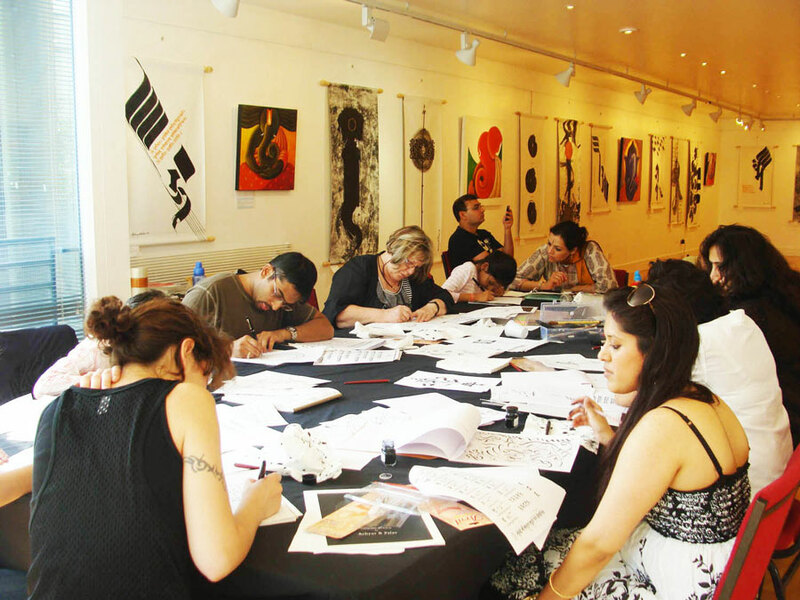 For information on courses click here. 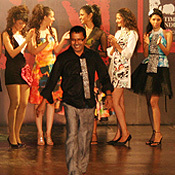 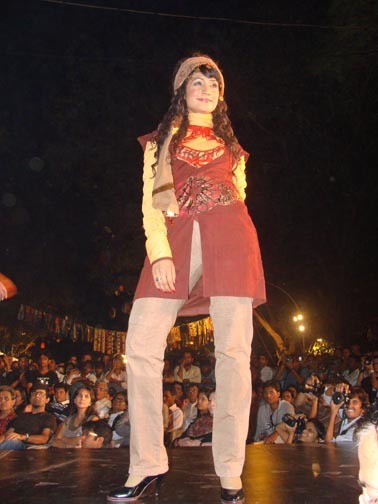 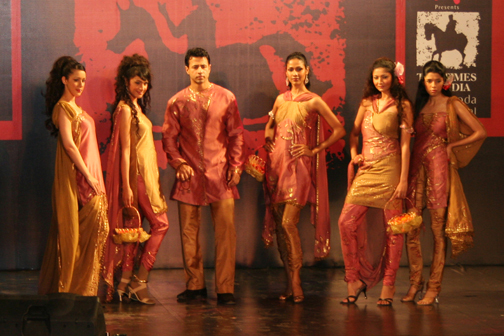 Finale of Callifest'08 at the Kala Ghoda Festival 2009... 'Romancing with Calligraphy' a Fashion show presentation conceived and directed by Geeta Castelino, a renowned Design Consultant and Educationist who also is part of the Kala Ghoda Festival Committee, choreographed by Utsav Dholakia, mentored by Sonal Shah along with professional renowned models like Aryan Vaid, Nethra, Shonal etc. 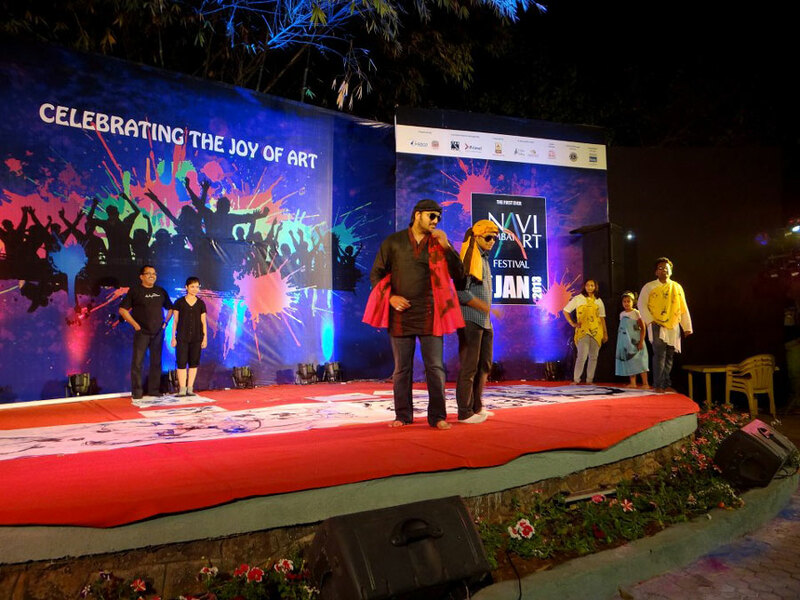 Also the show will have a dance performance (Jazz, Classical Ballet etc.) 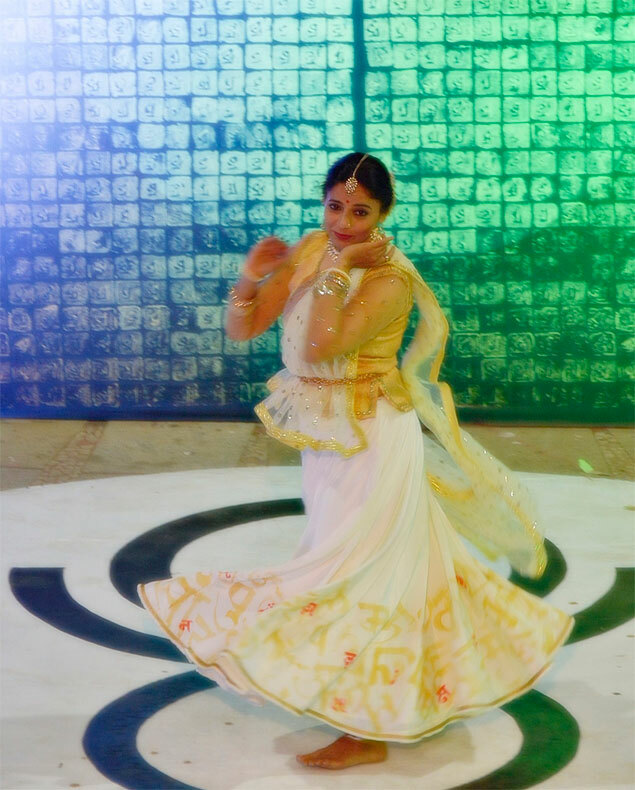 by Tanvi Palav & Arti Dhanipkar & choreographed by Gururaj. 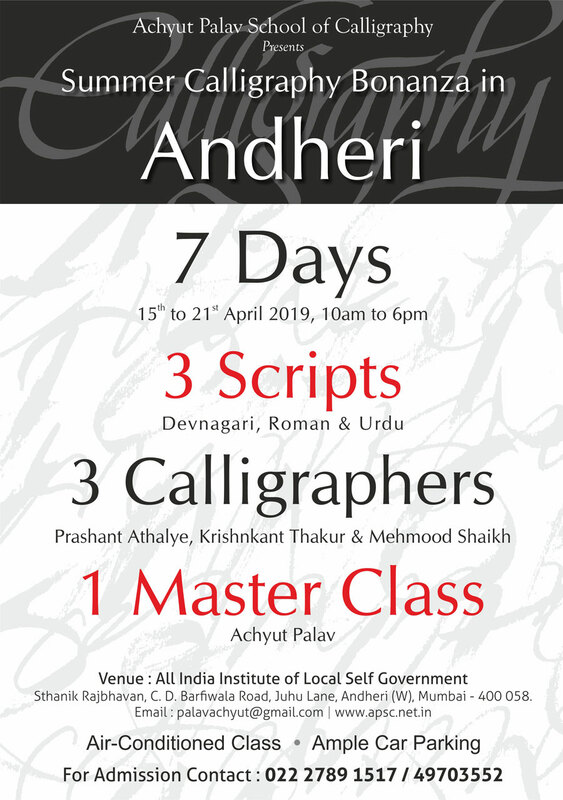 It takes the participants & the visitors through a journey of calligraphy where one can delve in the topics ranging from the origin of the art form to the modern day scenario. 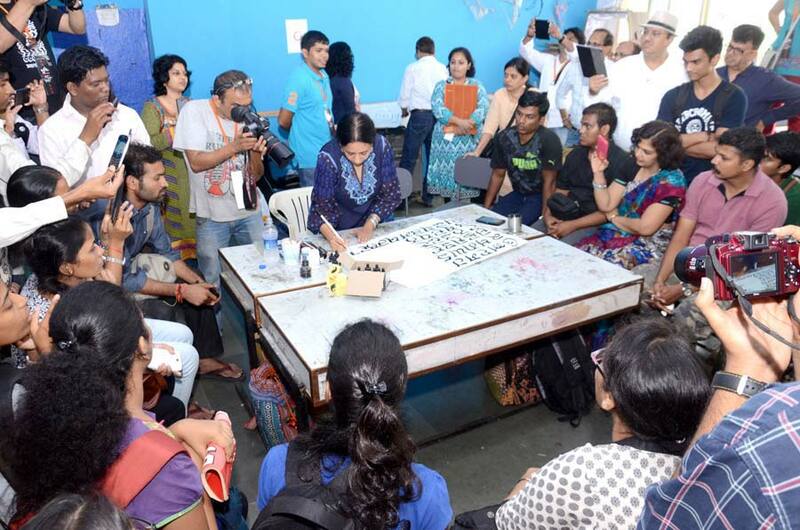 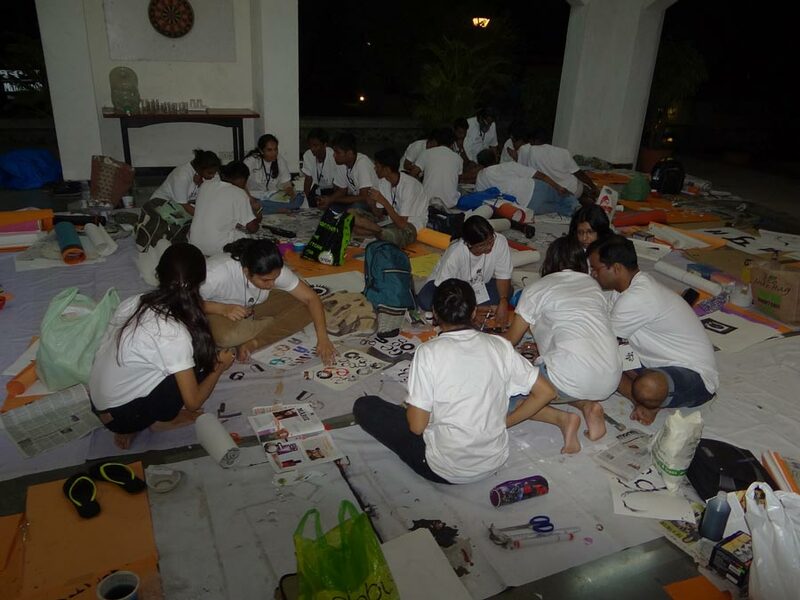 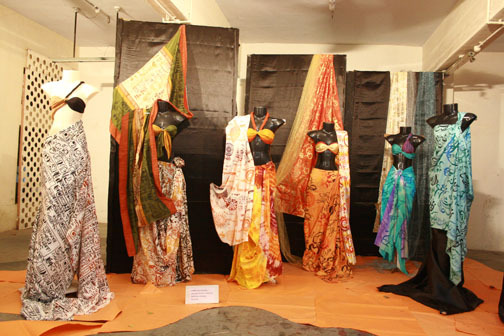 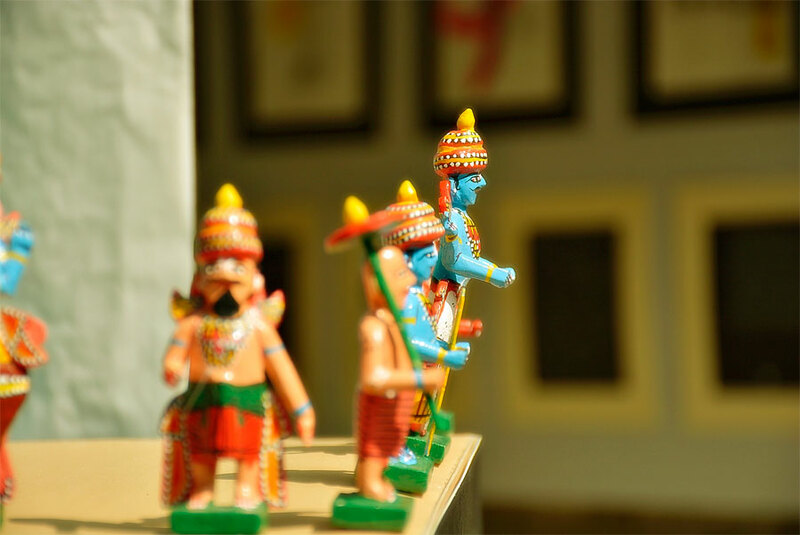 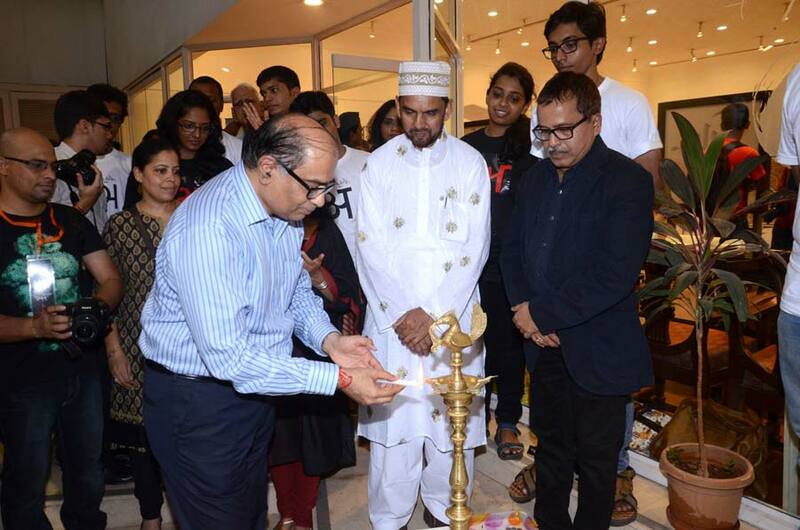 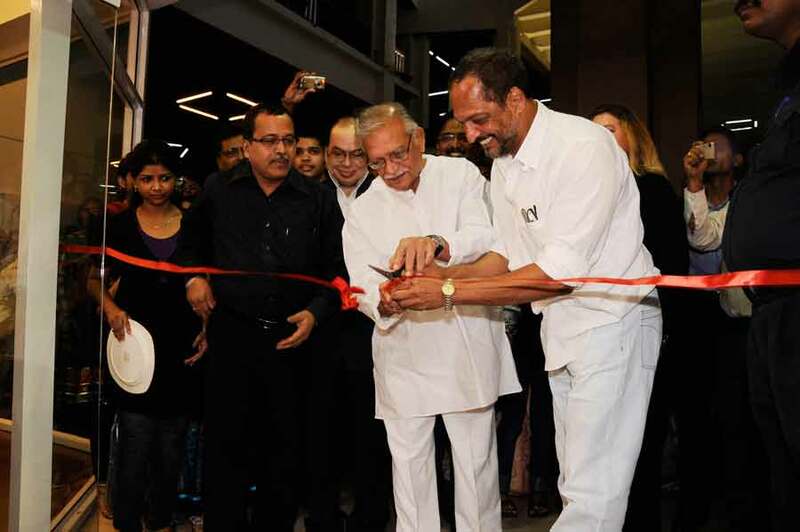 The team of six budding designers (final year students of B. D. Somani School of Fashion Design), has put together their creations which caters to the interest of art lovers, professionals and the common man. 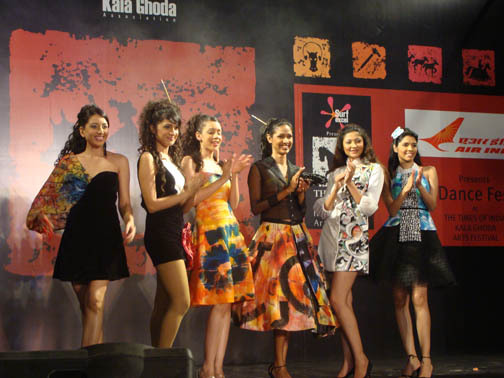 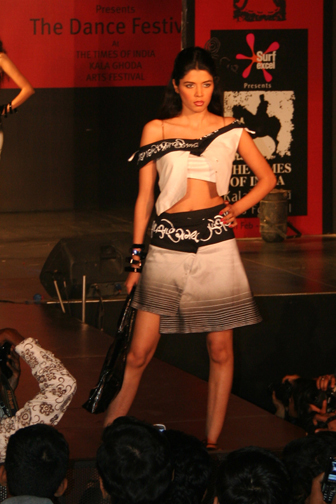 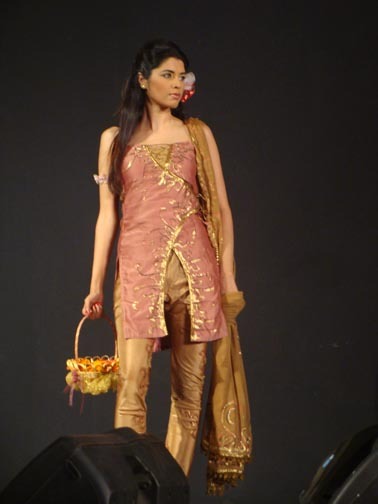 It is promoting the fashion talent of the Fashion Schools from Mumbai who are nurturing the future growth of Indian fashion. 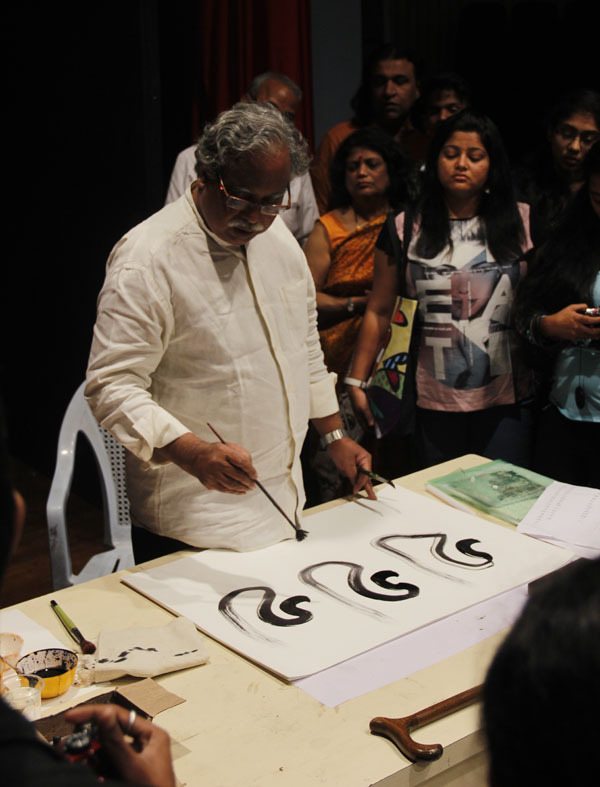 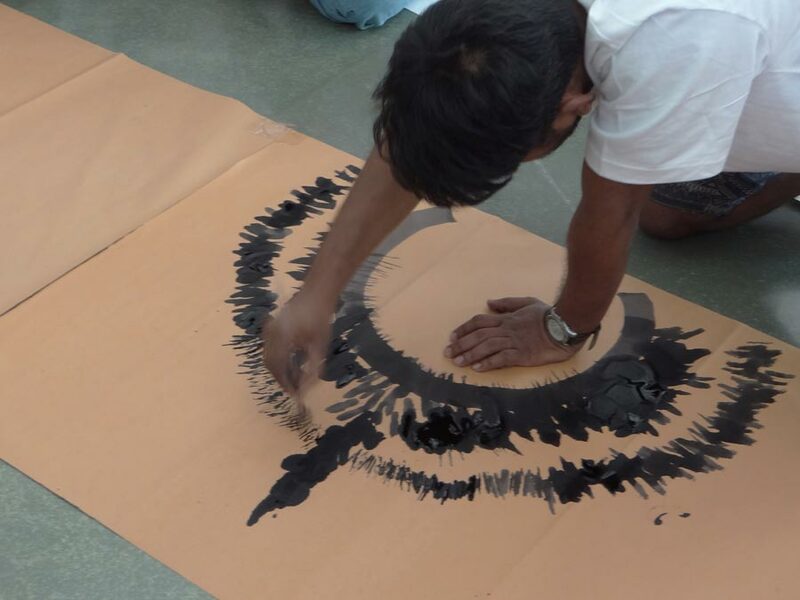 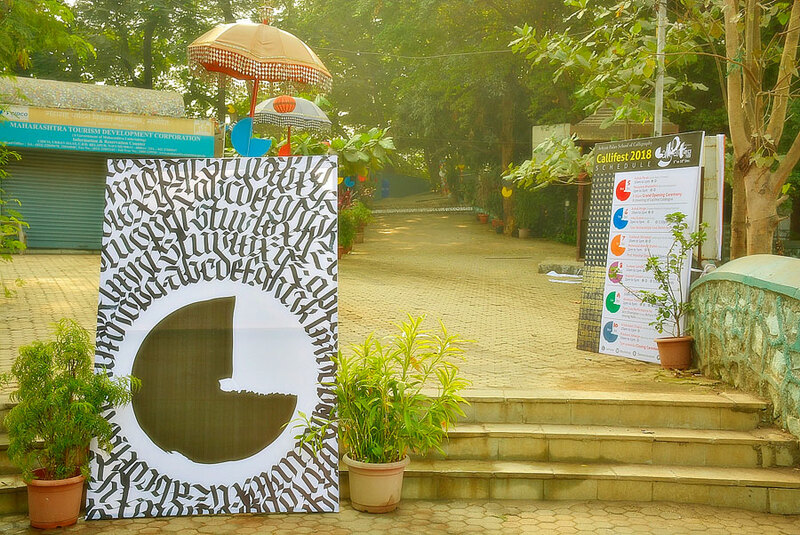 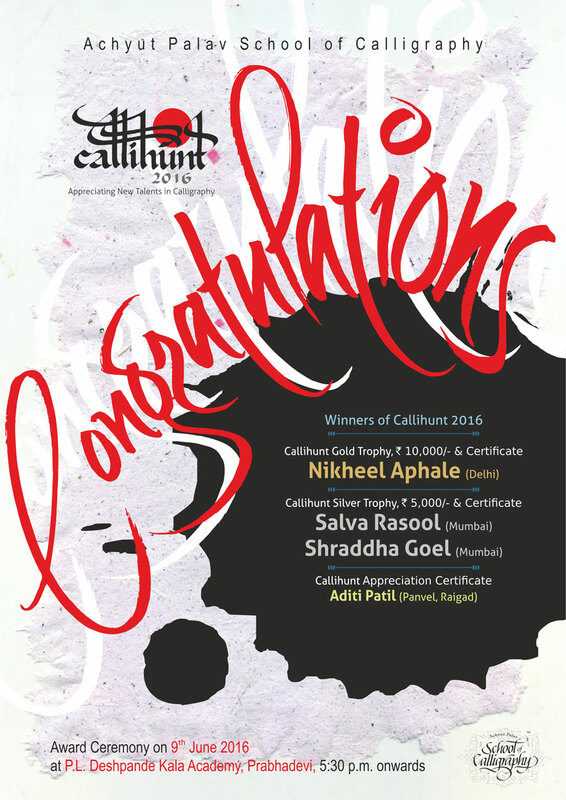 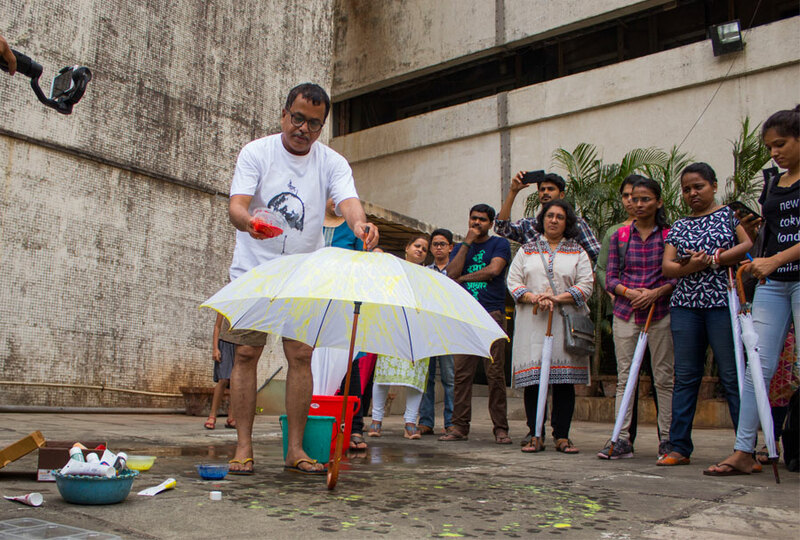 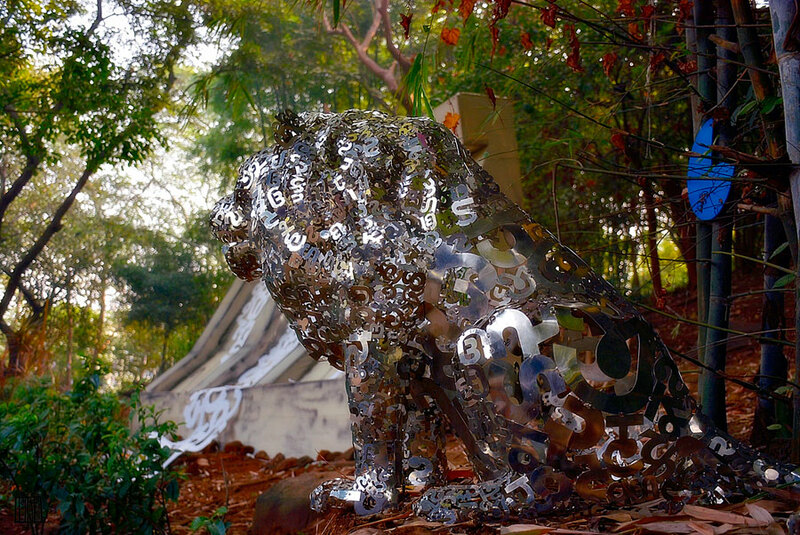 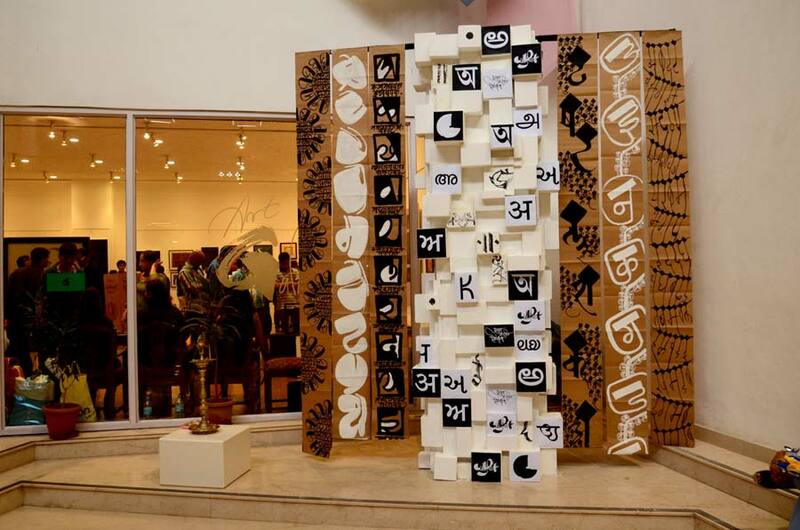 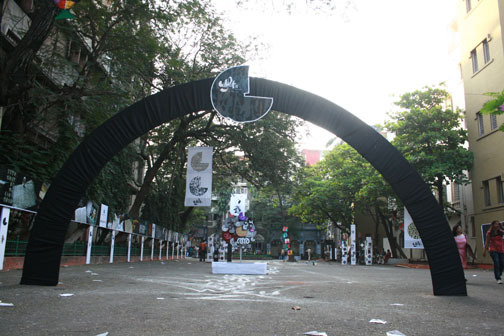 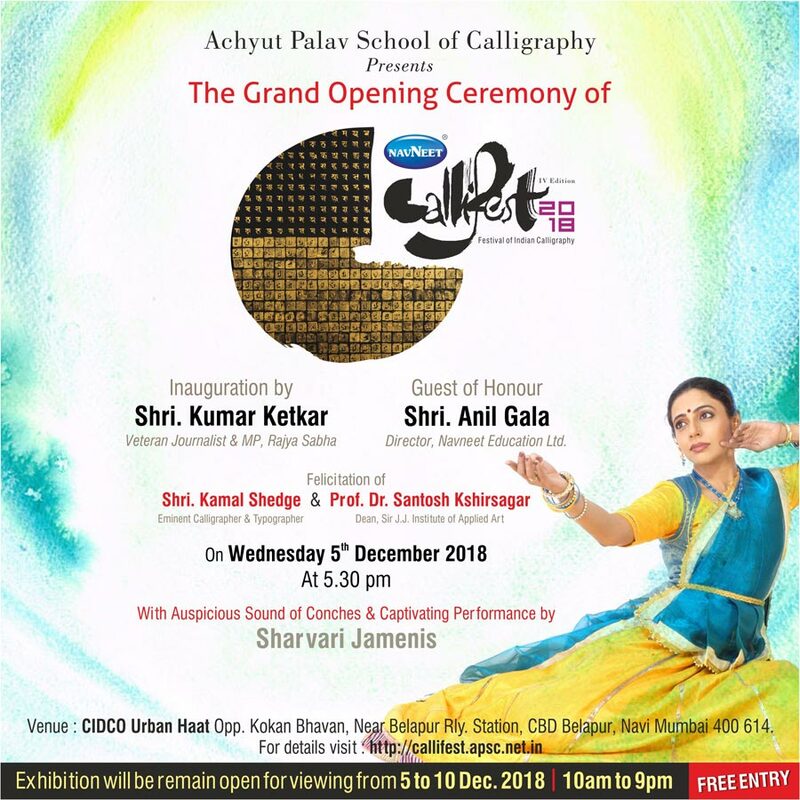 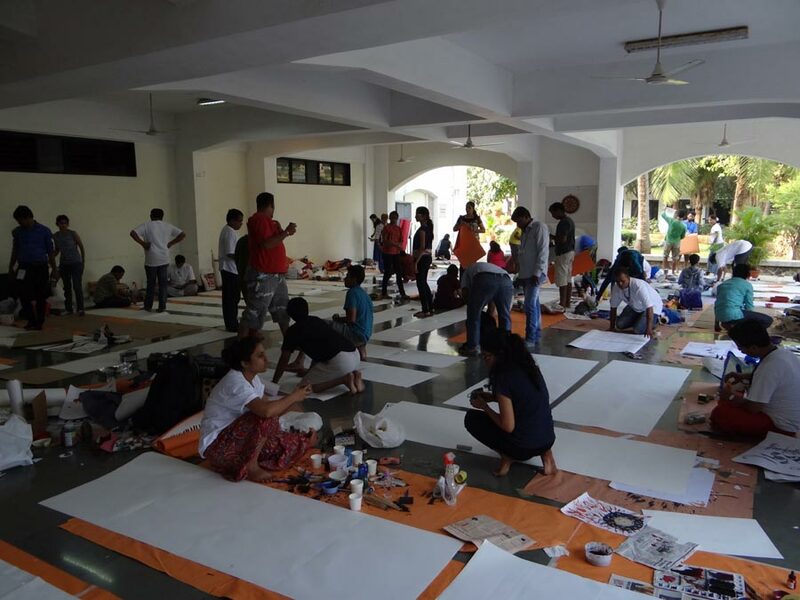 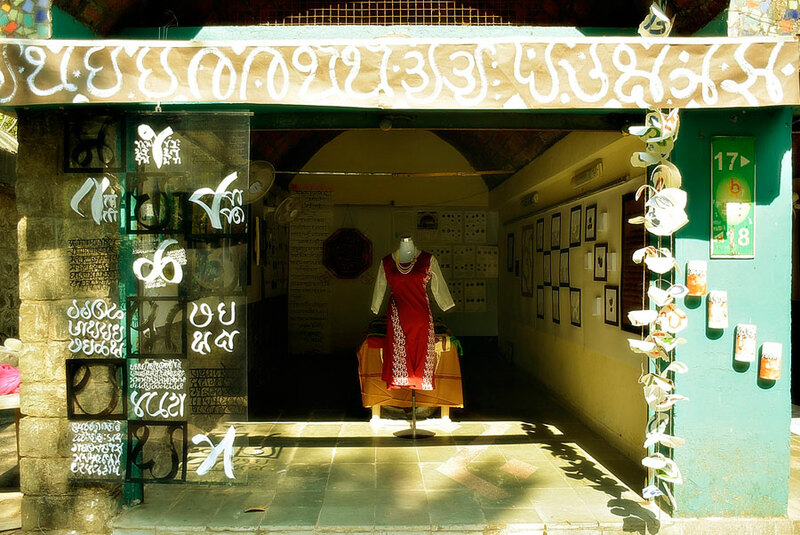 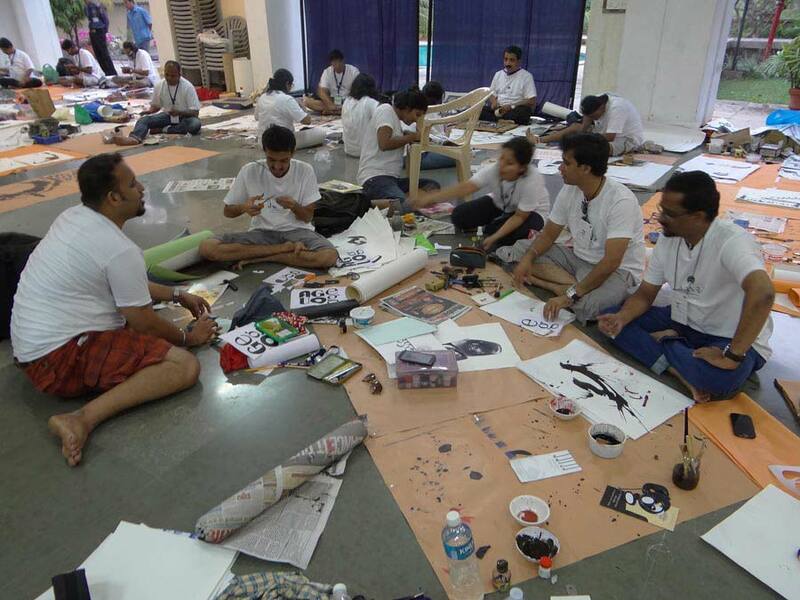 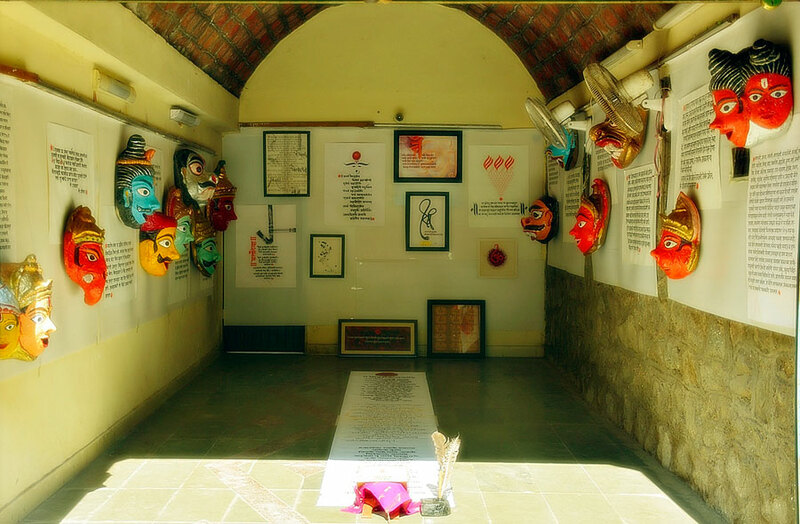 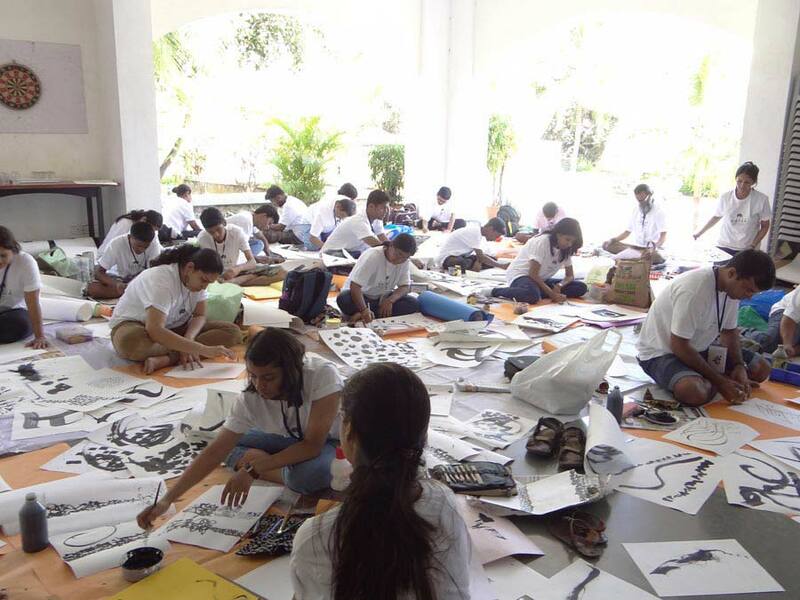 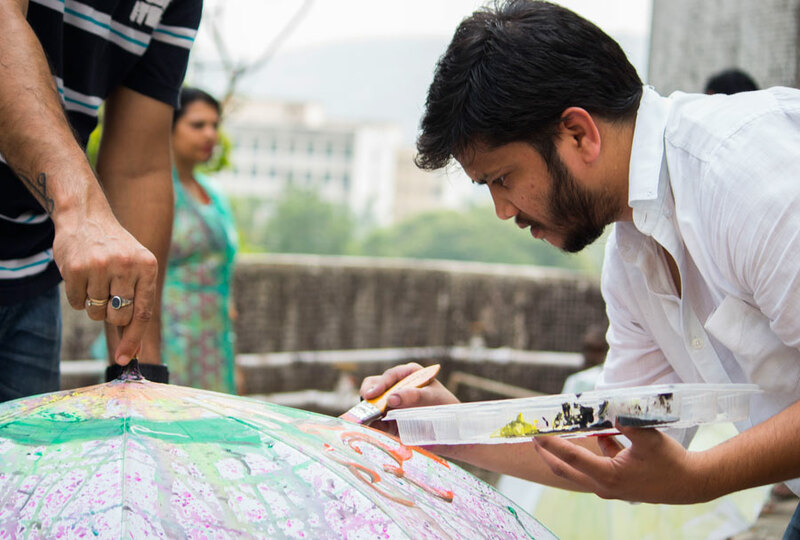 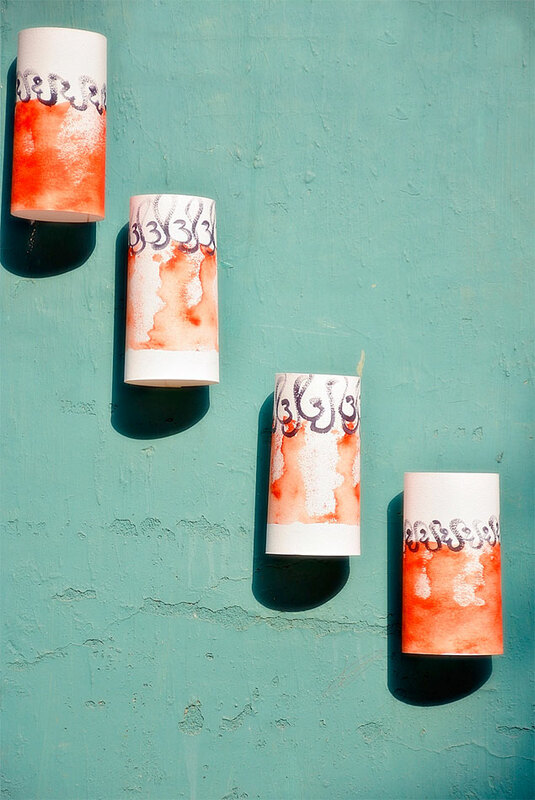 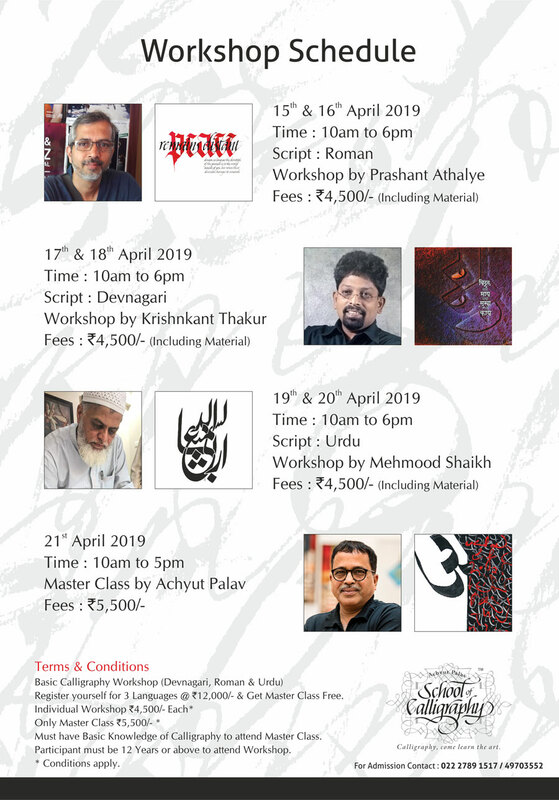 The main inspiration behind this is creating awareness about calligraphy through Kala Ghoda Festival and thus to impart the experience gathered in Achyut's quest for calligraphy with the young, bright and energetic youth. 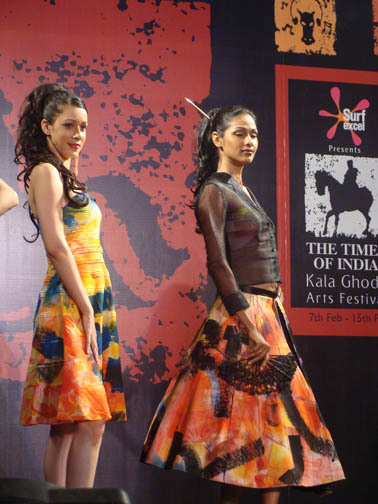 Kala Ghoda Association believes it's the youth of India who need to be educated on the rich and vast heritage of the Indian culture. 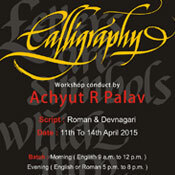 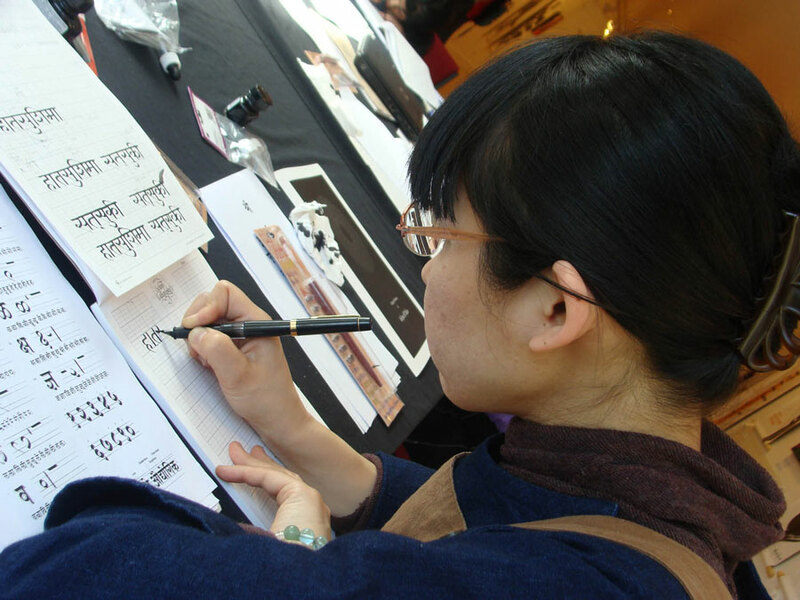 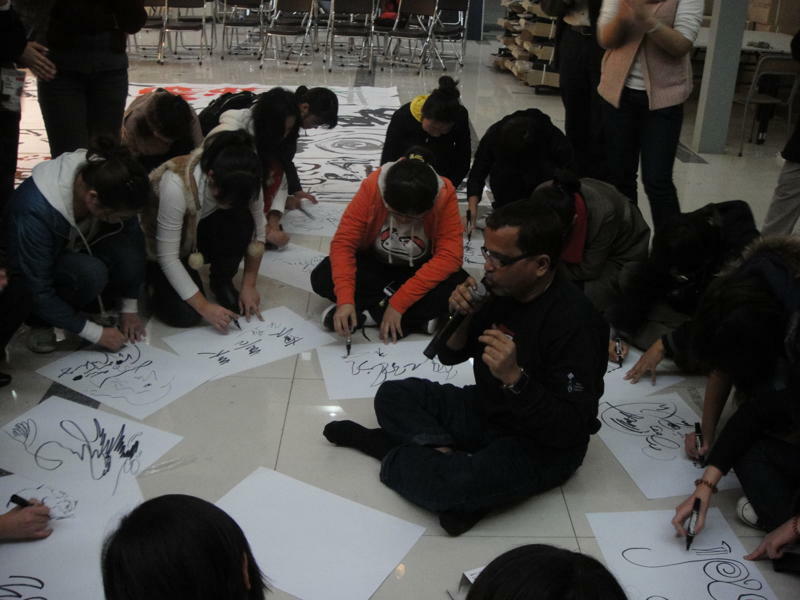 'Romancing with Calligraphy' is going to be a peak of excitement, yet at times feels like the beginning of a new high. 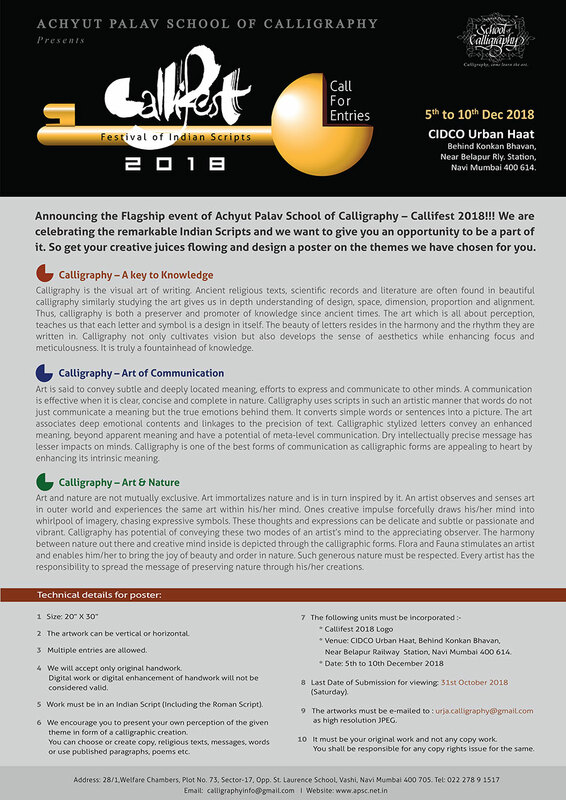 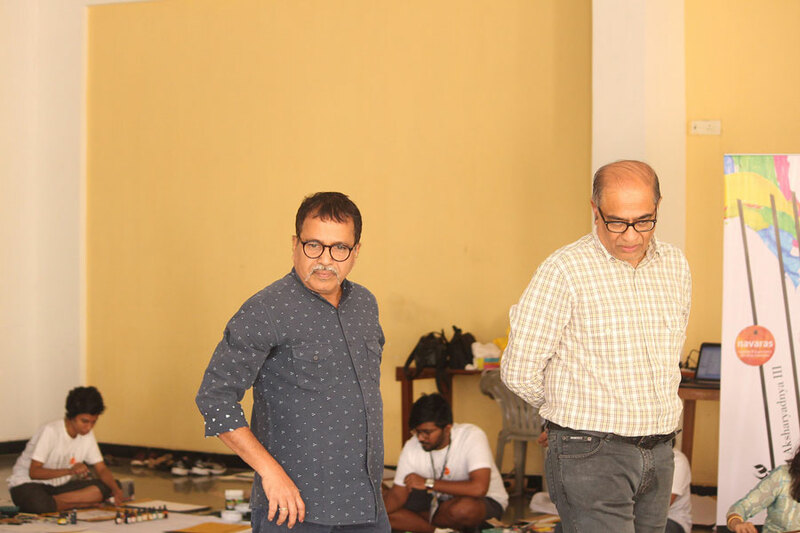 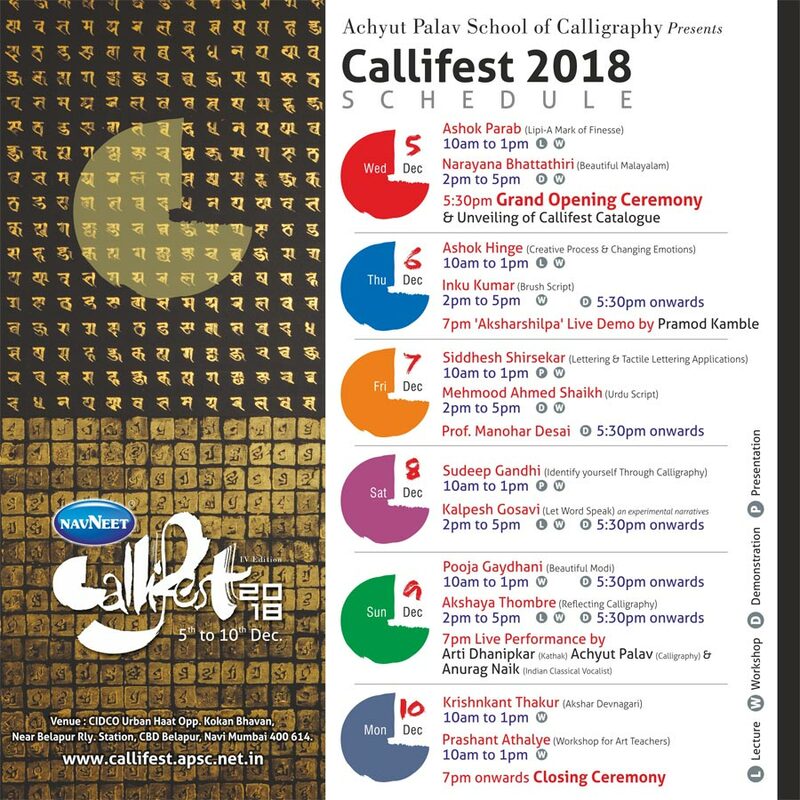 Calligraphy Roadways, a program that took calligraphy with a twist to art colleges around India was the first venture in the year when I celebrate my 25 years dedicated to learning & propagating this beautiful art. 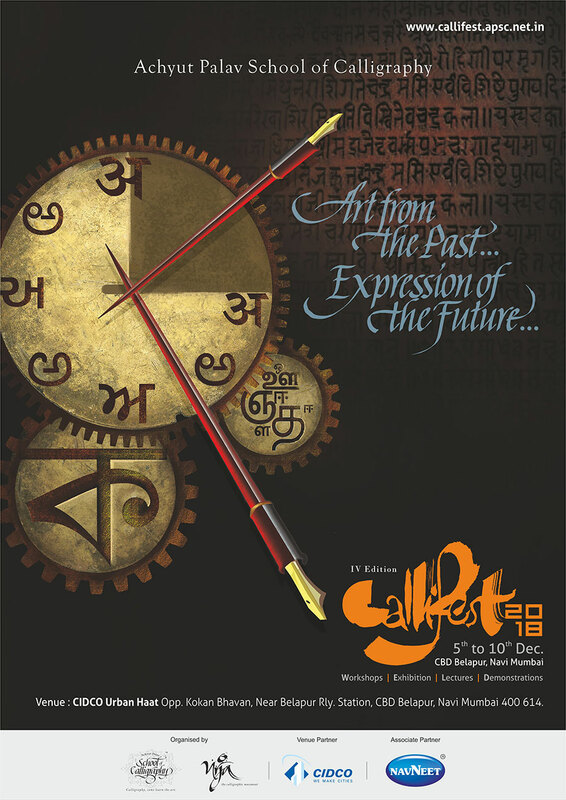 Its inspiring response & overwhelming support laid the foundation stone for Callifest-08- Workshops, Exhibitions, Lectures & Demos. 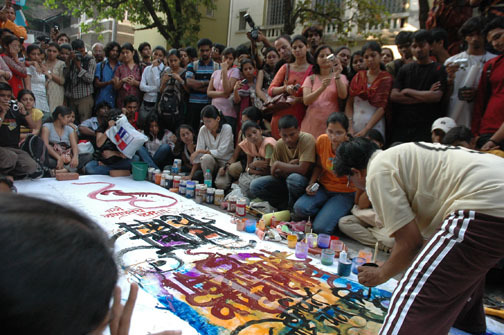 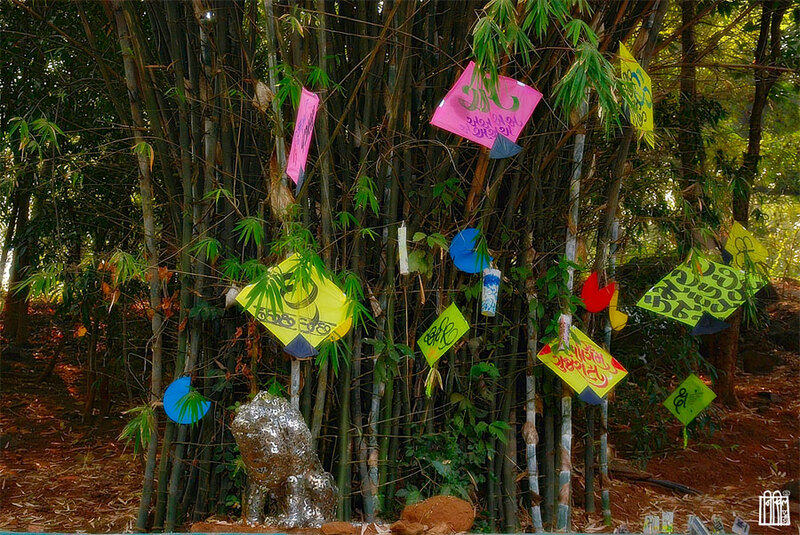 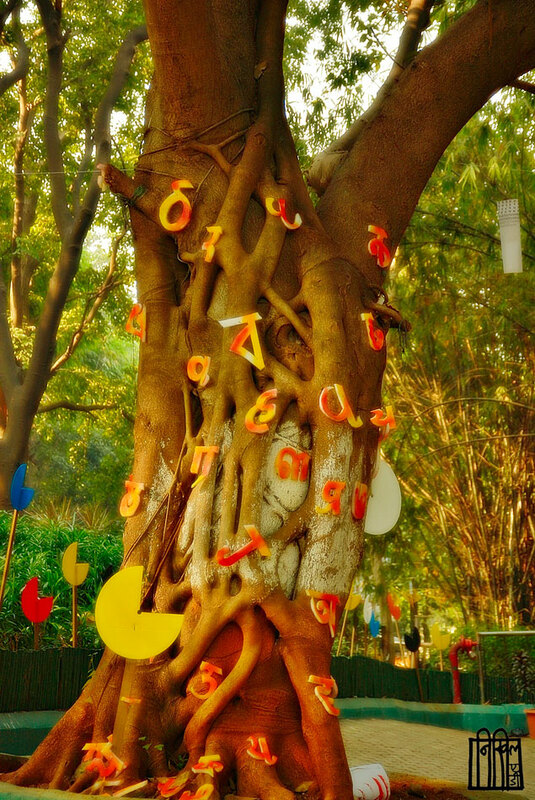 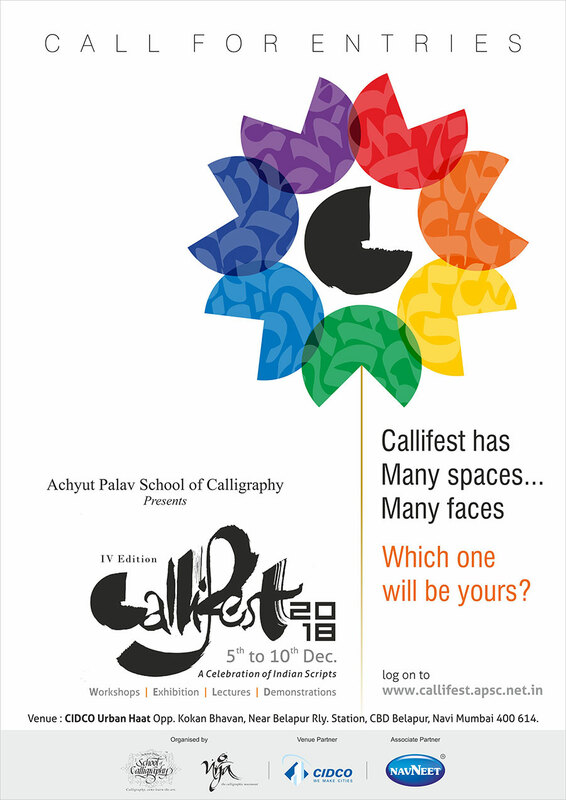 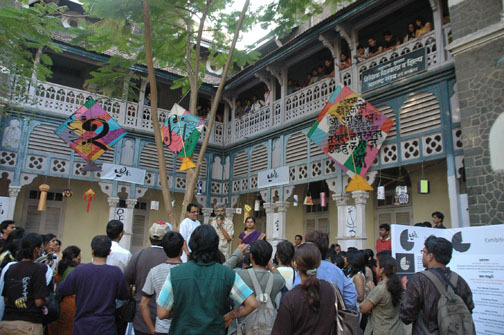 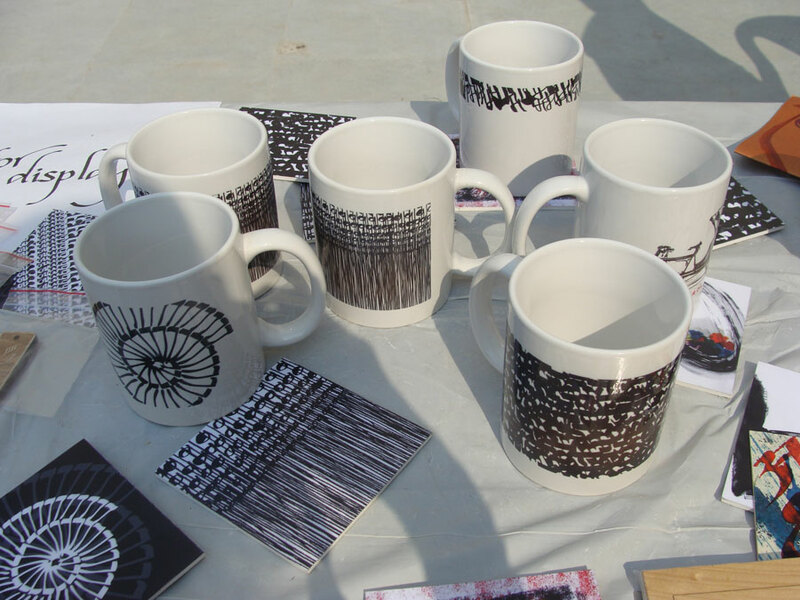 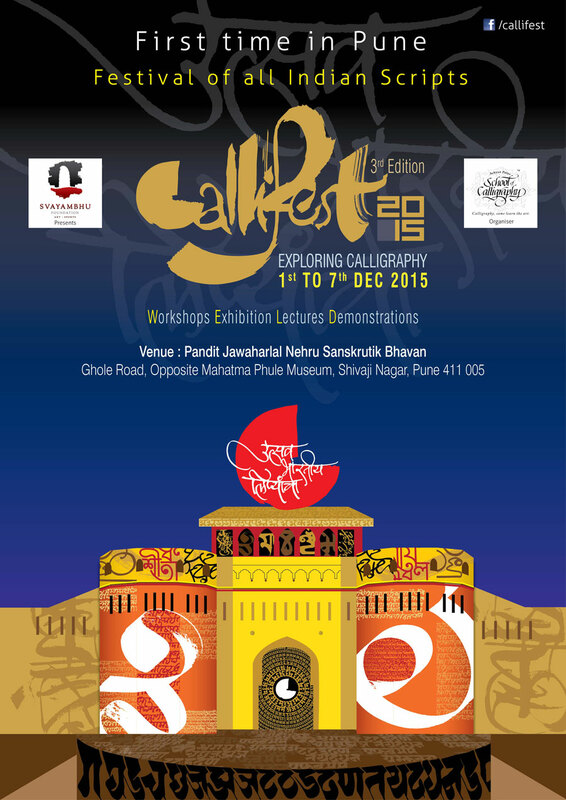 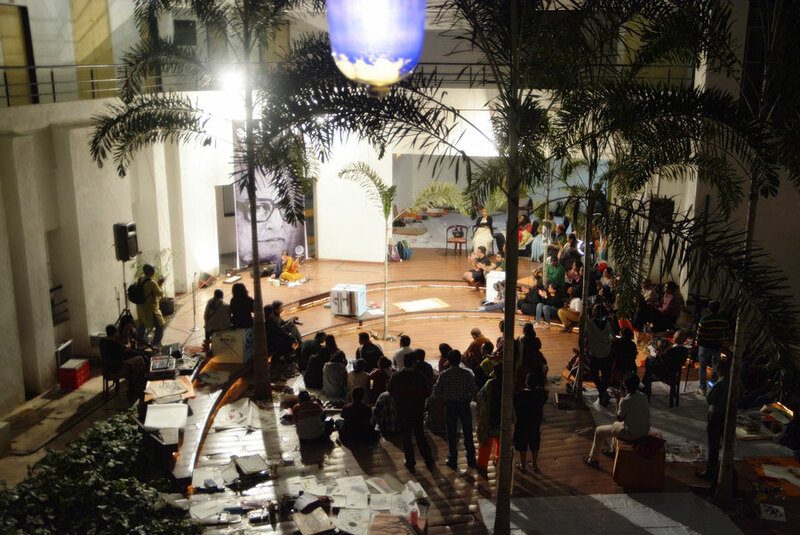 Callifest, as the name goes, is a basket of events bought together for the art lovers & art aspirants. 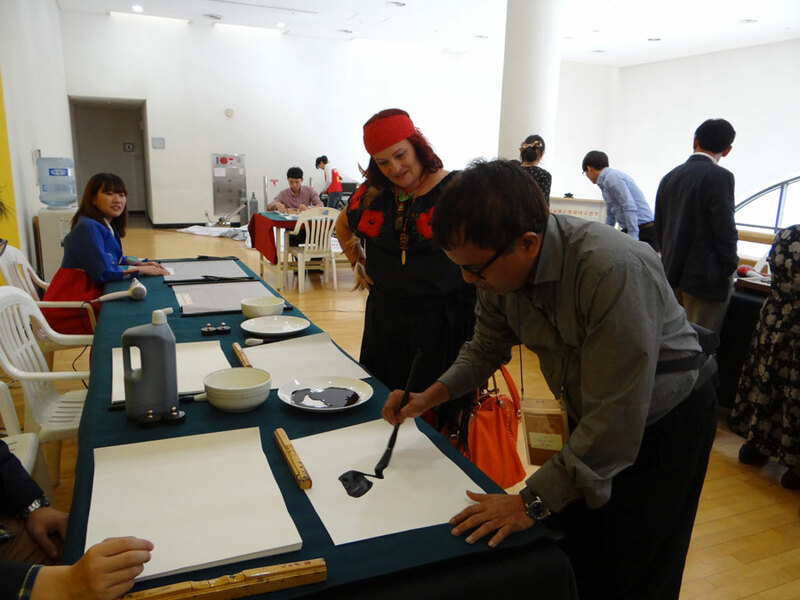 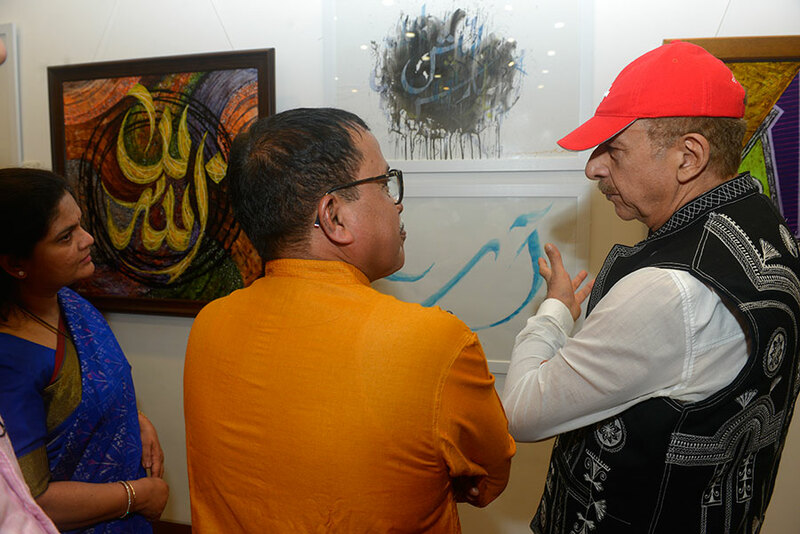 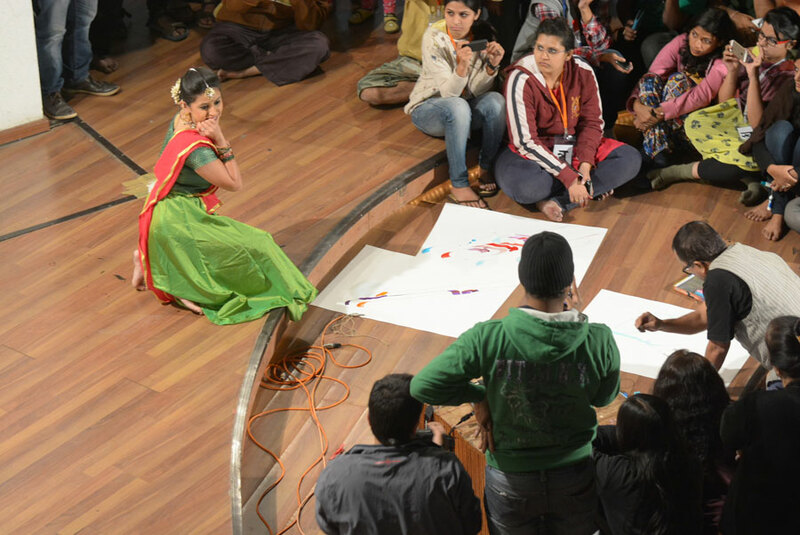 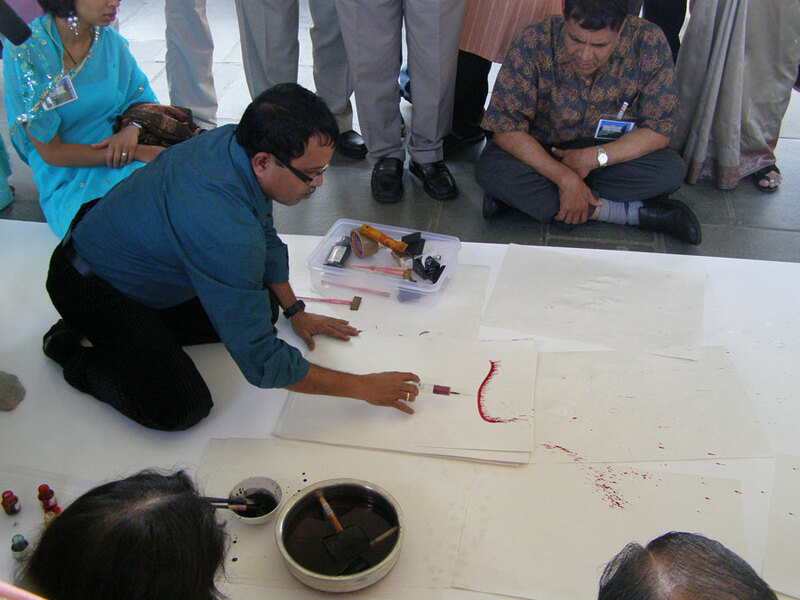 Similarly it takes the participants & the visitors through a journey of calligraphy where one can delve in the topics ranging from the origin of the art form to the modern day scenario. 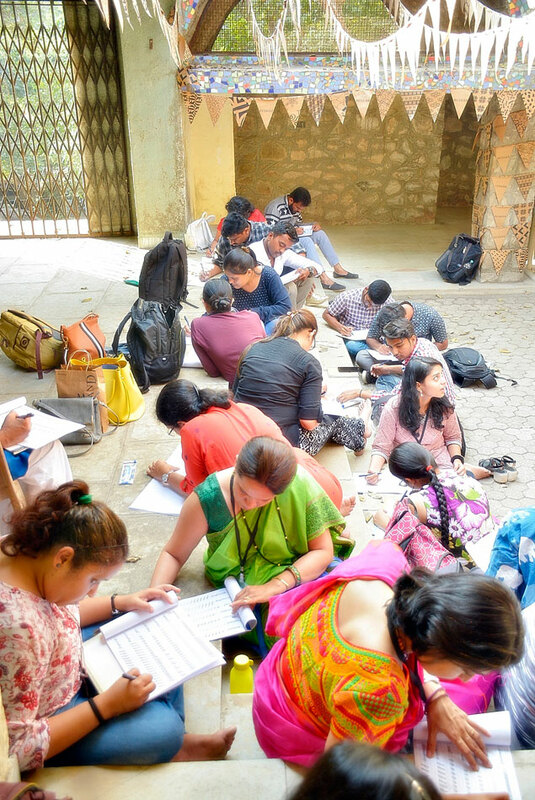 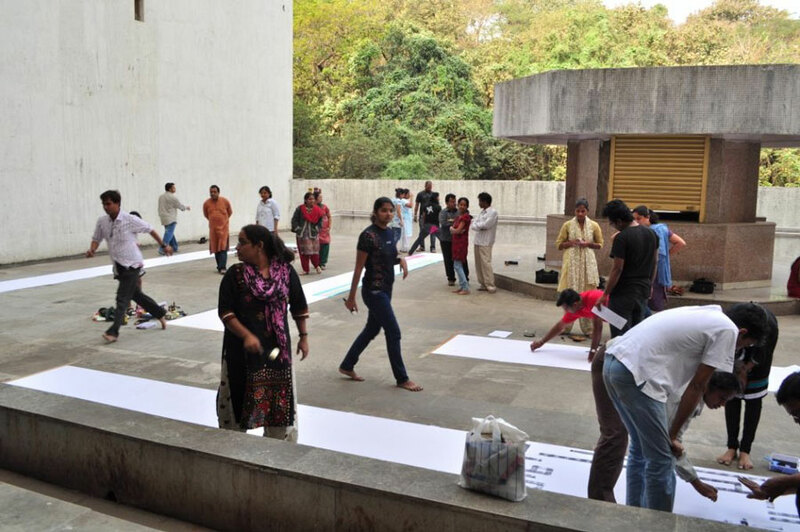 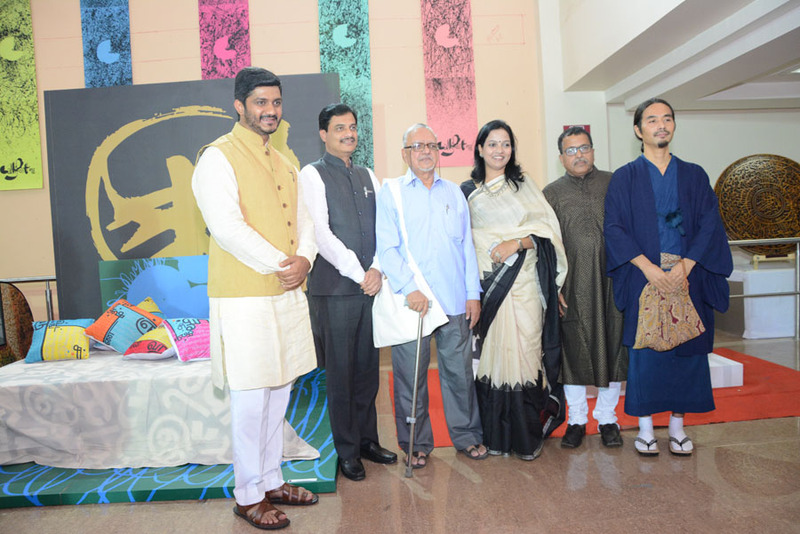 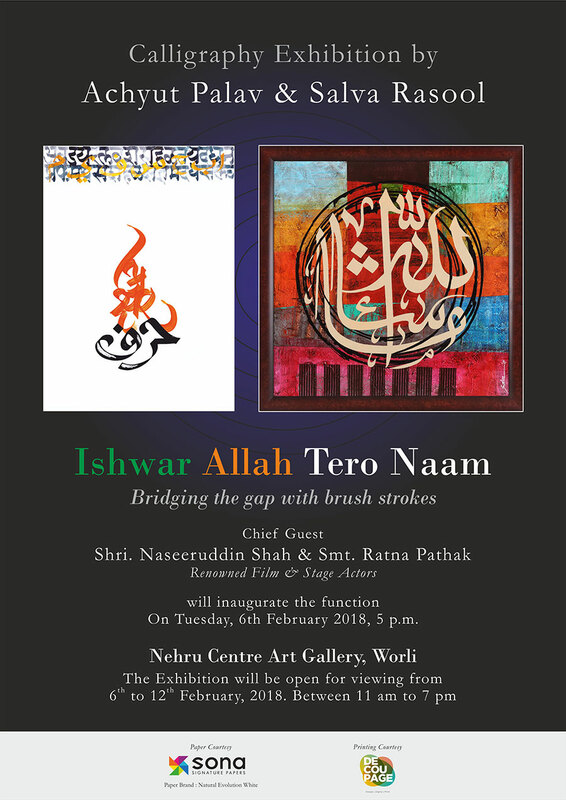 The team of Urja- the calligraphic movement has put together an event which caters to the interest of artists, art teachers, art aspirants & students, art lovers & the common man. 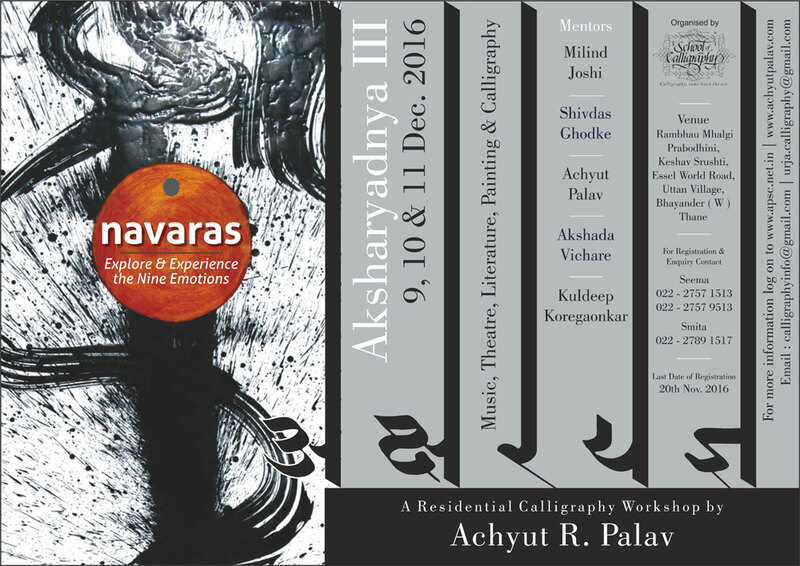 Achyut Palav is just back from Russia where he created a profound impression on the minds of Russian artists & students with a magnificent demonstration & lecture dedicated purely to the Indian scripts. 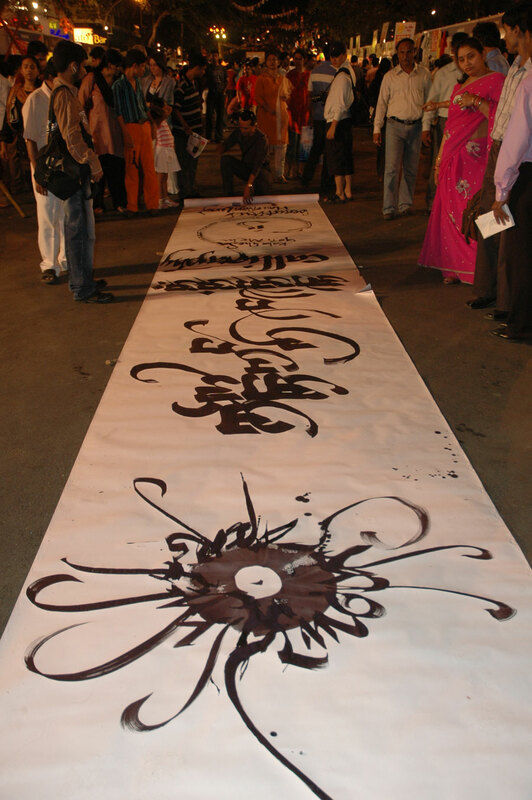 This international calligraphy exhibition organized by the National Union of Calligraphers & M.V.K. 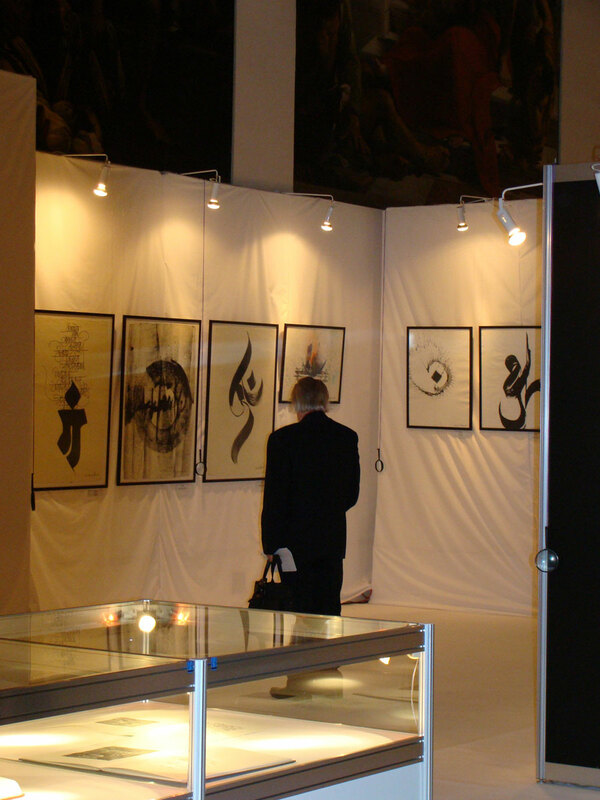 Exhibition Company, Russia, was the first of its kind in the world. 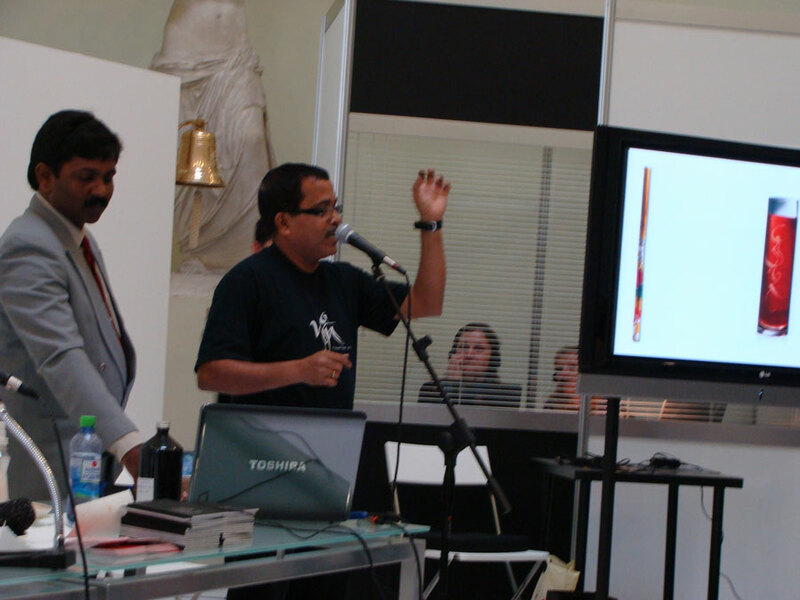 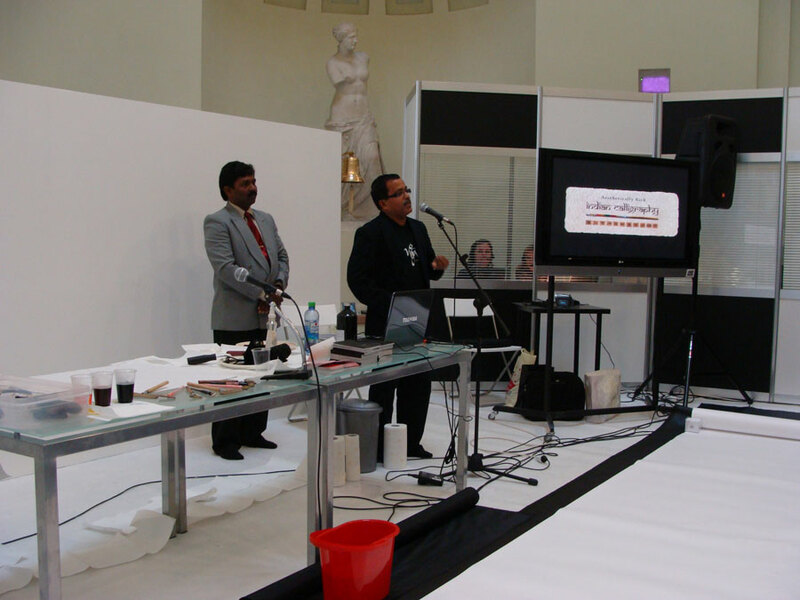 It was held at the Repin St. Petersburg State Academic Institute of Painting, Sculpture & Architecture during 16th September to 21st September 2008. 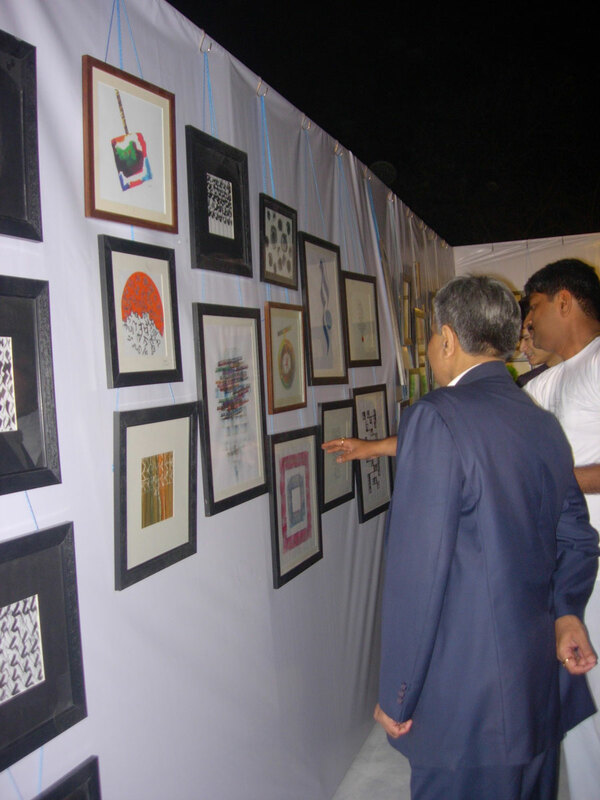 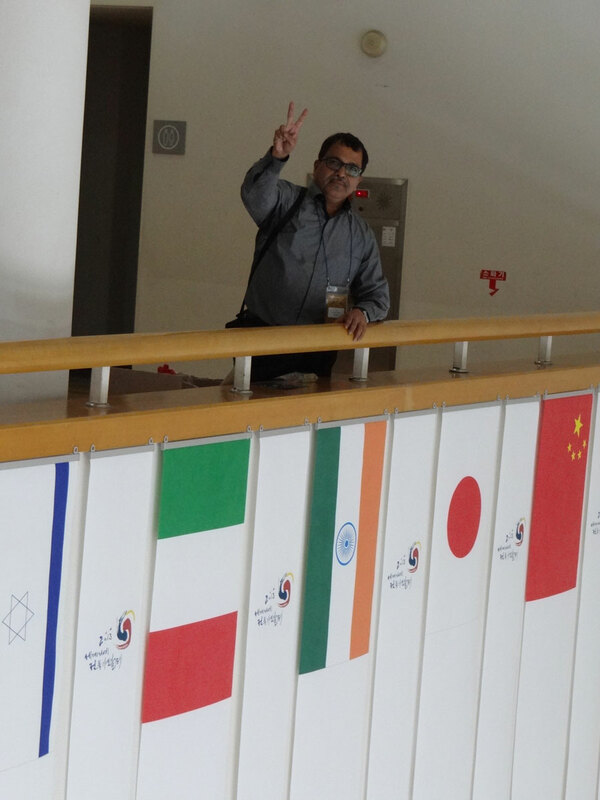 The event witnessed a participation of 21 countries & was visited by around 25 thousand visitors. 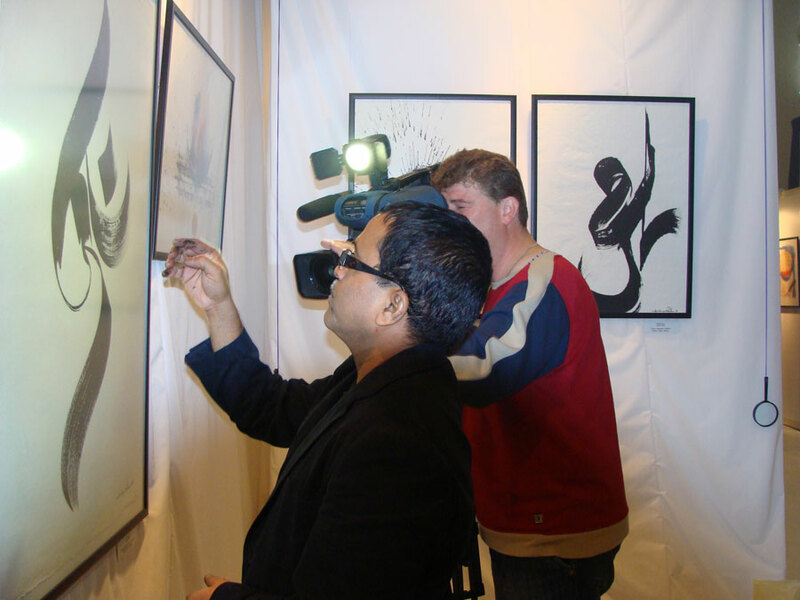 Ten Radio and Television teams filmed and photographed around the clock, made interviews with the organizers and the participants as well as life broadcasts. 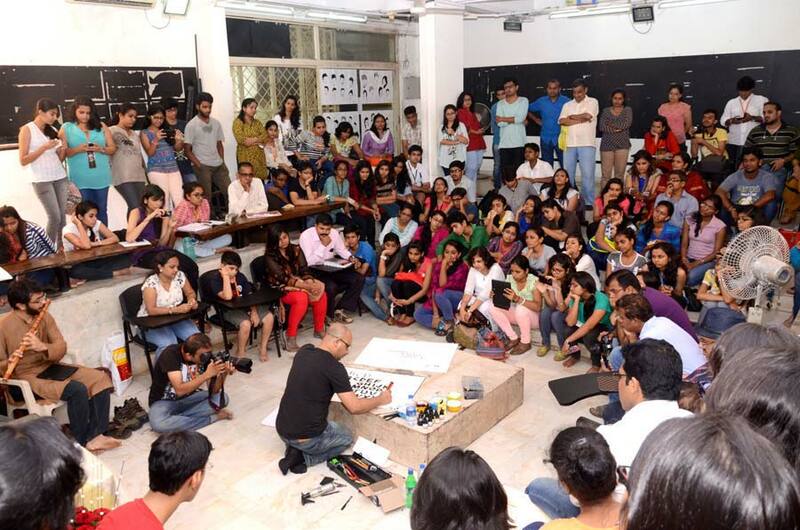 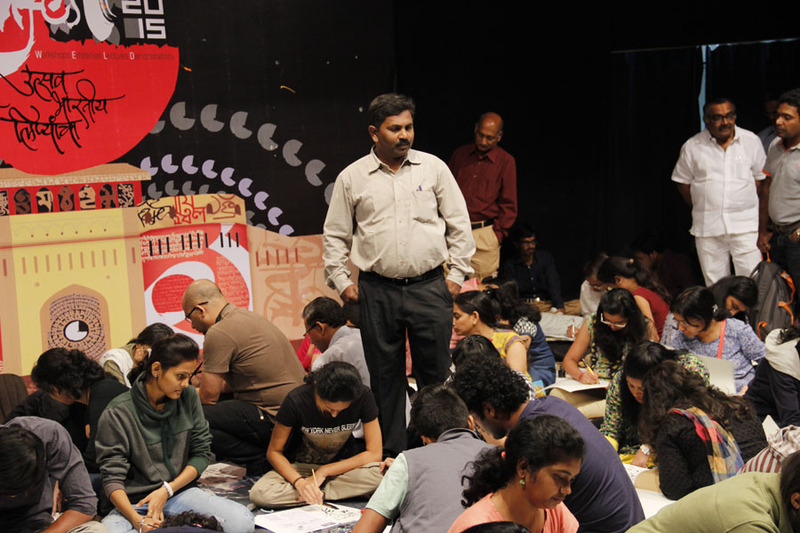 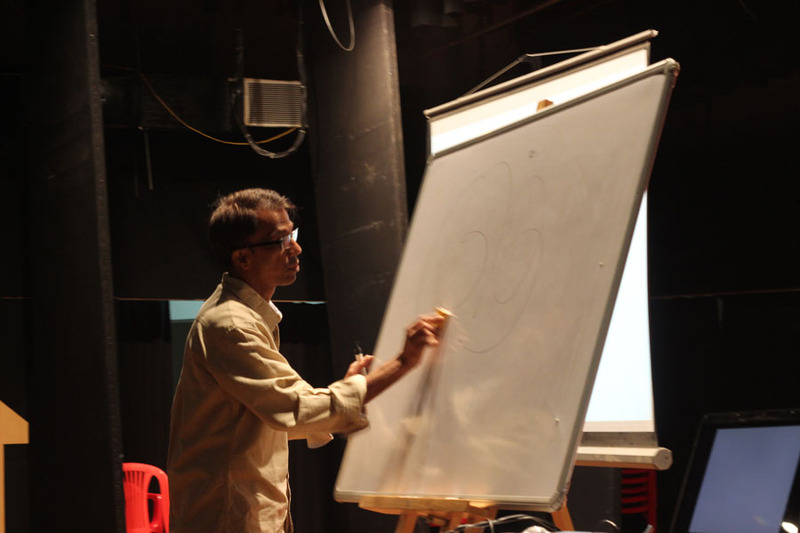 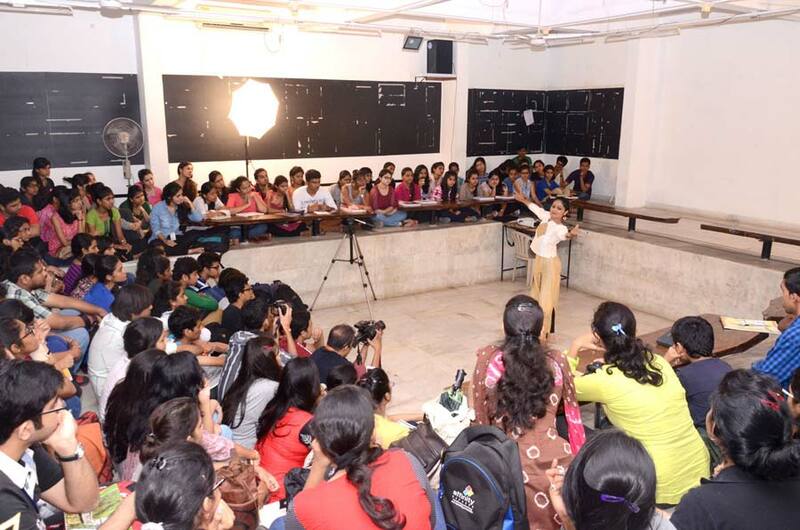 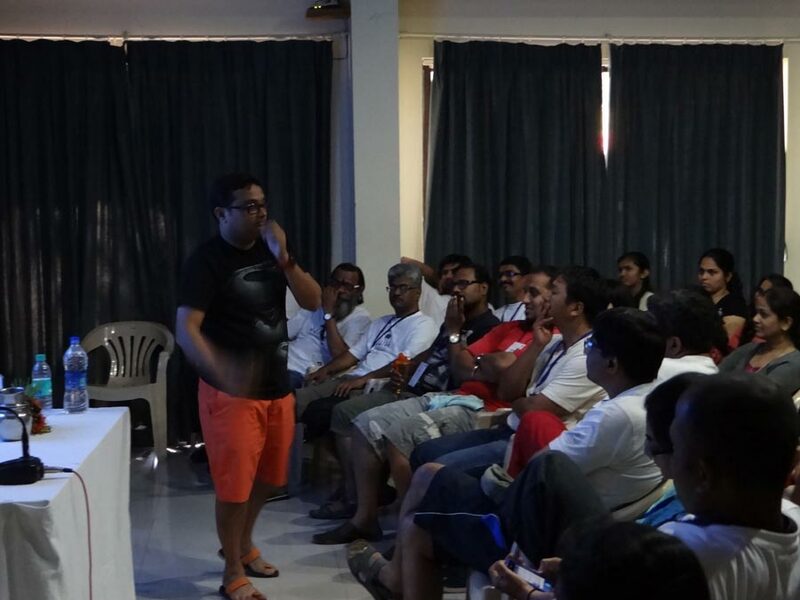 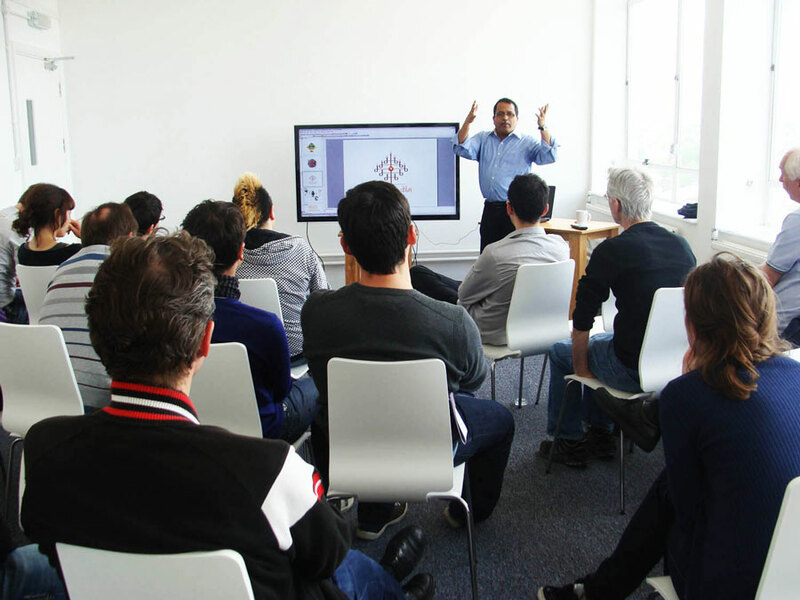 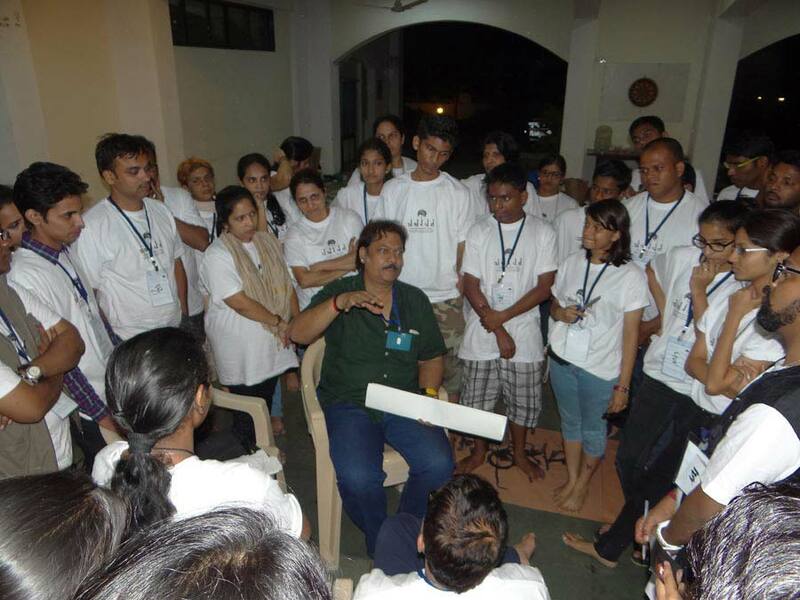 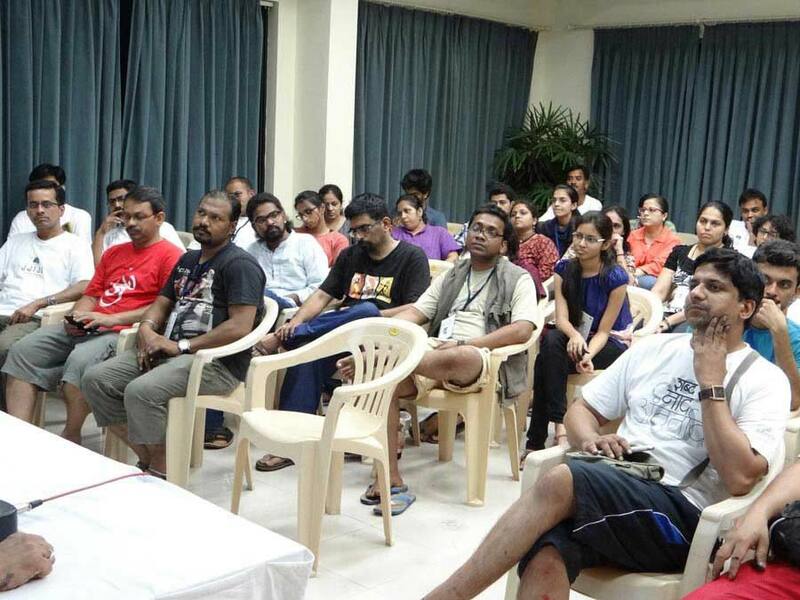 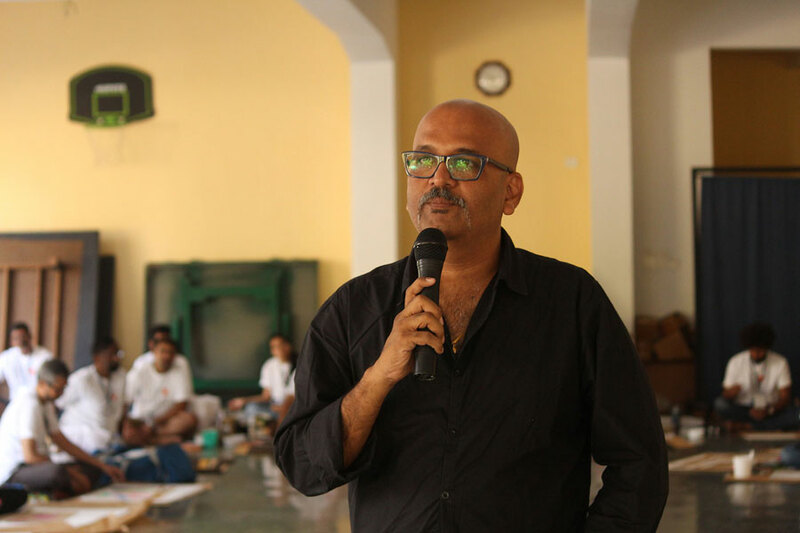 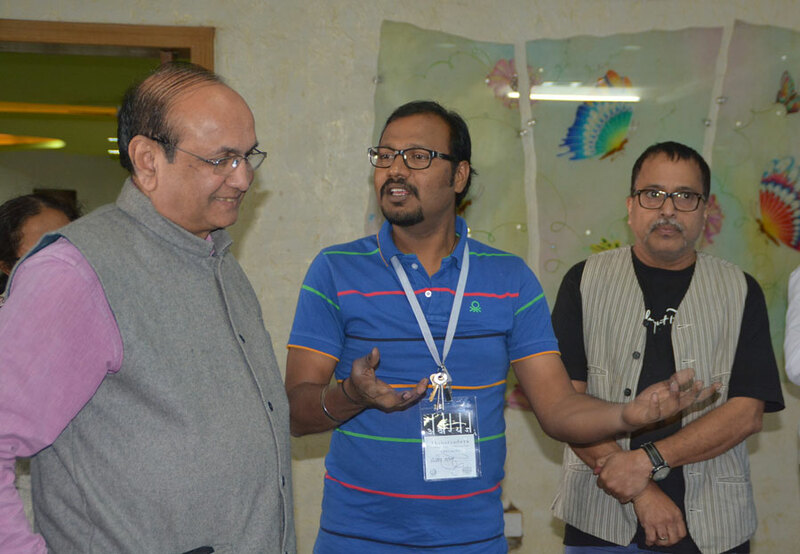 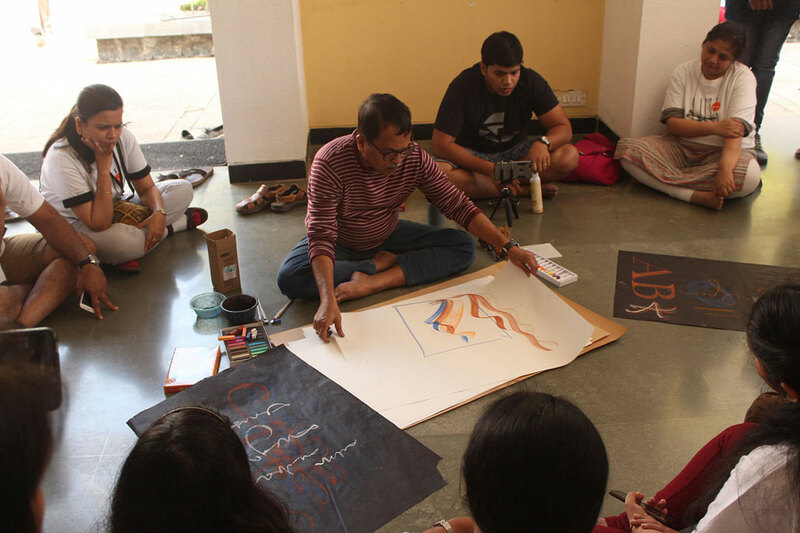 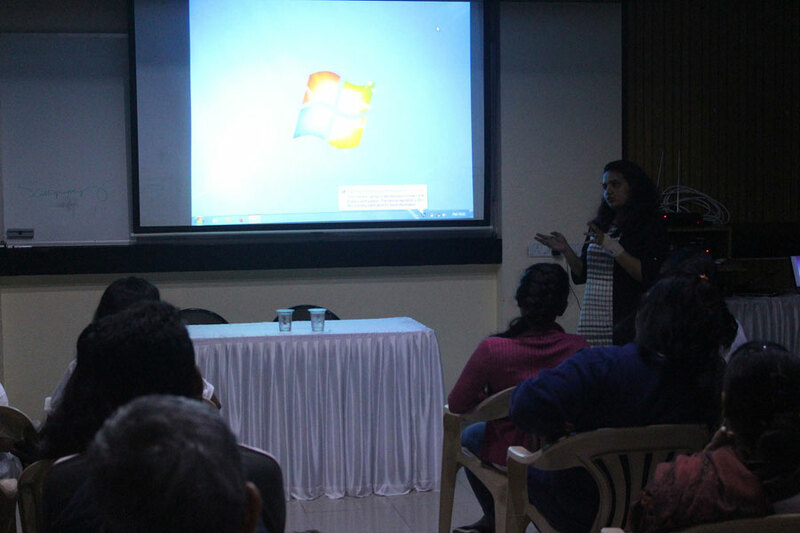 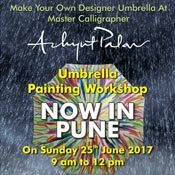 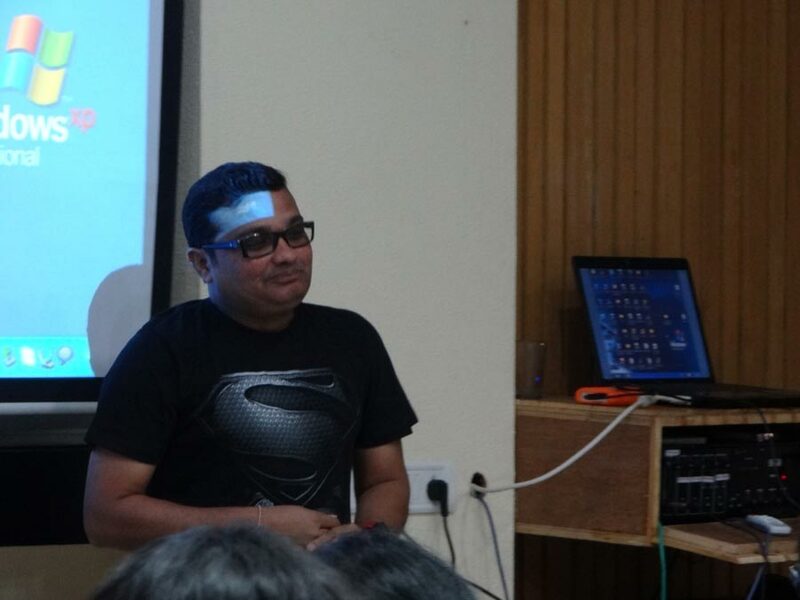 Achyut Palav gave a lecture & a demo as a part of the master class. 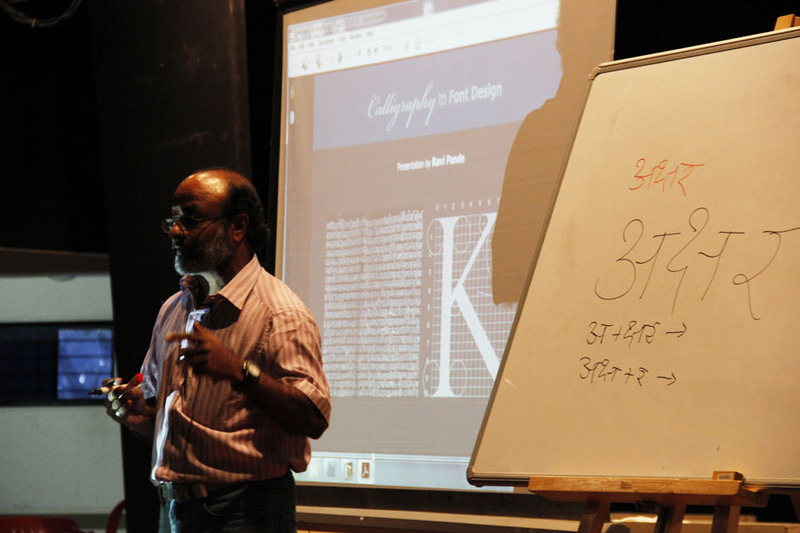 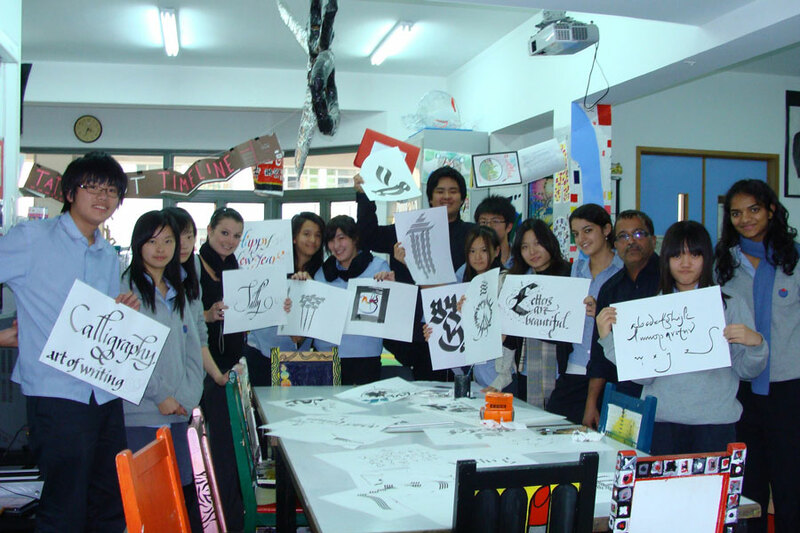 His topic for the lecture was "The Aesthetically Rich Indian Calligraphy". 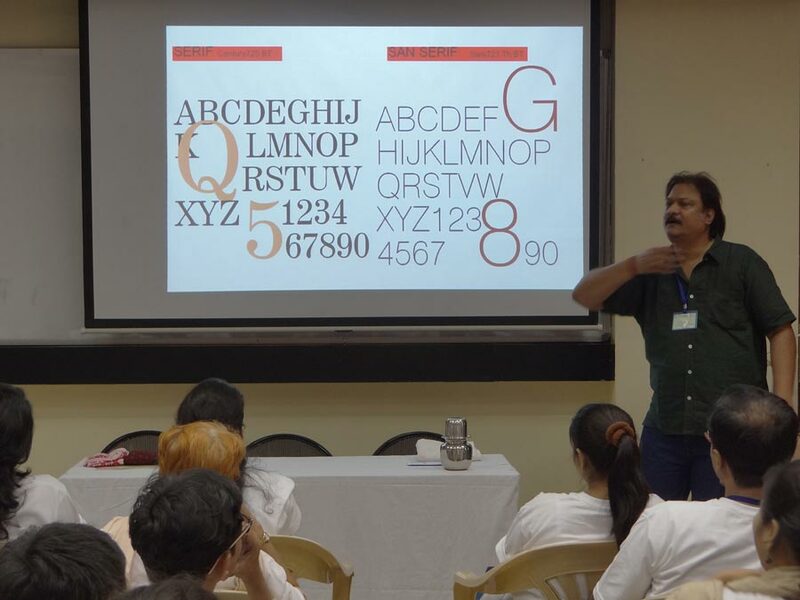 Achyut Palav's lecture & an impressive demo gave an insight into the artistic grandeur of calligraphy especially the beauty of rich Indian scripts. 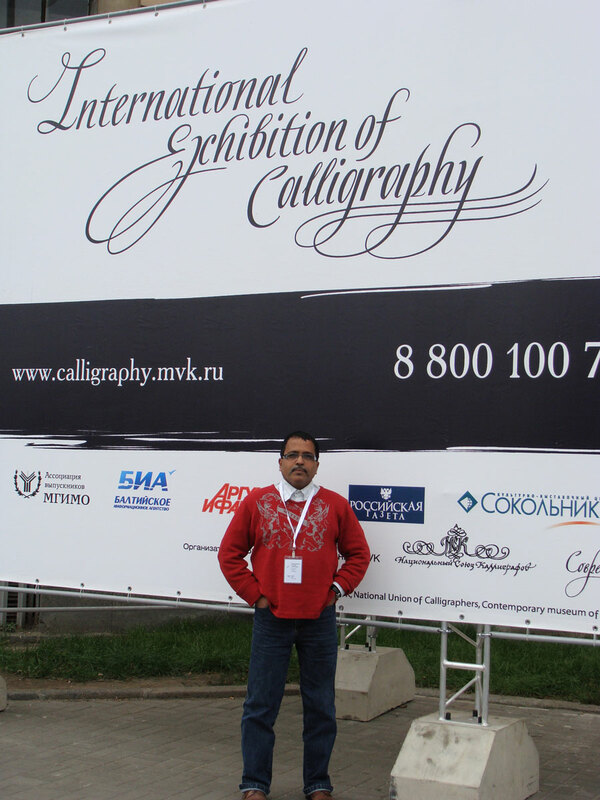 Russians & calligraphers from around the world were charmed by Palav's powerful strokes, the command of the Devnagri script, the innovative tools & the dexterity of his hands. 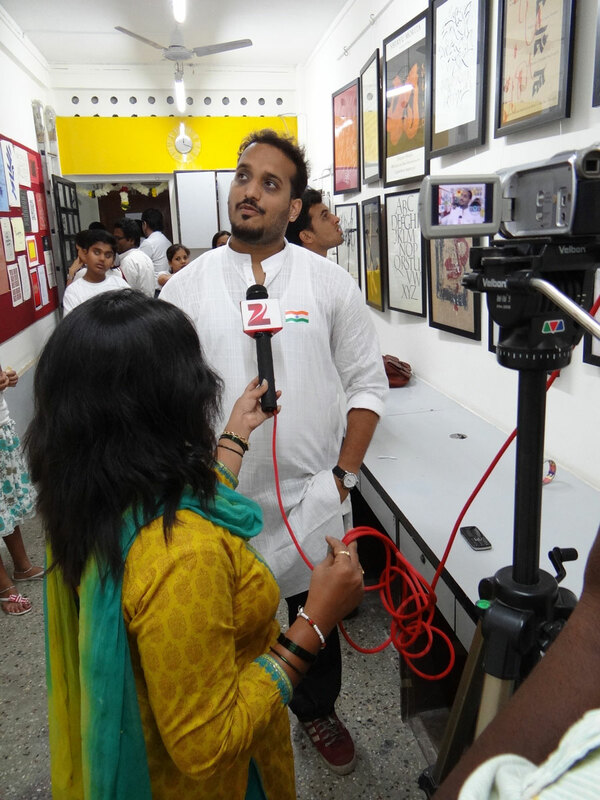 This proud Indian also gave his interview on the Russian channel in Hindi & Marathi. 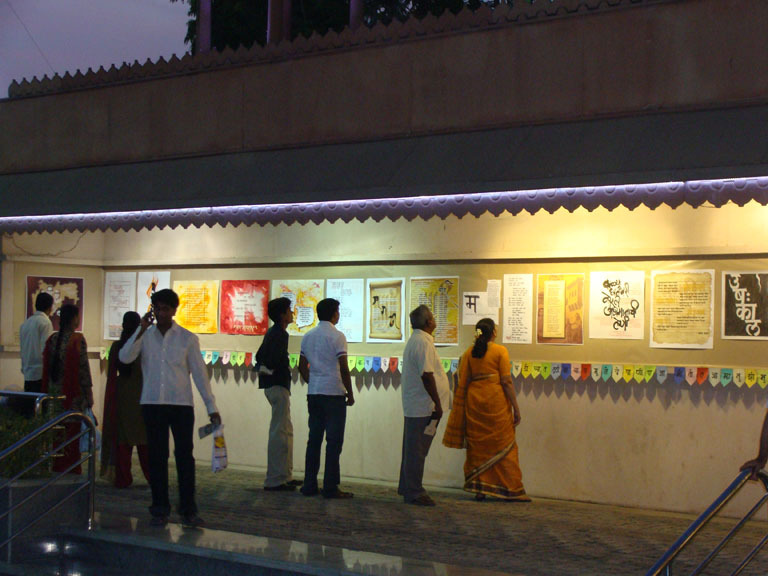 The mandal sent an invitation for a demo & exhibition. 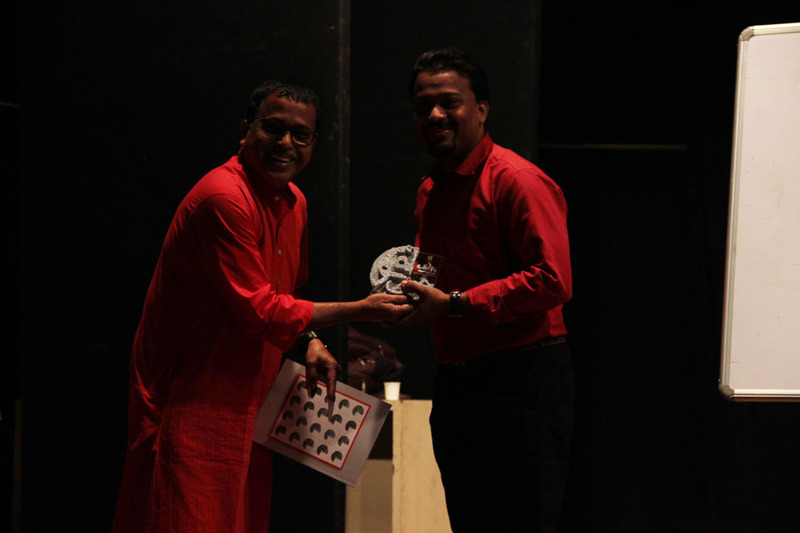 It was highly appreciated. 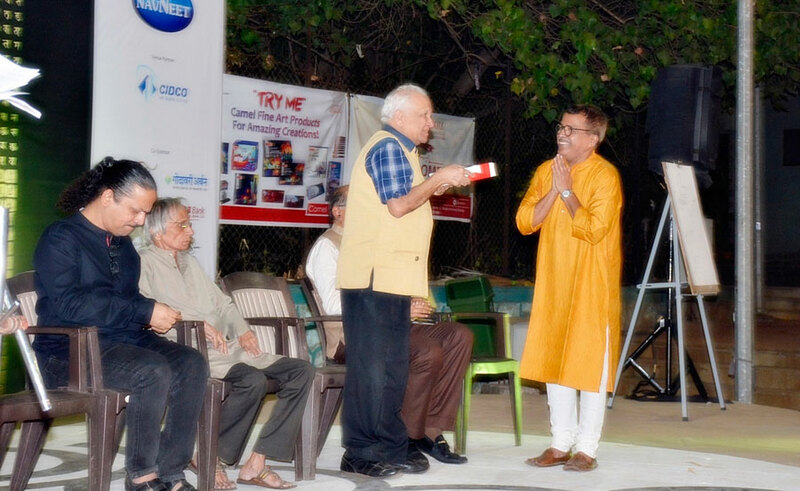 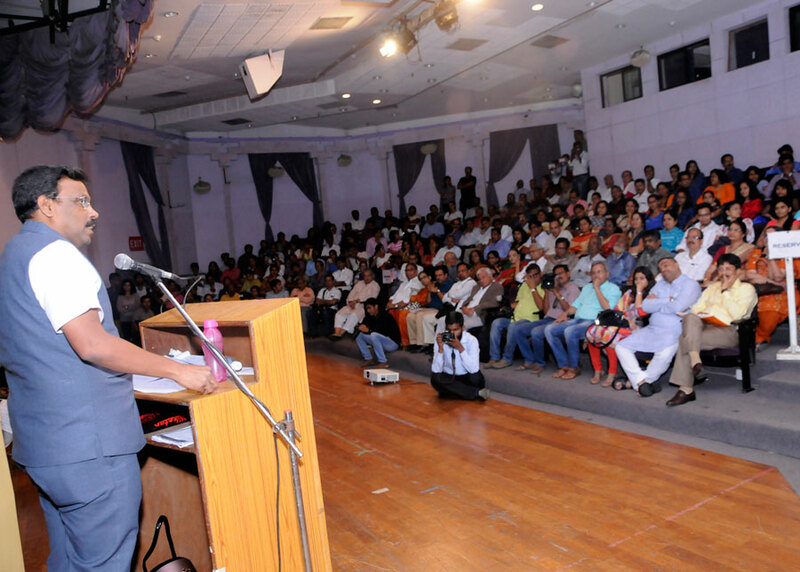 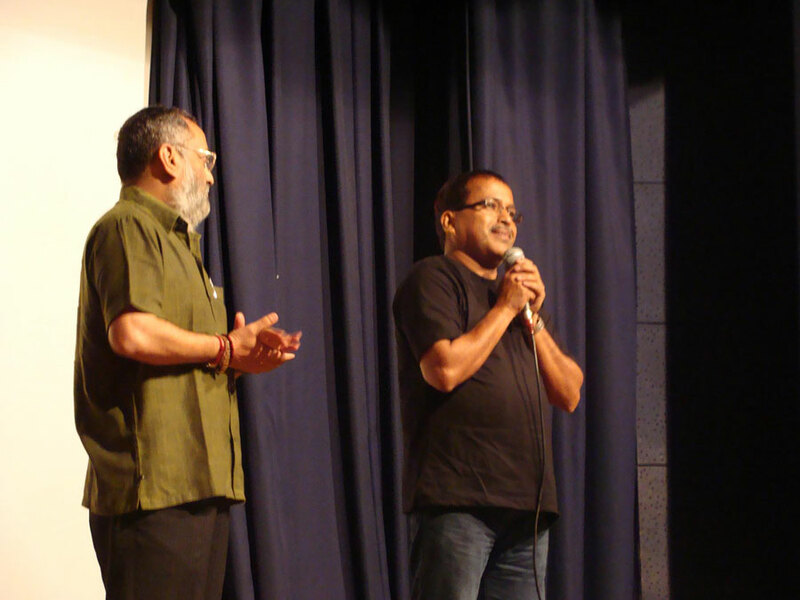 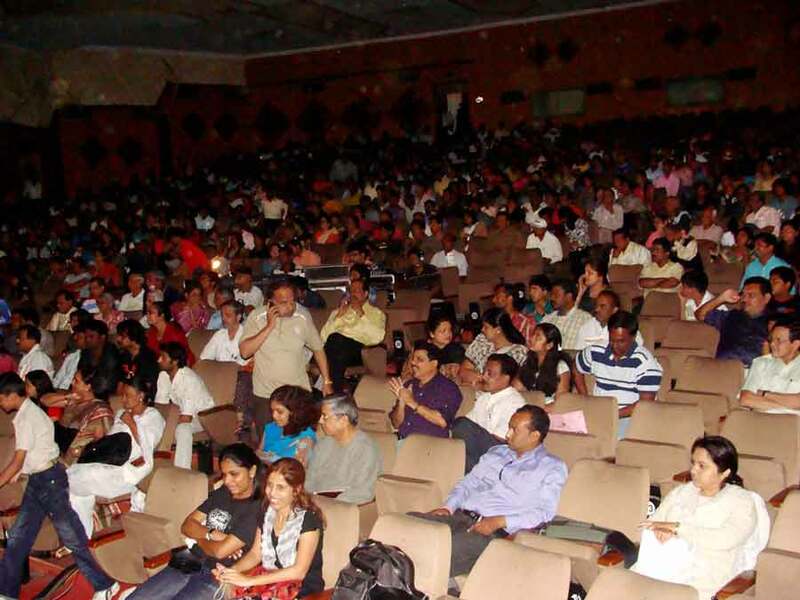 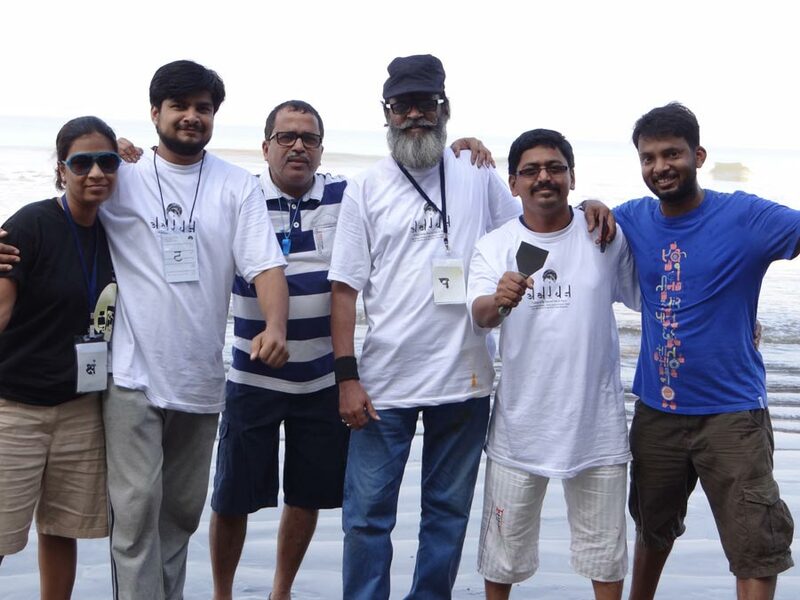 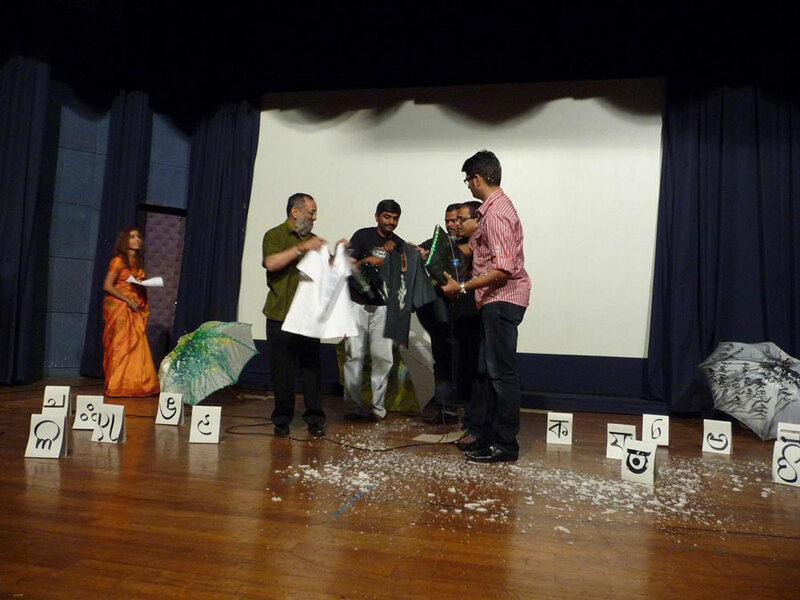 Many residents of Indian origin & some familiar faces from Marathi theatre were present. 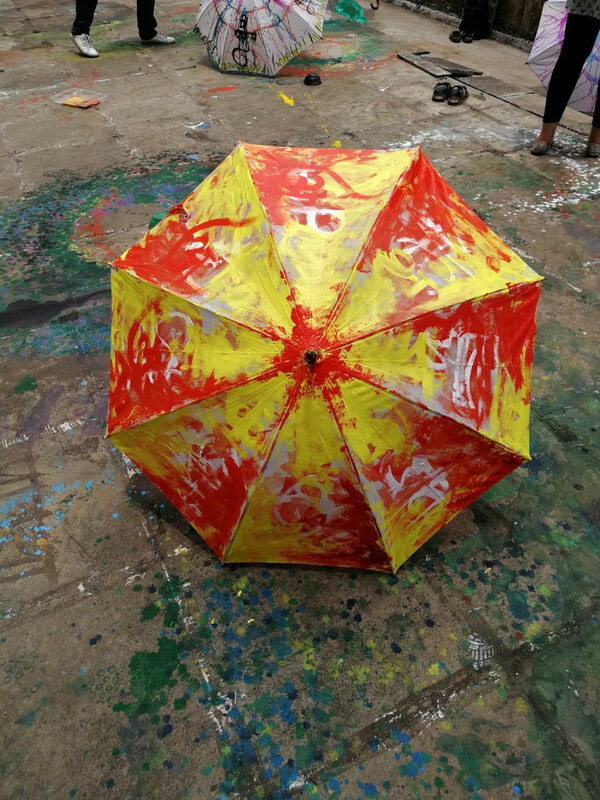 The true potential lies with the kids. 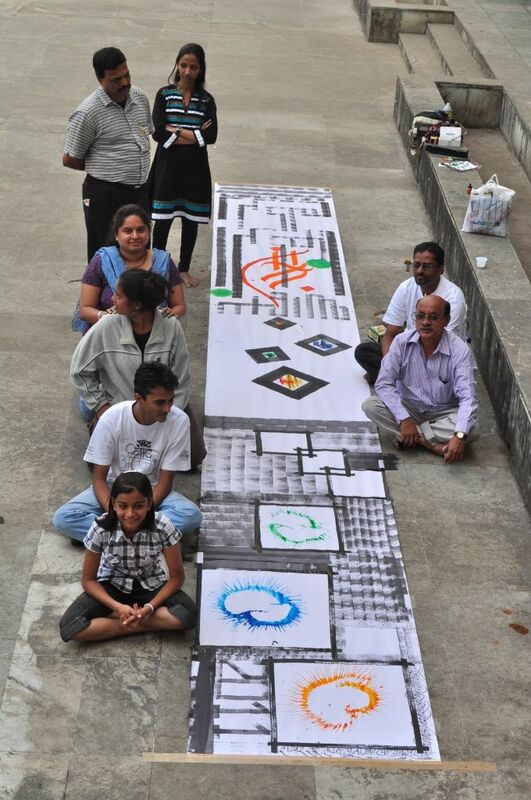 Their creativity & imagination know no bounds. 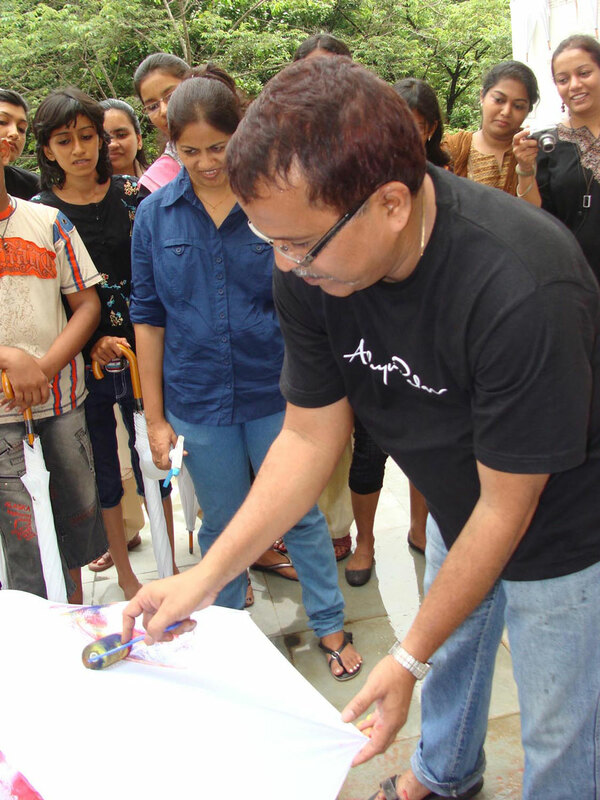 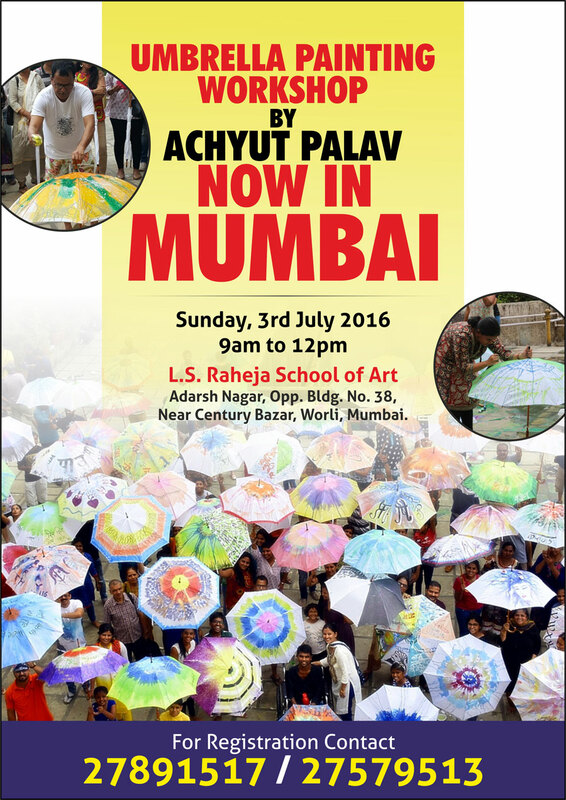 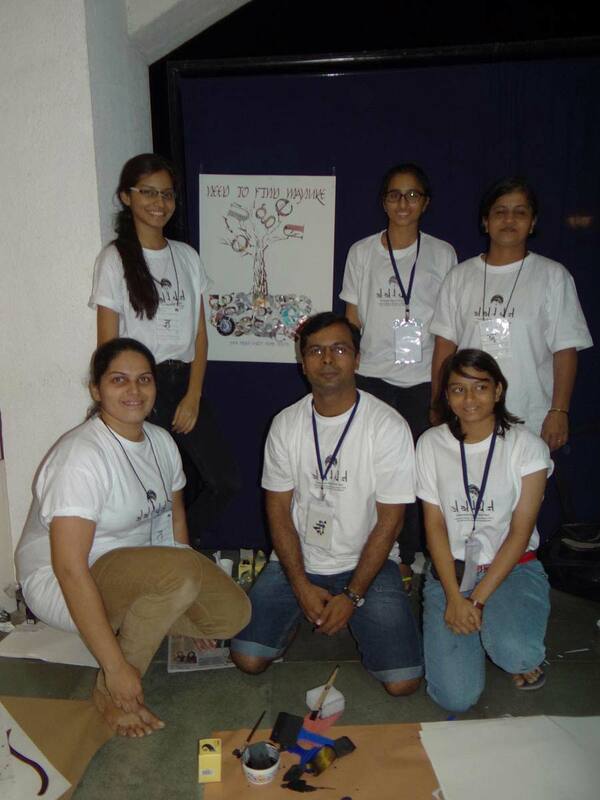 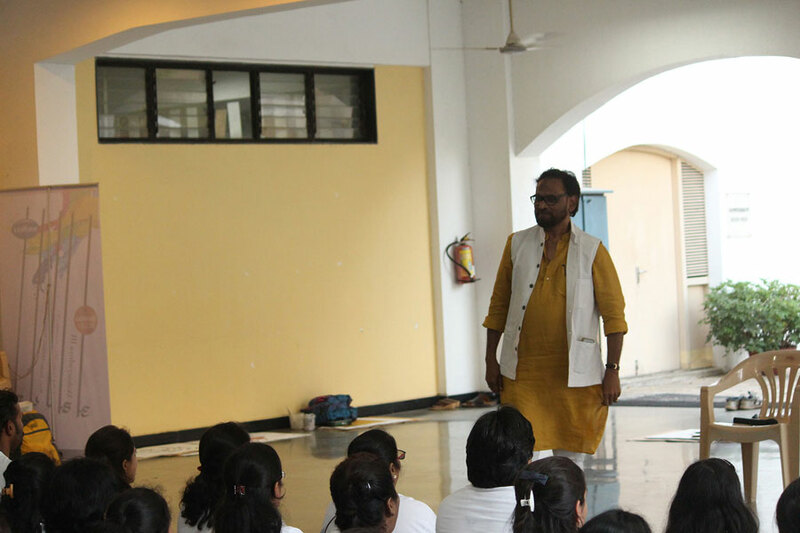 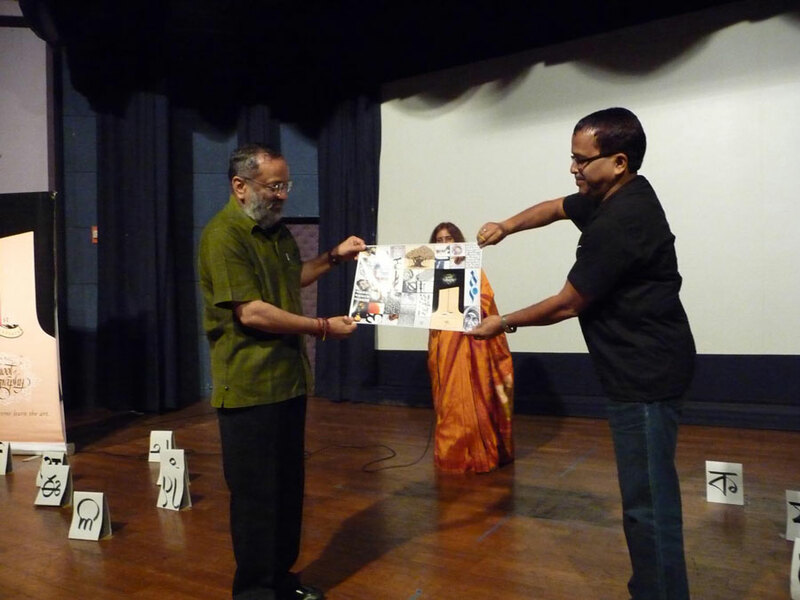 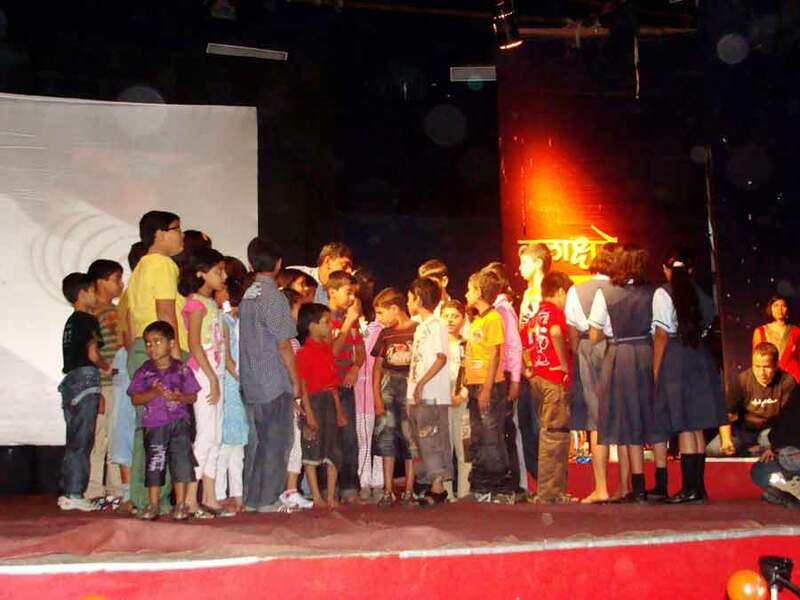 Thus a program with POGO gave Achyut Palav take his art to kids. 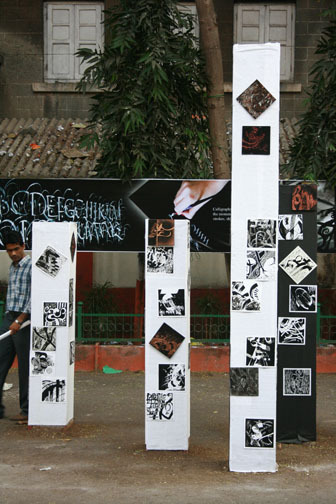 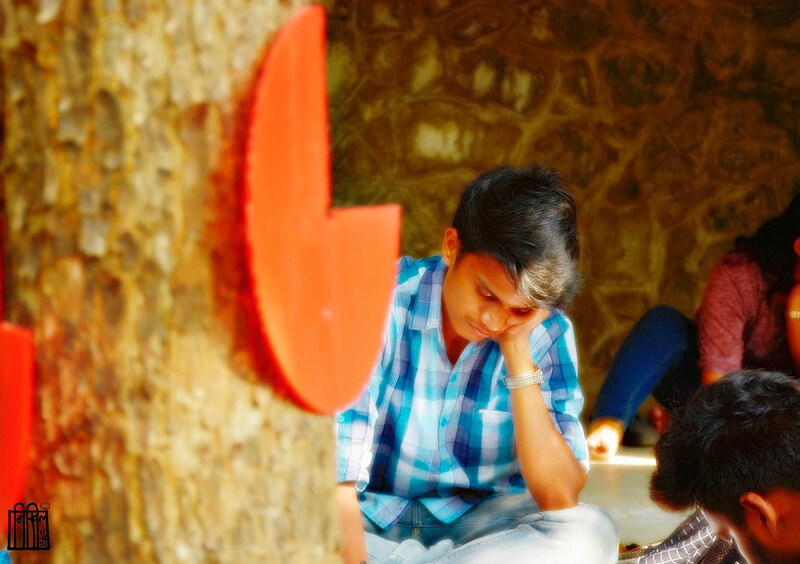 Centre for Extra Mural Studies, University of Mumbai. 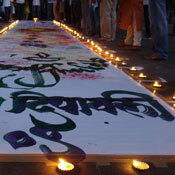 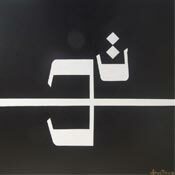 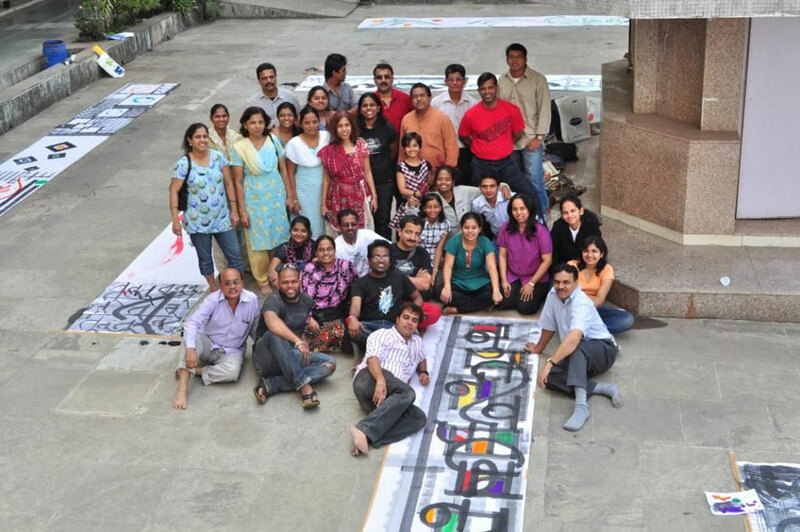 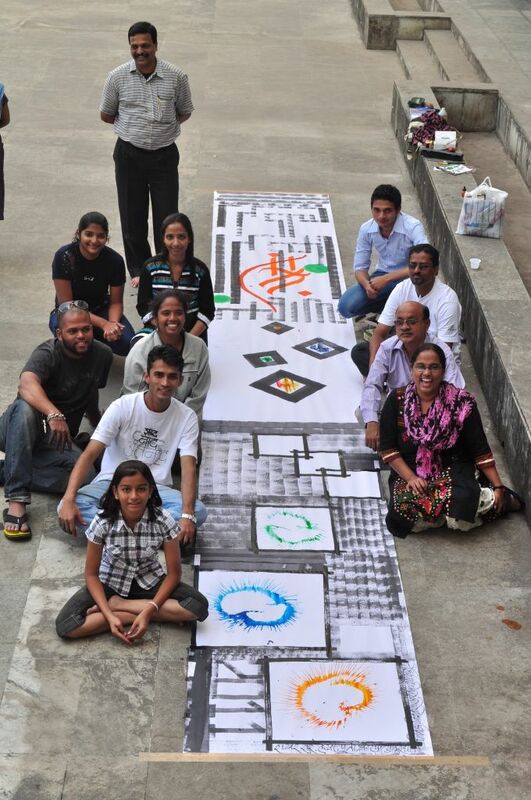 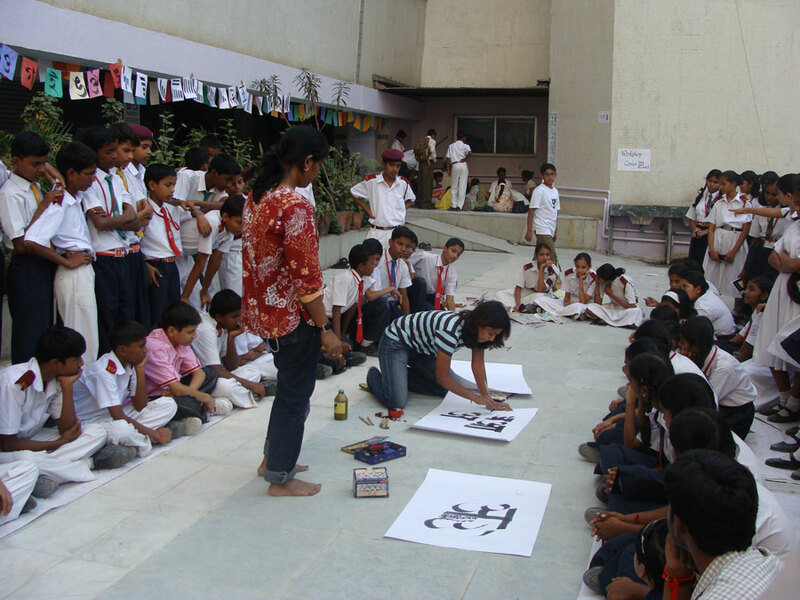 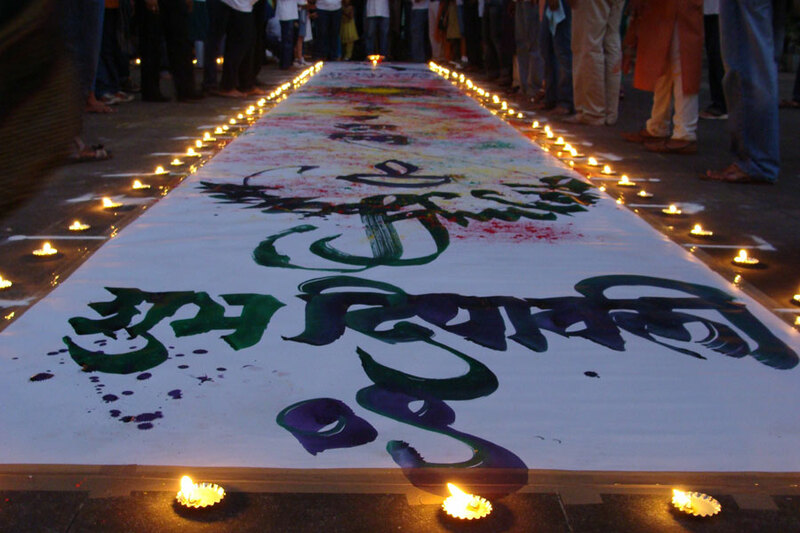 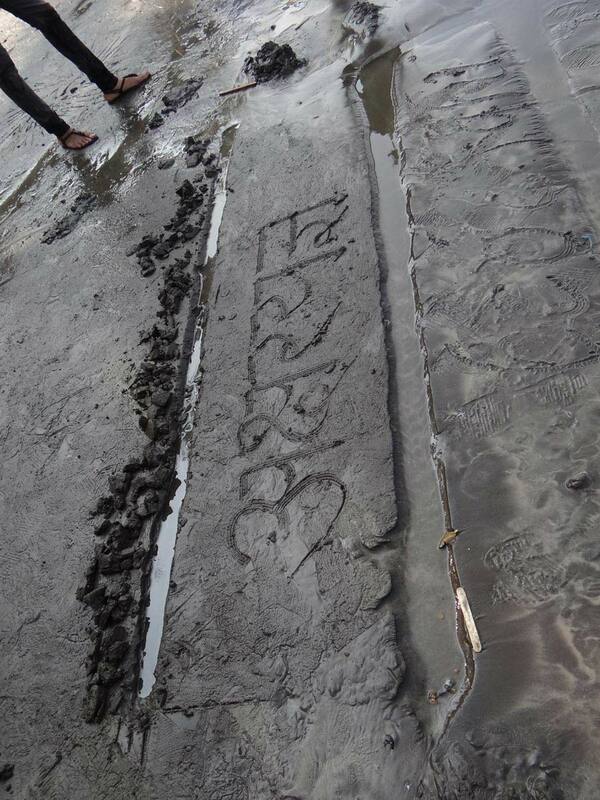 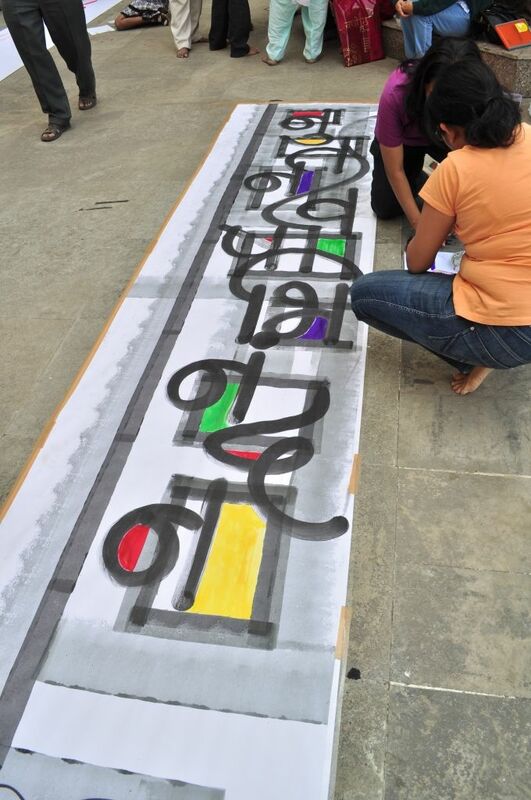 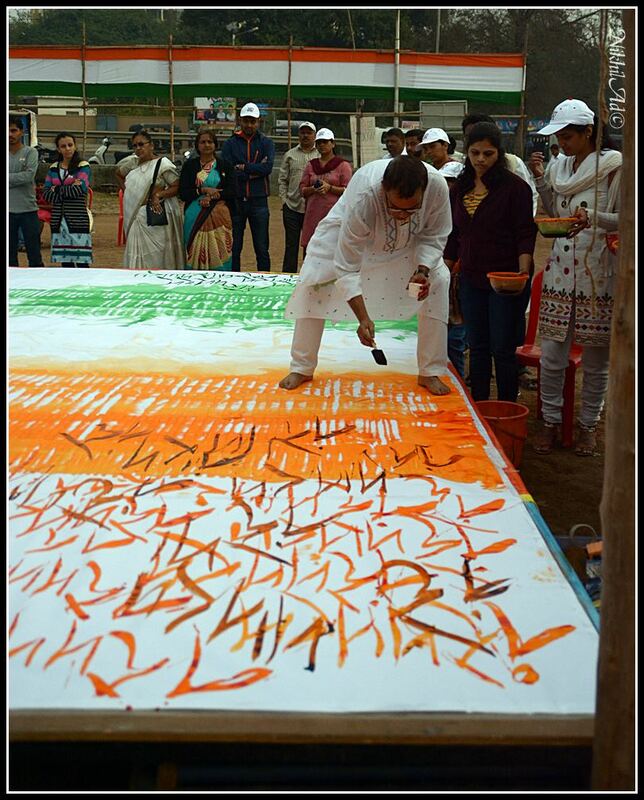 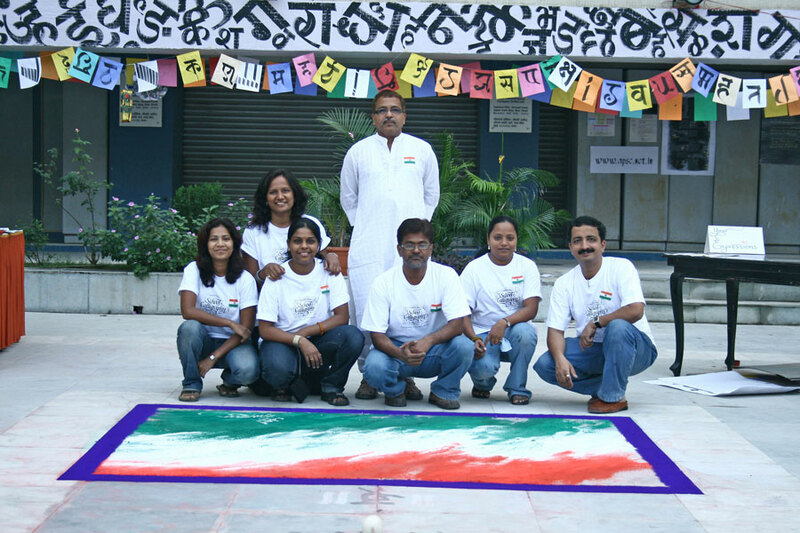 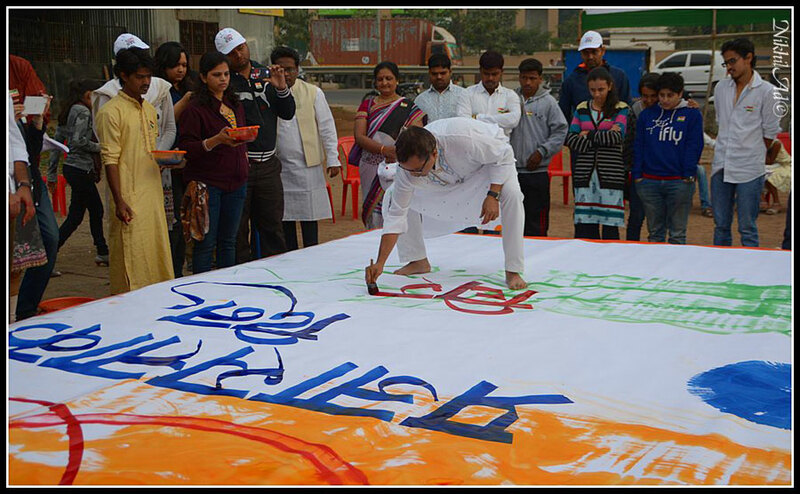 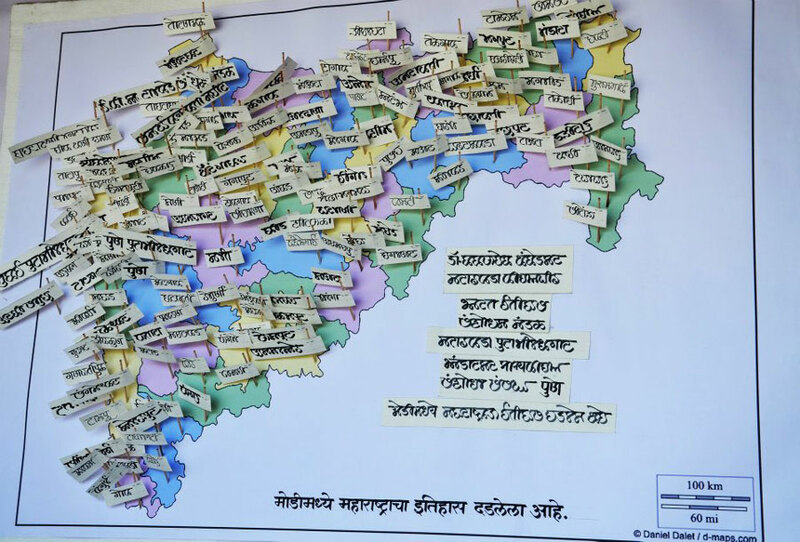 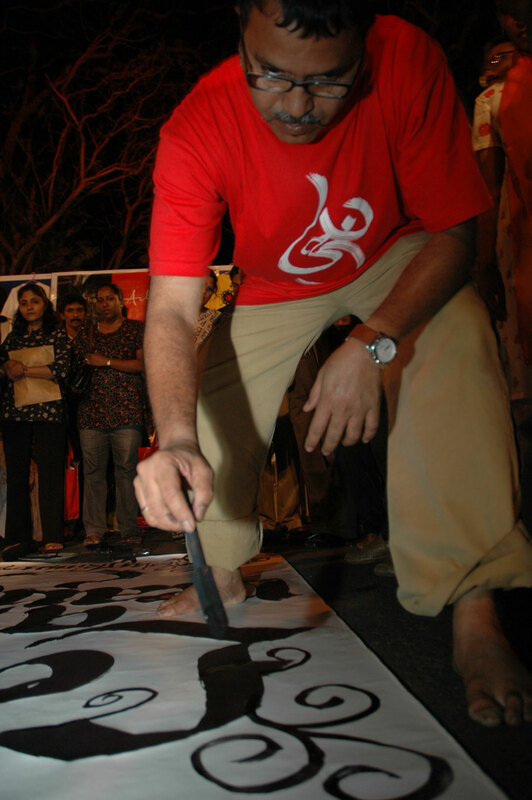 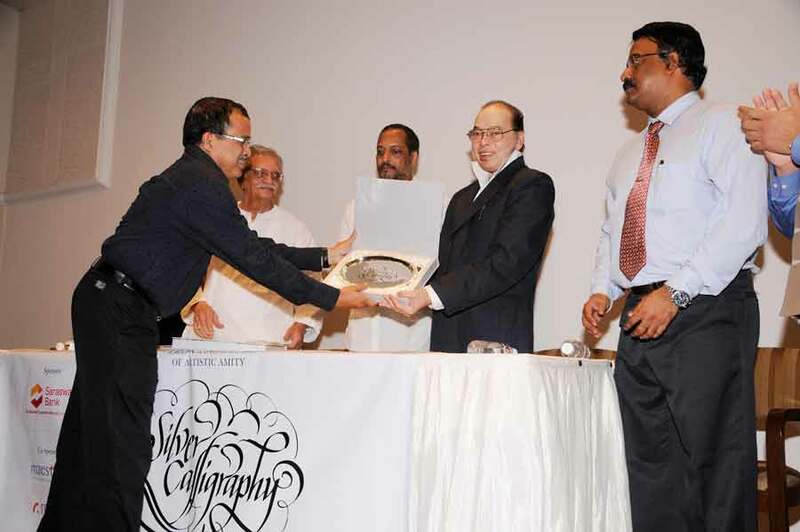 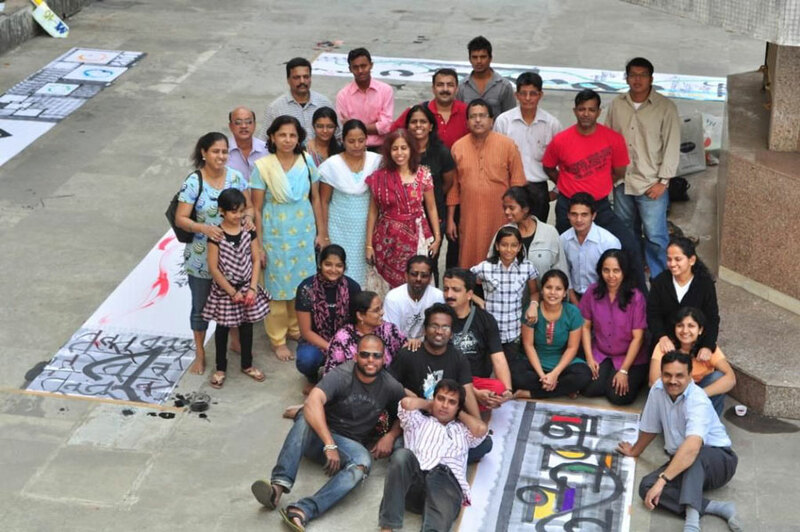 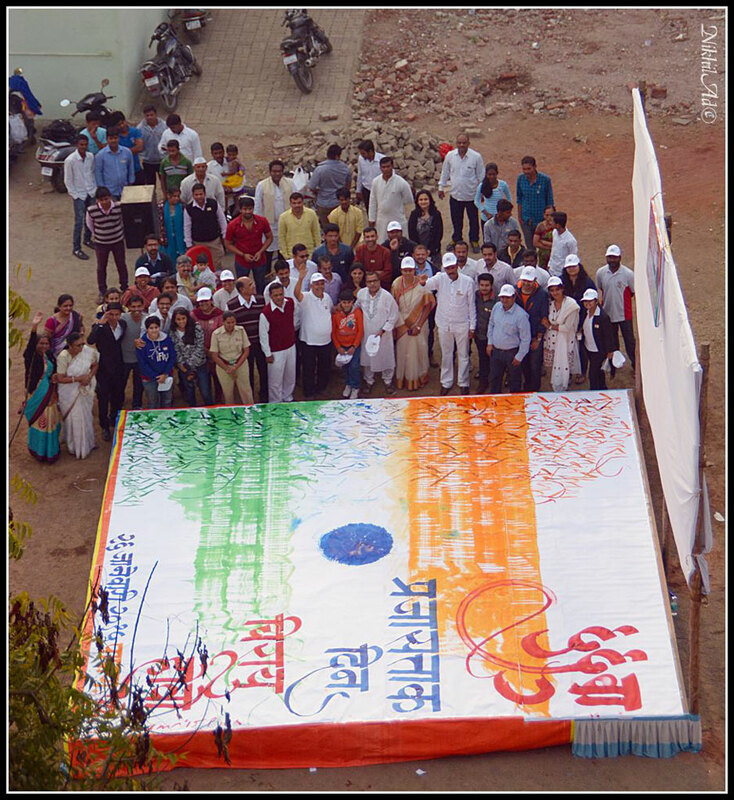 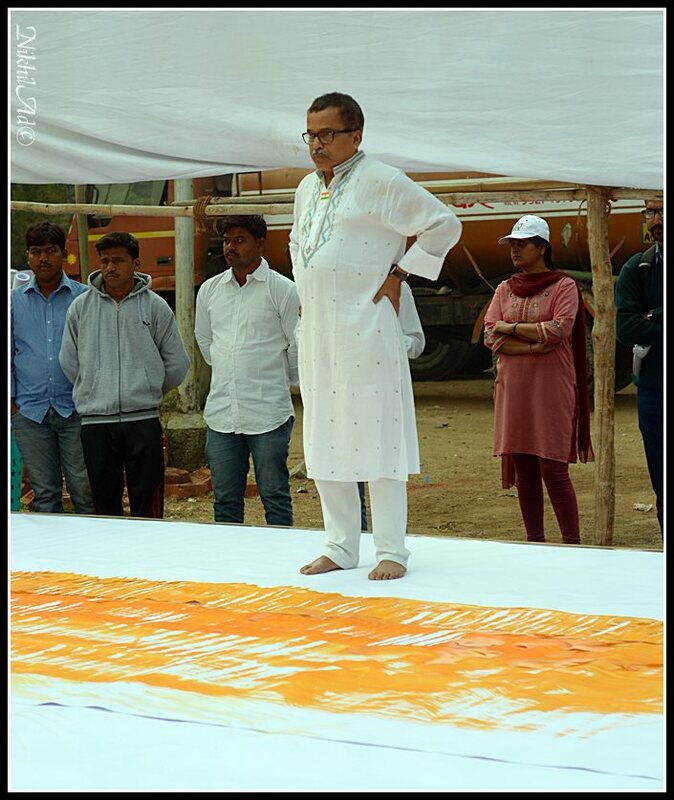 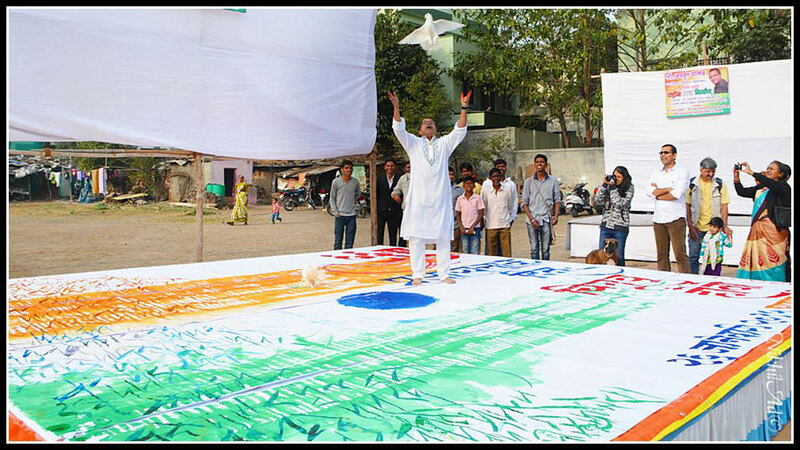 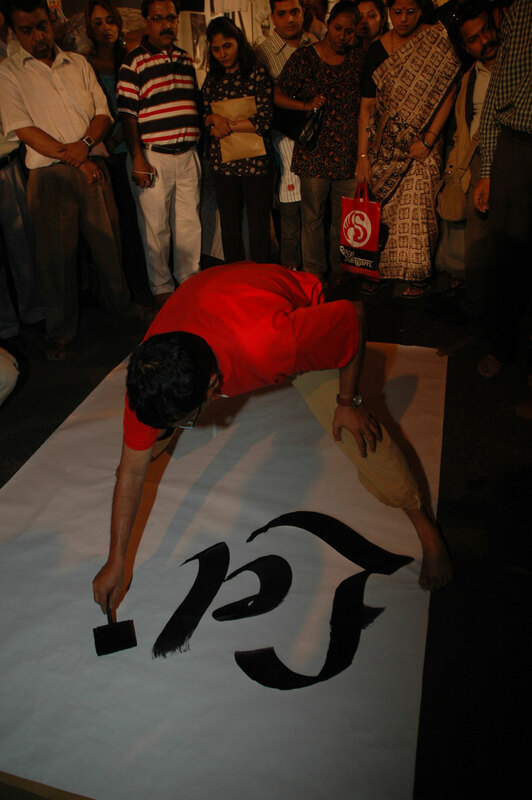 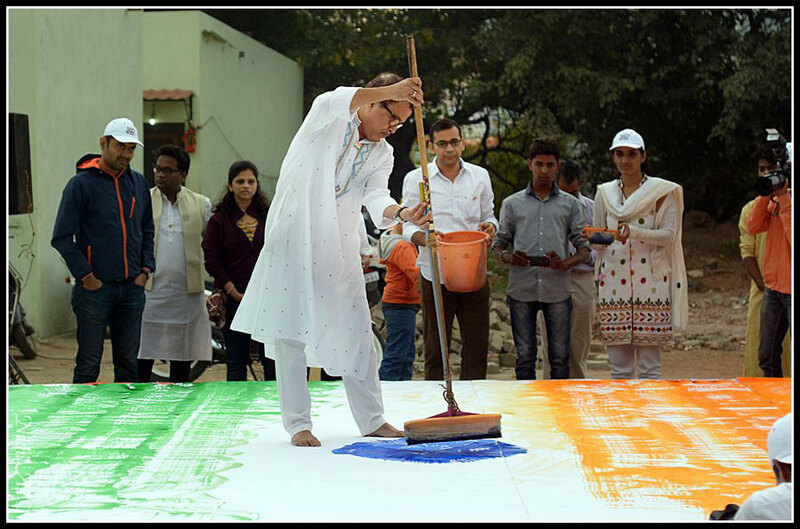 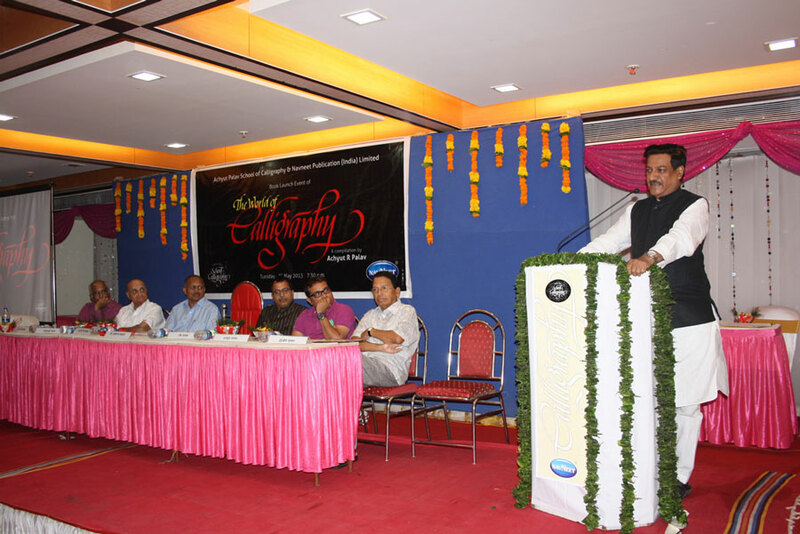 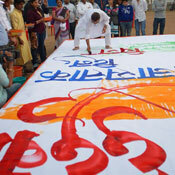 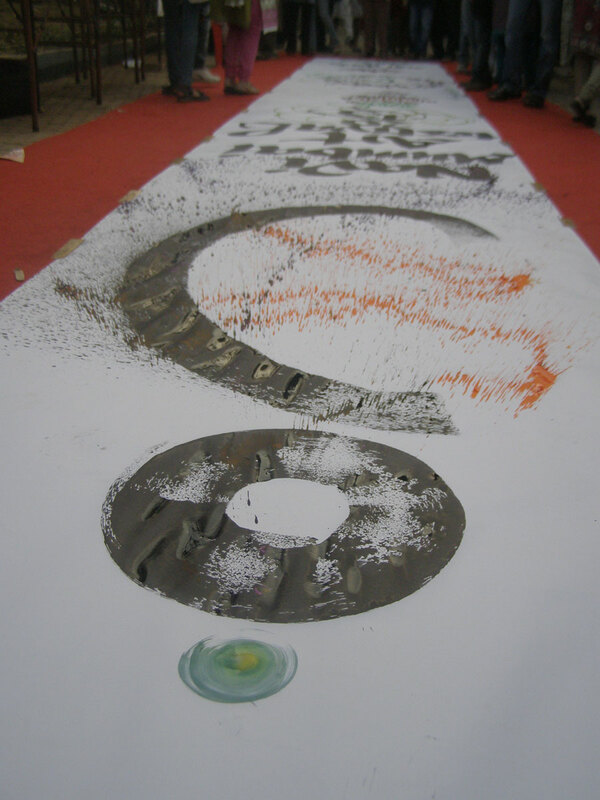 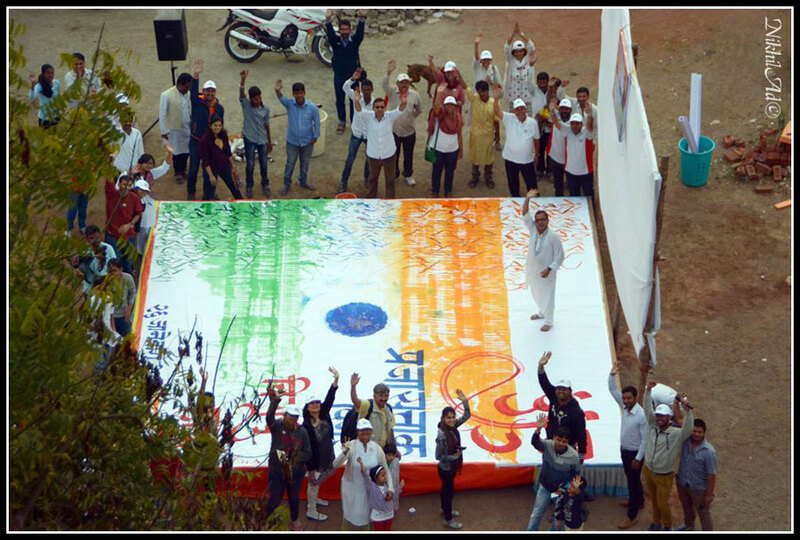 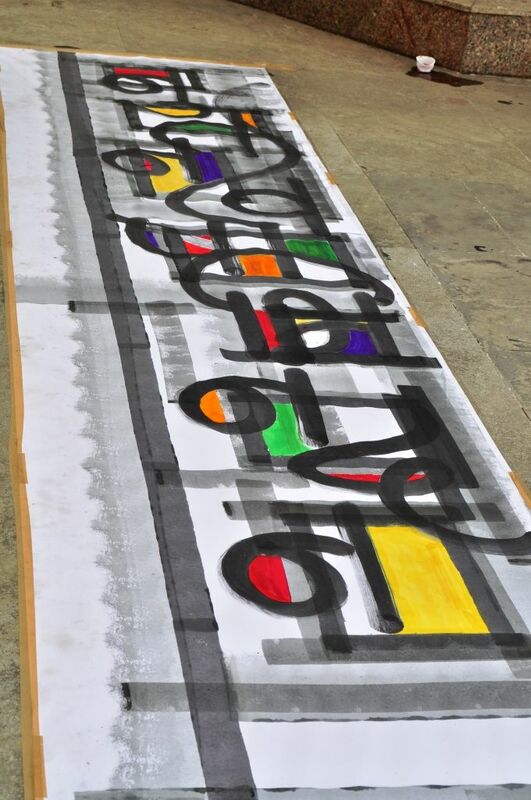 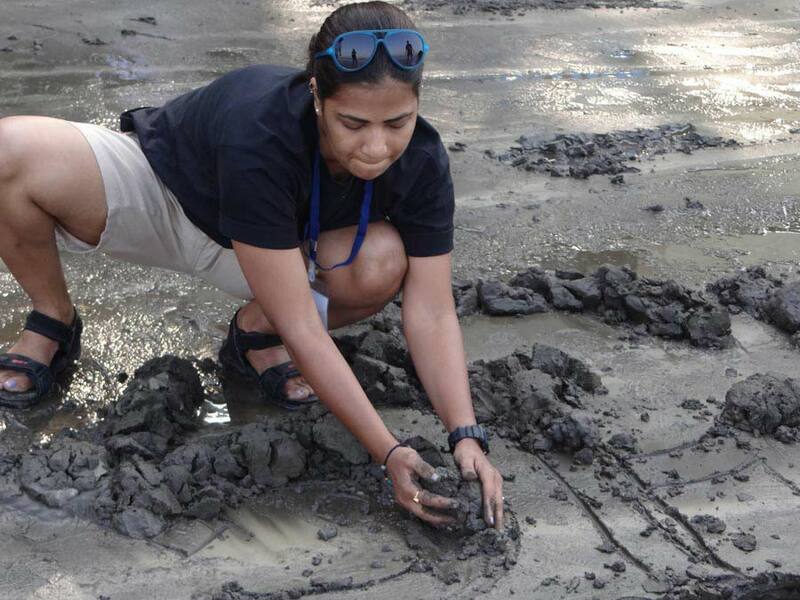 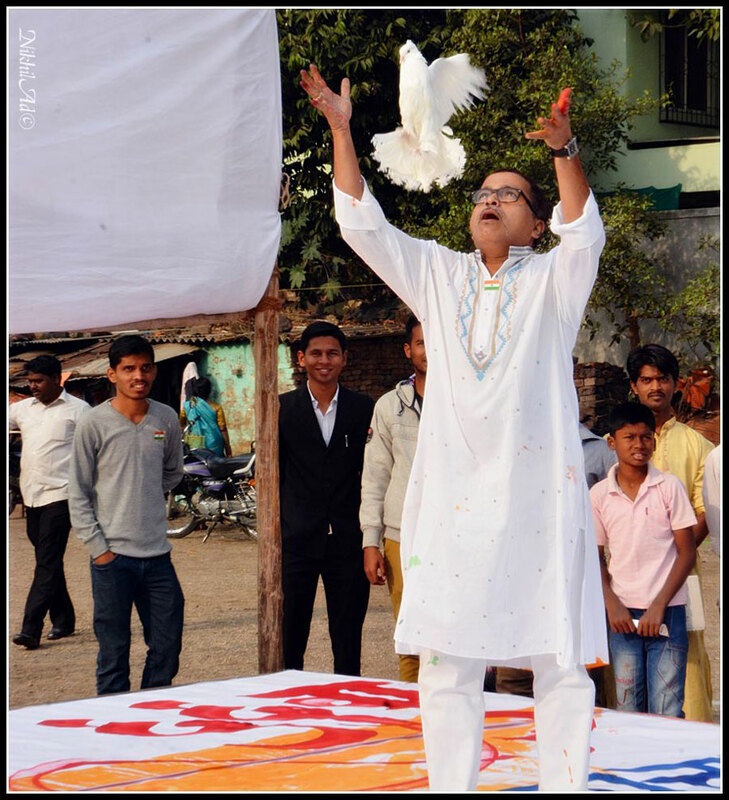 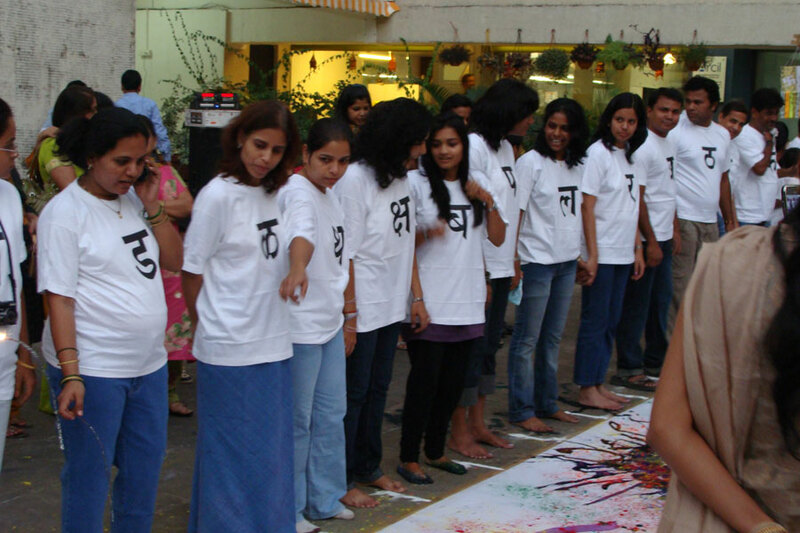 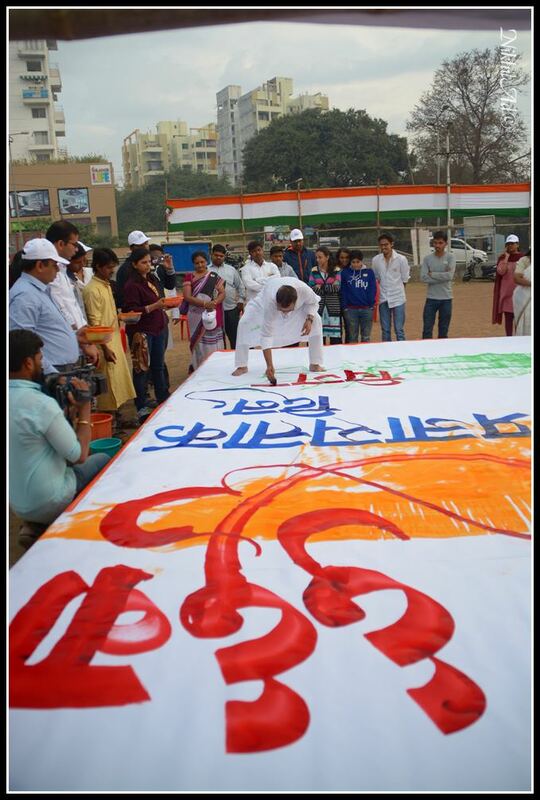 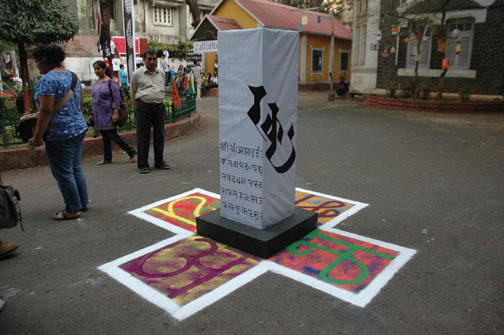 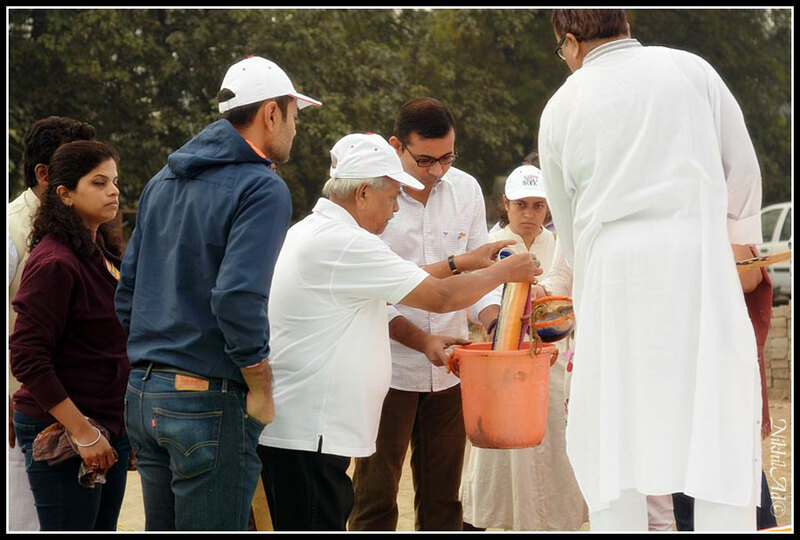 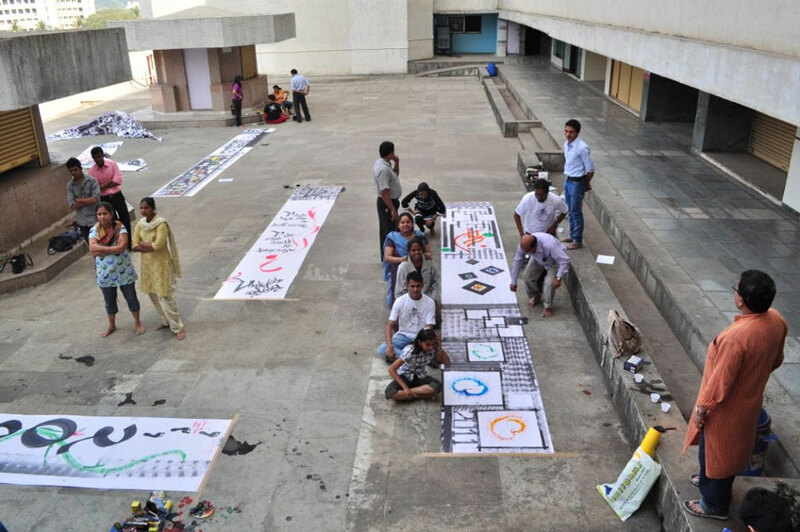 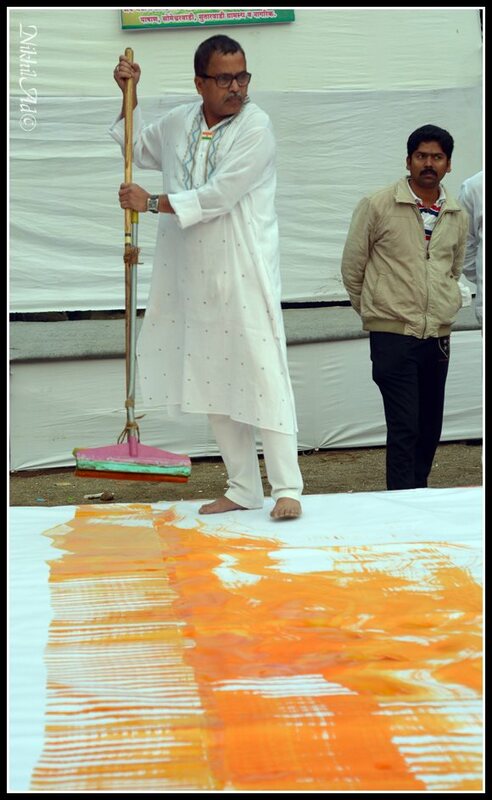 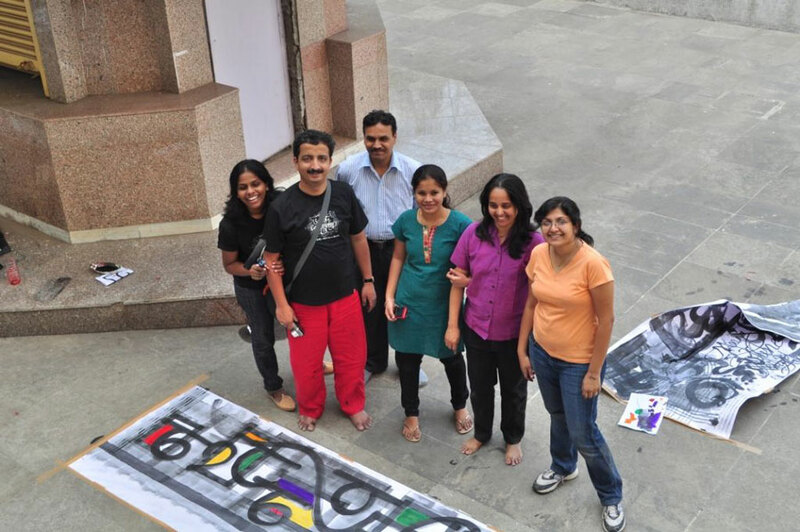 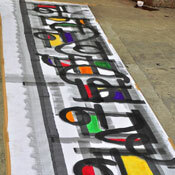 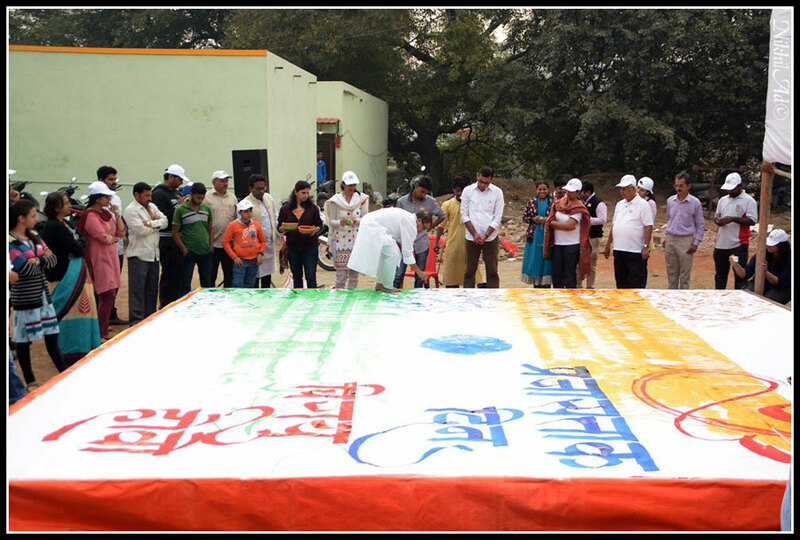 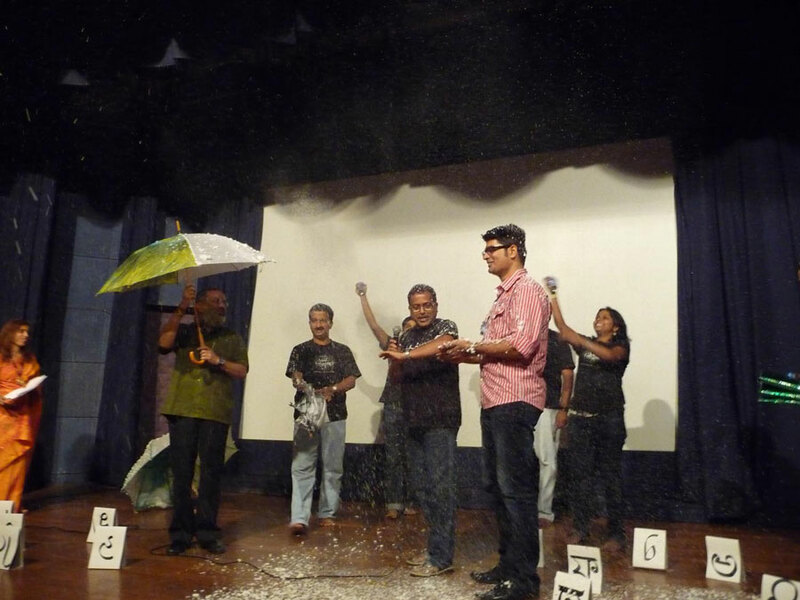 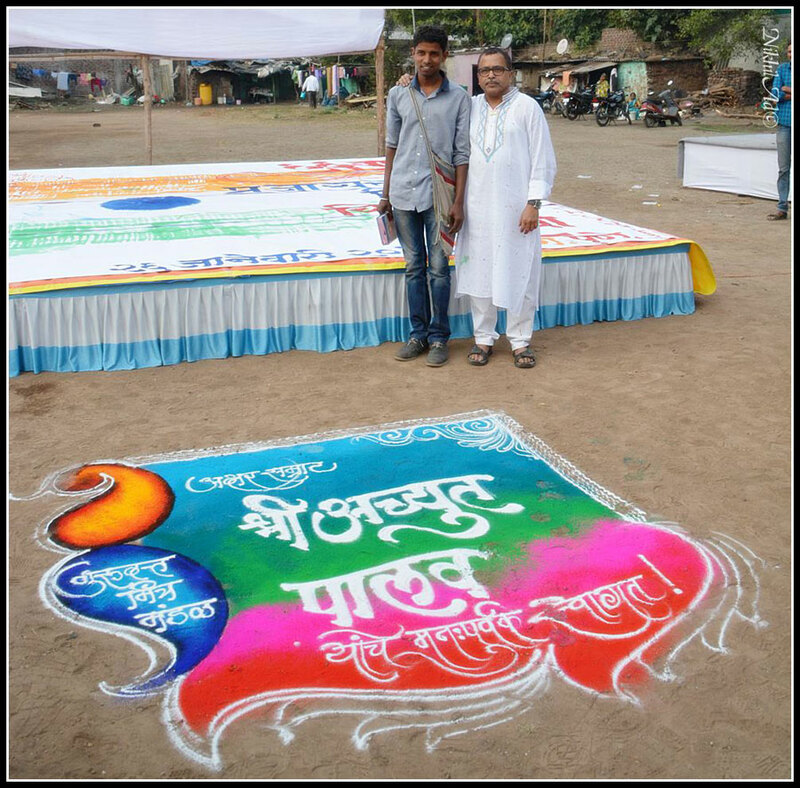 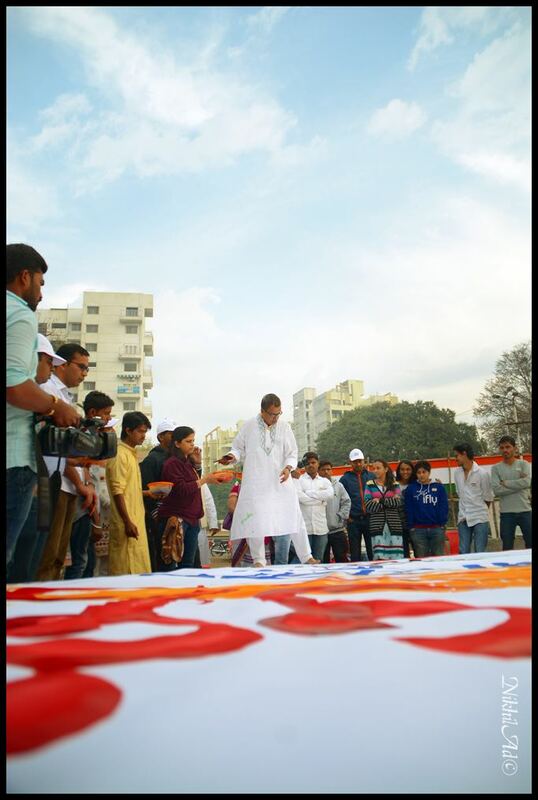 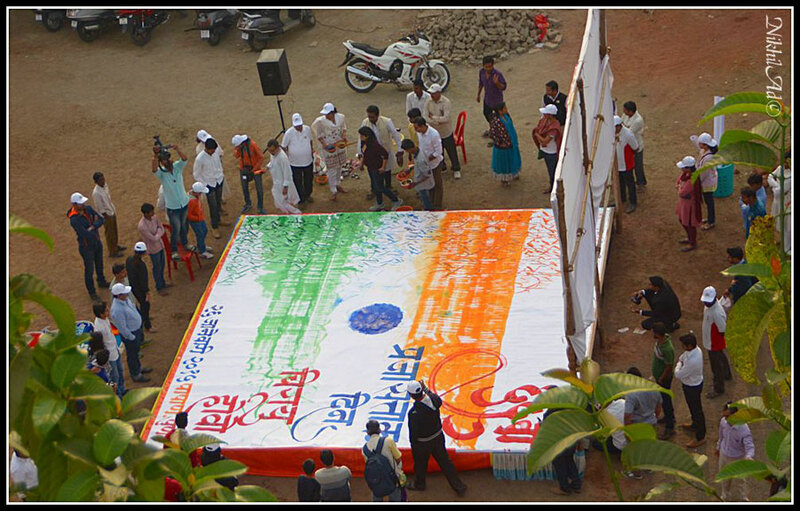 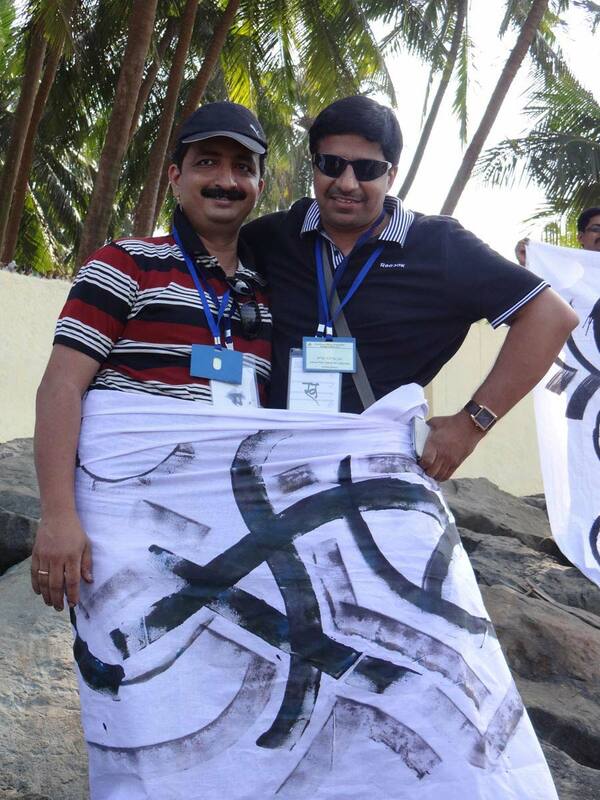 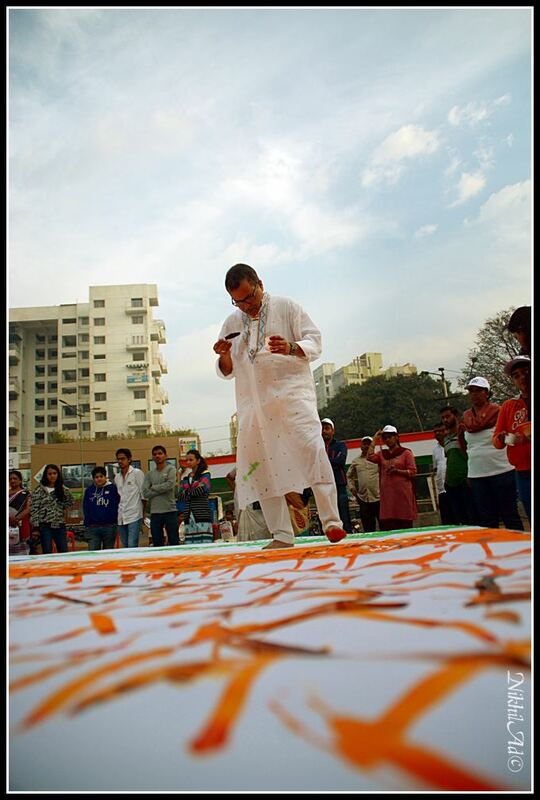 Commencement of - Calligraphy Roadways - byAchyut Palav, taking calligraphy to the people. 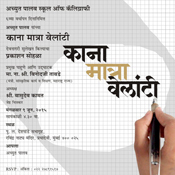 The function will be presided over by Dr. A.D.Sawant, AG. 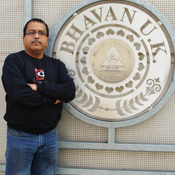 Vice-Chancellor & Pro. 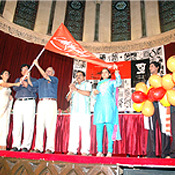 Vice-Chancellor of the university of Mumbai at Convocation Hall, University of Mumbai, Fort. 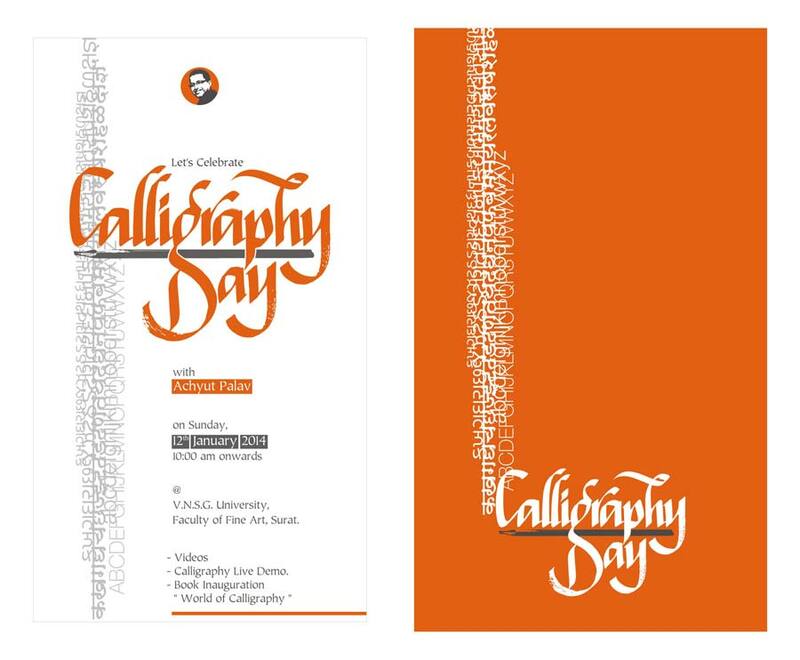 I have been in this field of calligraphy for 25 years & have in mind a small event for celebrating these very interesting & fruitful years. 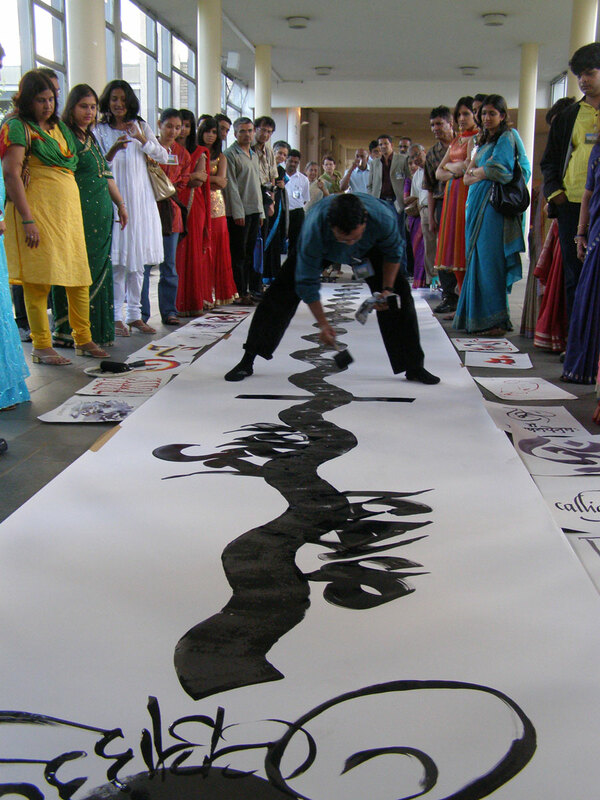 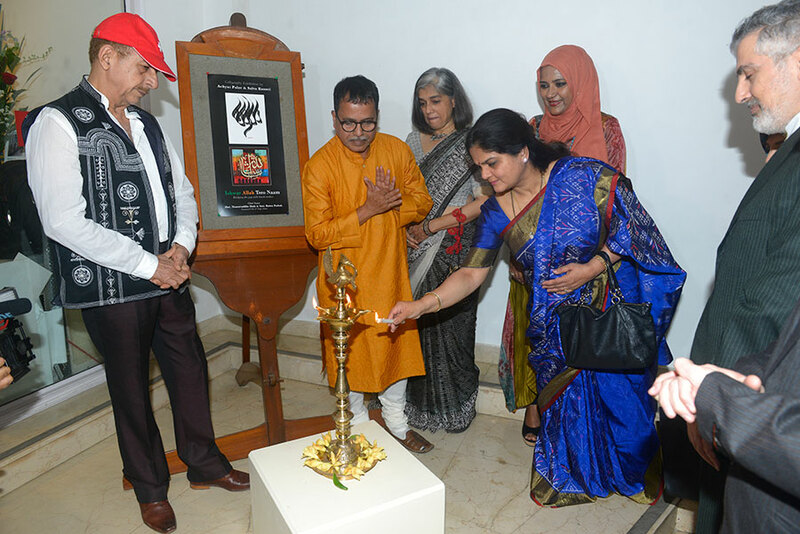 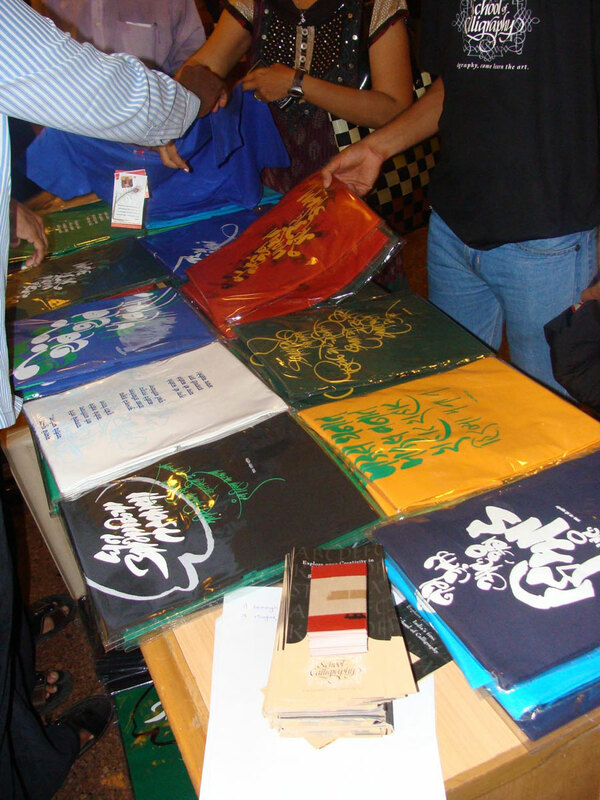 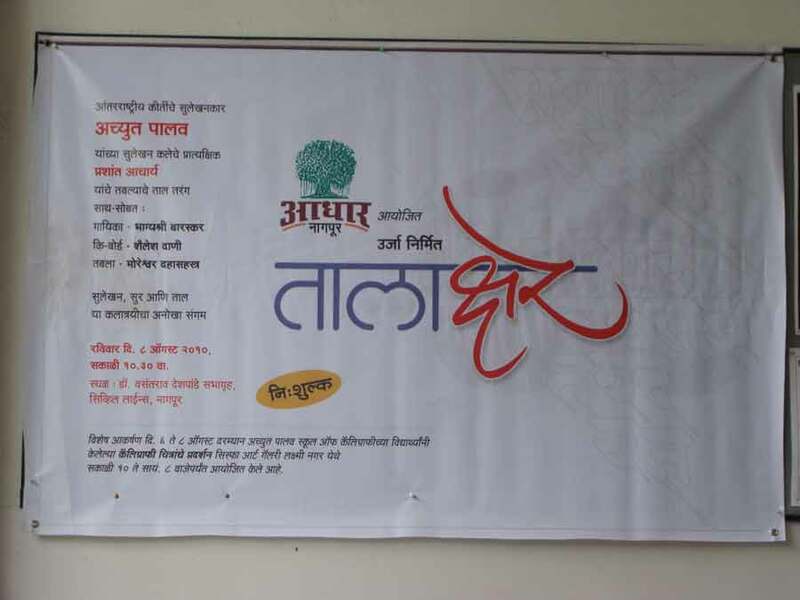 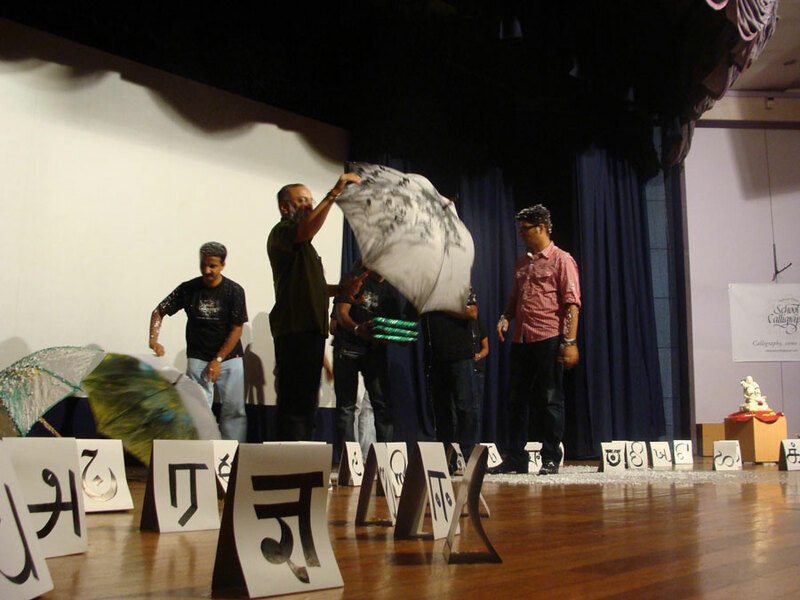 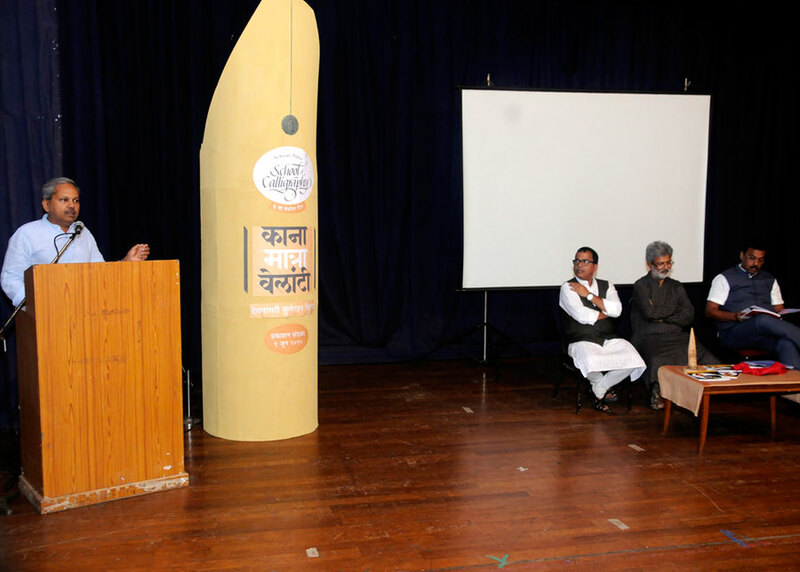 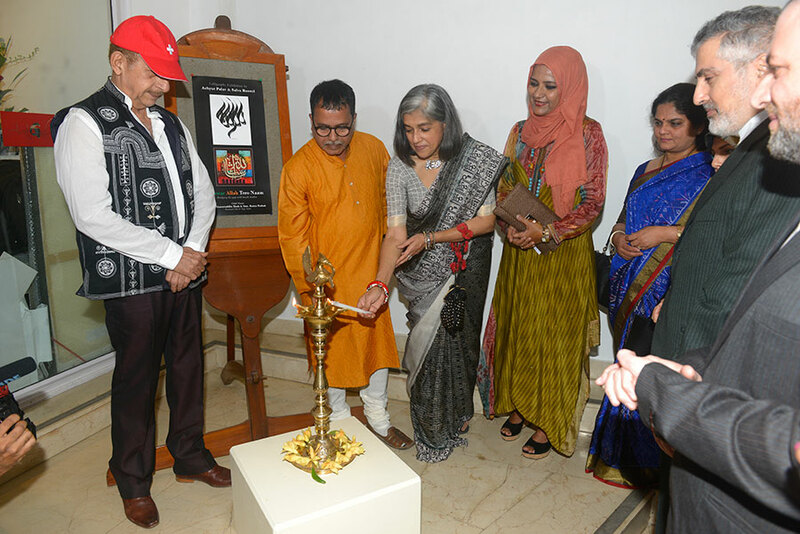 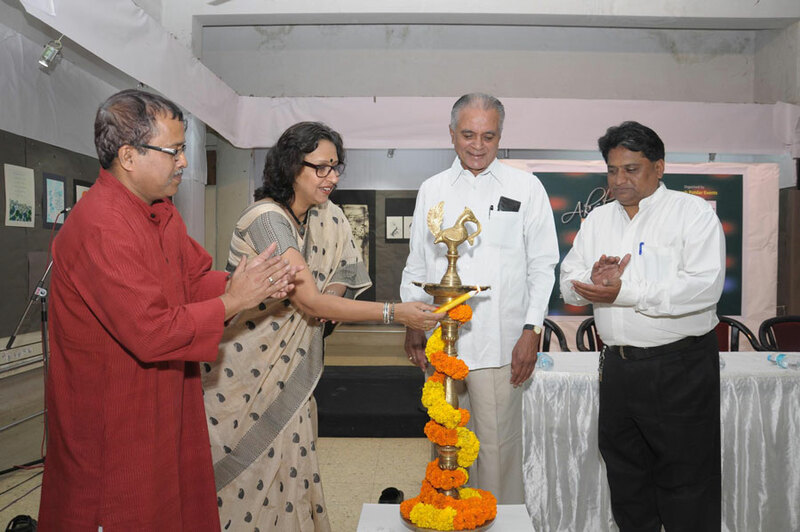 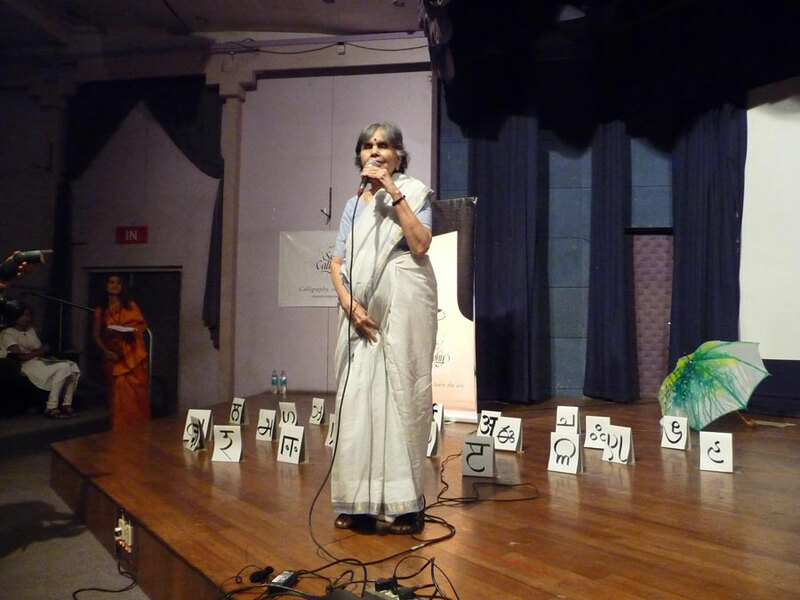 The year -long event (2007 to 2008) has many different activities planned like the week- long exhibition in JJ School of Arts (Mumbai), launch of books on calligraphy; 'Calligraphy Roadways' a program for taking calligraphy to students across India. 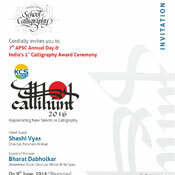 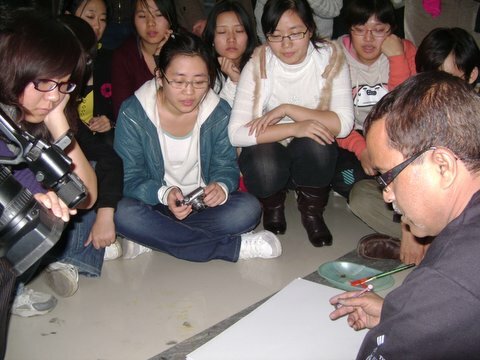 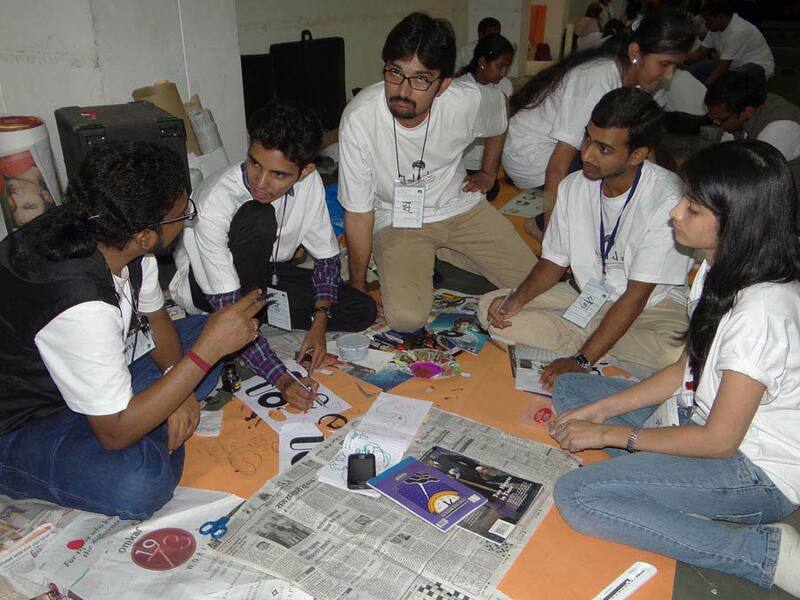 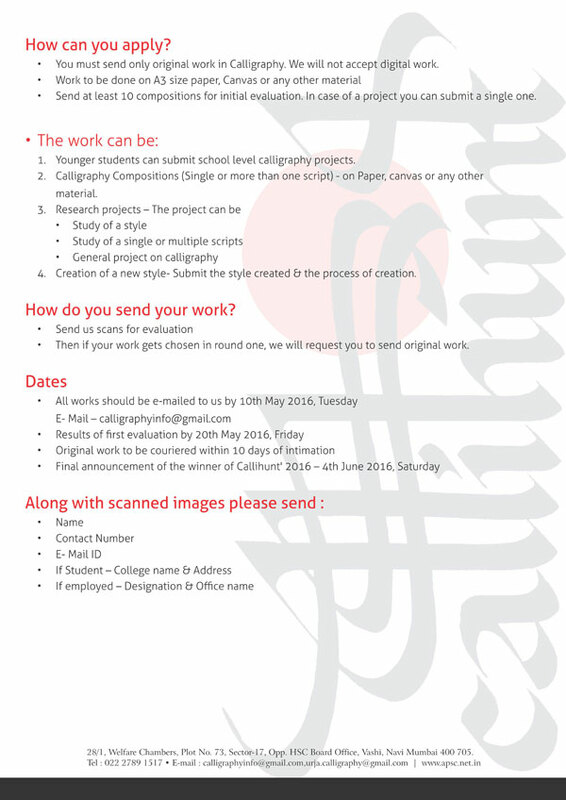 I wish to take my knowledge & experiences gathered in my quest for calligraphy to youth in India & overseas. 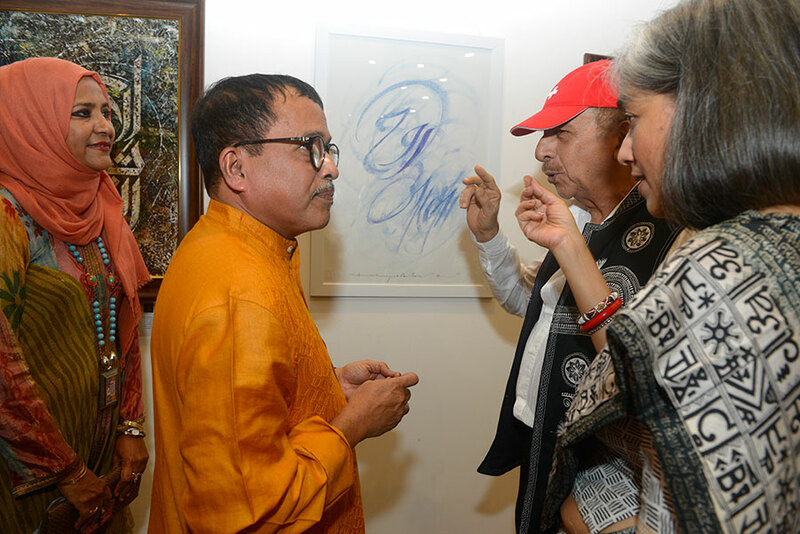 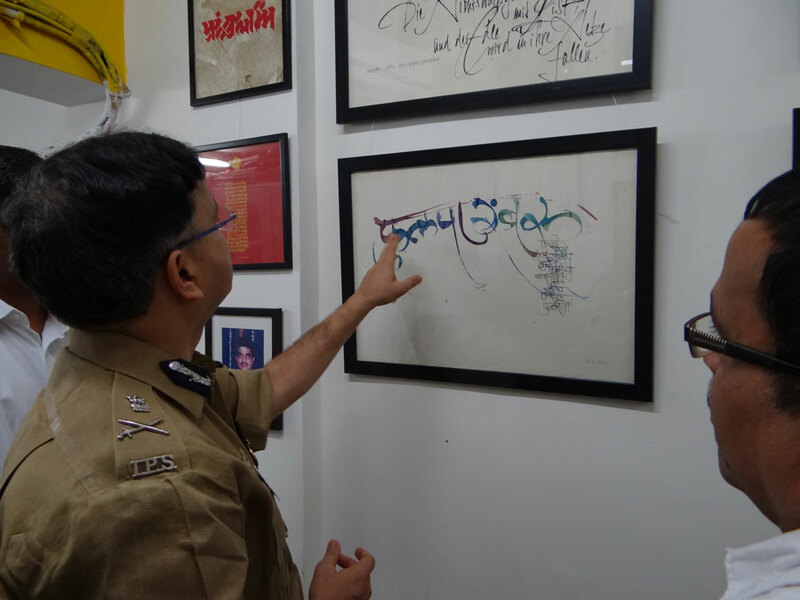 It is my pleasure to propagate the aesthetic and commercial value of calligraphy in Indian languages among the people who have the great potential of becoming the Next-Gen artists of the modern world. 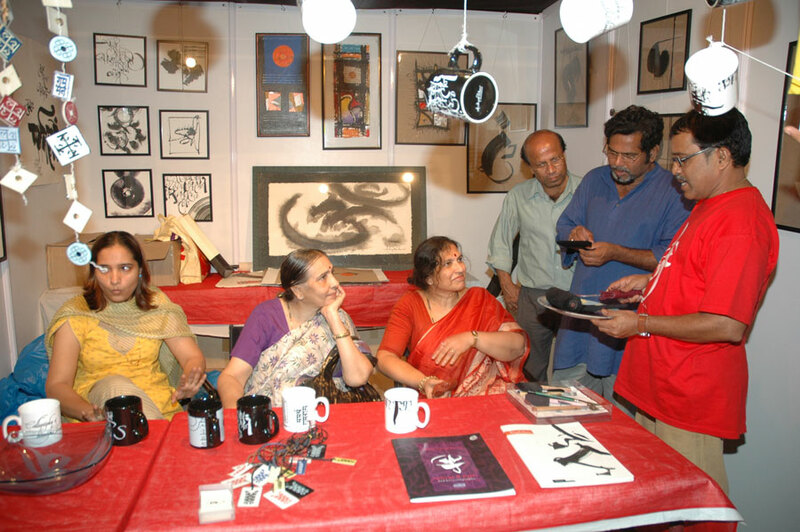 We had a wonderful response from art lovers on our stall no.8 in The Times of India Kala Ghoda Art Festival which was held between 3rd Feb. 2007 to 11th Feb. 2007 at fort. 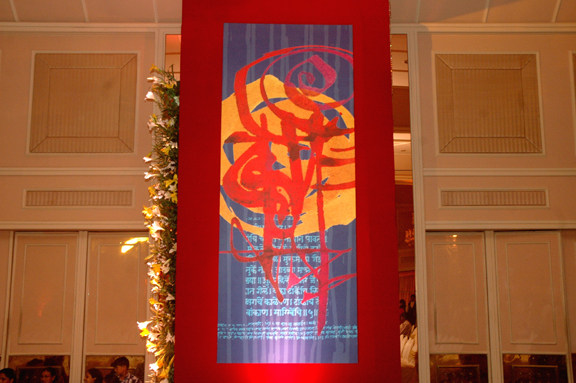 Panels, drapes and hangings having a fusion of colours and letters are created specially for the wedding. 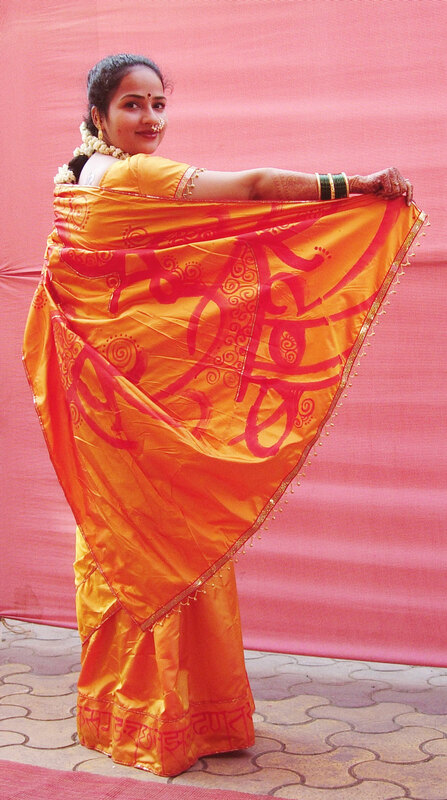 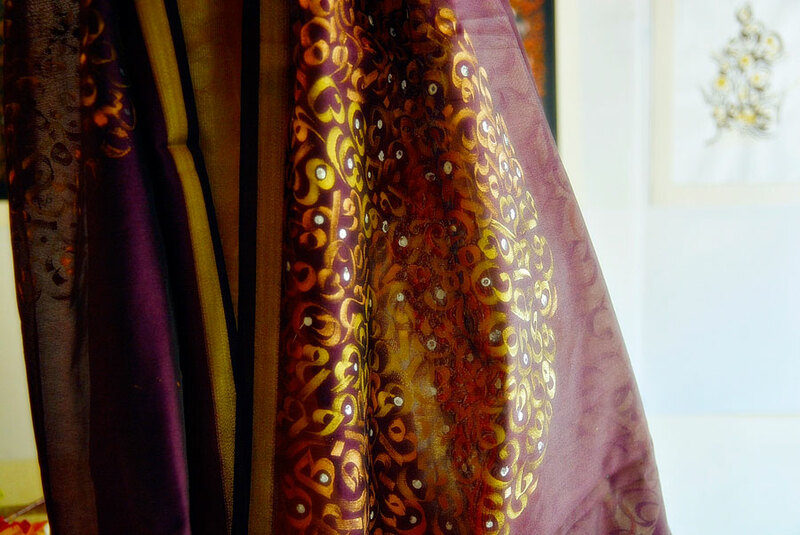 Right from designing the wedding saree of the bride to the antarpath which had the mangalashtika painted in beautiful calligraphic strokes brought the real essence of a marathi wedding. 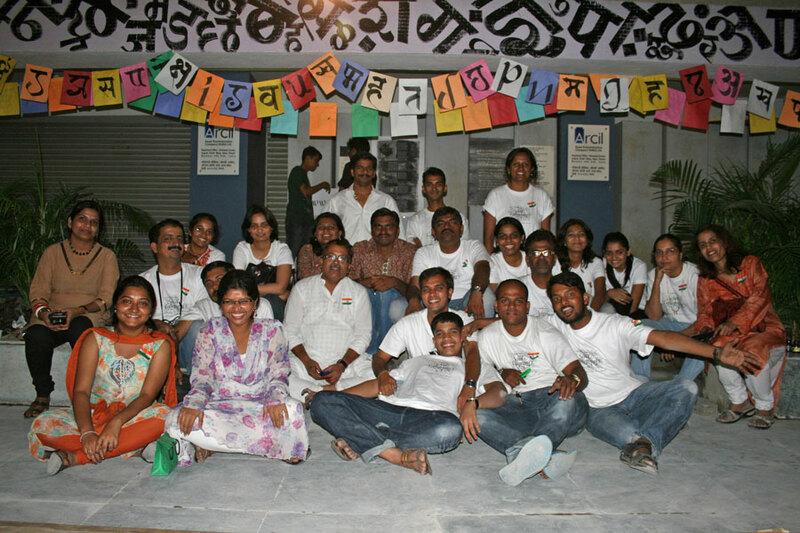 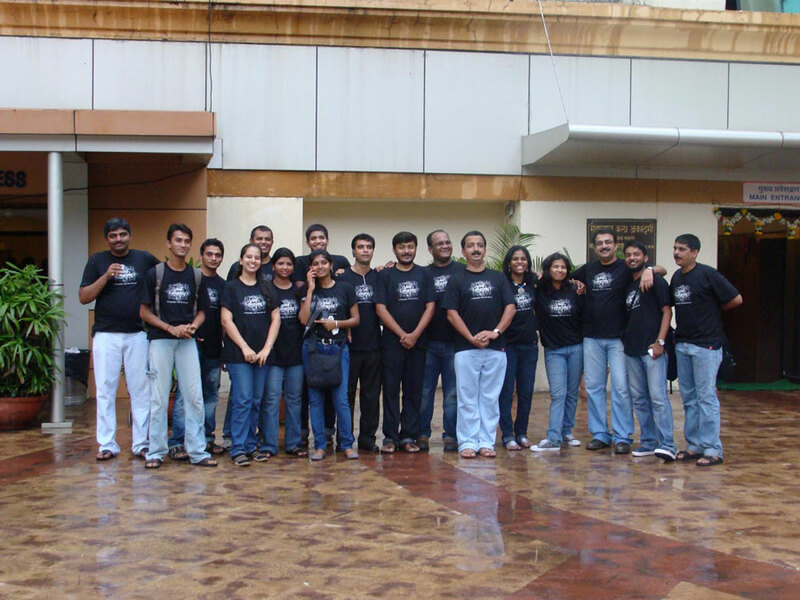 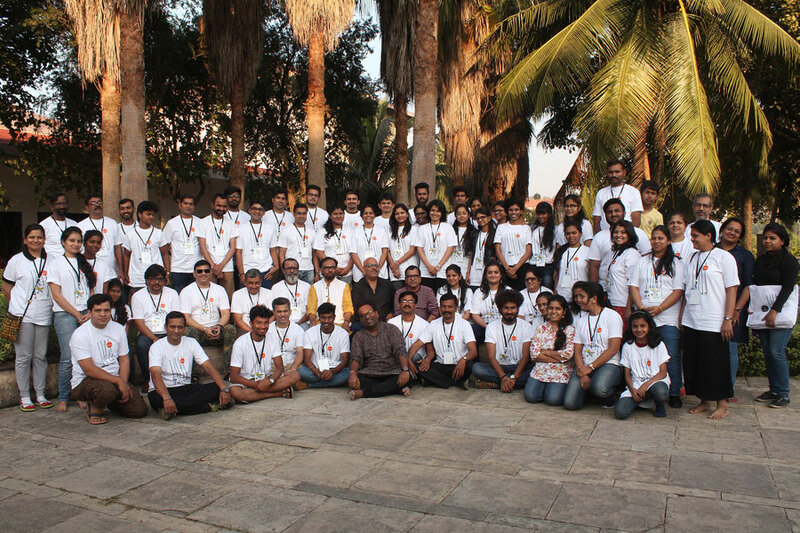 Nashik Workshop held on 8th, 9th and 10th December 2006 was a huge sucess. 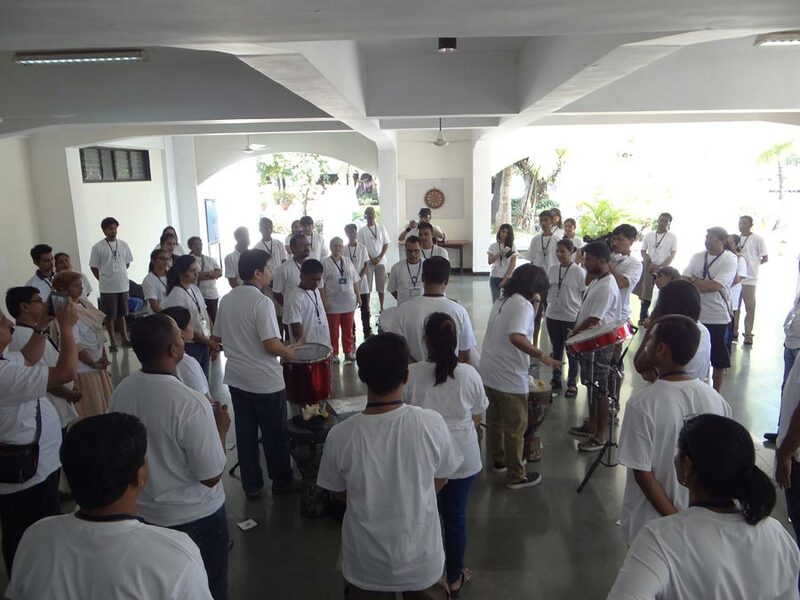 Music as its base in inspiring your mind to take you to a level where you express yourself by strokes of calligraphy the moment a chord is heard got all the students in a colorful mood. 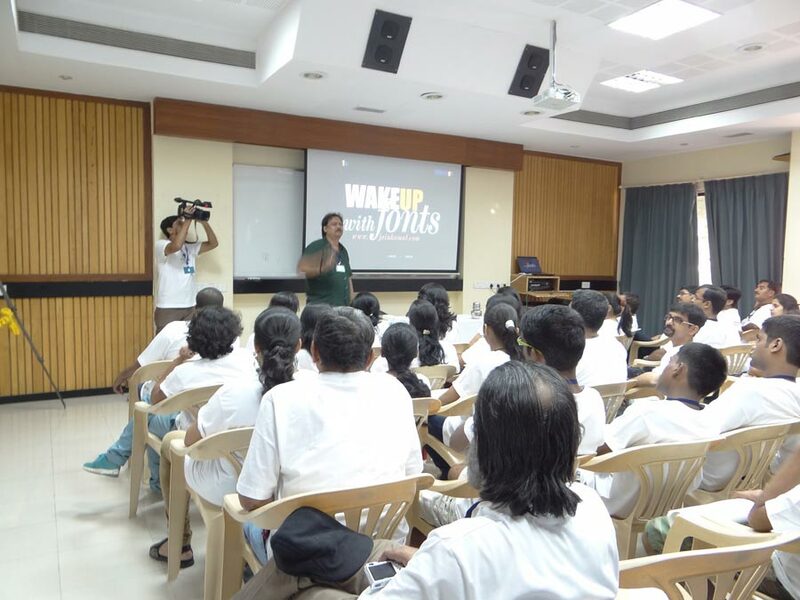 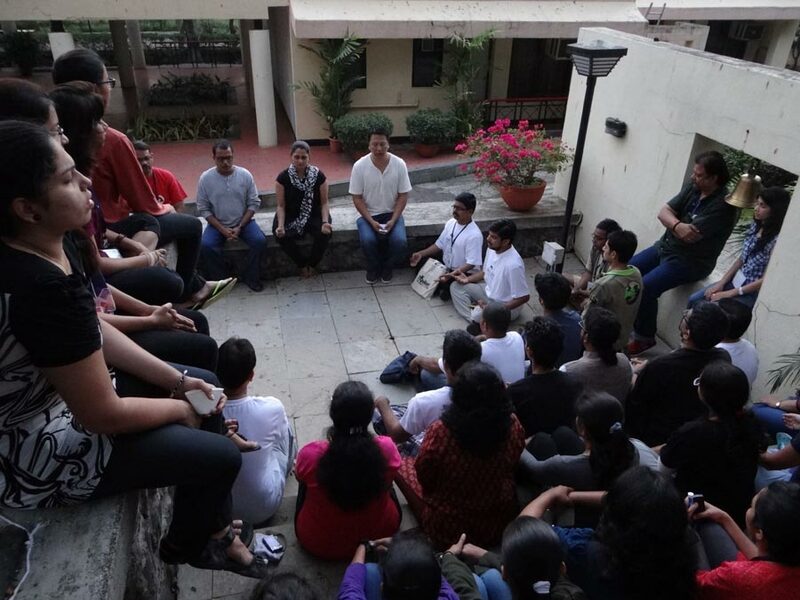 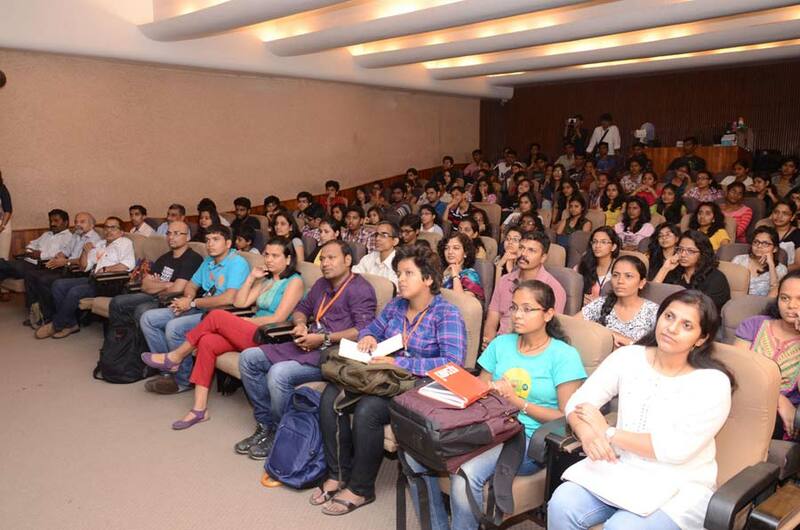 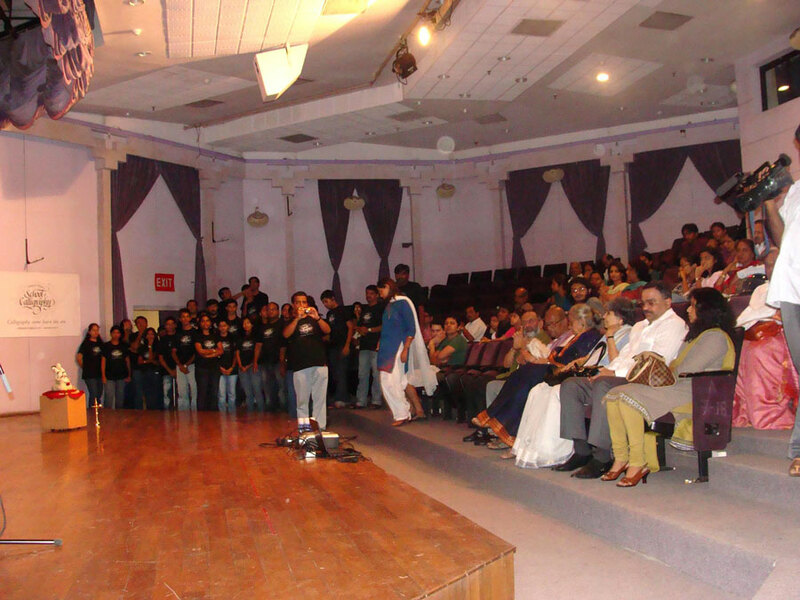 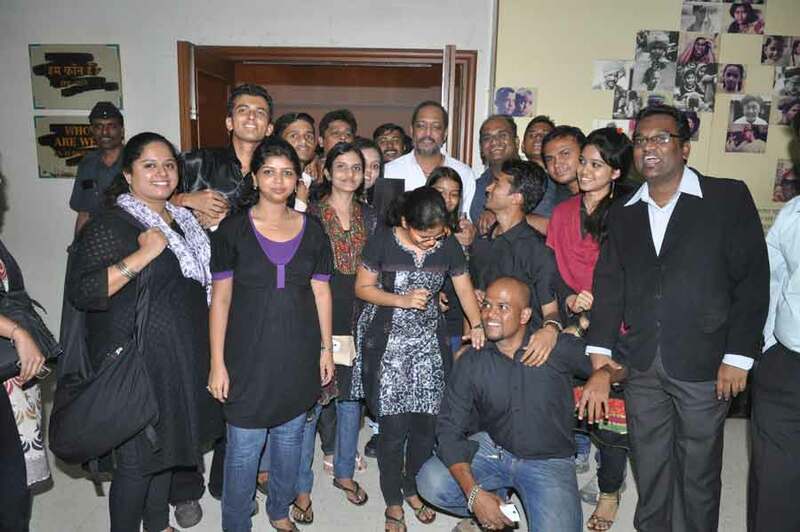 An interaction session was held where students could interact with the master himself and get queries answered. 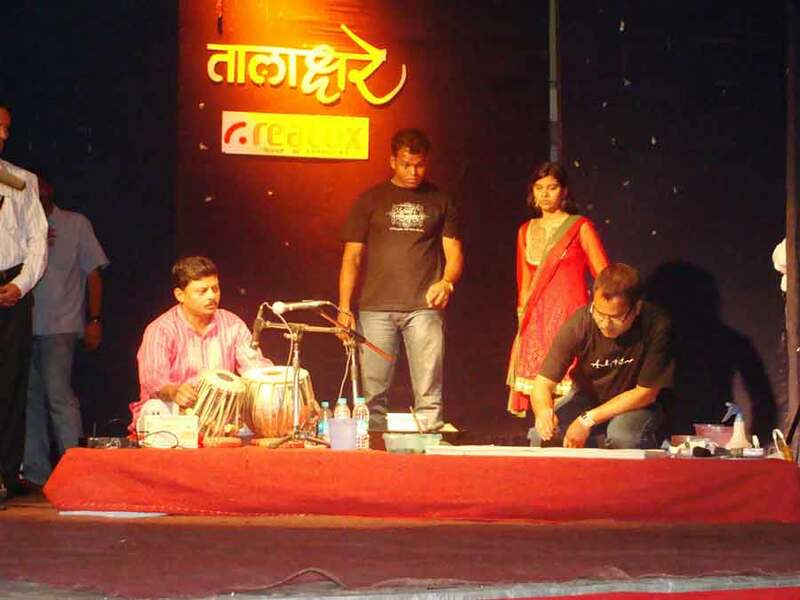 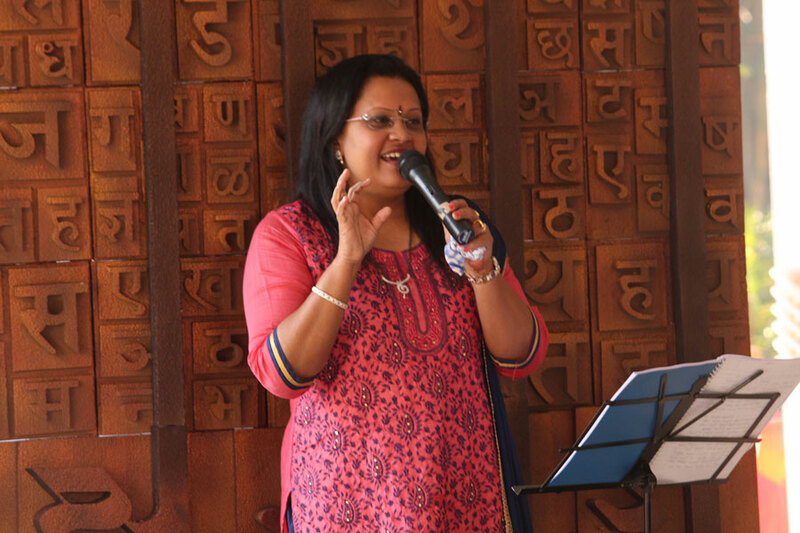 Eminent Marathi TV/Stage personalities were also roped in to deliver an extra dramatic touch to expressing feelings through music. 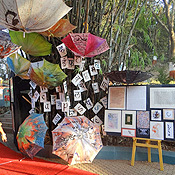 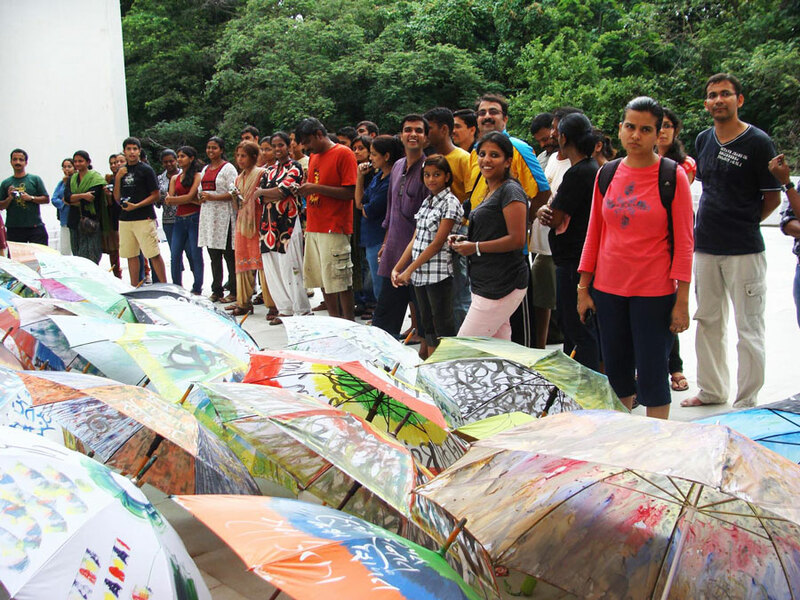 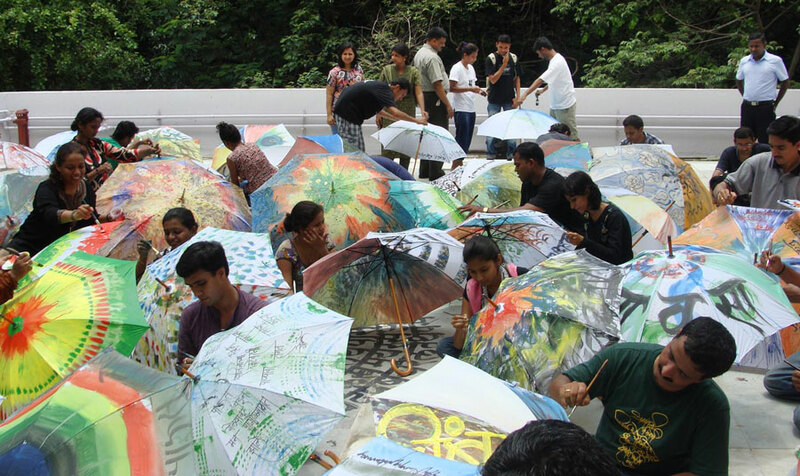 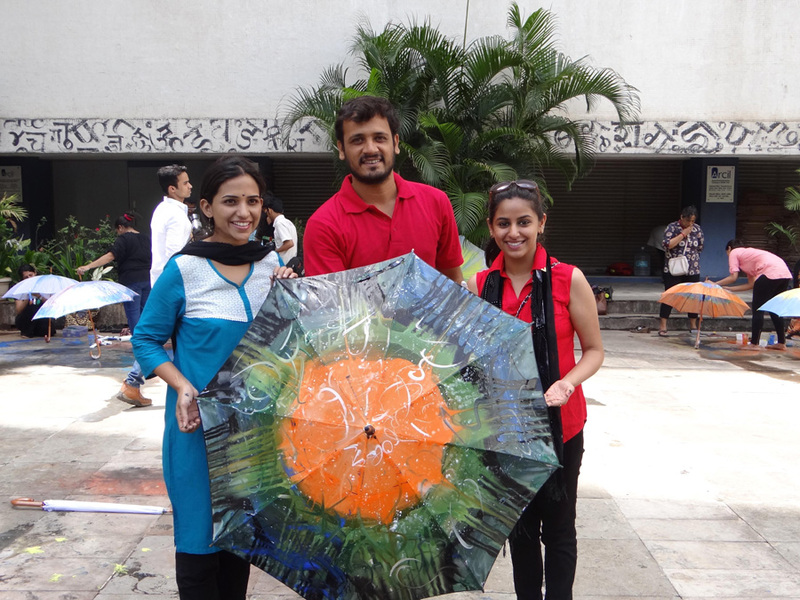 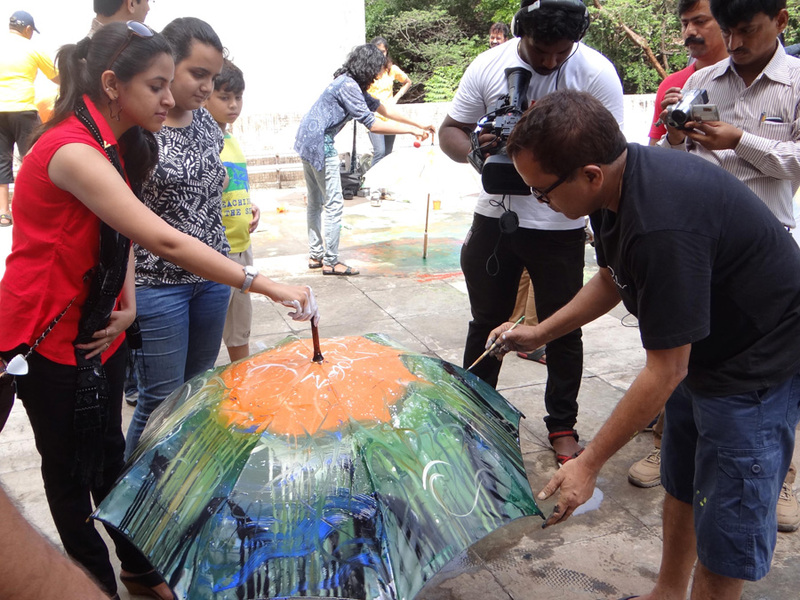 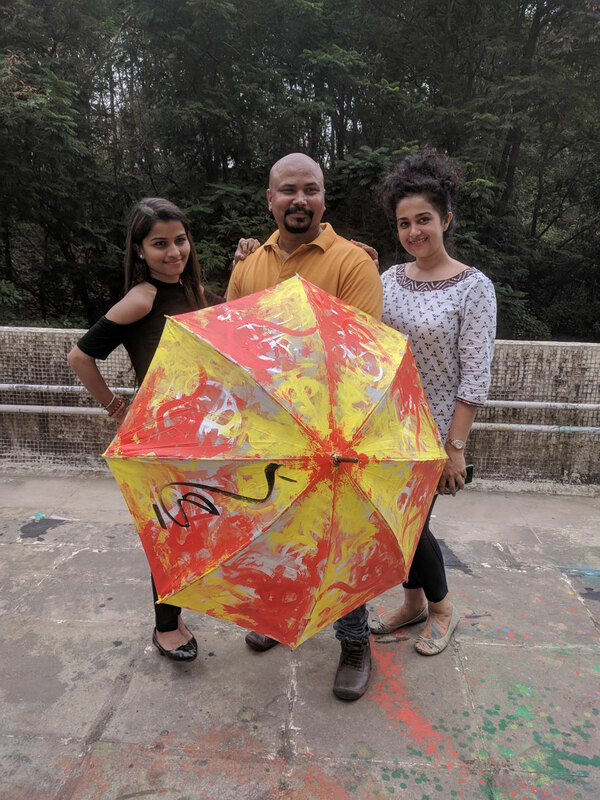 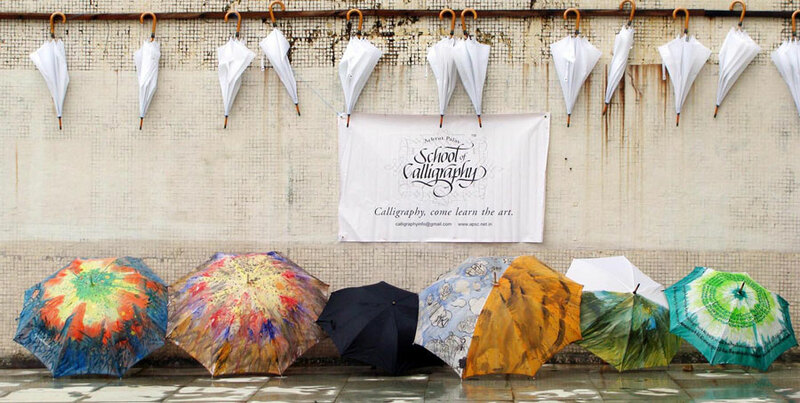 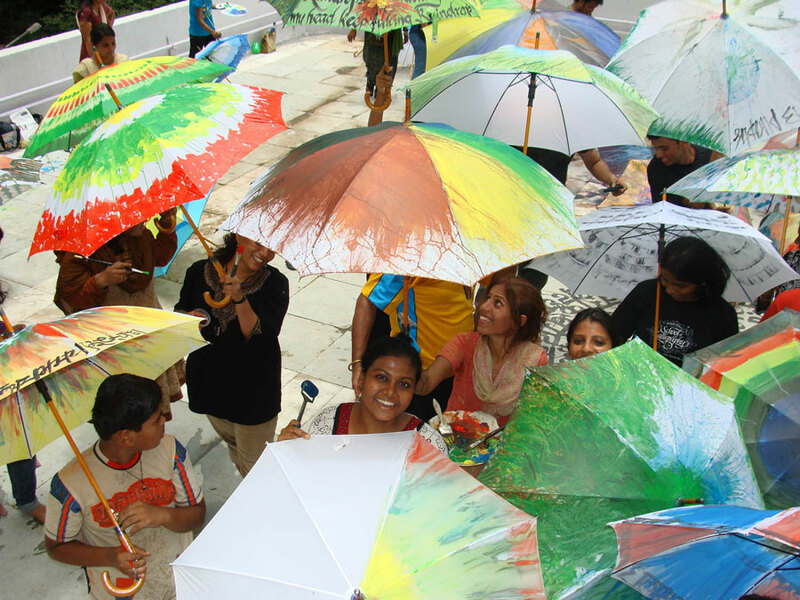 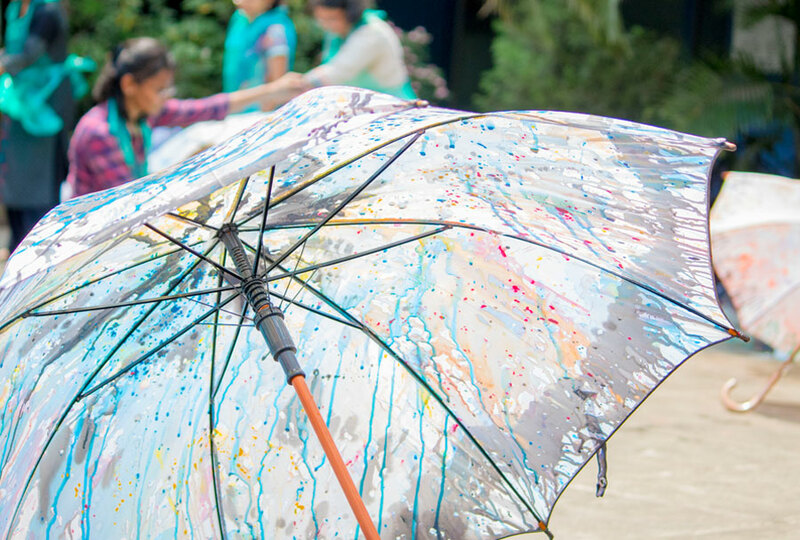 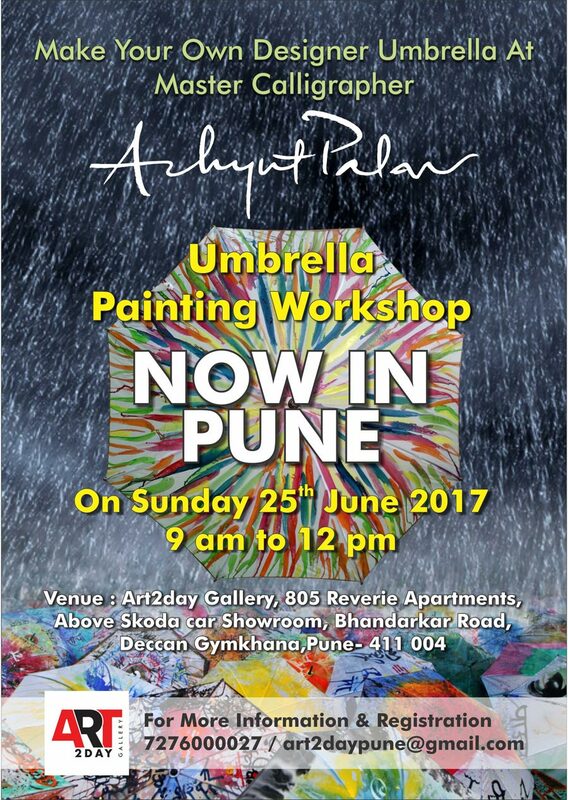 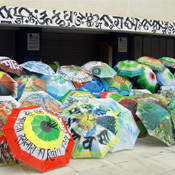 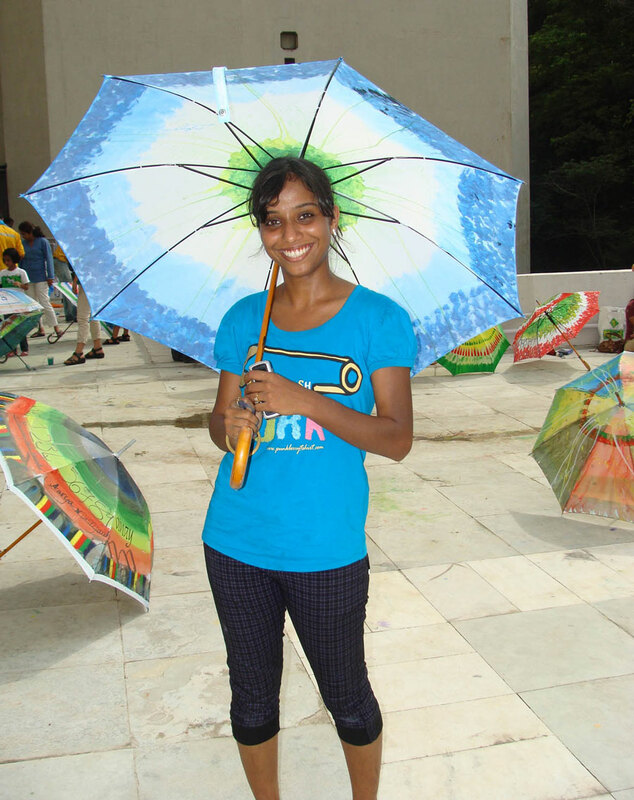 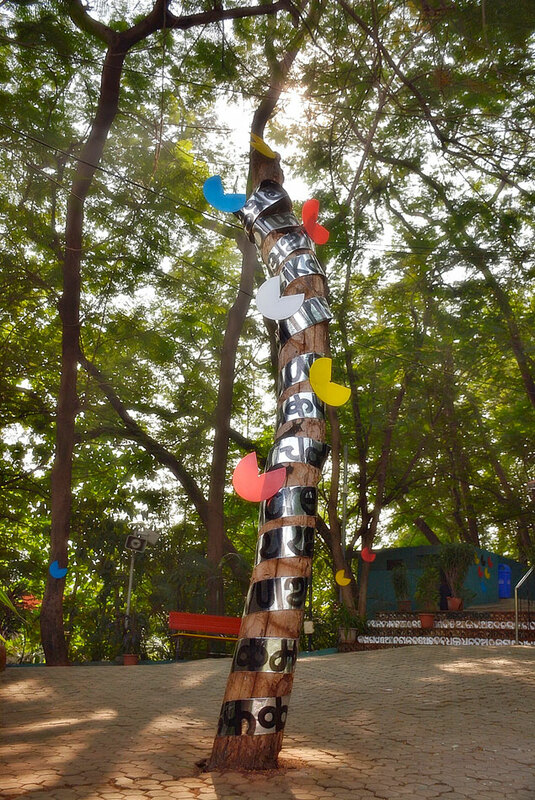 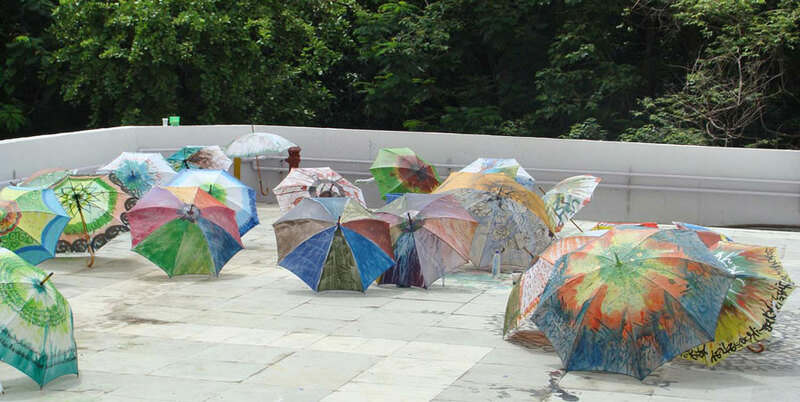 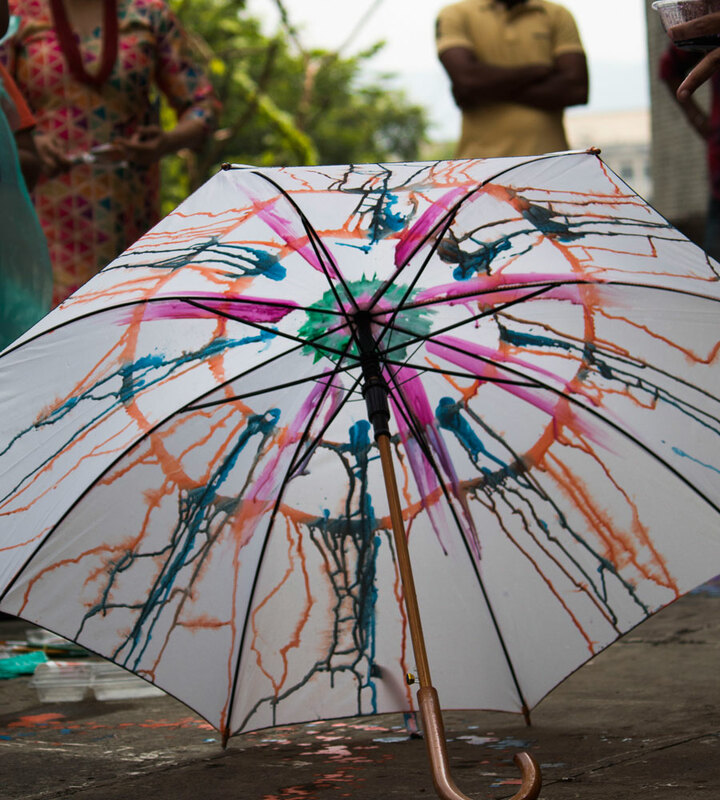 "Shravanachya Sari, Tumchya Dari"- "The Spell Of Rain At Your Doorstep" This is a mobile exhibition of hand painted umbrellas depicting the spirit and the colours of rains. 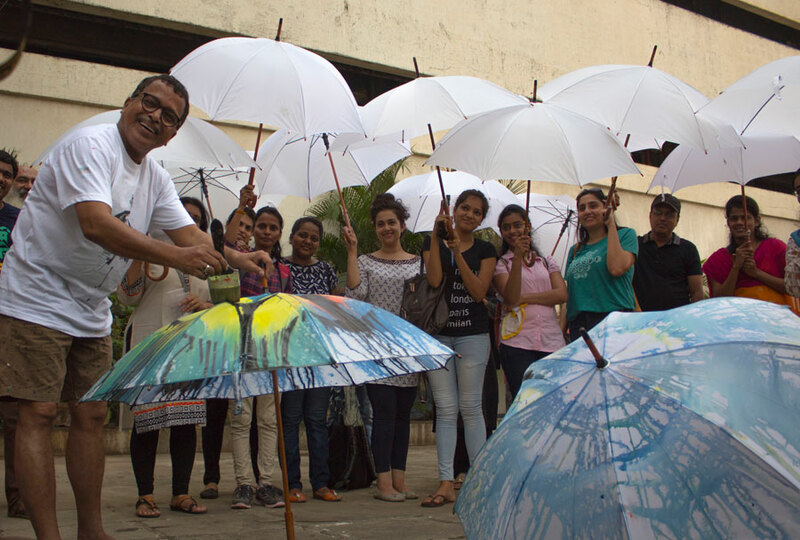 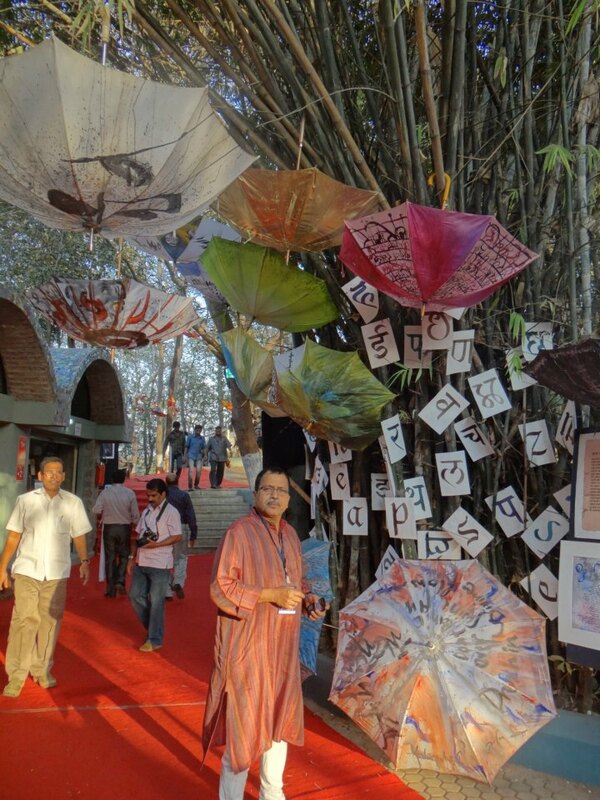 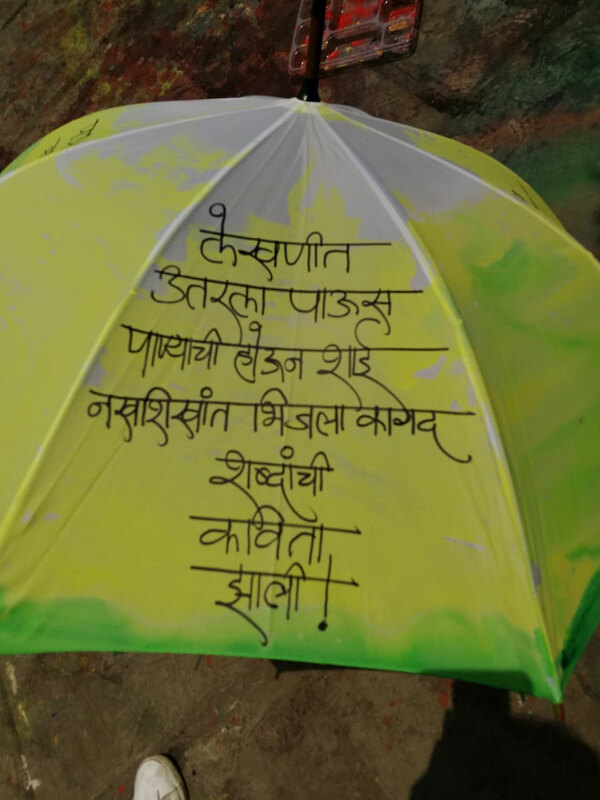 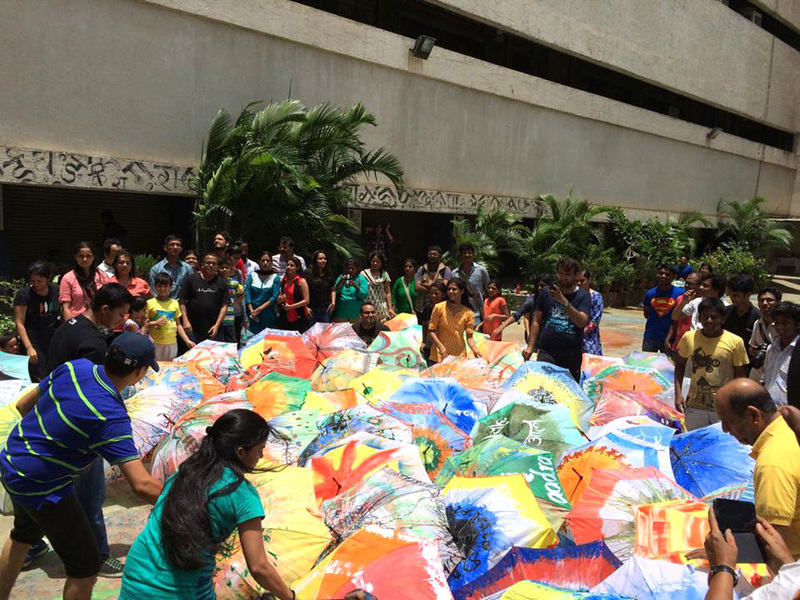 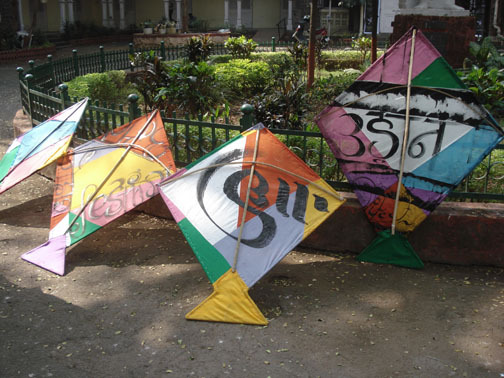 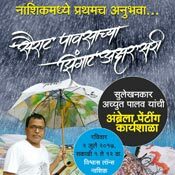 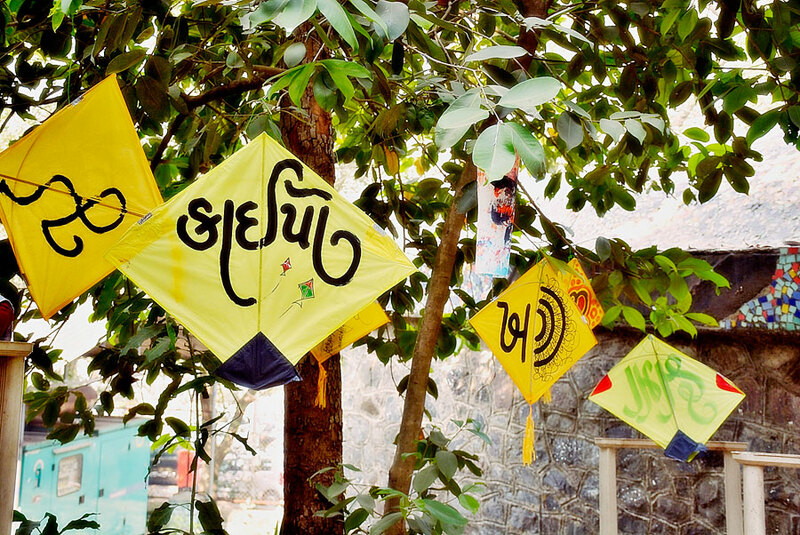 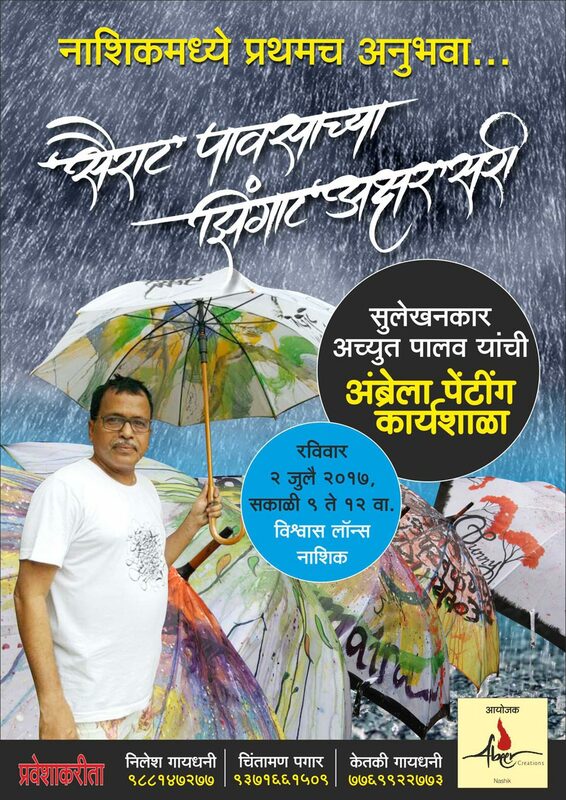 The umbrellas have lovely poems of celebrated Marathi poets like B.B Borkar, N.D. Mahanor, Raja Rajwade, Mangesh Padgaonkar, Nalesh Patil, Saumitra, some rain songs in Hindi and also short poems in English for children. 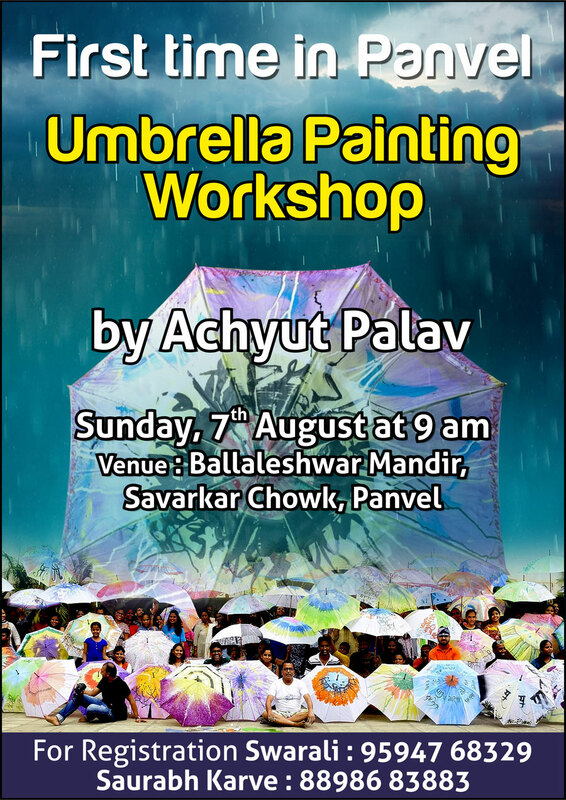 Palav plans to take these to various cities around the state of Maharashtra like Mumbai, Thane, Nashik, Pune, Kolhapur etc. 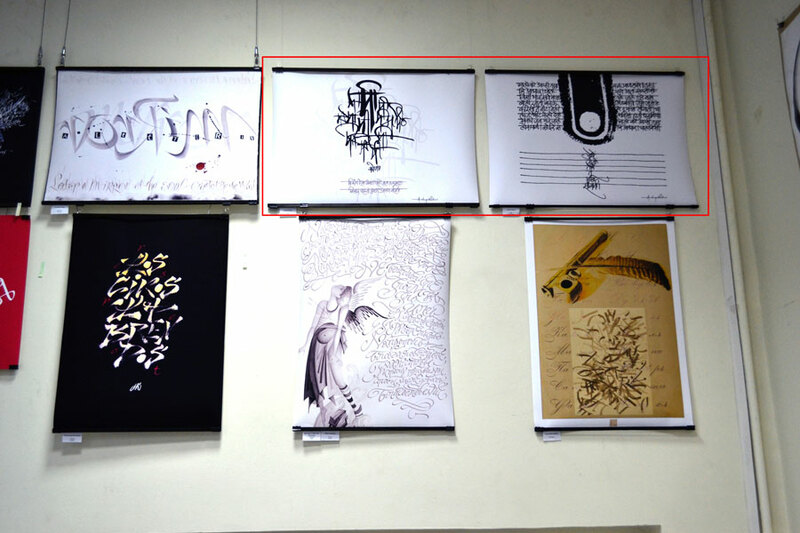 The exhibition is for a day at each of the mentioned places.. 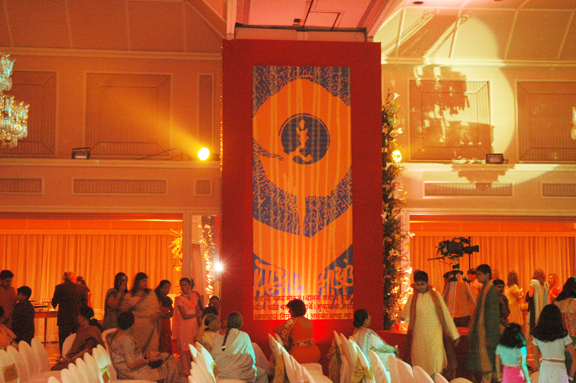 Panels, drapes and hangings having a fusion of colours and letters are created specially for the Sangeet Sandhya. 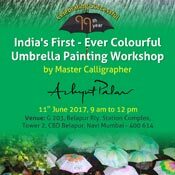 Colours like gold, ochre, burgundy, and blue with letters beautifully blended to make appealing and eye-catchy compositions. 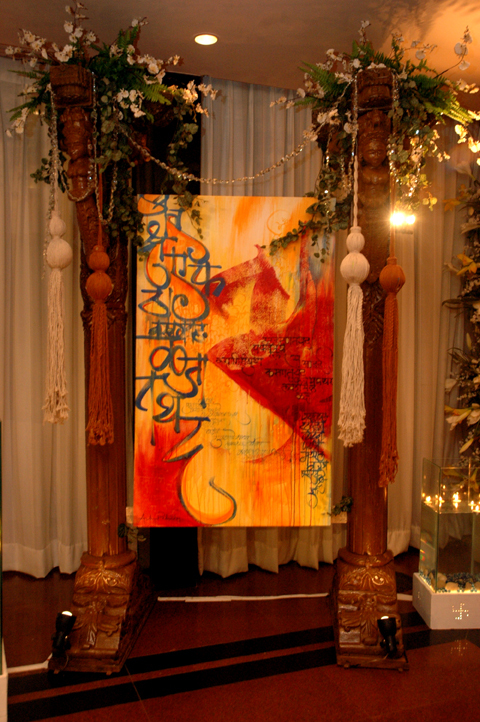 The charm and magic of music, the sounds of instruments and the sentiments of the baratis has been captured in the spontaneous and powerful strokes. 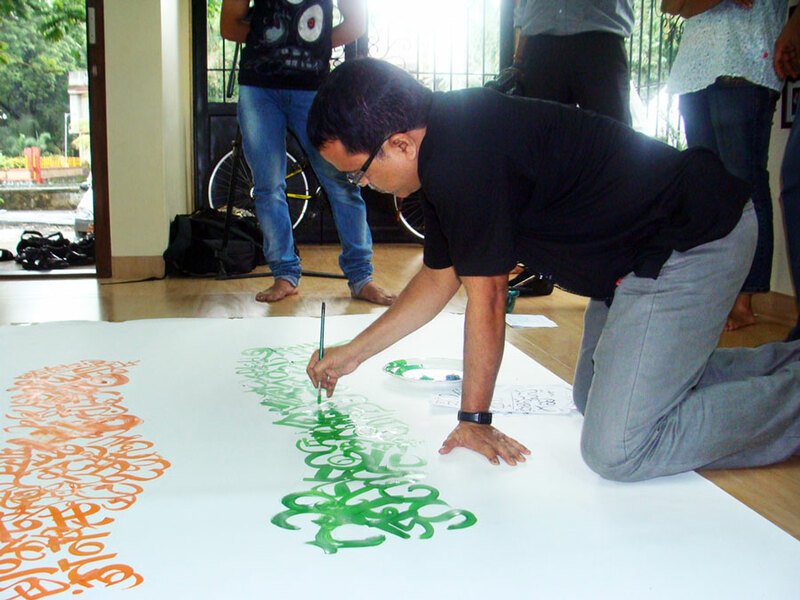 The art of calligraphy has been, nowadays transformed into an eloquent art form due to many innovative & bold ventures by people in this field. 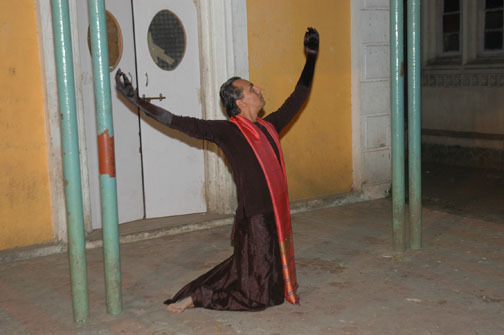 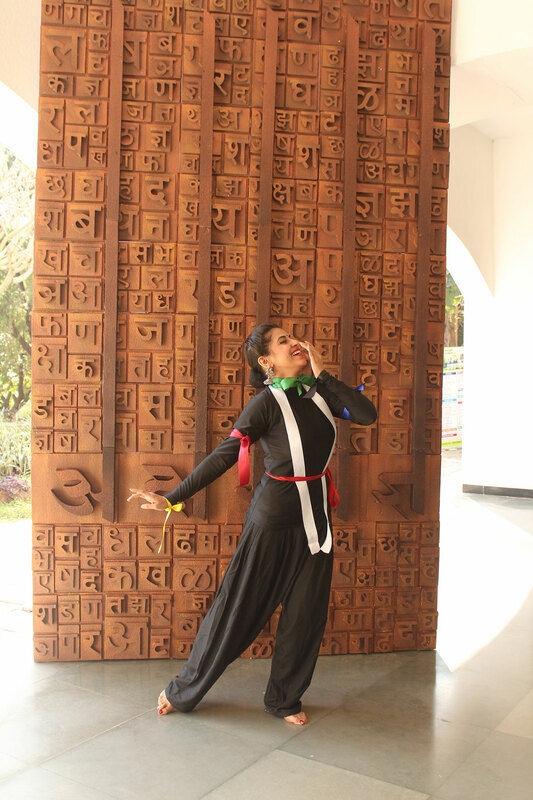 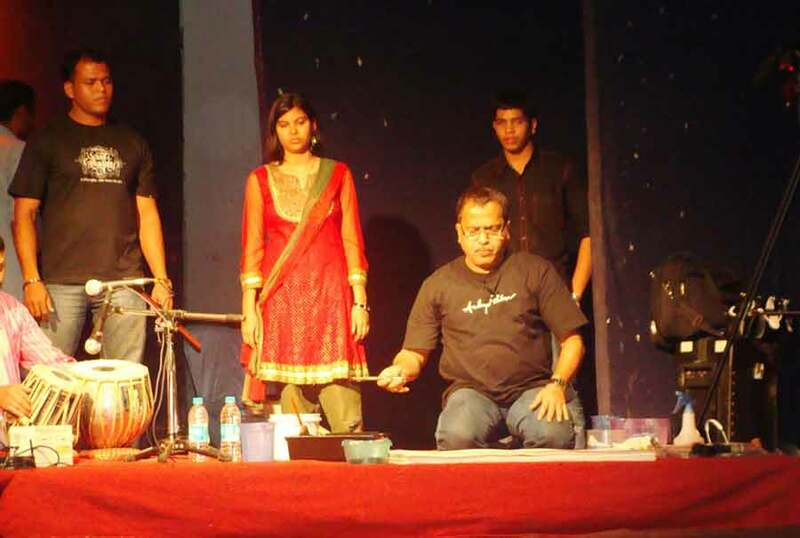 One such was a fusion of performing arts like music, dance, acting, etc. 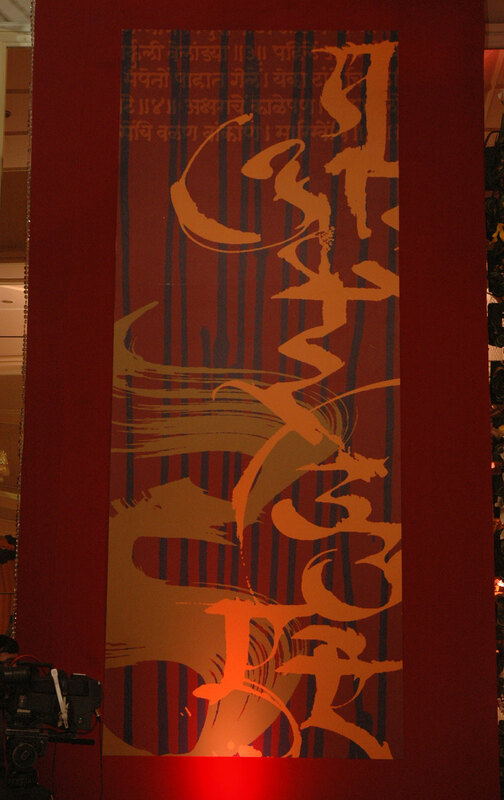 with calligraphy. 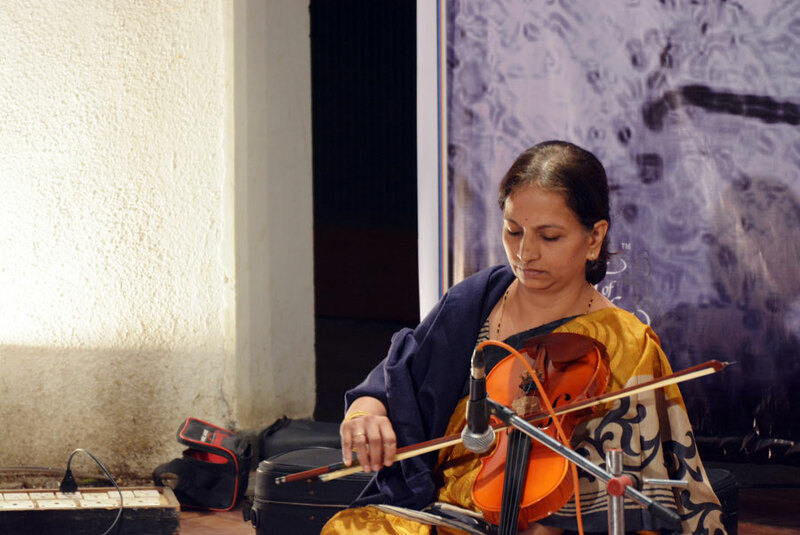 It was a pleasure, more so a great honour for me to have an opportunity of being a part of a concert with the great Bhavani Shankar Pakhwaj maestro, Rupak Kulkarni- flutist & Aditya Kalyanpur the tabla expert.